M – Art for Art's Sake! 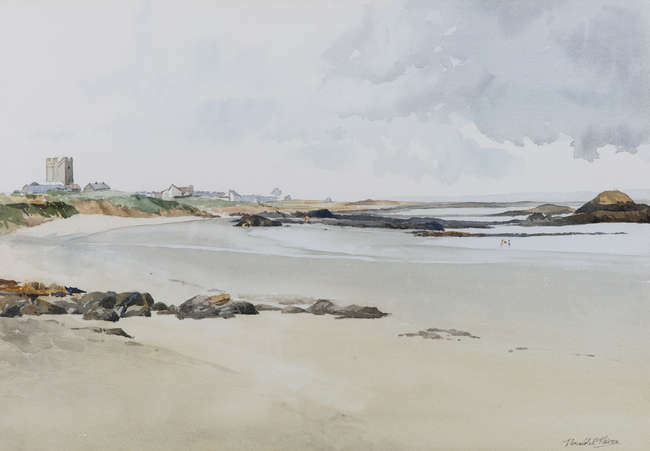 Left to right: “West of Ireland Shawlie” watercolour ( 7.5″ x 10″), sold at Fonsie Mealy’s 8/3/2017 for €80.00; and “Sand Dunes” watercolour (10″ x 14″), sold at Fonsie Mealy’s 8/3/2017 for €100.00. 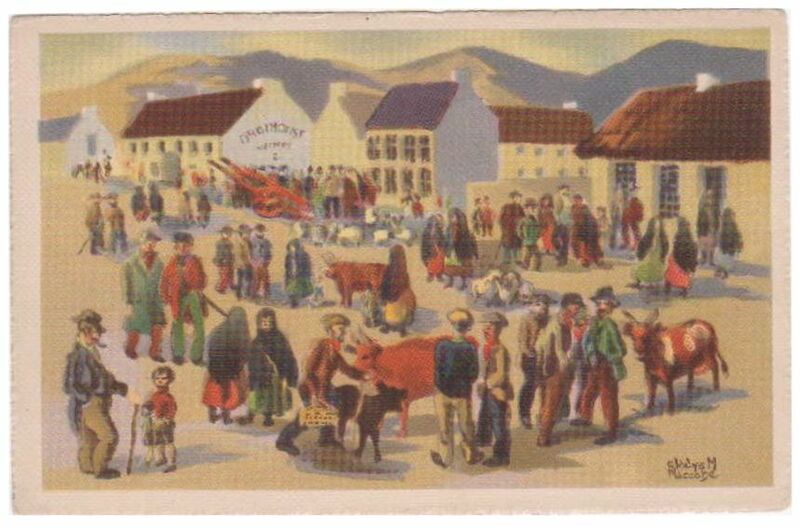 Supplied the Scholastic Production Co., Ltd., Belfast, with artwork for postcards. 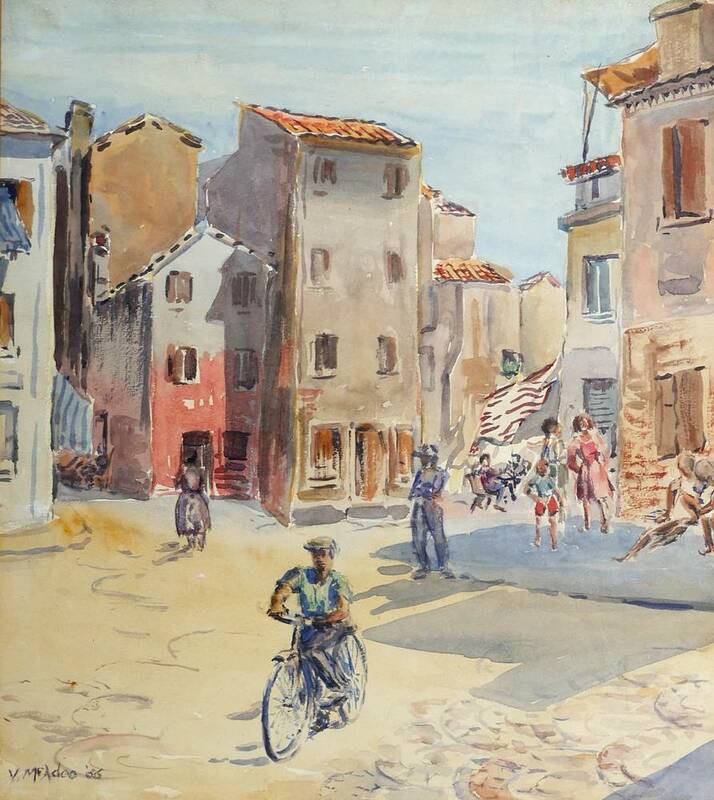 Absolutely nothing known about the artist except that he/she was active c.1940/50. Can you help? 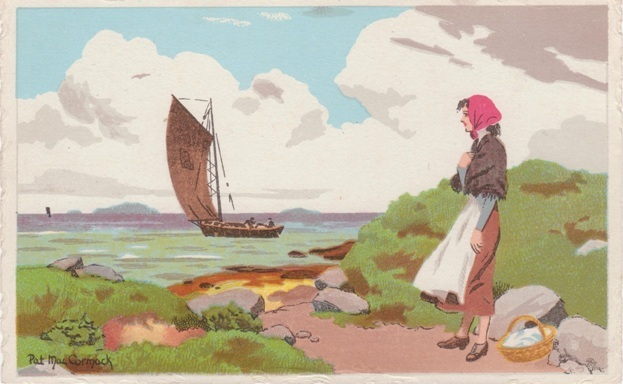 Two untitled, unnumbered postcards by Scholastic that I recently purchased – the only example of these particular cards seen in three years searching! 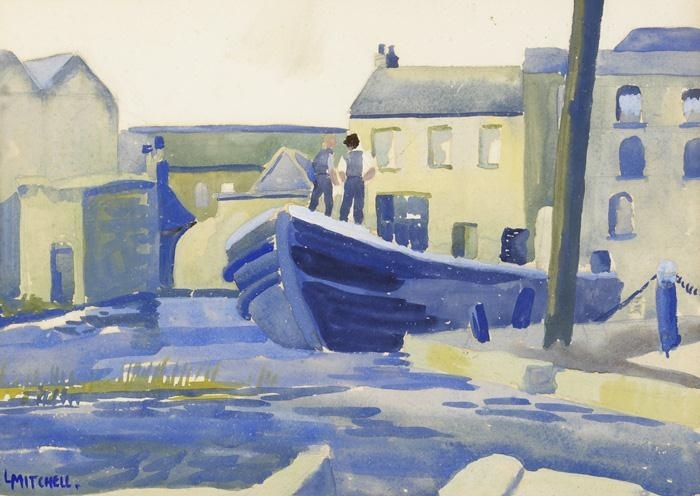 Gladys MacCabe was born in 1918, in Randalstown, Co. Antrim, to an artistic couple – her mother Elizabeth was a designer in the linen business, and her father George Chalmers, a former army officer, was an artist specialising in calligraphy and illumination. 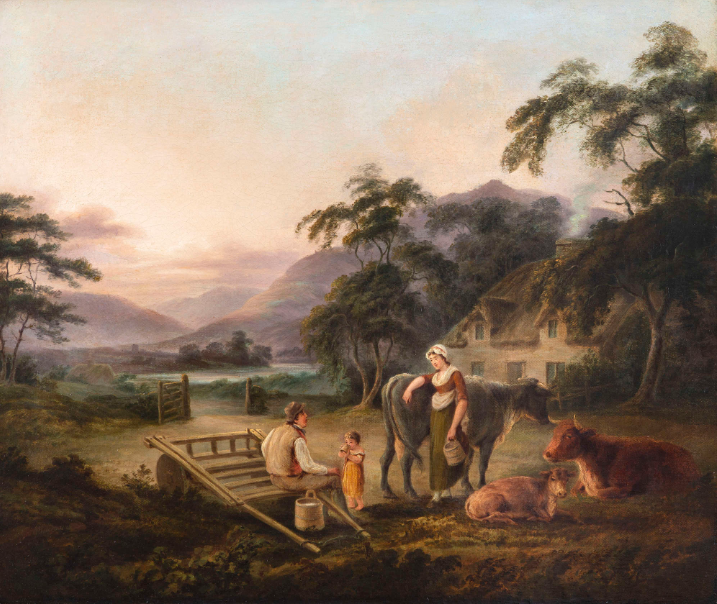 One of her ancestors was a famous 18th century Scottish painter, Sir George Chalmers. 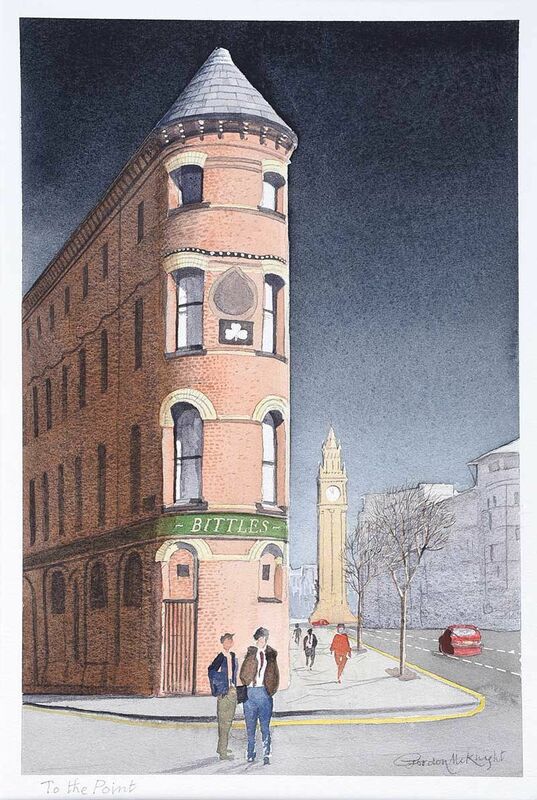 She had a picture published in the Royal Drawing Society’s magazine when she was 16 years old and went on to study at the Belfast College of Art……. “Sunday in the Park” oil on board sold 30/5/16 at Whyte’s – €2,500. 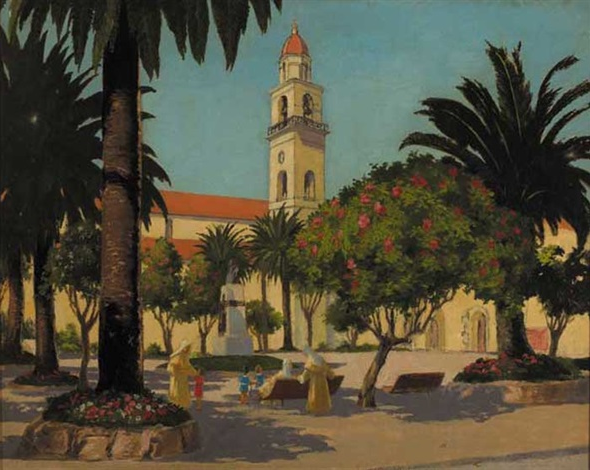 Left to right: “View of the Sacré-Coeur Basilica, Paris” oil on canvas (20″ x 24″); and “Fair Day in Ireland” a Scholastic Productions (Belfast) postcard 1940/50s. 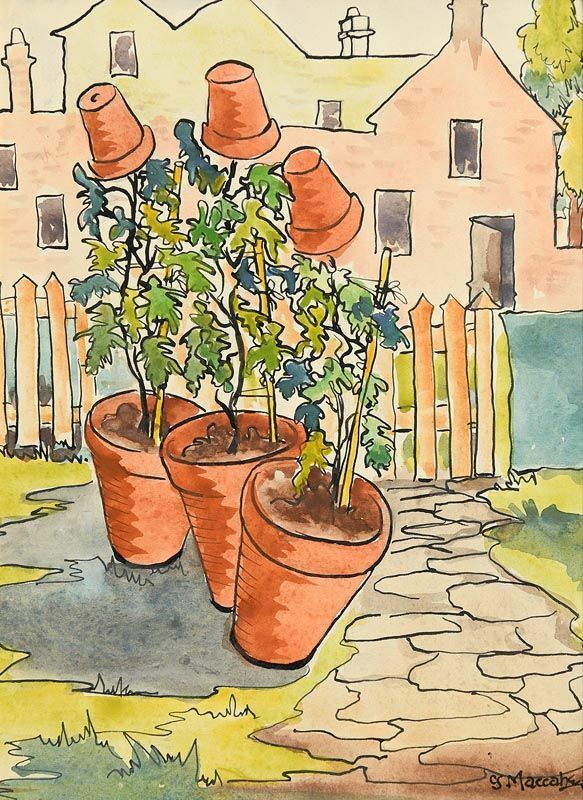 Left to right: “Flower Pots” watercolour (9″ x 7″); and “The Young Napoleon” pastel on paper (21″ x 20″), sold at Morgan O’Driscoll’s – 23/10/2017 for €320.00 and €650.00 respectively. 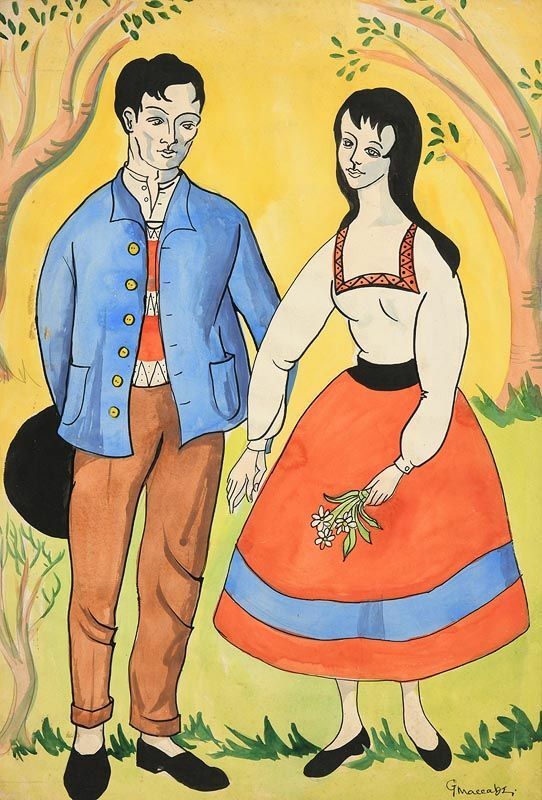 “Tyrolean Couple” gouache (21″ x 14″), sold at Morgan O’Driscoll’s – 6/11/2017 for €240.00. Left to right: “The Quayside” and “The Orphanage”. Born in Belfast and attended the School of Art while working in the textile industry. Appears to have been involved with the IRA and served time in Crumlin Road Prison during the early 1920s. 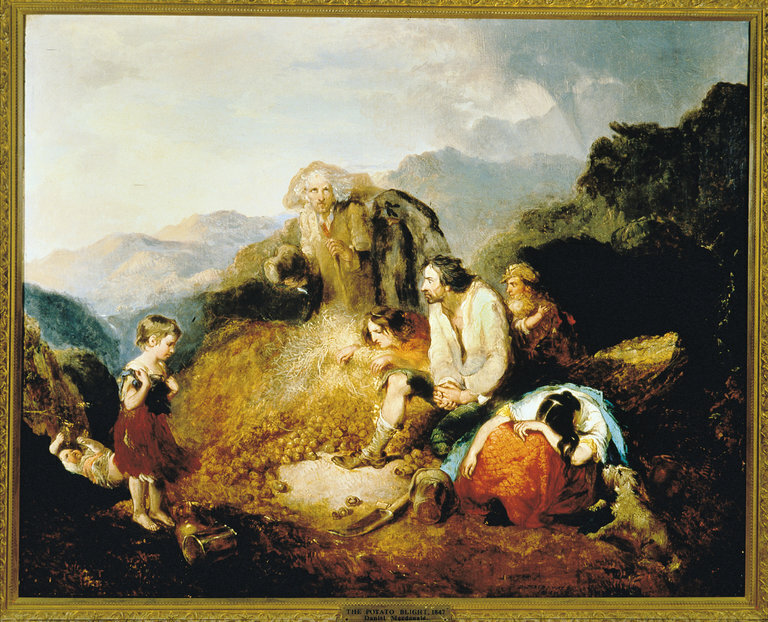 “Irish Peasant Children” – 1846 – oil on canvas (24″ x 20″). 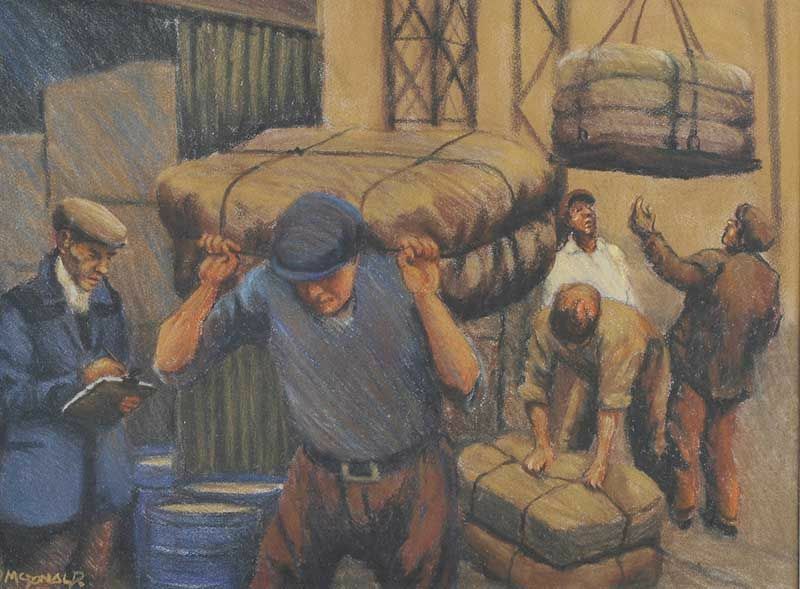 In the collection of the Irish Great Hunger Museum, Hamden, Connecticut, USA. 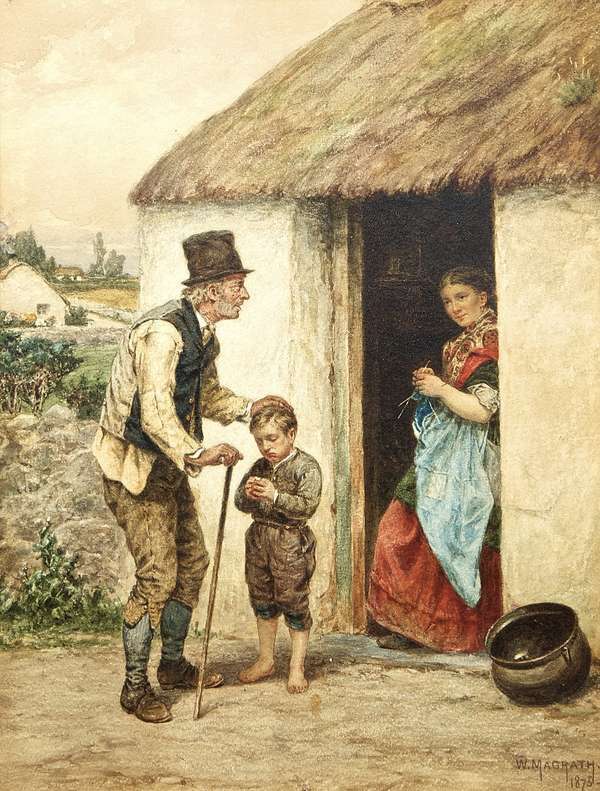 “An Irish Peasant Family Discovering the Blight of Their Store” (1847). National Folklore Collection, University College Dublin. 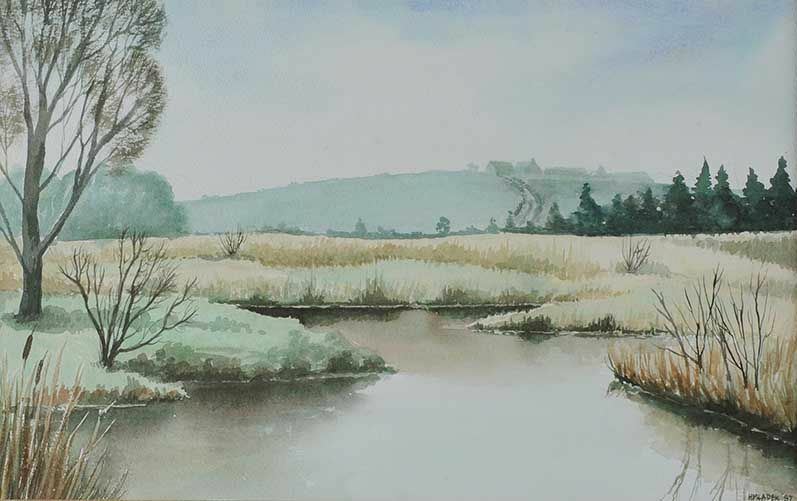 “River Scene” watercolour drawing (9″ x 13″) sold at Ross’s – 6/11/2013 for £60.00. 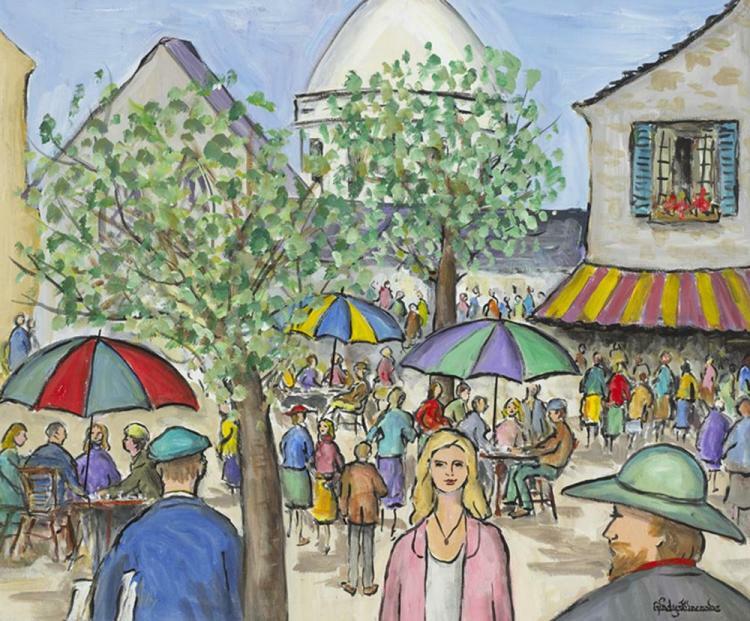 Left to right: “Stable Gossip” oil on canvas (15″ x 12″) sold at Whyte’s – 29/4/2003 for €1,000; and “Irish Village, Women Scutching Flax” oil on canvas (12″ x 15″) sold at Whyte’s – 16/9/2003 for €2,200. 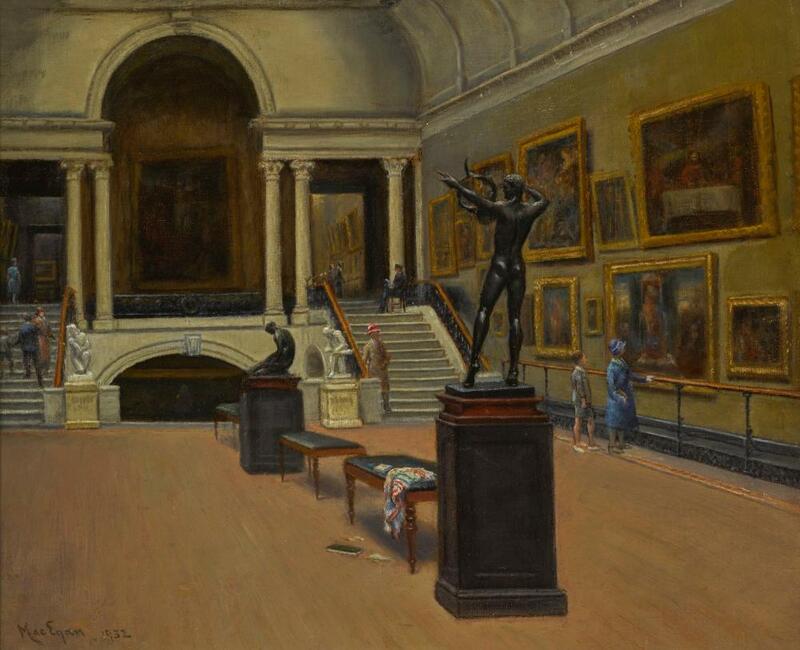 “The National Gallery, Dublin” oil on canvas (14″ x 17″), unsold at Sotheby’s (London) – 21/11/2018. 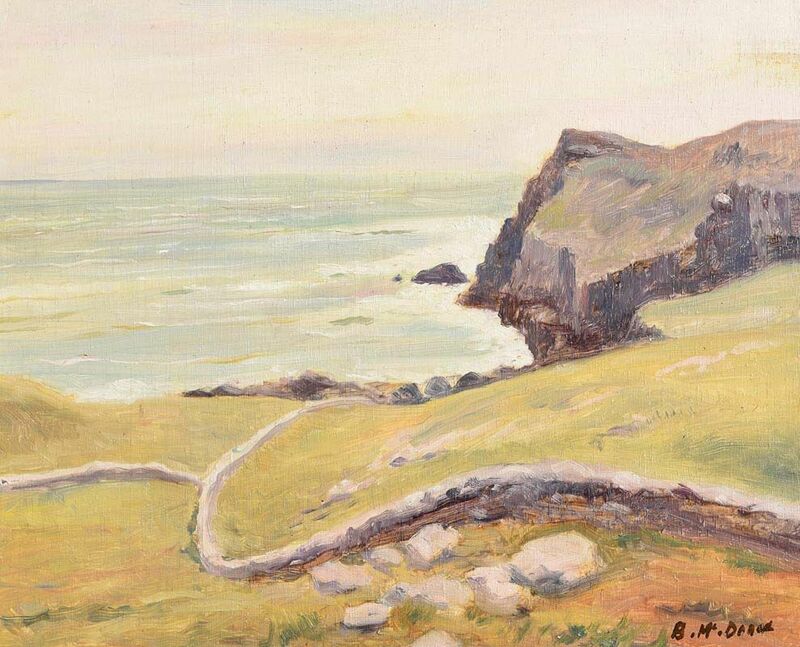 “Menaun Cliffs, Achill” oil on board (12″ x 15″), sold at Adam’s – 7/12/2016 for €3,600. 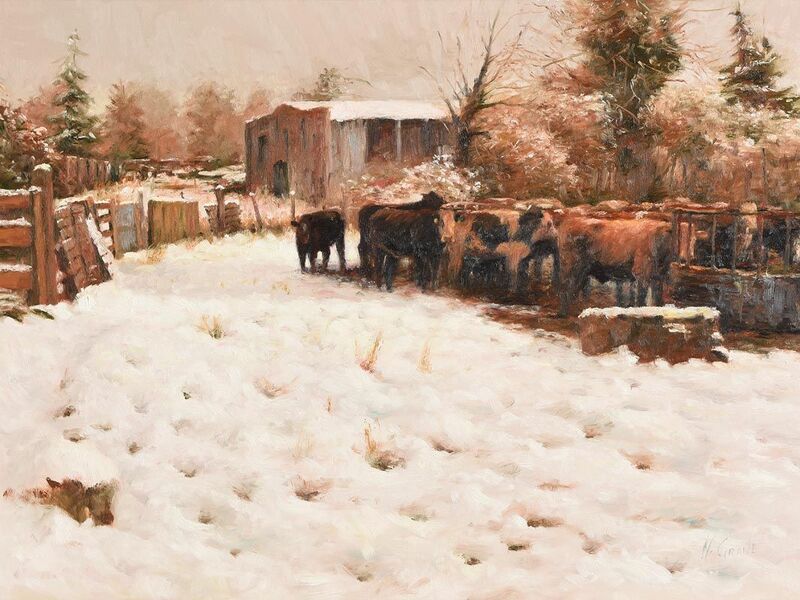 “Fetching Milk in the Farmyard” oil on board (14″ x 18″), sold at Morgan O’Driscoll’s – 5/12/2016 for €4,600. “Aran Folk” oil on canvas laid on panel (43″ x 64″), unsold at Sotheby’s (London) – 27/9/2017. 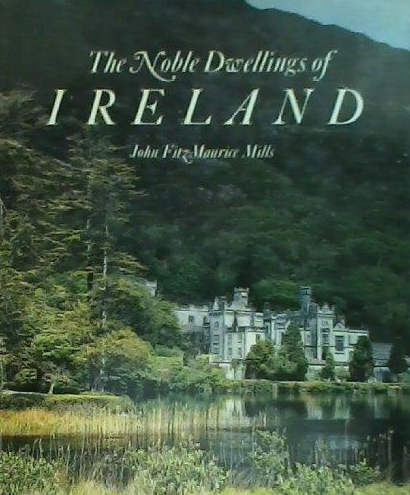 John Bedell Stanford Macilwaine was born in Dublin. Attended the High School. Listed as an architect in 1901 and 1911 census returns. 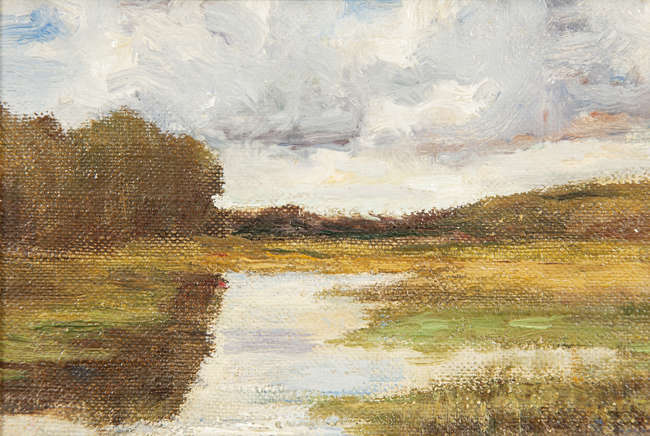 “Sketch at Leek, Co.Monaghan” oil on canvas (4″ x 6″). Sold at Adams – 1/6/2016 for €420.00. 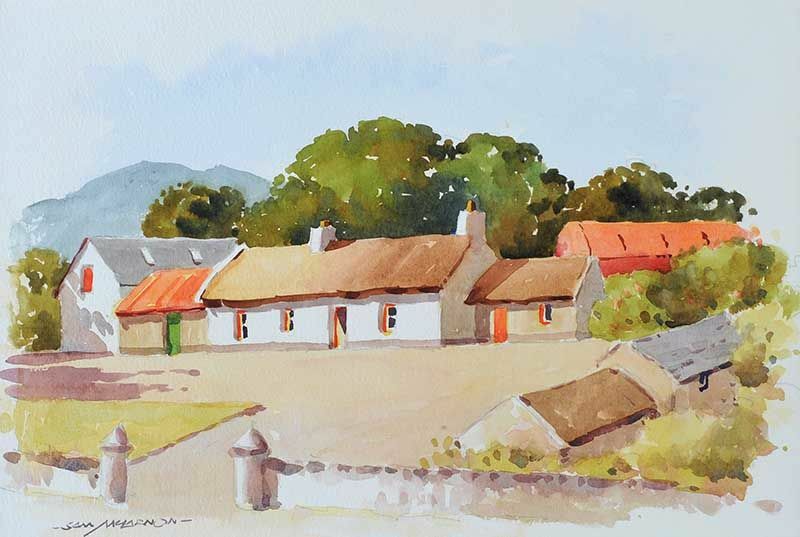 “Thatched Cottage, Ireland” watercolour drawing (10″ x 15″). Sold Ross’s – 3/12/2014 for £160.00. “Figure on a Country Path” dated 1916, oil on board (9″ x 13″), sold at Whyte’s – 17/7/2017 for €300.00. “Wendy’s Jug” oil on canvas board (20″ x 14″), sold at Adam’s – 27/9/2017 for €420.00. 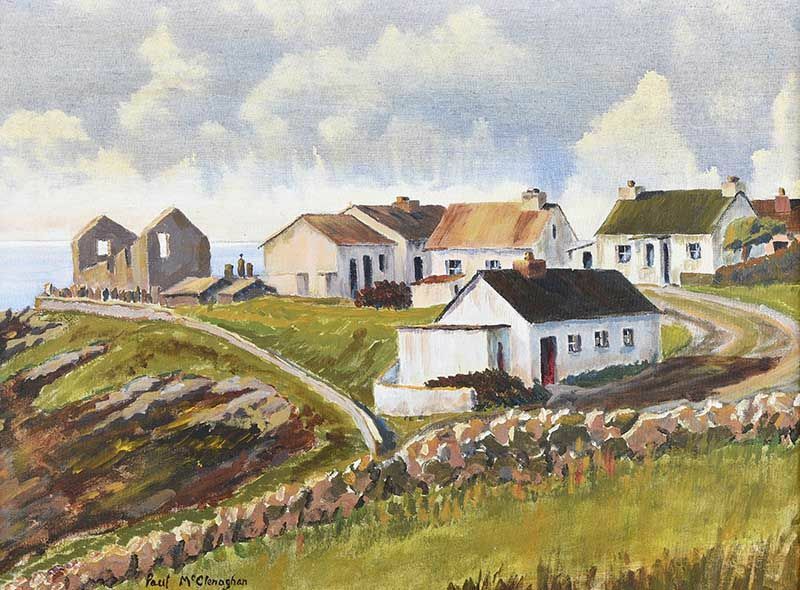 “Dawros, Co.Donegal” oil on canvas board (12″ x 16″), sold at Morgan O’Driscoll’s – 14/9/2015 for €1,900. 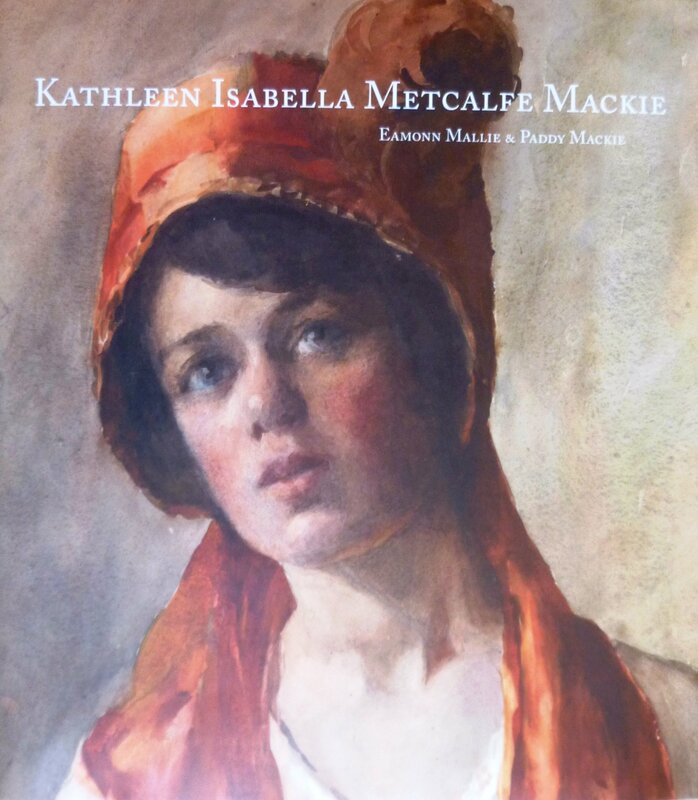 “Kathleen Isabella Metcalfe Mackie” is a coffee-table book written by Eamonn Maille & Paddy Metcalfe and published in 2009. Running to 298 pages the book contains 100 of her paintings and more than 30 drawings. Well worth tracking down but expect to pay from £75 /£100 for a copy – if you can find one! 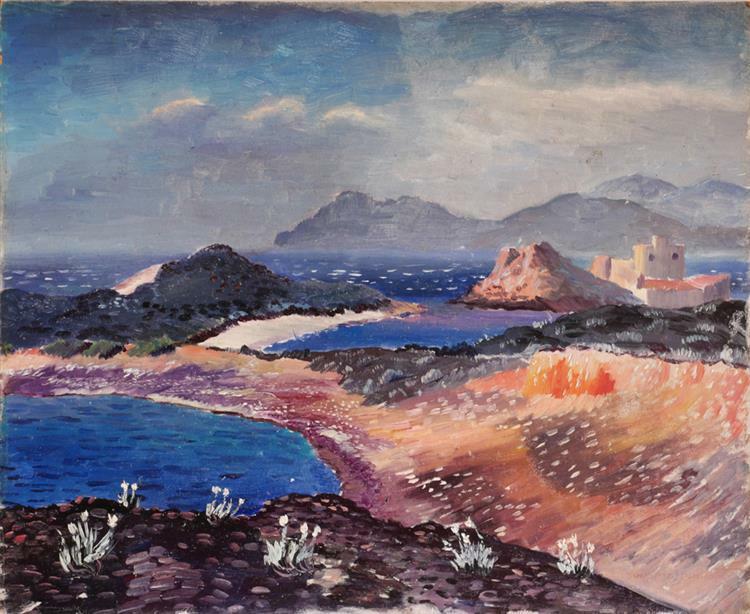 “Pourquerolles, Les Iles D’or” oil on board (13″ x 16″). 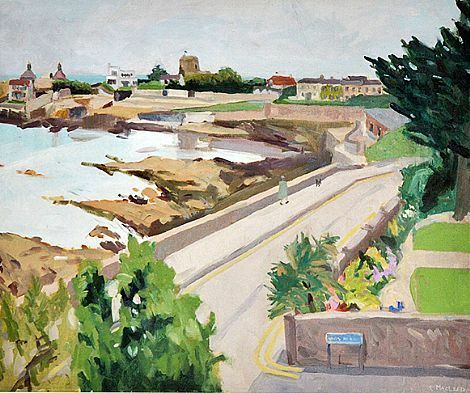 “Sandycove” oil on board (20″ x 24″). “West of Ireland Fairy Scene” watercolour and gouache (15″ x 13″), sold at Whyte’s – 26/9/2016 for €3,800. “Costume Design” watercolour and gouache (33.5″ x 27″), sold at Whyte’s – 2/10/2018 for €3,000. 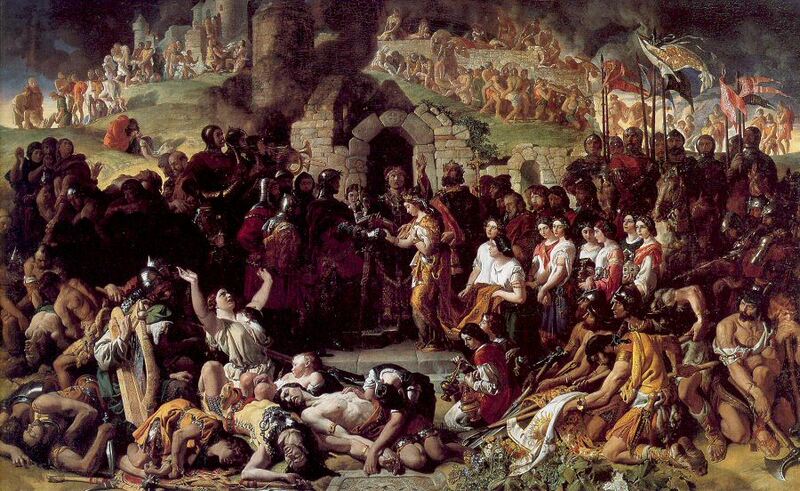 “The Marriage of Strongbow and Aoife” by Daniel Maclise is one of Ireland’s best known history paintings. Executed in 1854, when Maclise was at the height of his powers, the work depicts the marriage of princess Aoife, the daughter of Dermot MacMurrough, to the Norman leader Strongbow, following the capture of Waterford. 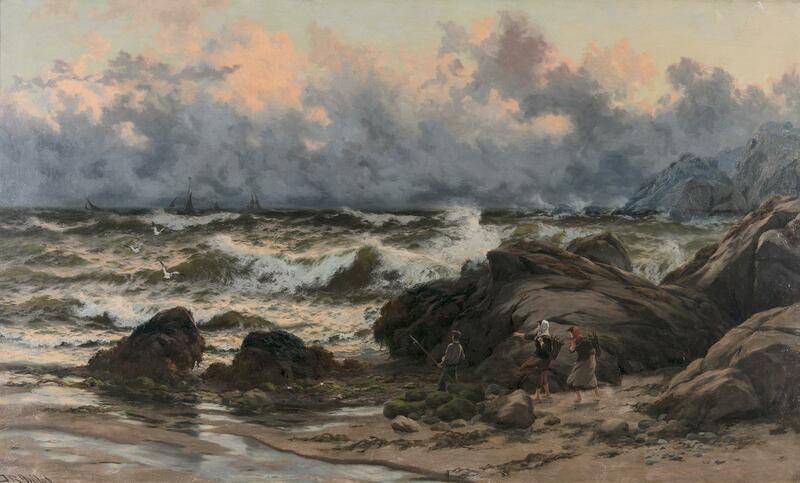 Presented to the Gallery in 1879, today it is one of the most popular and celebrated works in the collection. NLI. 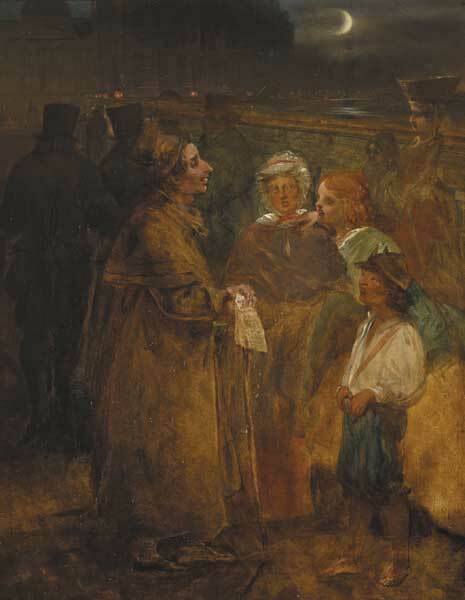 “The Street Poet Zozimus in 1838” oil on canvas (16″ x 12″). Sold at Adams – 14/11/2011 for €1,500.00. Ann Magee is a self-taught artist from West Belfast, Northern Ireland. 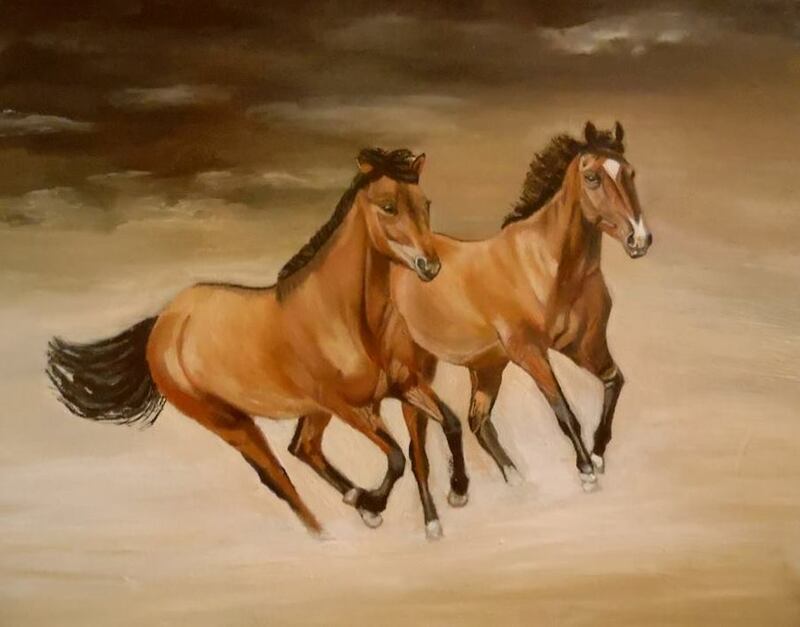 Starting off with a beginners guide to painting with oils back in the early 1990s, she used cardboard and the backs cereal boxes to teach herself the fundamentals of drawing and painting. 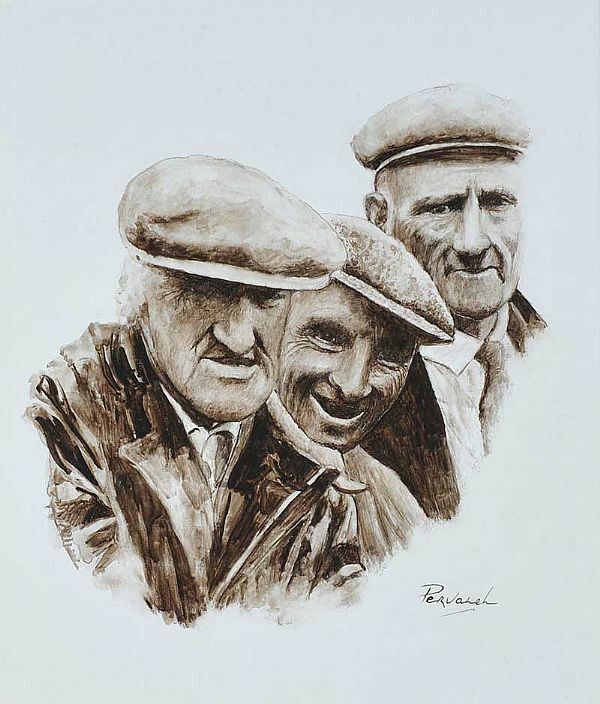 Specialising in portraiture and landscapes, her work has been exhibited at the Féile an Phobail and has been commissioned and sold internationally. She currently has paintings on display in The Temple restaurant in Andersonstown, and various other venues throughout Belfast. 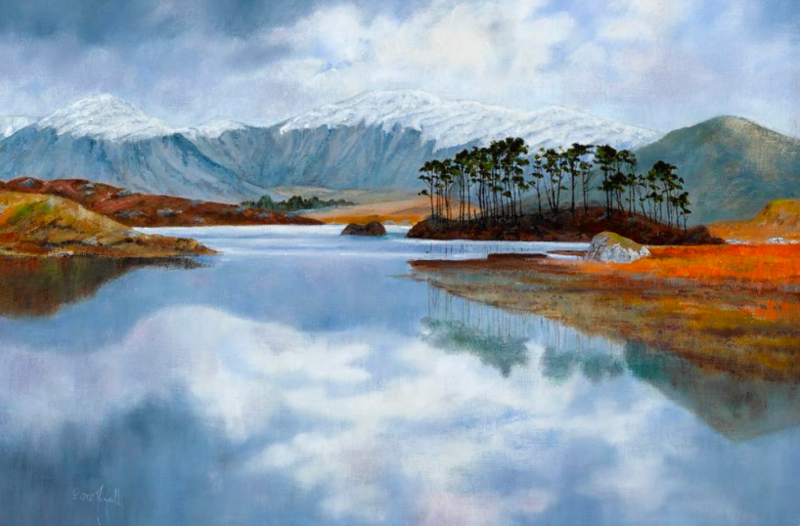 “Lakes of Killarney” oil on canvas (24″ x 44″). Left to right: “Madonna” oil on canvas (29″ x 25″); and “Running Free” oil on canvas (30″ x 35″). 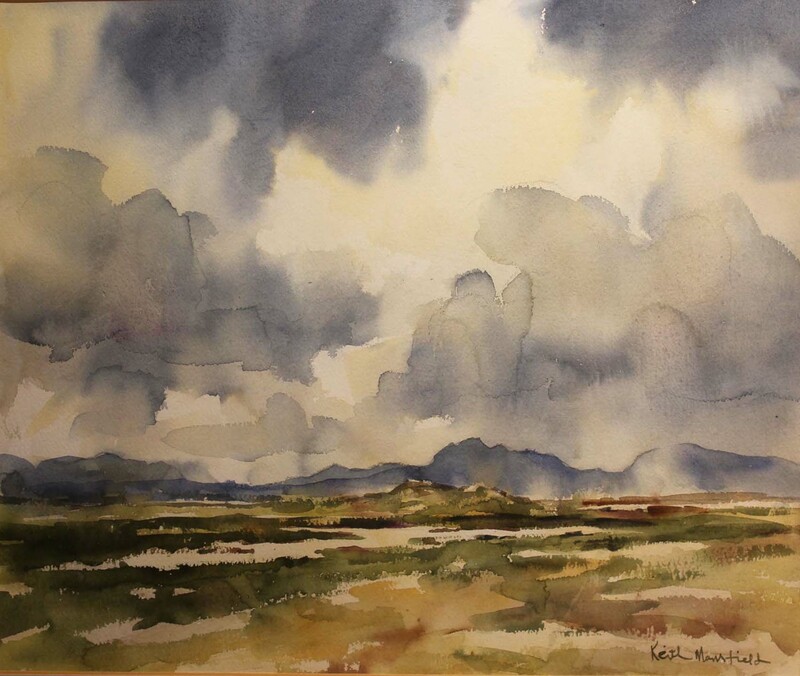 “Bogland near Glenties, Co.Donegal” watercolour drawing (10″ x 14″), sold at Ross’s 1/2/2017 for £50.00. 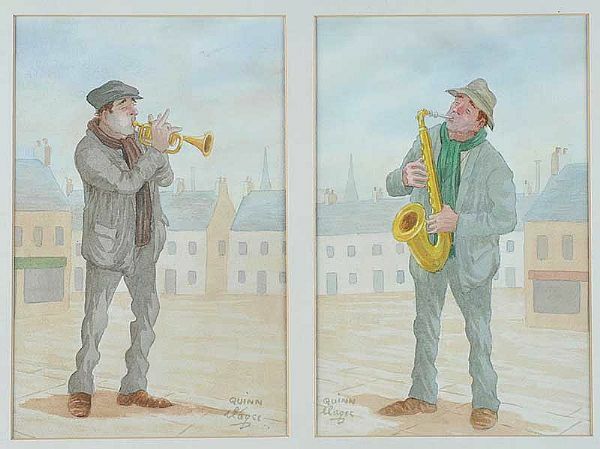 Left to right: “Street Musicians” pair of watercolour drawing (10″ x 7″), sold at Ross’s 1/2/2017 for £70.00 ; and “Harland & Wolff RIP” pen and ink drawing (8″ x 11″). 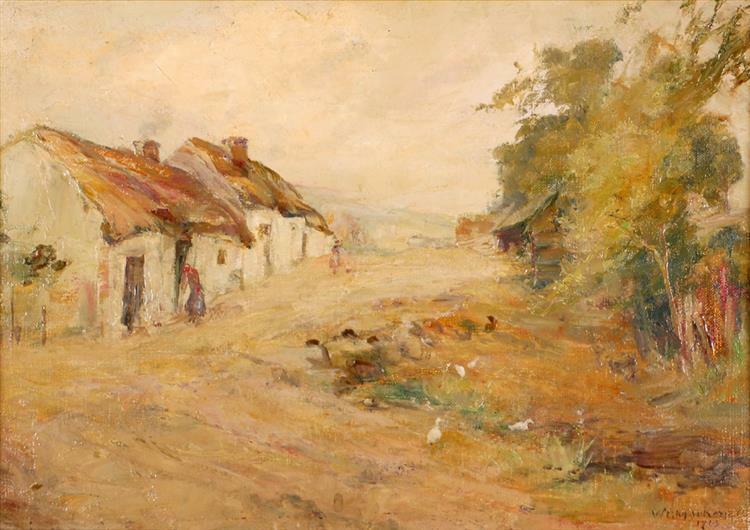 William Magrath was born in Cork, and attended the Cork School of Art. He emigrated to the United States in 1855. 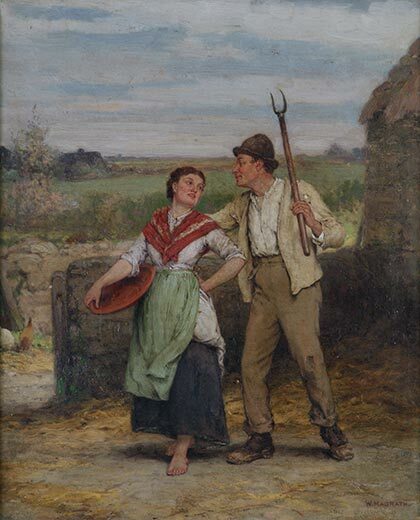 “Ah Rory Be Aisey, Don’t Tease Me No More” c.1885, oil on canvas – in the collection of the Crawford Art Gallery, Cork. 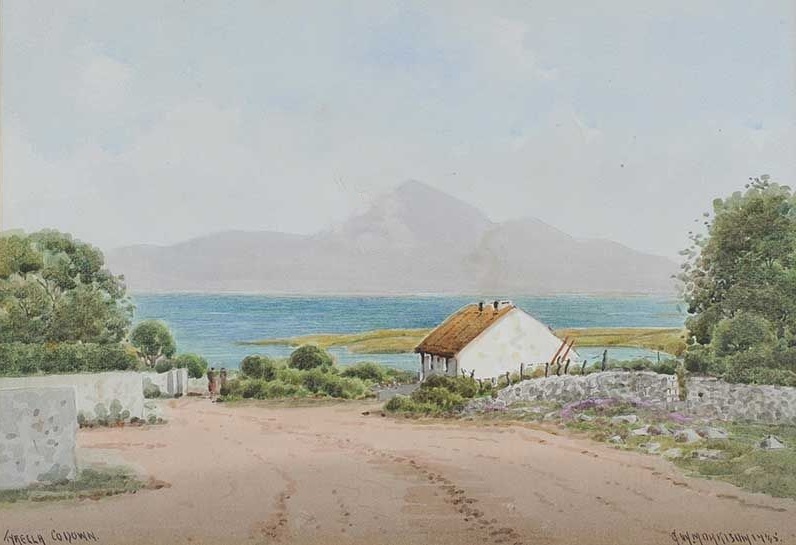 “At the Cottage Door” dated 1875, watercolour (14.5″ x 11″), sold at Adams – 26/9/2012 for €4,700. “The Cathedral, Galway” dated 1974, oil on board ( 20″ x 24″), sold at Morgan O’Driscoll’s – 5/12/2016 for €2,200. 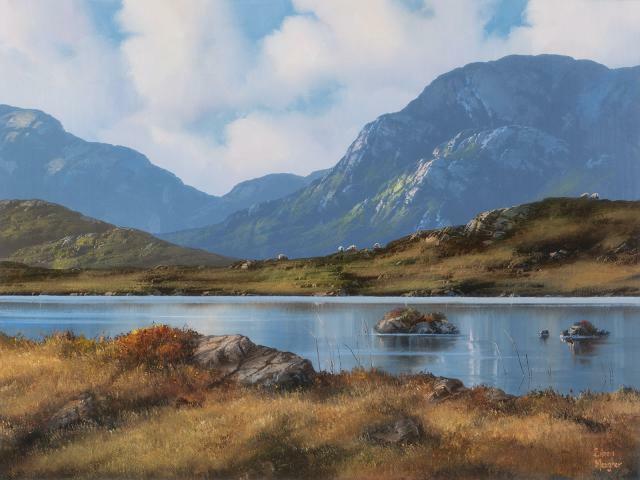 Left to right: “On Kylemore Lake, Connemara” oil on board (16″ x 21″), unsold at Morgan O’Driscoll’s (RDS) – 10/4/2017; and “Ervallagh, Roundstone” oil on board (15.5″ x 19.5″), sold at Dolan’s ‘Rosslare Sale‘ – 30/4/17 for €3,200. 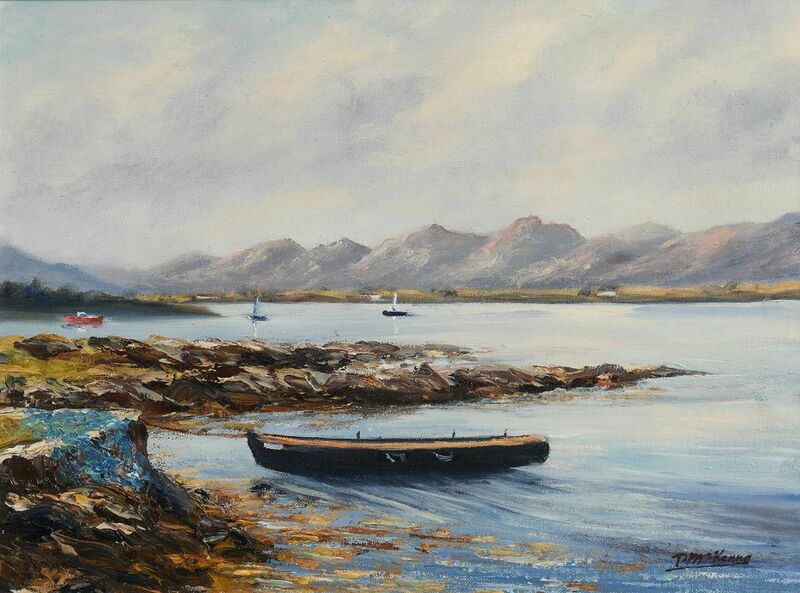 “The Twelve Bens from Roundstone” oil on board (20″ x 28″). 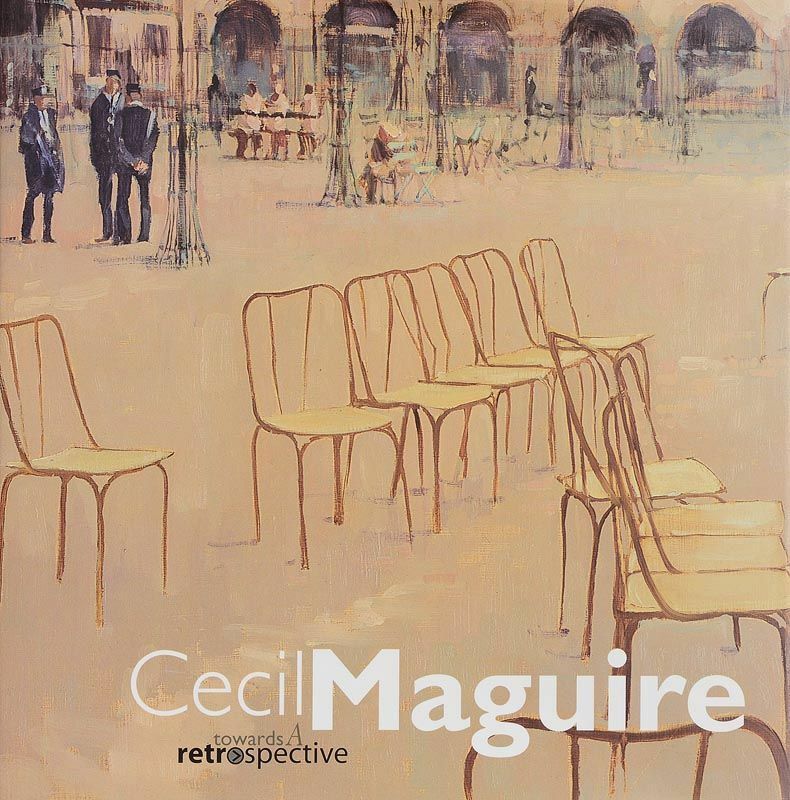 “Cecil Maguire: Towards a Retrospective” by Martin Davison, published by The Davison Gallery (Belfast) in 2002. Available in hardback and softback, 154pp in full colour. 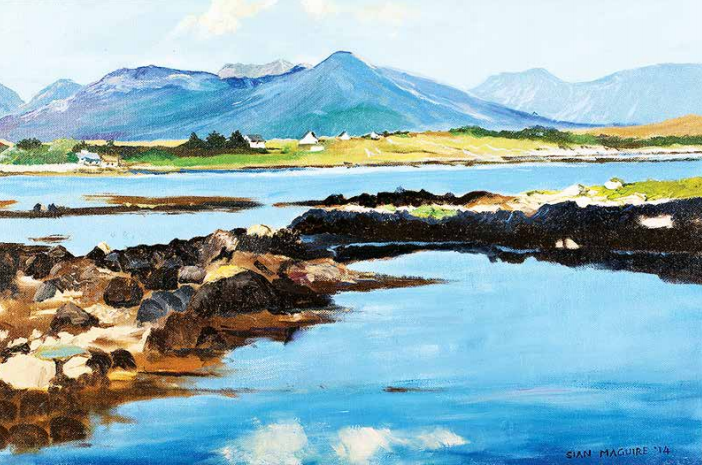 “The Twelve Bens from Inishnee” oil on canvas (15.5″ x 23″). 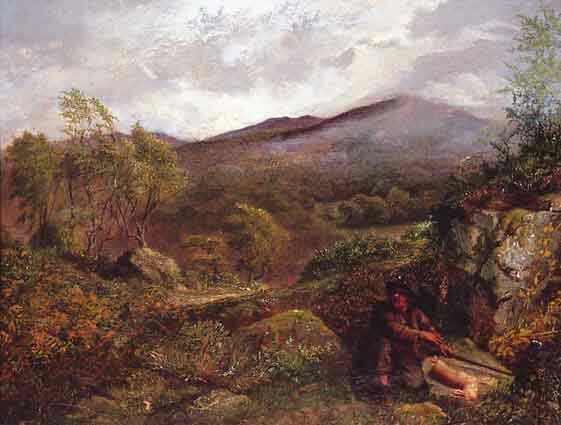 An artist painting in Belfast from about 1830 to 1840. 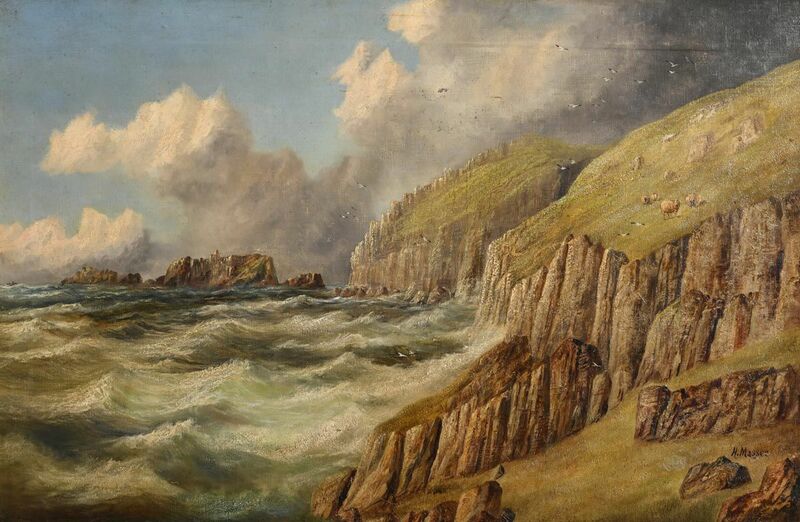 He was a member of the Association of Artists founded in Belfast in 1836. From A Dictionary of Irish Artists 1913. 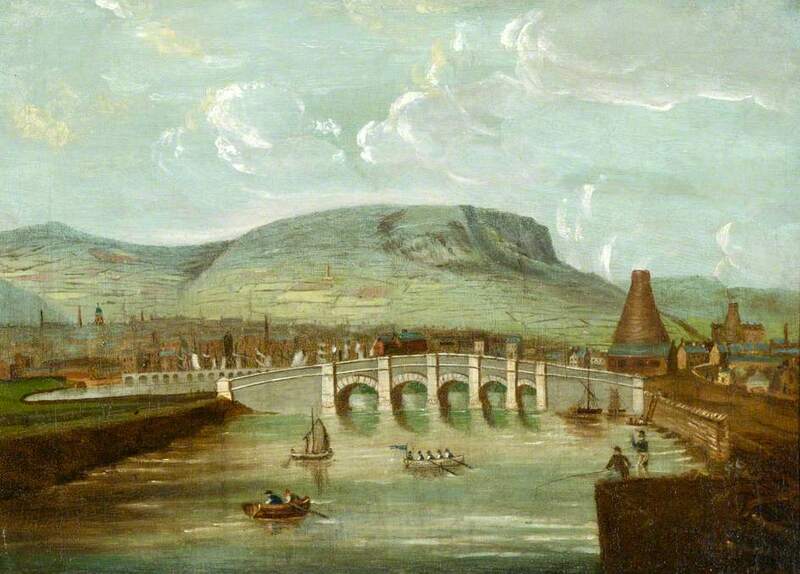 “The Old Lagan Bridge, 1830“. Photo: Belfast Harbour Commissioners. “Girl Resting” oil on board (14″ x 20″). Unsold at Ross’s – 10/8/2016. 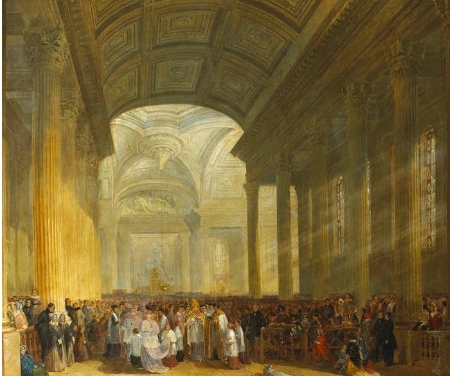 “The Consecration of the Roman Catholic Church of St. Mary’s, Pope’s Quay, Cork” – c.1842 – oil on canvas (37″ x 43″). In the collection of Ireland’s Great Hunger Museum, Hamden, Connecticut, USA. 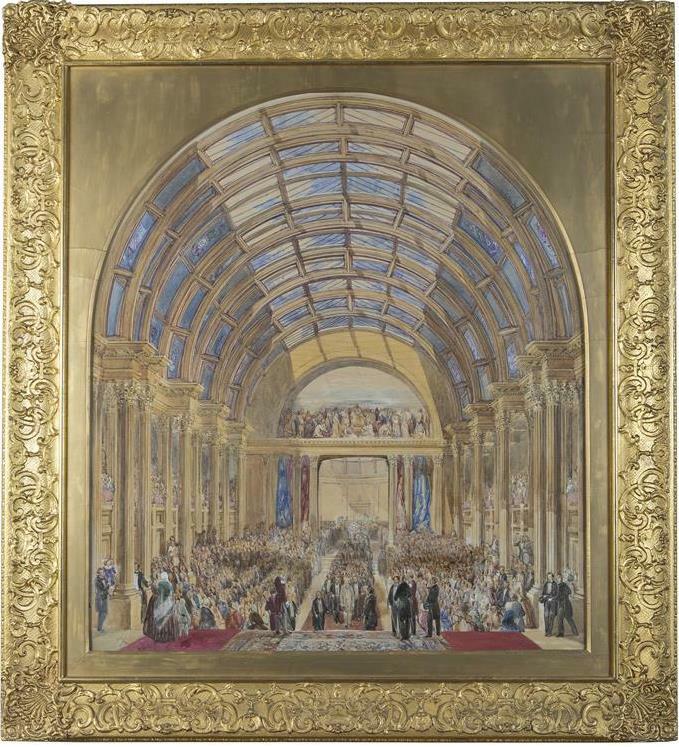 The Official Opening of ‘The National Exhibition of the Arts, Manufactures and Products of Ireland’ Cork, 1852 – watercolour (29″ x 26″), sold at James Adam’s – 30/5/2018 for €4,200. Wexford based potter and artist. 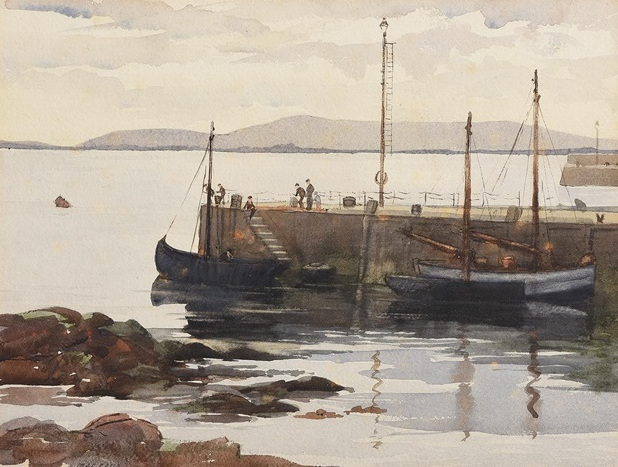 James Malton was an Irish engraver and watercolourist. 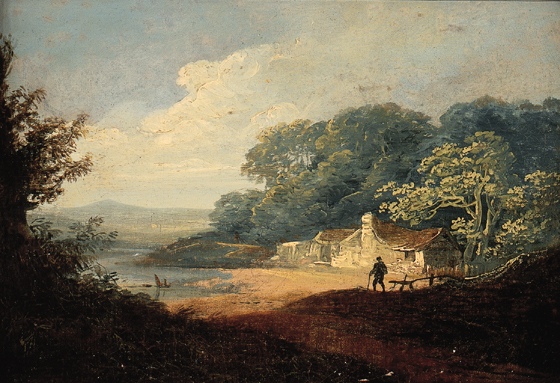 Malton is best known for his Picturesque and Descriptive View of the City of Dublin, a series of 25 prints originally published between 1792 and 1799. 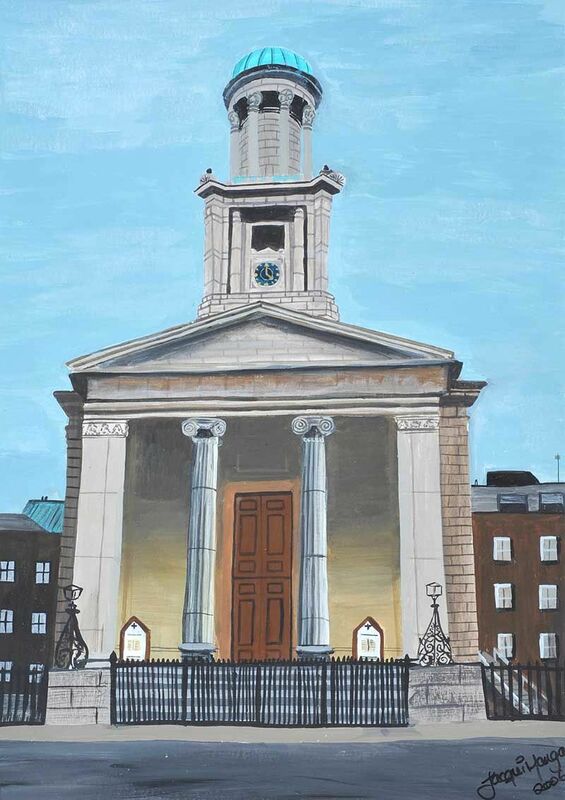 “Peppercanister Church, Dublin” dated 2006, watercolour drawing (16″ x 12″), unsold at Ross’s – 28/6/2017. 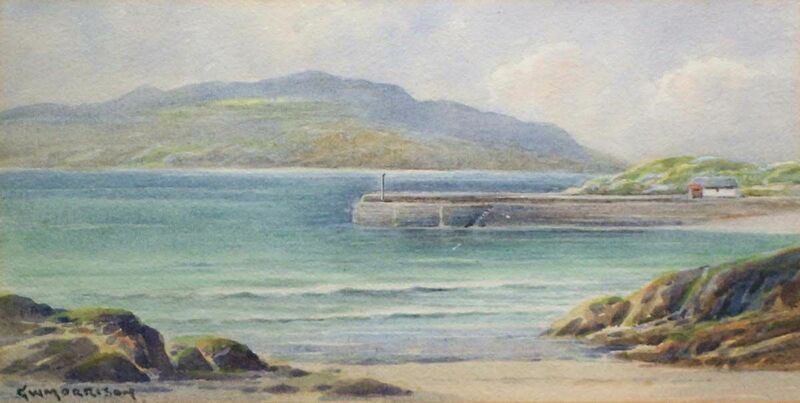 James Manley was born in St. Helens, Lancashire, but moved to Ireland to teach. 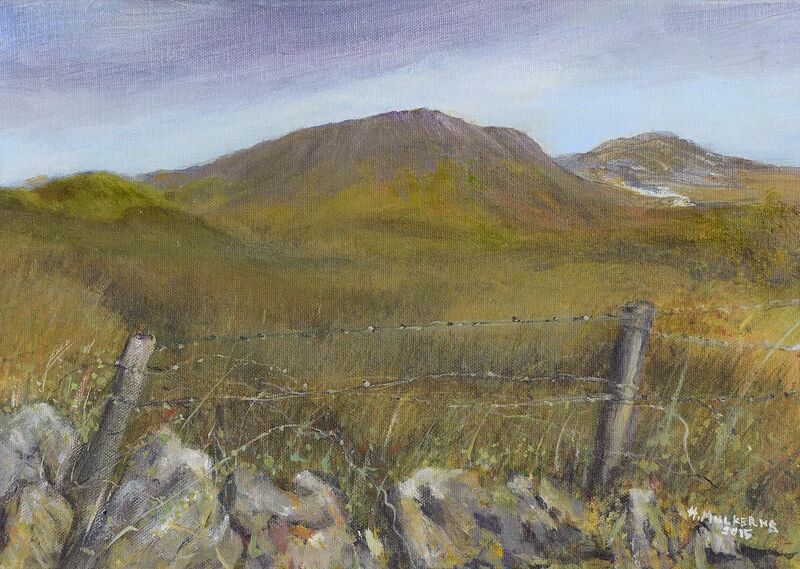 “Slieve Binnian” pastel on paper (16″ x 20″). Sold at Ross’s – 12/8/2015 for £70.00. 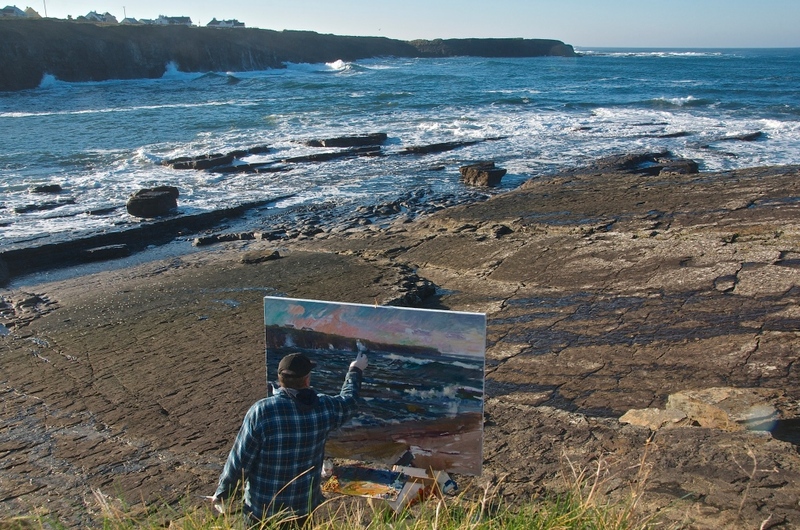 Artist from Skerries, County Dublin. “Maamturks, Galway” watercolour (15″ x 20″), unsold at de Vere’s (Ballybrack House Sale) – 3/12/2017. 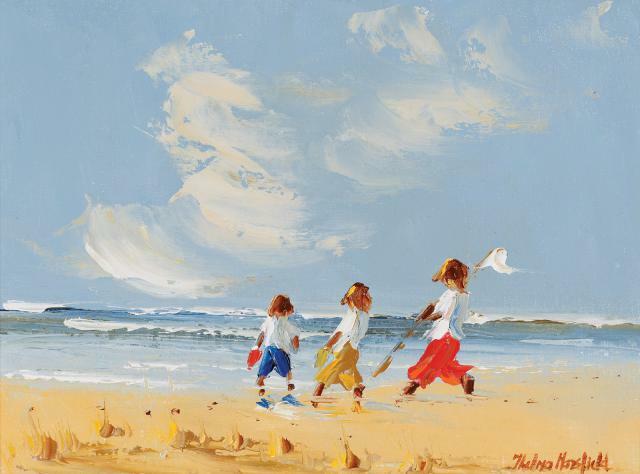 “Three Children on the Beach” oil on canvas board (12″ x 15.5″), sold at Dolan’s ‘Rosslare Sale‘ – 30/4/17 for €650.00. “Winter, County Antrim” oil on board (12″ x 16″), unsold Ross’s – 6/12/2017. 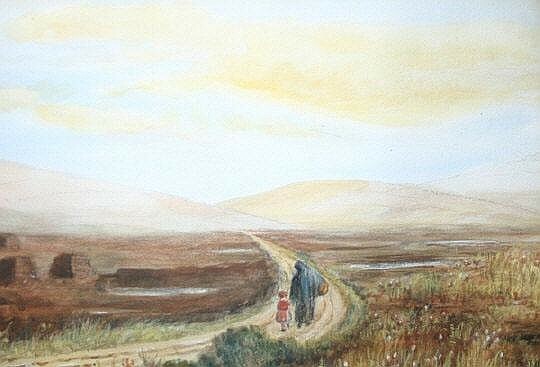 “West of Ireland scene with Figures on a Path” watercolour. 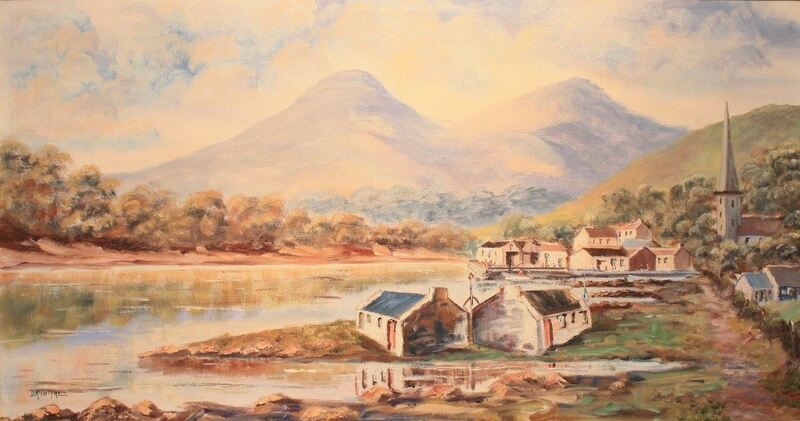 Sold at Mealys 13/10/2010 – sold with another by the artist for just €90.00. “Glenmalure” oil on board (10″ x 18″). Left to right: “Lakeside” oil on canvas (18″ x 23″), sold at Morgan O’Driscoll’s – 23/1/2017 for €420.00; and “River Barrow at County Wexford” oil on canvas (19.5″ x 29.5″) sold at Whytes 30/5/16 – €750.00. 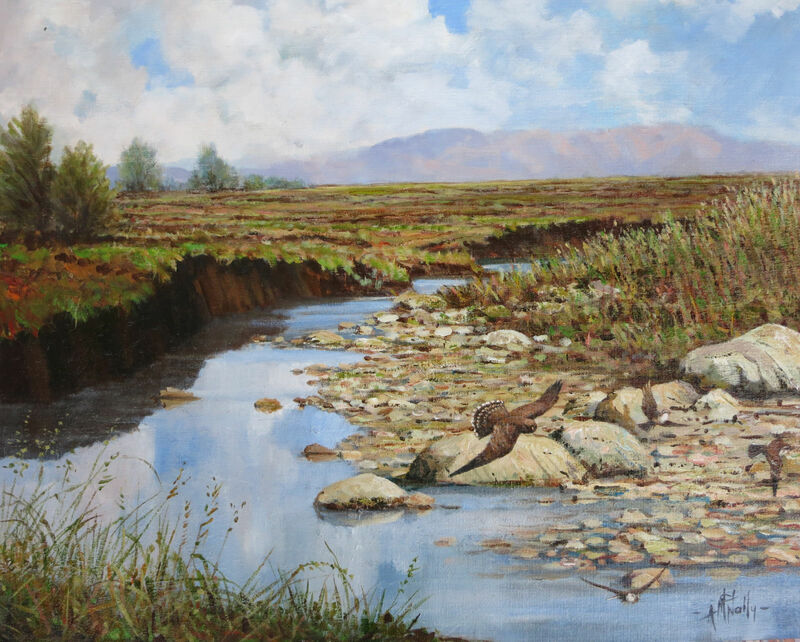 Several works by the artist are held in the Highlanes Gallery Collection in Drogheda, Co.Louth. 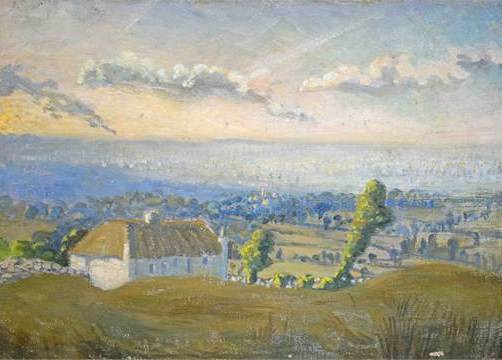 Panoramic landscape with cottage in foreground, oil on canvas (12″ x 17″), sold at Mealy’s – 7/12/2016 for €400.00, and at Morgan O’Driscoll’s – 26/6/2017 for €700.00. 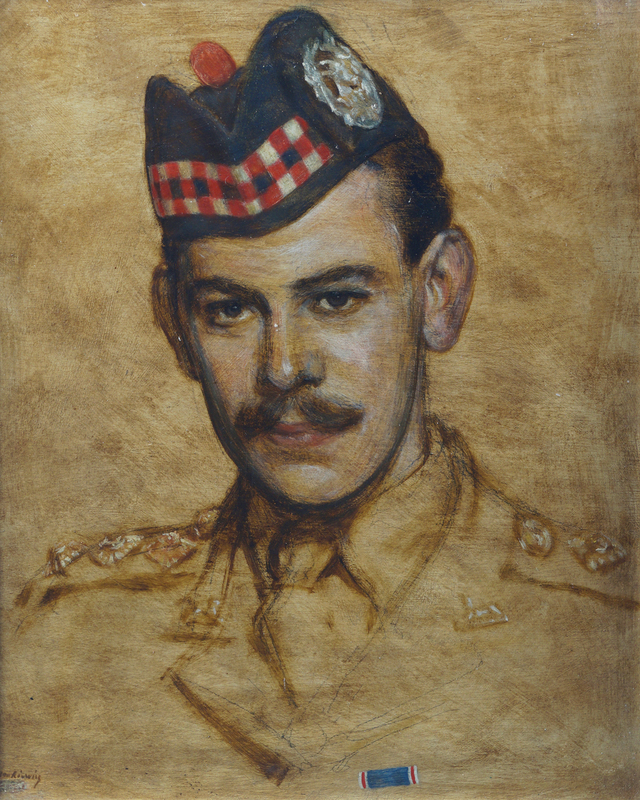 “Portrait of an army officer wearing the Glengarry of The Gordon Highlanders” oil on board (17″ x 13.5″), unsold at Sheppard’s 1/12/2016. 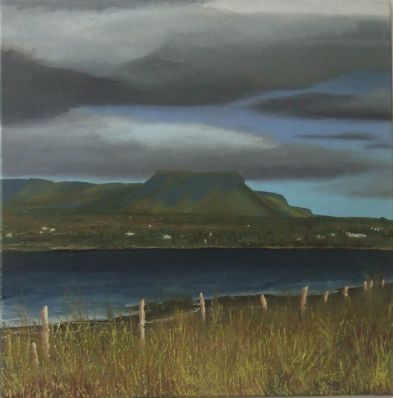 “Knocknarea, Sligo” oil on canvas (12.5″ x 21″), sold at Mealy’s – 7/12/2016 for €1,200. 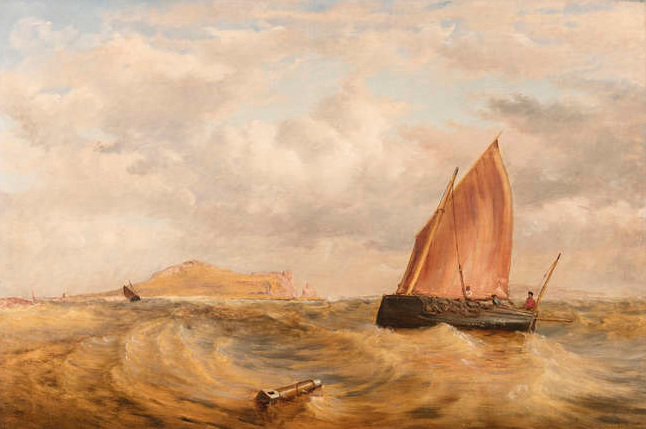 “Shipping off Howth Harbour, looking towards Ireland’s Eye” oil on canvas (24″ x 36″), sold at Adam’s 15/4/2018 for €4,600. Padraig Marrinan was born in Belfast. 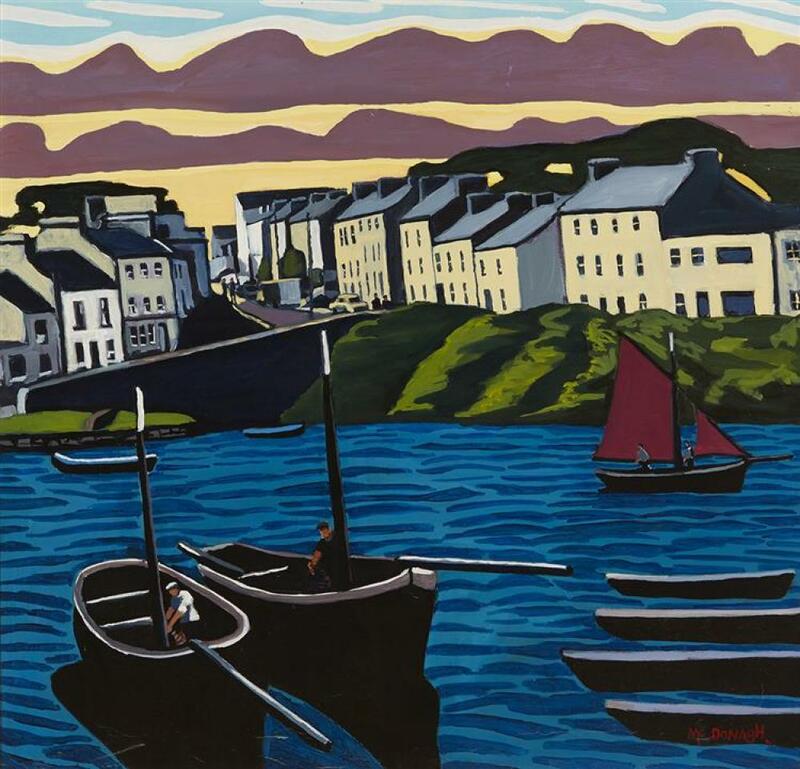 Left to right: “Glandore Harbour, Cork” sold at Ross’s – 6/10/2010 for £440.00; and “Ballintoy” sold at Ross’s – 3/6/2009 for £600.00. Both oil on canvas. 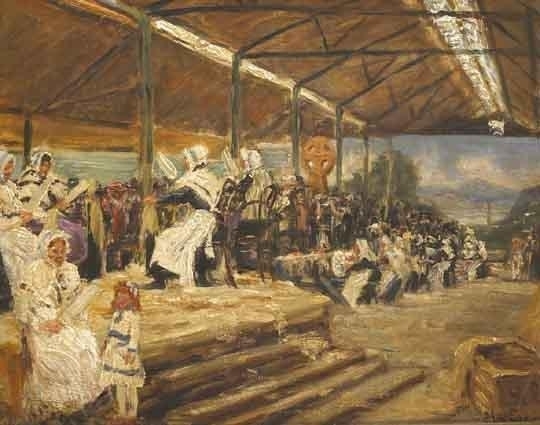 Clare Marsh studied at the Dublin Metropolitan School of Art and at May Manning’s studio, Merrion Row, Dublin under John Butler Yeats. 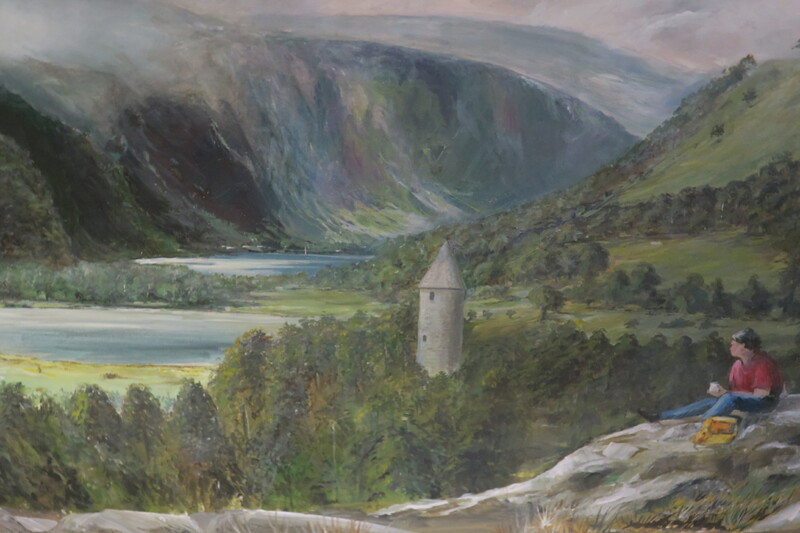 A portrait of Yeats by the artist is held in the collection of the Highlanes Gallery, Drogheda. 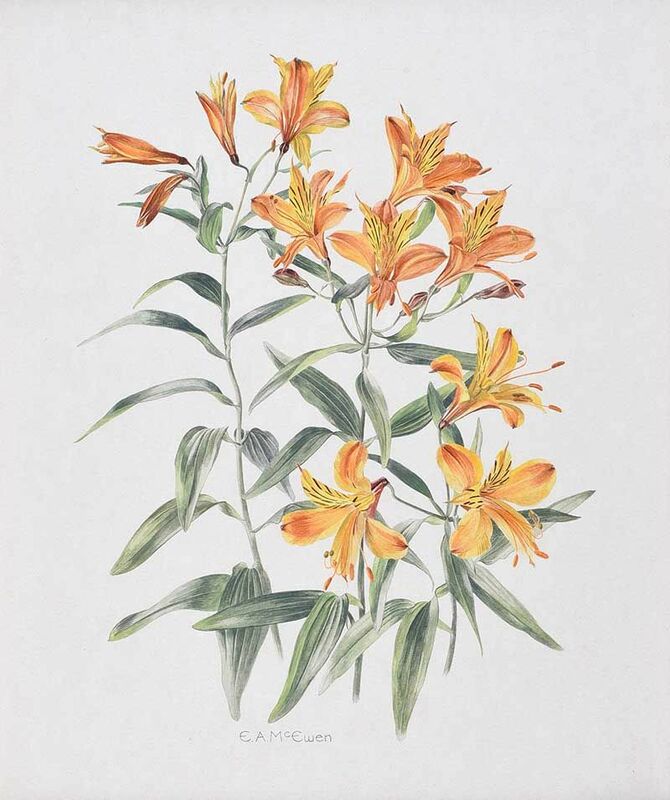 According to Thomas MacGreevy as the artist died at a relatively young age and had to give a great deal of her time to teaching examples of her work are rather scarce. 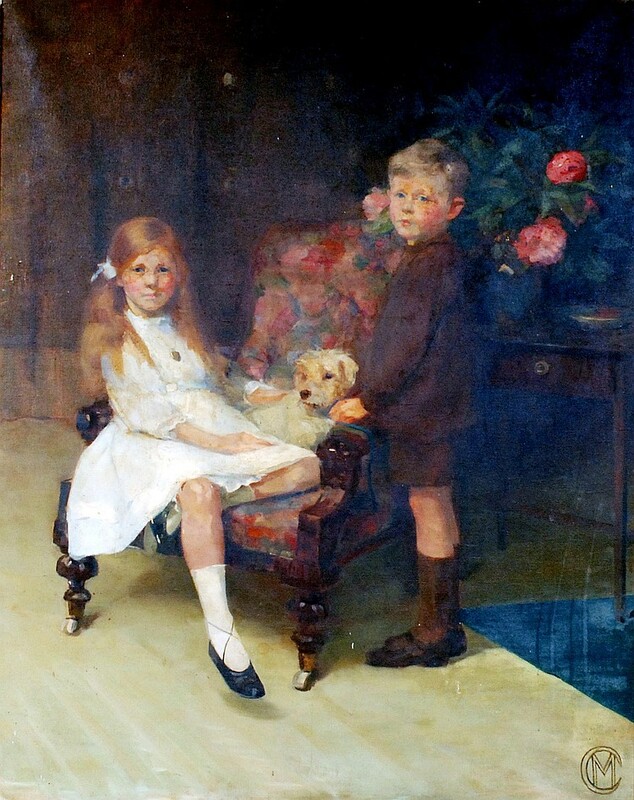 “Portrait of Rufford & Joan Whitehead” oil on canvas (59″ x 47″) sold in England in 2008. 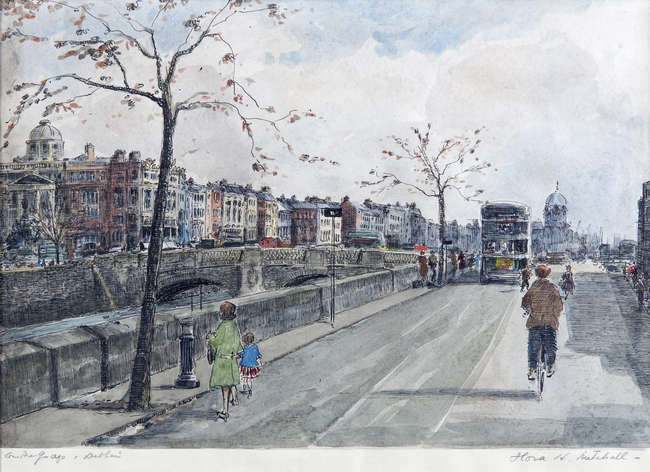 Liam Martin was an illustrator and artist, noted for his sketchbooks Liam C.Martin’s Dublin Sketch Book and Know Your Dublin: A Visual Guide. 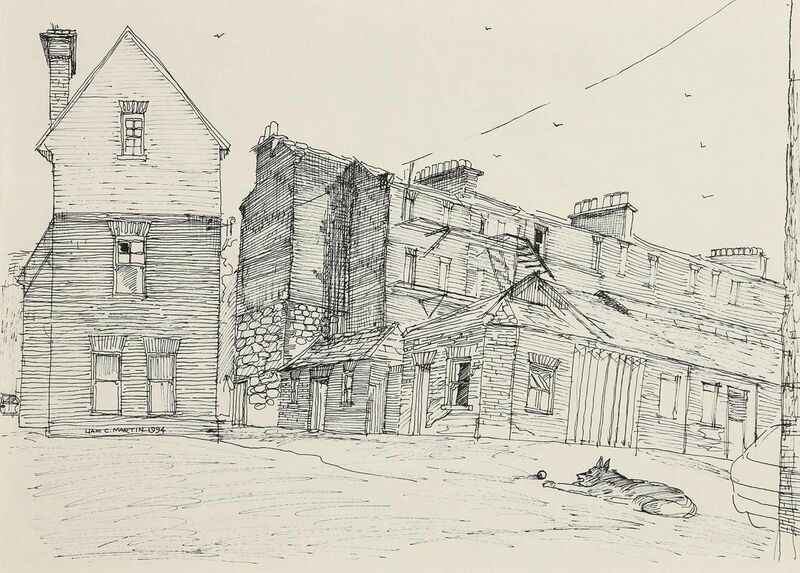 “Dublin Tenements” 1994, pen drawing (12″ x 16″), sold at Morgan O’Driscoll’s – 28/5/2018 for €120.00. 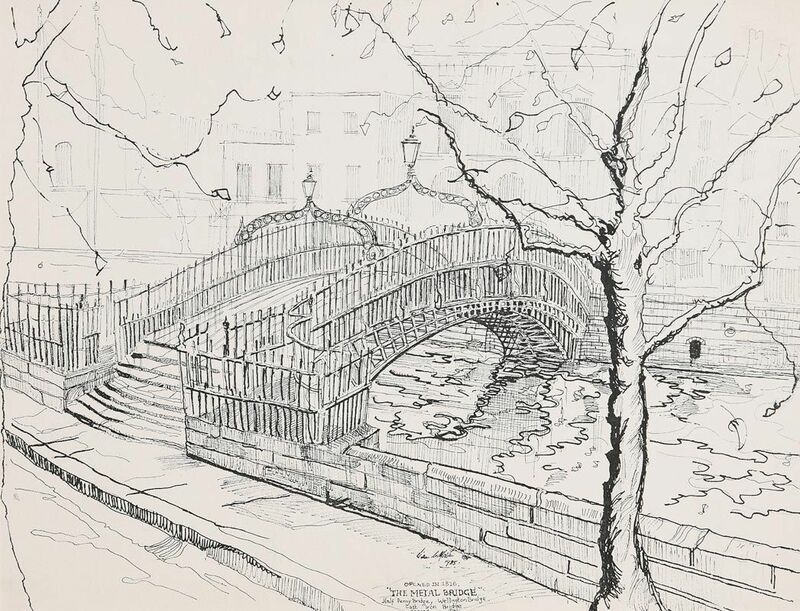 “Halfpenny Bridge, Dublin” dated 1985, pen and ink drawing (11.5″ x 15″), sold at Morgan O’Driscoll’s – 28/1/2019 for €220.00. 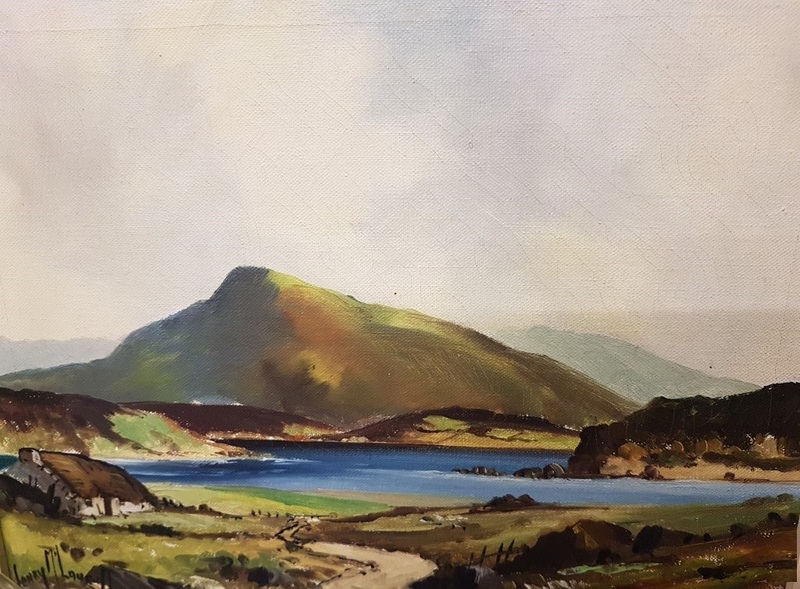 “Benbane Head, County Antrim” oil on canvas (24″ x 36″), sold at Morgan O’Driscoll’s – 10/12/2018 for €260.00. 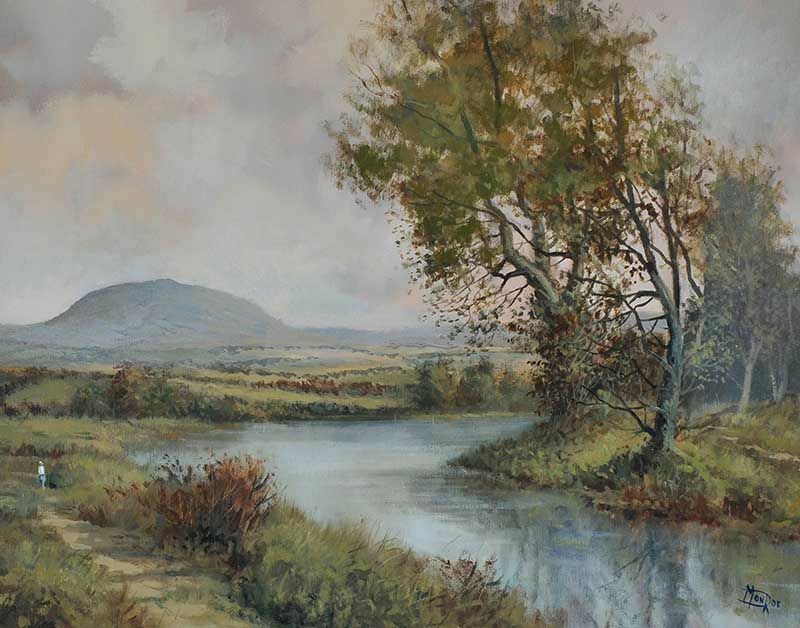 Born in Belfast, Sam Mateer attended the Northern Ireland College of Art, York Street, Belfast graduating with a Diploma in Art and Design (Fine Art) in 1974 and with an Art Teachers Diploma in 1975. 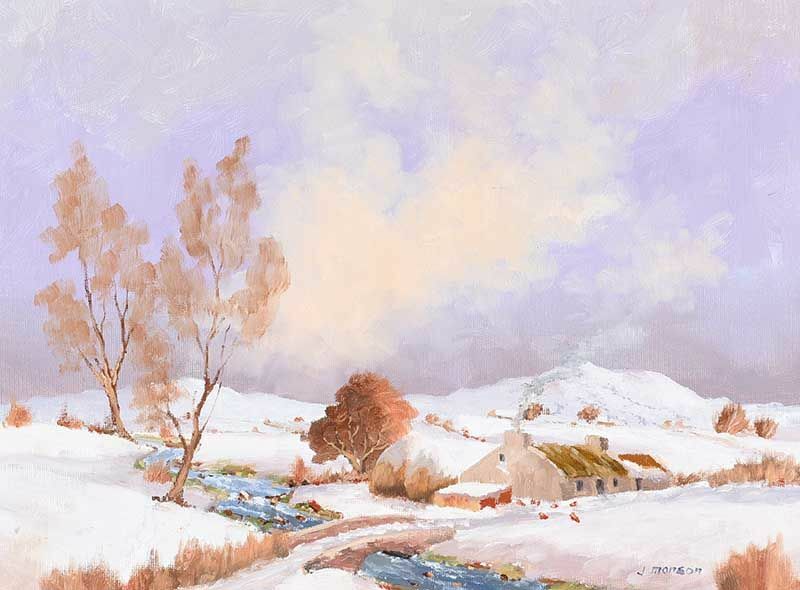 In 1988 he founded the Pastel Society of Ireland and has given many lectures and demonstrations throughout Ireland on Pastel Painting. 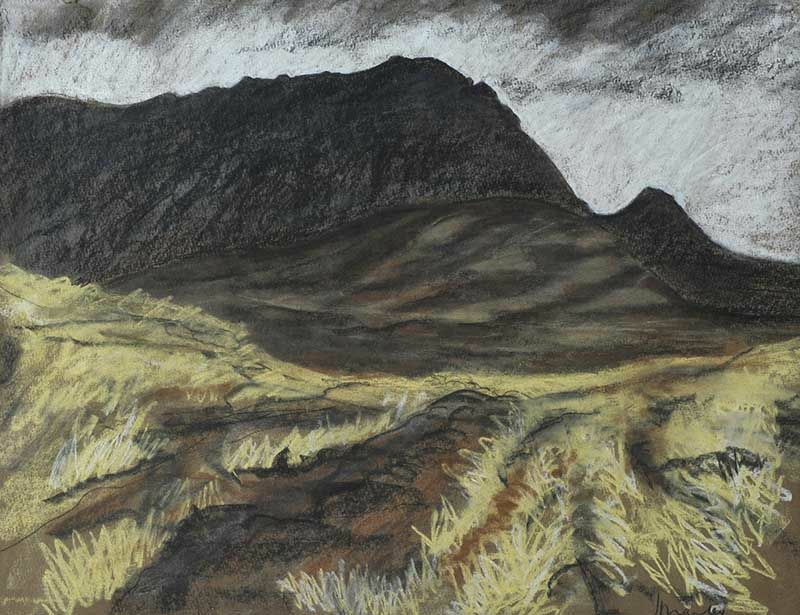 “View from the West” pastel on paper (22″ x 28″), sold at Ross’s – 3/5/2017 for £350.00. Meath born artist now living and working in Dublin. 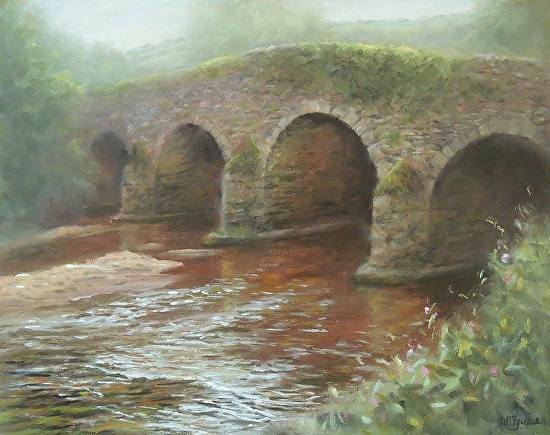 “Shaw’s Bridge, Belfast” oil on board (12″ x 16″), sold at Ross’s – 9/11/2016 for £30.00. Born in Dublin, she studied art at NCAD Kildare Street in the 1960’s. 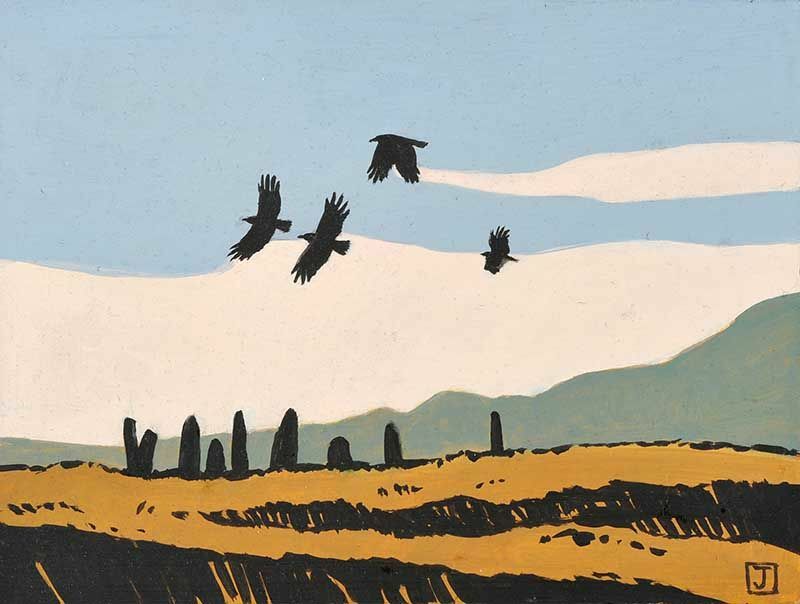 Pervaneh then worked in a small design and print studio in Dublin, after which she taught art in both Armagh and Dublin. She took part in various charity exhibitions around that time. As a result a lot of commissioned work followed. 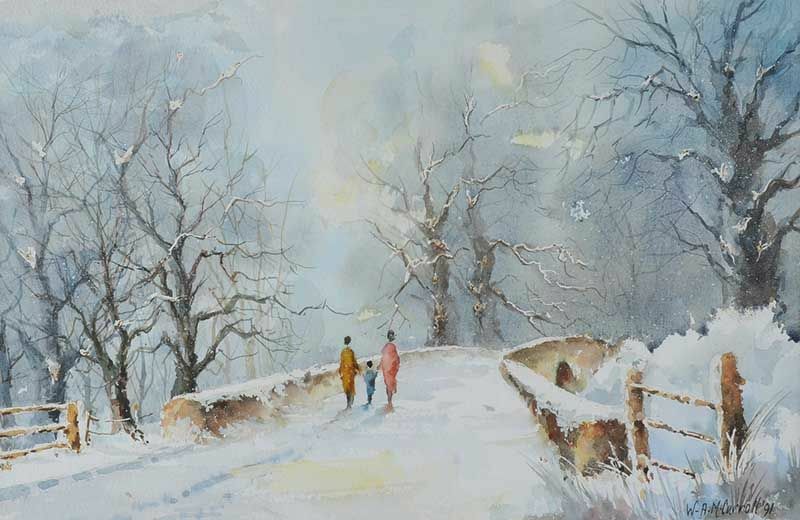 In the early 1980’s Pervaneh moved to Yorkshire where she continued to paint and teach. Commissioned by Wakefield District Council, some of her paintings now hang in Wakefield City Town Hall. 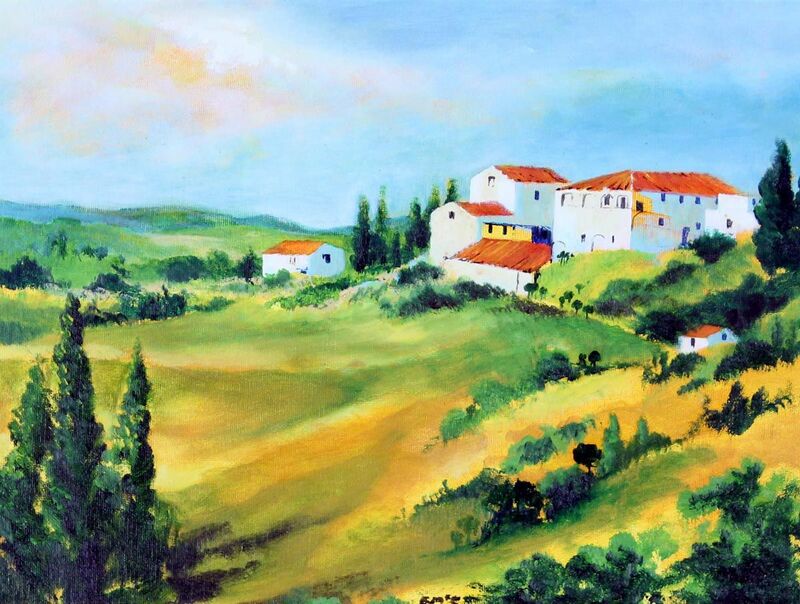 Returning to Dublin in the mid 1990’s Pervaneh recommenced painting and teaching. 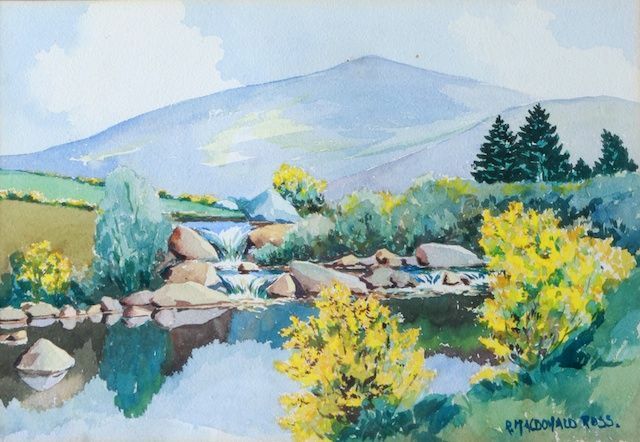 She has sold paintings through the fine art auction houses of James Adams, Morgan O Driscoll, Mullens (Laurel Park), and Gormley’s Art Auctions. 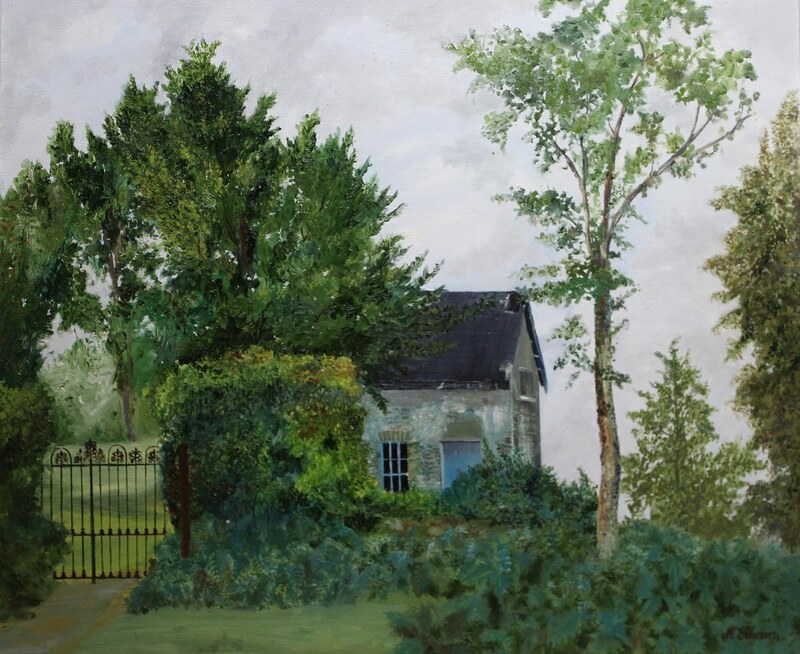 Her work has been shown in various galleries, including Combridges of South William Street, The Kilternan gallery, Kennedy’s of Harcourt Street, and at present in Balla Bán Gallery, Westbury Mall, Grafton Street. She exhibits regularly at The Peoples Art exhibition, St.Stephen’s Green, Dublin. 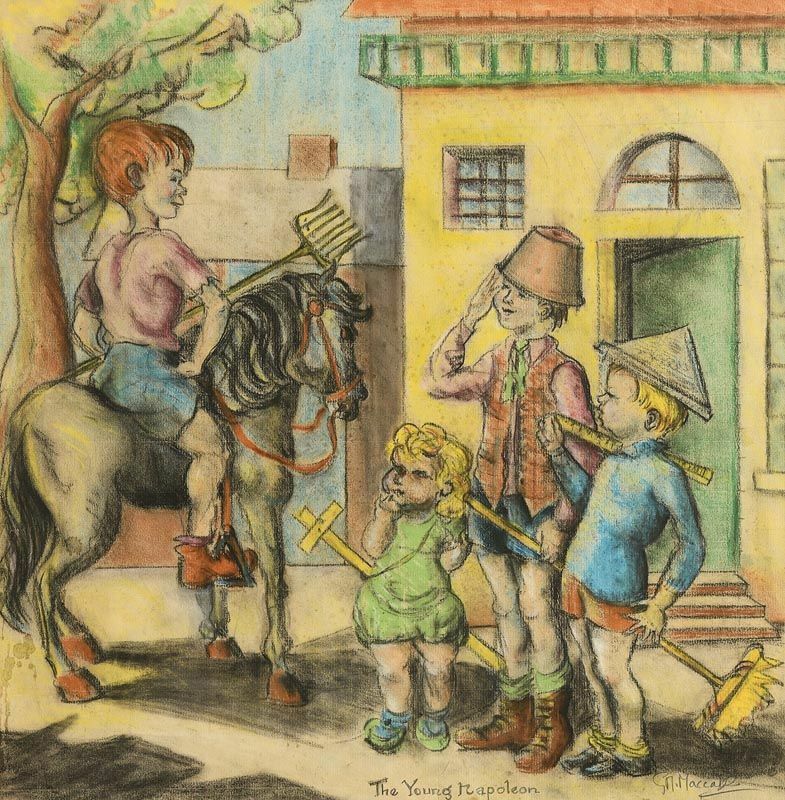 “Puck Fair” watercolour drawing (14″ x 11″), unsold at Ross’s 10/8/2017. 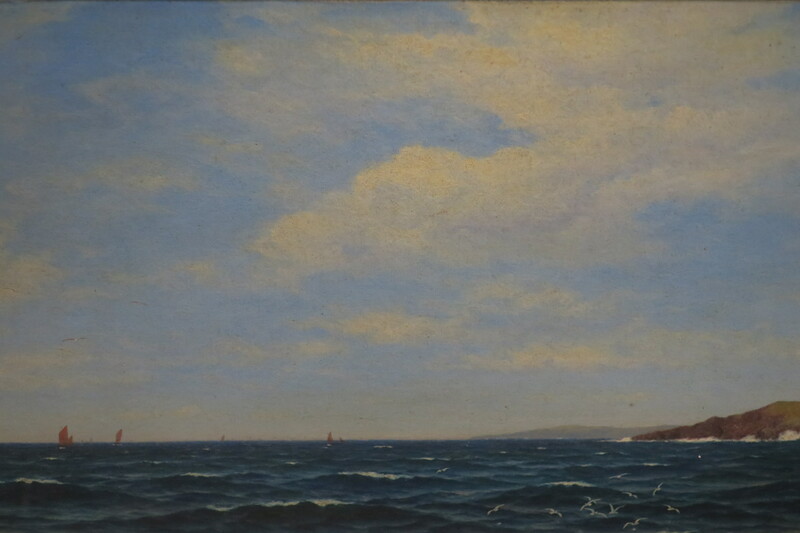 “Sailing off Roches Point” oil on canvas (16.5″ x 26″), sold at Woodward’s – 1/12/2018 for €70.00. Born in Edinburgh, Scotland and living in Northern Ireland since 1967. 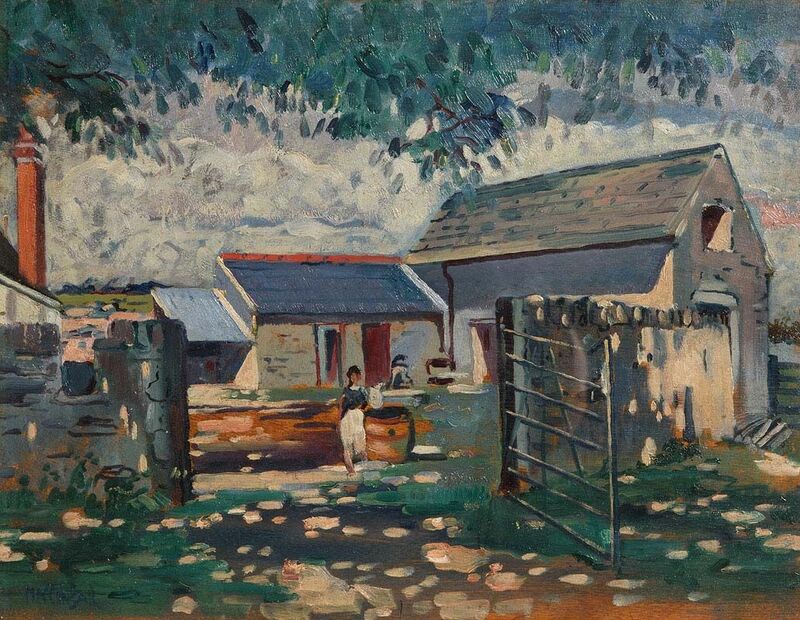 Born in Cookstown, Co. Tyrone, she trained at the Belfast School of Art and the RCA in London. 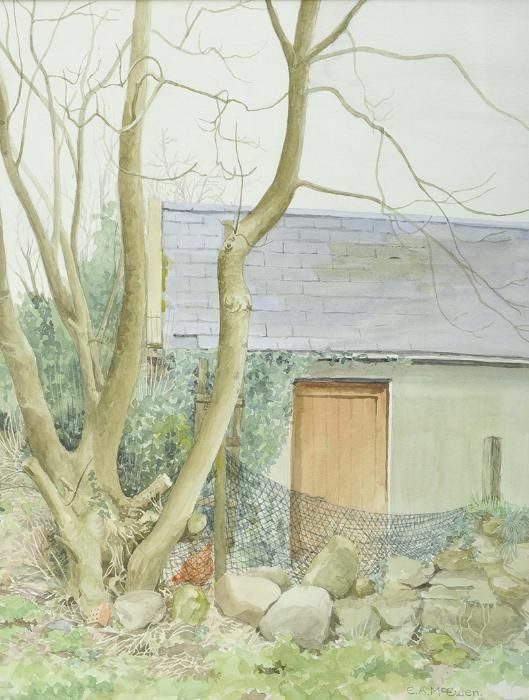 She exhibited at the Society of Watercolour Artists, Ulster Academy, RHA, and the RUA. “Italian Square” watercolour (16″ x 14.5″), sold at Whyte’s – 11/12/2017 for €85. “Sun Through Cloud” watercolour (10″ x 14″), unsold at Whyte’s – 17/7/2017. “Road to the West” oil on panel (12″ x 18″), sold at Morgan O’Driscoll’s – 3/10/2016 for €70.00. Self taught artist working mainly in graphite and charcoal. 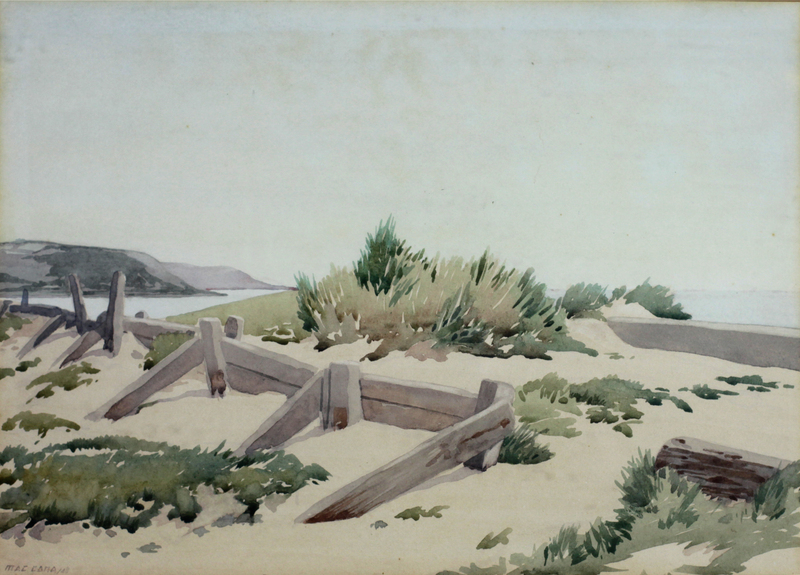 Landscapes, still life, portraits and animals. Still Life, oil on board (13″ x 17″), unsold at de Vere’s – 18/7/2018. 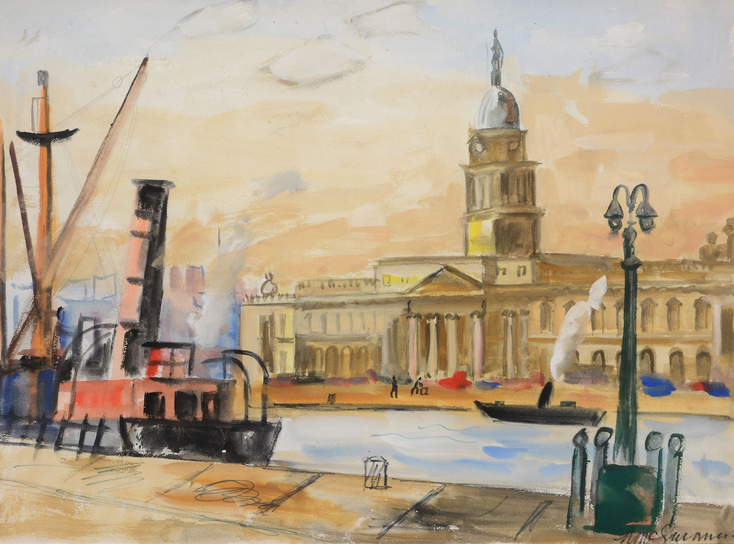 “Custom House, 1977” oil on canvas (14″ x 30″), sold at Morgan O’Driscoll’s – 10/12/2018 for €240.00. “Irish House, Wood Quay, Dublin” watercolour drawing (14″ x 18″), unsold at Ross’s – 9/8/2017. “Fishing, Antrim Coast” oil on board (14″ x 19″), sold at Ross’s 1/2/2017 for £1,400. Left to right: “A Welcome Cup by the Peat Bog” oil on canvas (16″ x 20″); and “Cottages with Mountains in the Distance” oil on canvas (20″ x 29″), unsold at Whyte’s – 17/7/2017. 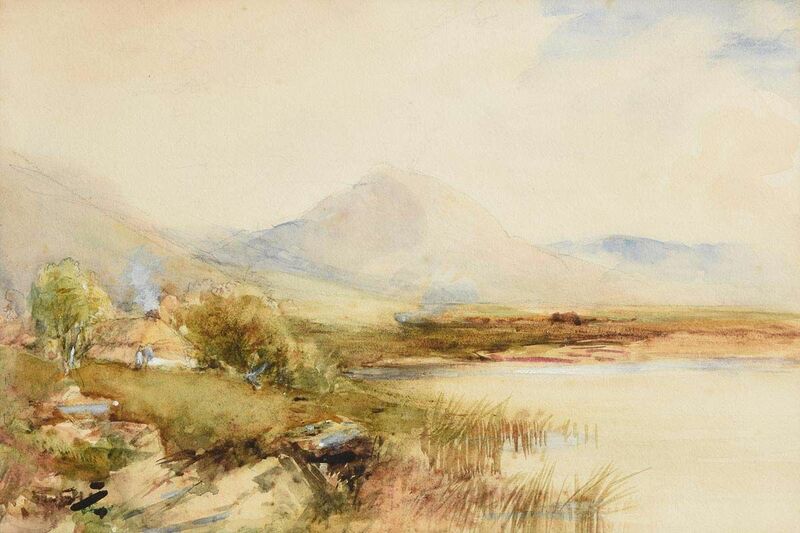 “River in the Mournes” dated 1914, watercolour drawing (7″ x 10″), unsold at Ross’s 9/11/2016. 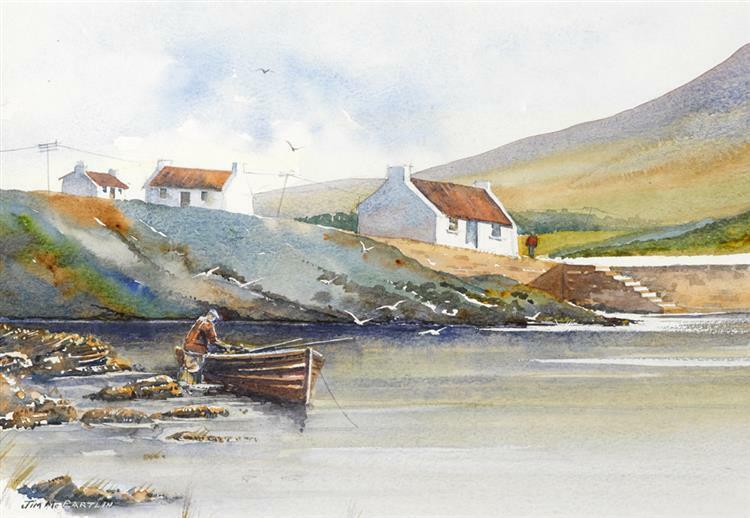 “Blasket Island, County Kerry” watercolour drawing (7″ x 15″), sold at Ross’s – 8/11/2017 for £40.00. “Picnic in Glendalough” oil on board (20″ x 24″), sold at Morgan O’Driscoll’s – 2/10/2018 for €180.00. 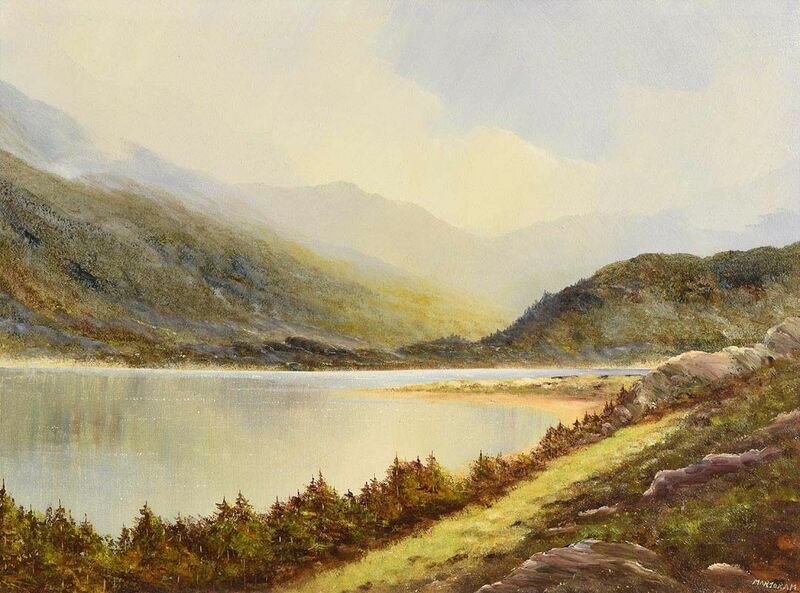 “Glenveigh, Co.Donegal” oil on board (7″ x 9″), sold at Morgan O’Driscoll’s – 3/10/2016 for €200.00. 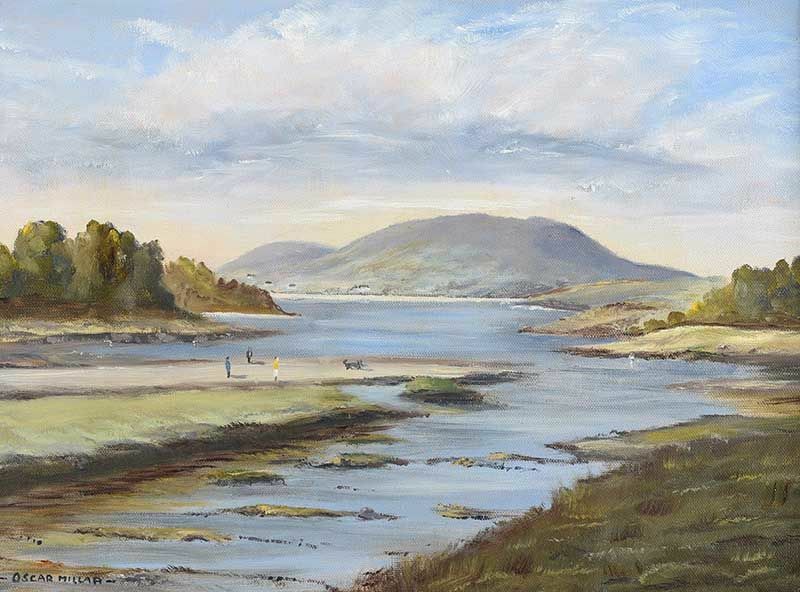 Left to right: “Connemara Peat Bog, Ballina, Co.Mayo” oil on board (15″ x 19″), sold at Whyte’s Online Sale – 24/10/2016 for €800.00; and “Boats moored by a Bridge” oil on canvas (20″ x 16″), sold at Whyte’s – 26/9/2016 for €950.00. 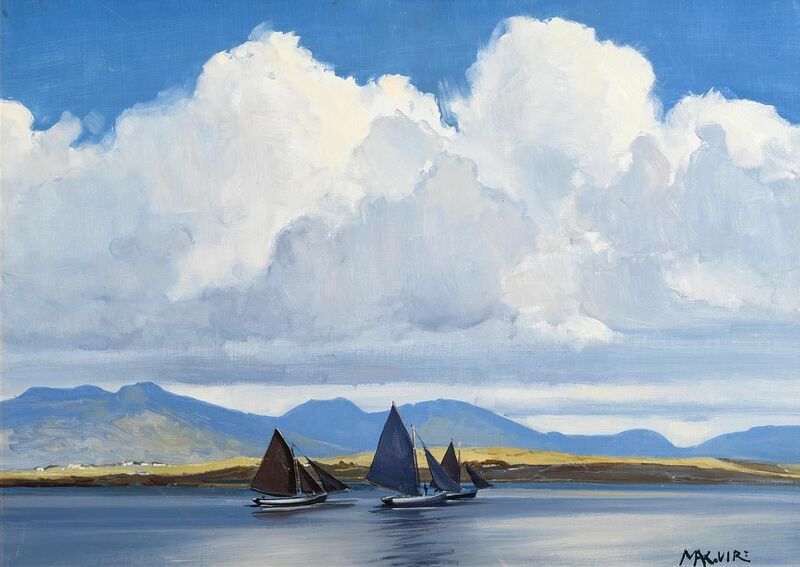 “Galway Hookers, Connemara” oil on canvas (18″ x 14″), sold at Adam’s – 31/5/2017 for €1,600. 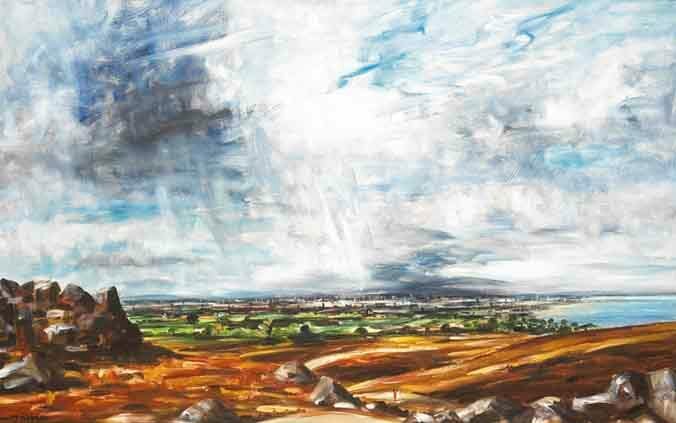 “West of Ireland Landscape” oil on board (16″ x 47″) sold at Morgan O’Driscoll’s – 8/8/2017 for €800.00. 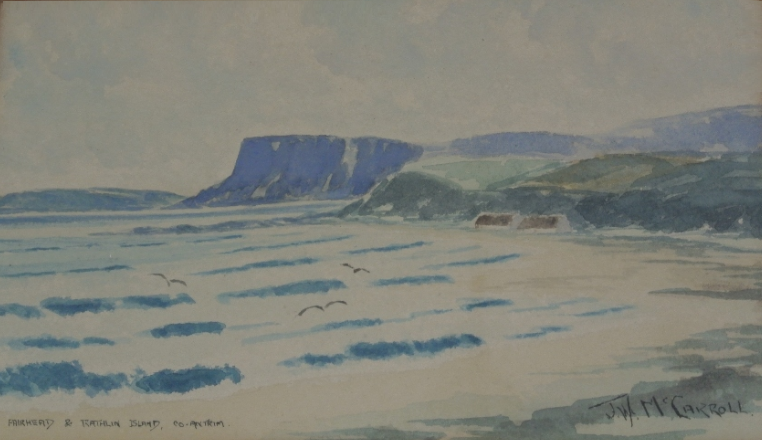 “Fair Head & Rathlin Island, Co.Antrim” watercolour (12.5″ x 16″), unsold at North Coast Auction Rooms – 31/8/2017. 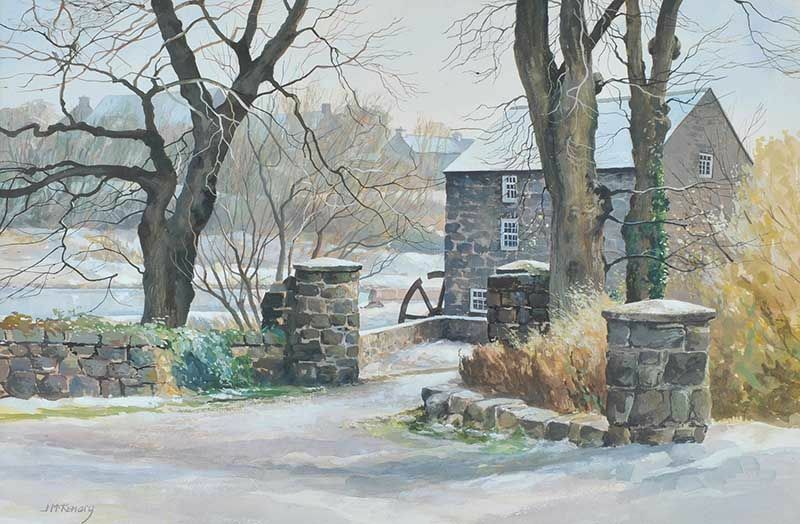 “Winter at Banoge Bridge, River Lagan” watercolour drawing (13″ x 20″), sold at Ross’s 1/2/2017 for £60.00. Born in Dublin. in Dublin. 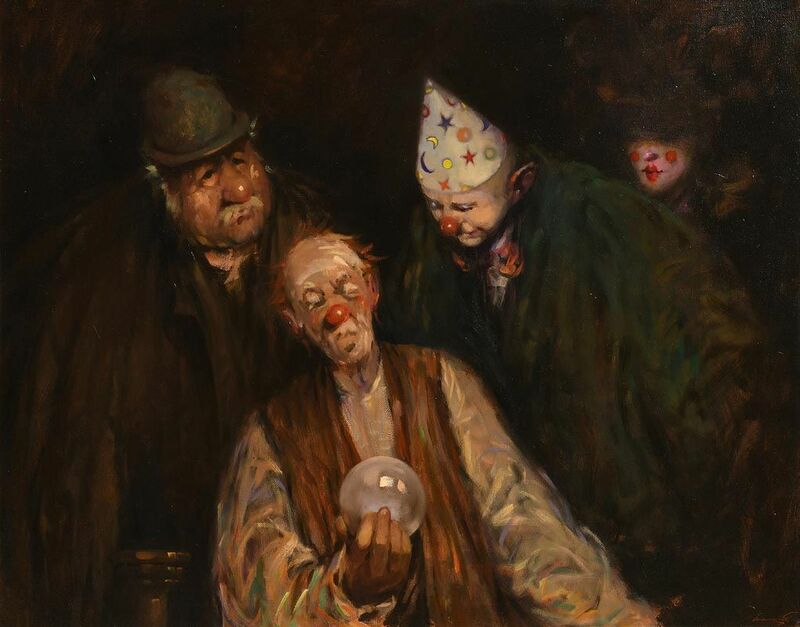 Works exclusively in oils, magical realism fused with political satire is a central theme of much of his work. 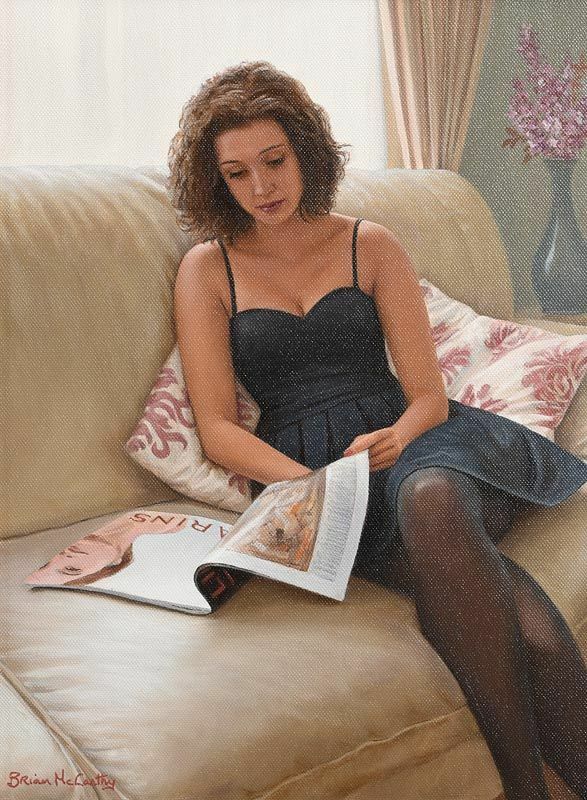 “A Quiet Moment” (2009) oil on canvas (16″ x 12″) sold at Morgan O’Driscoll’s – 2/8/2016 for €2,000.00. 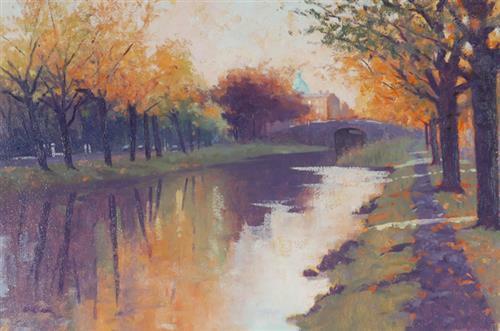 Desmond is a graduate of the National College of Art and Design Dublin and a member of the Water Colour Society of Ireland and The Dublin Painting and Sketching club. 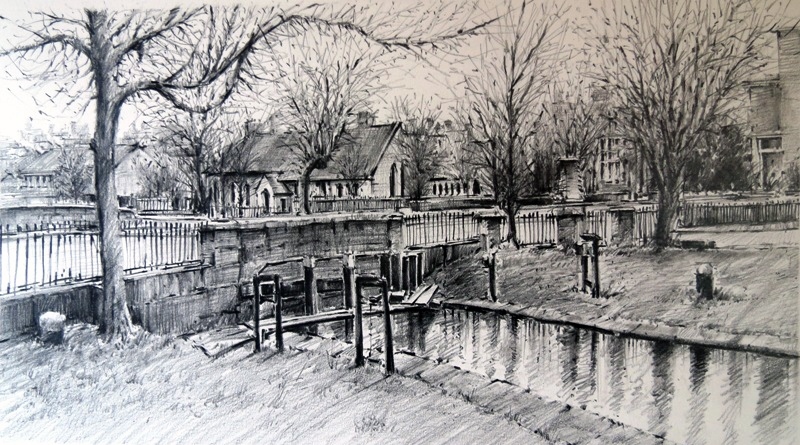 “Mount Street Bridge and Schoolhouse, Dublin” pencil and graphite (9″ x 16″) – just one of many wonderful examples of the artist’s work available through his website. 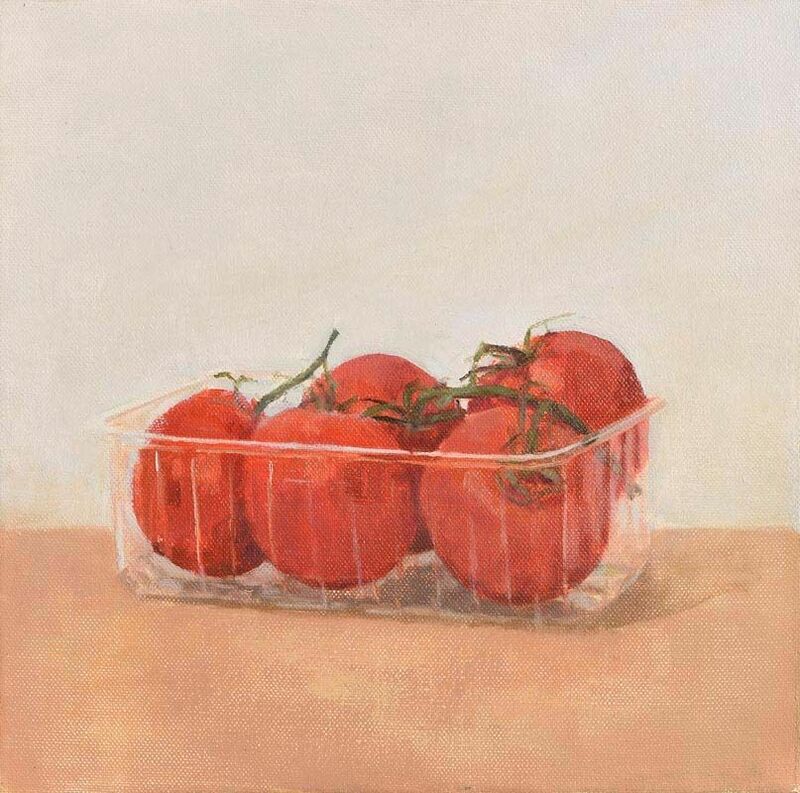 Left to right: “Still Life – Tomatoes” 2006, oil on canvas (12″ x 12″), sold at Morgan O’Driscoll’s – 19/6/2017 for €550.00; and “Three Leeks” oil on board (10.5″ x 12.5″), sold at Morgan O’Driscoll’s – 3/12/2018 for €360.00. 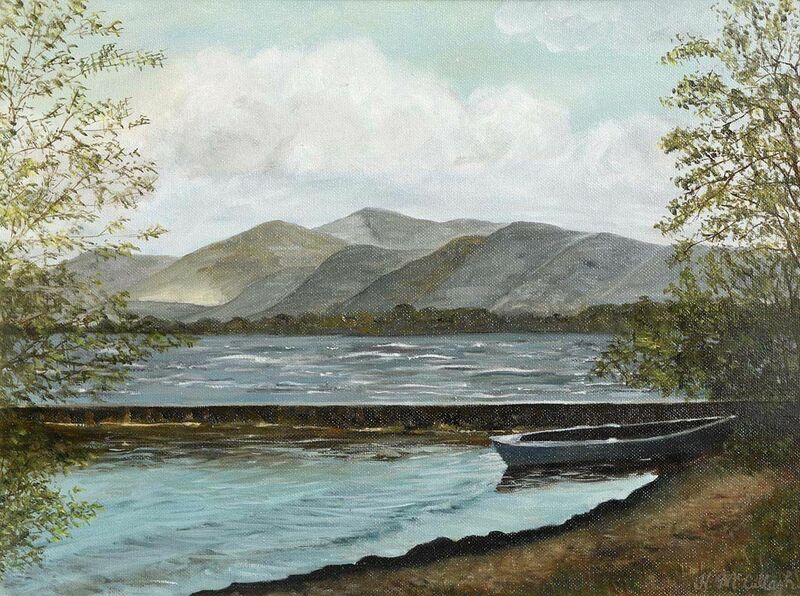 “The Lake Shore, Killarney, Co.Kerry” (2003) oil on board sold at Whytes 30/5/16 – €1,500. 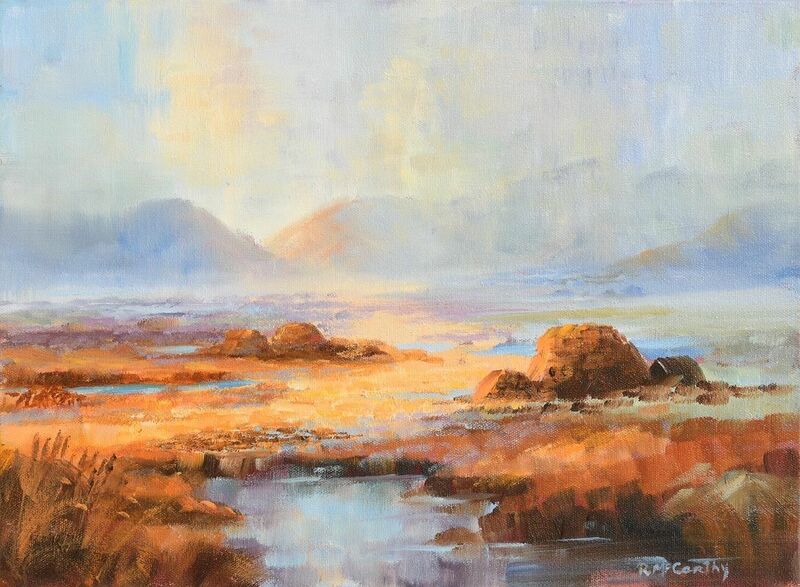 “Connemara Landscape” oil on canvas (12″ x 16″), sold at Morgan O’Driscoll’s – 19/3/2019 for €200.00. “The Mournes & Dundrum” oil on board (9″ x 12″). 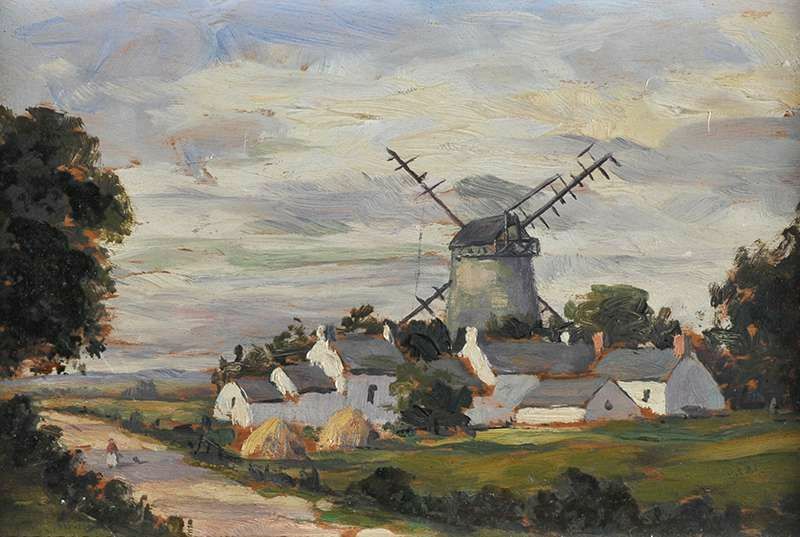 “Old Windmill near Millisle” oil on board (5″ x 8″), sold at Ross’s – 25/3/2015 for £80. 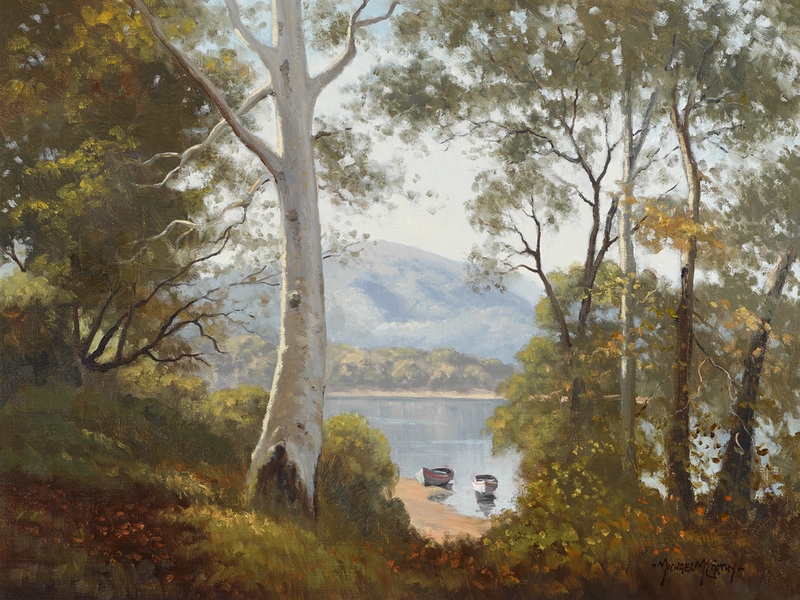 Born in Omagh, County Tyrone the artist now lives and works in Australia. 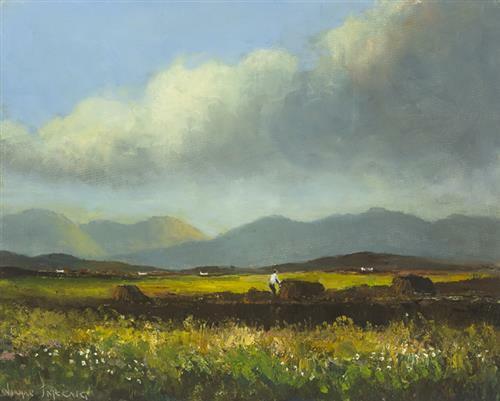 Padraig McCaul was born in Dublin and is a self-taught artist who works primarily in oils, using brushes and palette knives in strong, sweeping lines. 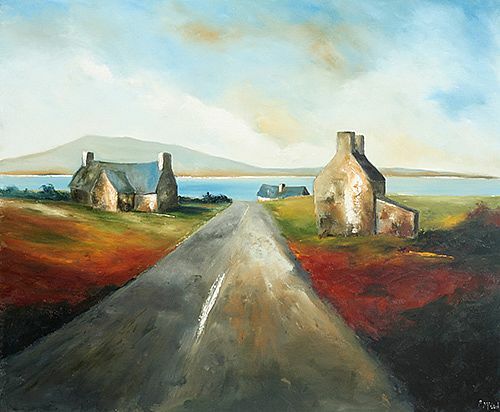 Left to right: “To the Ocean” oil on canvas (39″ x 47″) available for €3,800 from www.thedoorwaygallery.com and “Farmhouse over the Kenmare River” dated 2008, oil on canvas (16″ x 20″), sold at Morgan O’Driscoll’s – 18/9/2017 for €1,100. 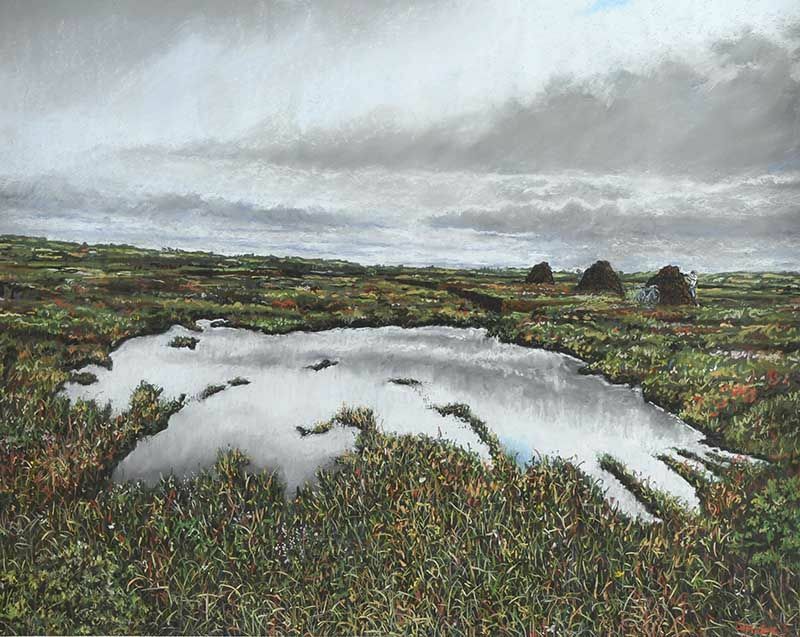 Left to right: “Boglands, Donegal” (6″ x 8″) acrylic on board. Sold Ross’s 20/4/2016 – £90.00 and “Ardgroom, Cork” (6″ x 8″) acrylic on board unsold in the same sale. 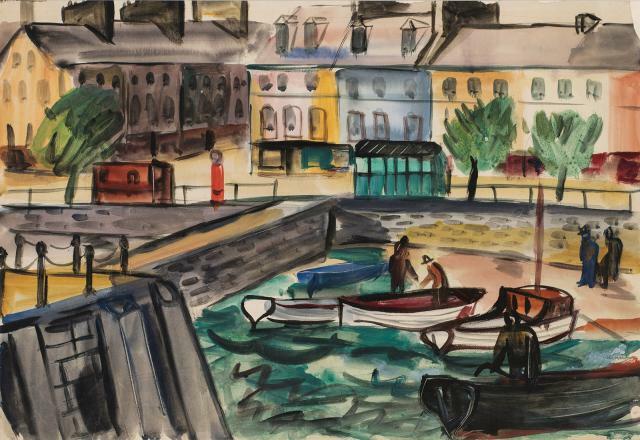 “Portrush Harbour” watercolour drawing (10″ x 21″), sold Ross’s 31/5/2017 – £80.00. “Cottages on the Coast” oil on board (18″ x 24″), sold at Ross’s – 23/5/2018 for £30.00. “Italian Landscape” oil on board (12″ x 16″), unsold at Gormley’s – 13/3/2018. “The Poacher” oil on canvas (12″ x 16″). 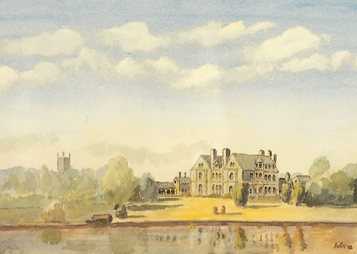 Exhibited RHA, 1862. 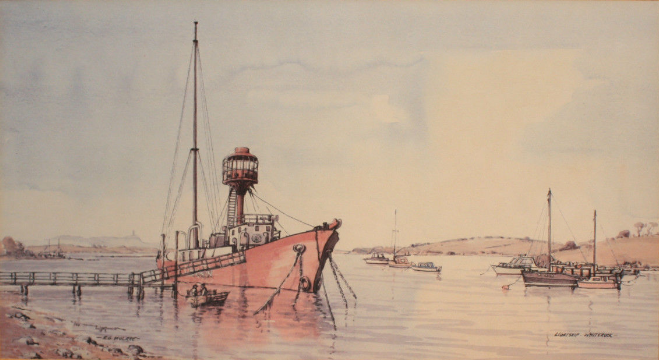 I am a self-taught artist whose career background was as a Merchant Navy Deck Officer followed by 30 years in Aviation. Now retired and living in Carrickfergus, County Antrim. 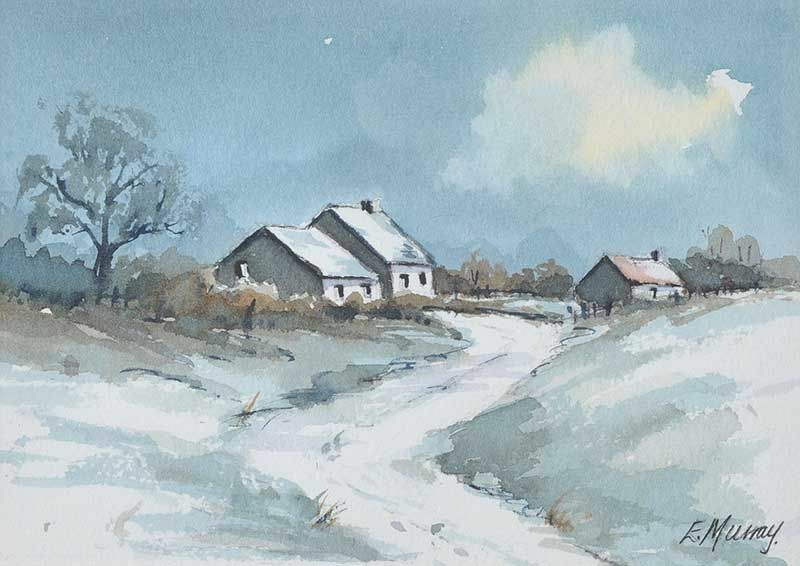 I commenced serious painting in the 1980s using watercolour as the preferred medium. 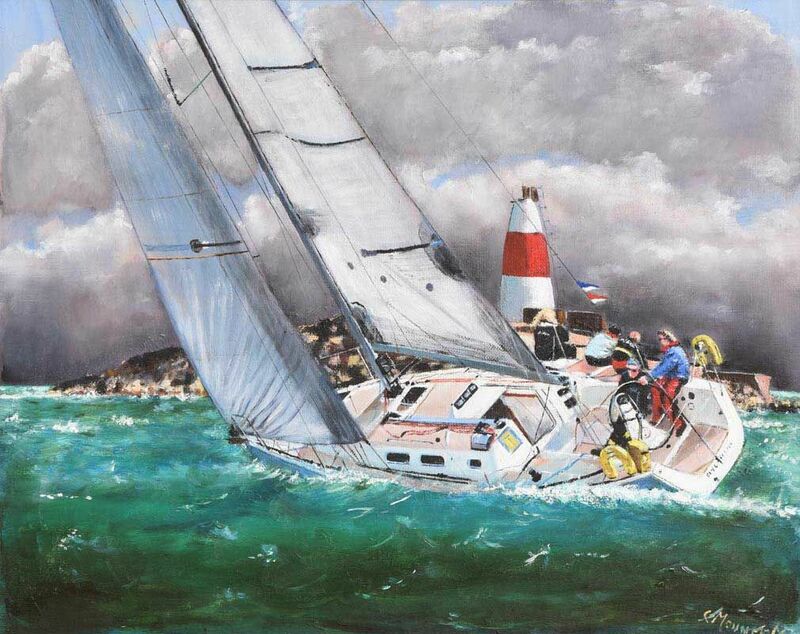 In the mid-1990s, I transferred to oils and have met with success specialising in Marine art with many sales worldwide including commission work. Coupled with my Marine work I have also enjoyed success with local subject landscape oil paintings, again including commissions. 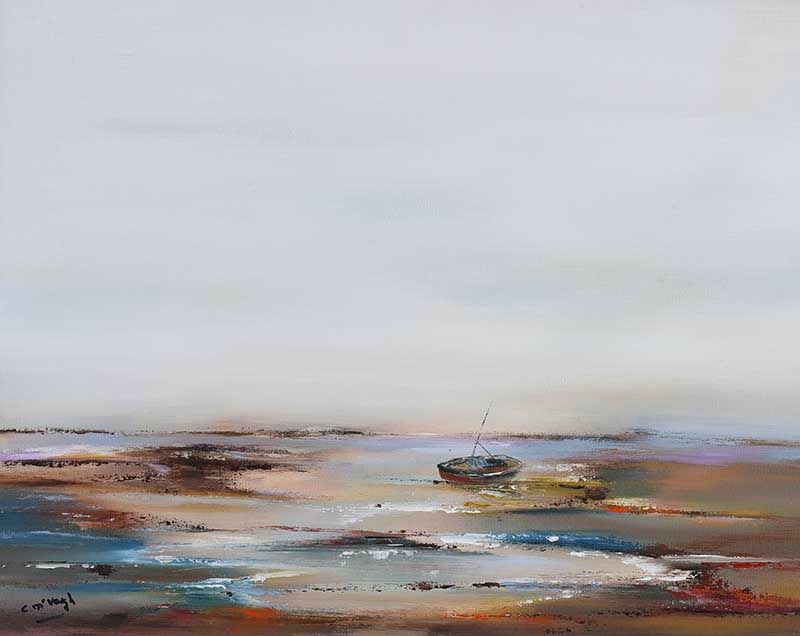 I am available for commission work relating to Marine and Landscape subjects. 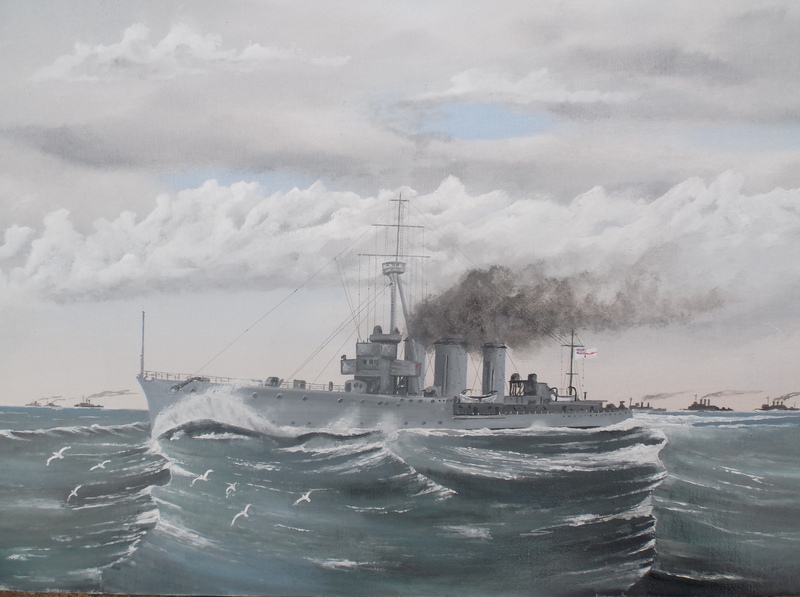 “HMS Caroline” oil on canvas board (16″ x 20″). HMS Caroline was a Light Cruiser built 1914 and served with distinction at the 1916 Battle of Jutland. She is the last surviving floating vessel from that Battle. Presently she is a museum ship moored in Belfast following extensive refurbishment. Left to right: ‘Quiet Anchorage‘ (14″ x 18″) oil on canvas board, and the ‘Floral Hall‘ on Cave Hill, Belfast in happier times. There’s a campaign to save and restore the Floral Hall which is currently an eyesore in the middle of Belfast Zoo. “The Dark Hedges” – situated near Stranocum, County Antrim the Dark Hedges are included in a list of the 12 best road trips in the UK and Ireland. Planted over two hundred years ago they have become one of the most photographed natural phenomena in Northern Ireland, and in recent years they have been used as a film location for the epic TV series ‘Game of Thrones‘. Click here www.yessy.com/ronniemcclune for a selection of the artist’s paintings for sale. 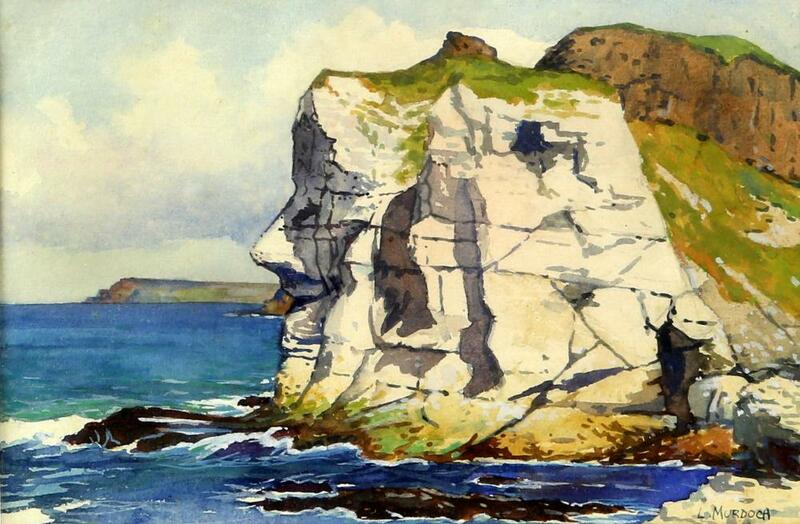 Born in Howth, Co. Dublin, George McConkey’s family have lived in Howth for four generations. His father was connected with the local RNLI Lifeboat and when George reached 17 years’ of age he also joined the crew of the Lifeboat and took part in many rescues, including one when the crew were awarded medals for a very dangerous rescue. At an early age, he began to draw and with the encouragement of another artist, he attended the National College of Art in Dublin. 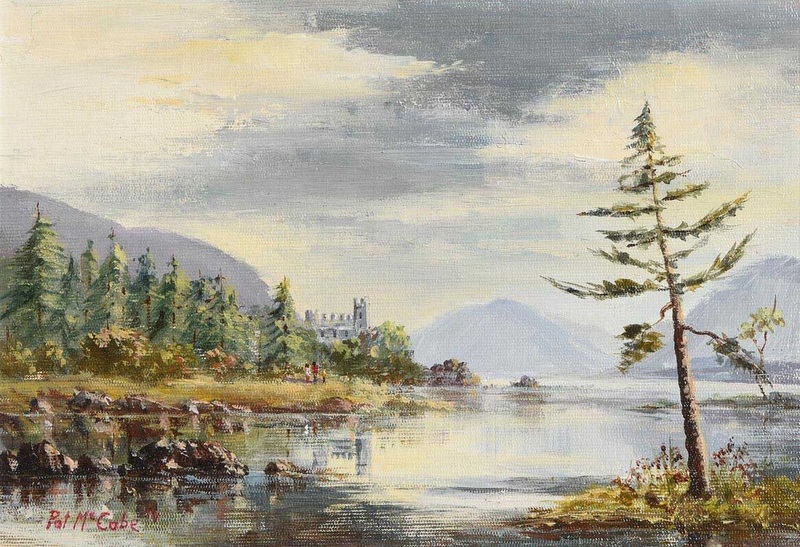 He then went on to paint in oils and when his father died he decided to become a full-time artist. 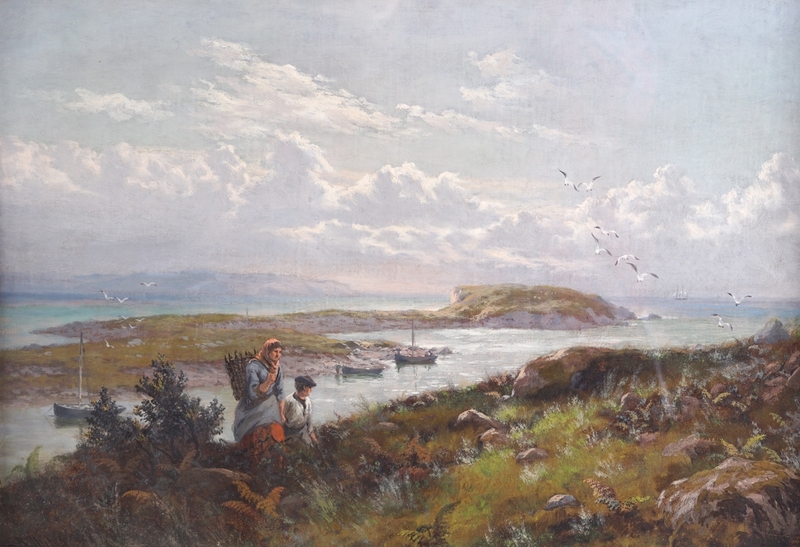 With the aid of his wife Phyllis he eventually opened his own Gallery in Howth. 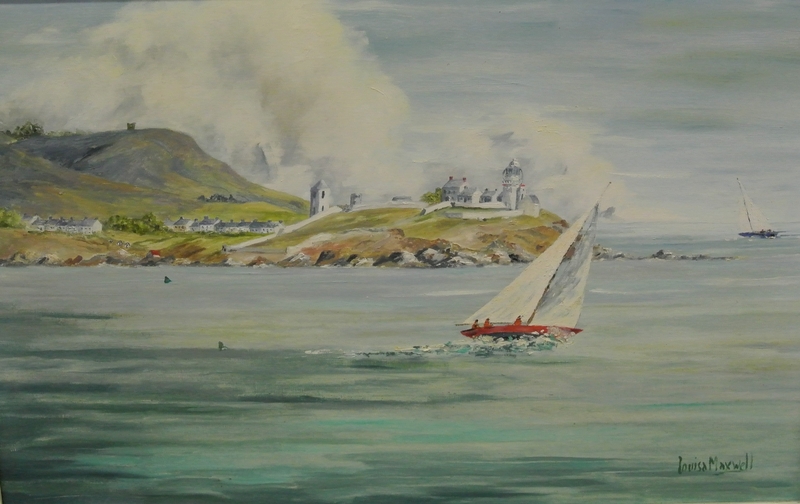 “Sailing Yacht off Howth, c.1984“, oil on board. “View over Howth Harbour” oil on board (14″ x 18″). 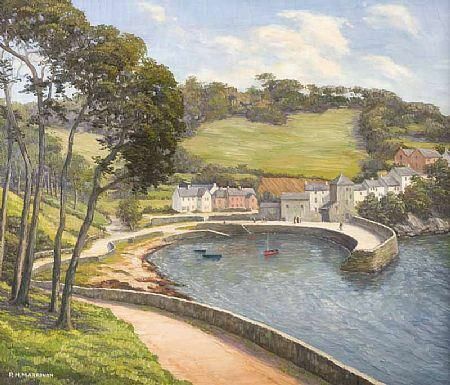 “Harbour at Dunseverick, Antrim” oil on canvas (15″ x 31″). 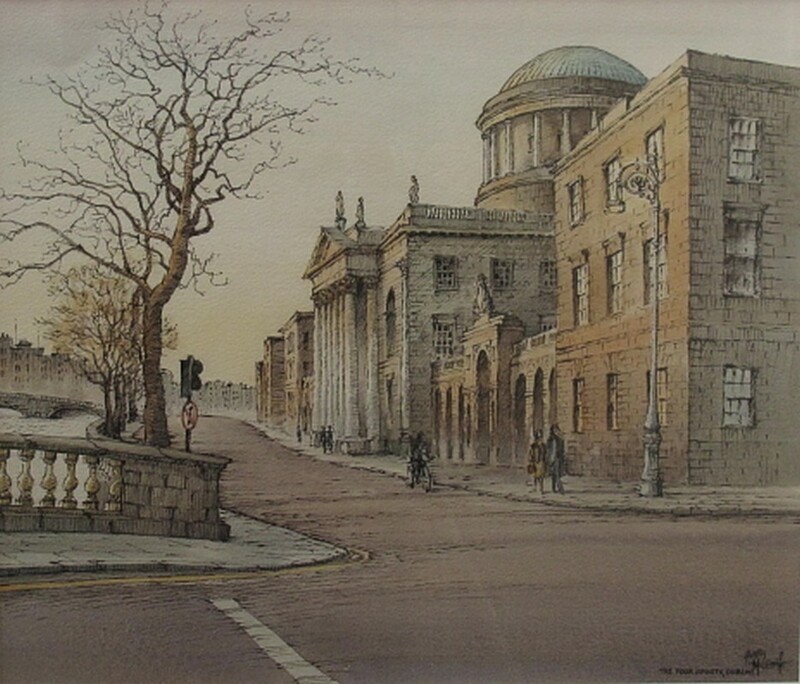 “The Four Courts” watercolour and ink (13″ x 15.5″). Some more bio and images shortly – I hope. Born in Coleraine, Co. Derry, educated there and at College of Design, Belfast. 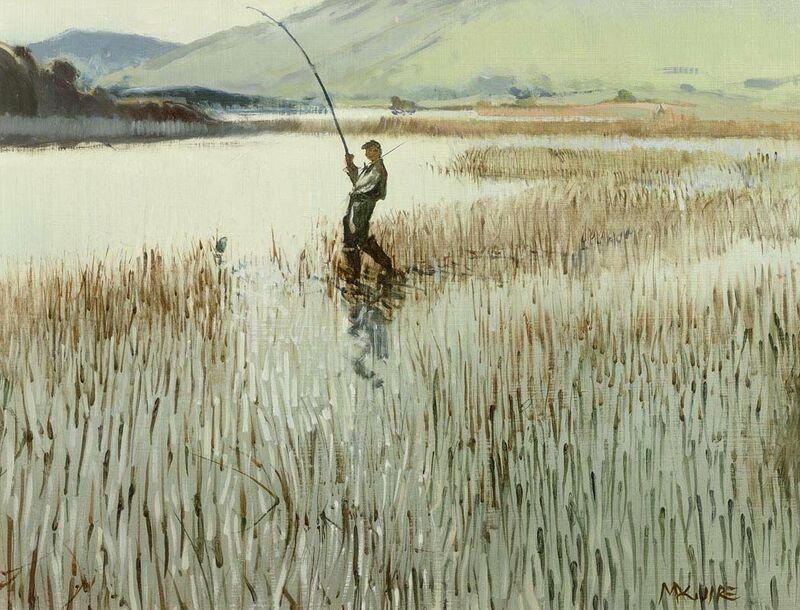 He exhibited at the RA from 1889, having moved to London in 1883. 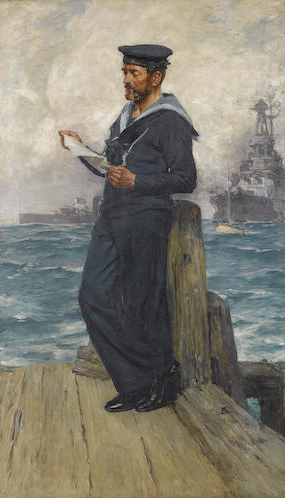 “A sailor from HMS Invincible” oil on canvas (69″ x 40″) sold at Bonham’s – 11/9/2007 for £18,000 including buyer’s premium. 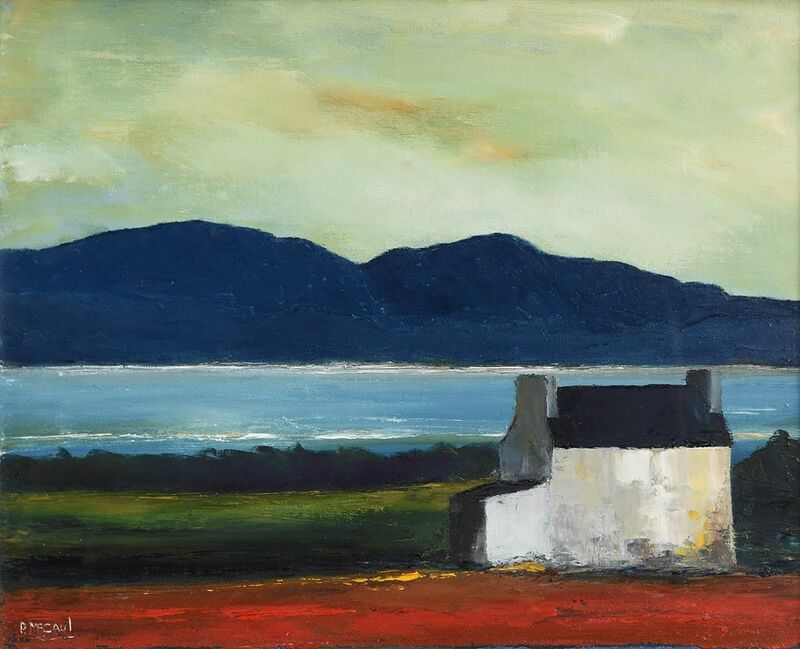 “Landscape” dated 1993, oil on board (9″ x 16.5″), sold at Morgan O’Driscoll’s – 14/8/2018 for €200.00. 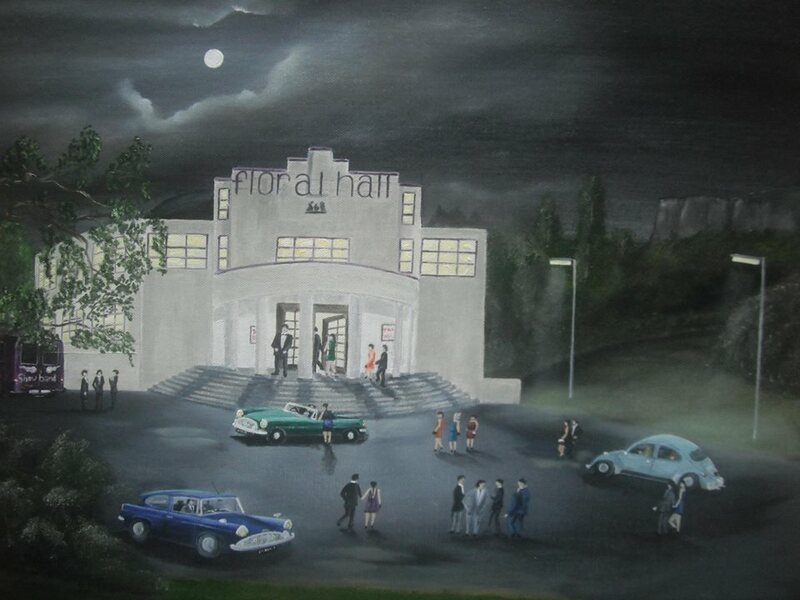 A self-taught artist from Belfast, Co. Antrim. 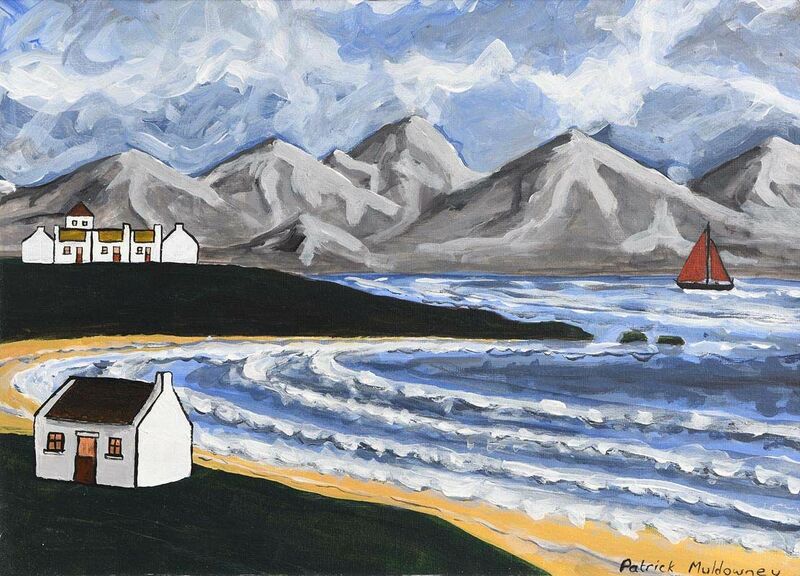 Belfast born painter and potter. 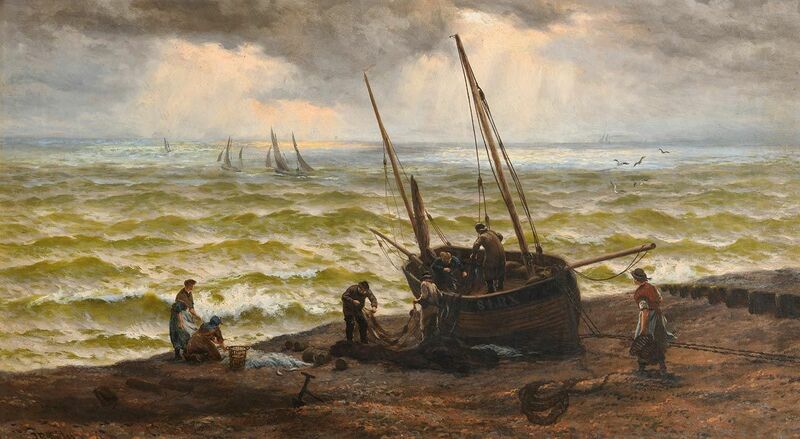 “A Fisherman mending nets” oil on board (20.5″ x 26.5″), sold at Rosebery’s (London) – 19/3/2013 for £420.00. 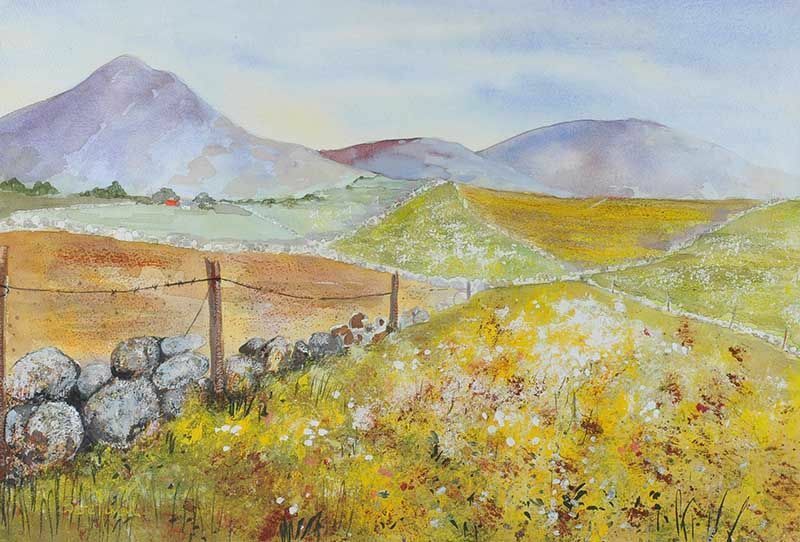 Anne Mc Crudden is based in Rush, Co. Dublin. 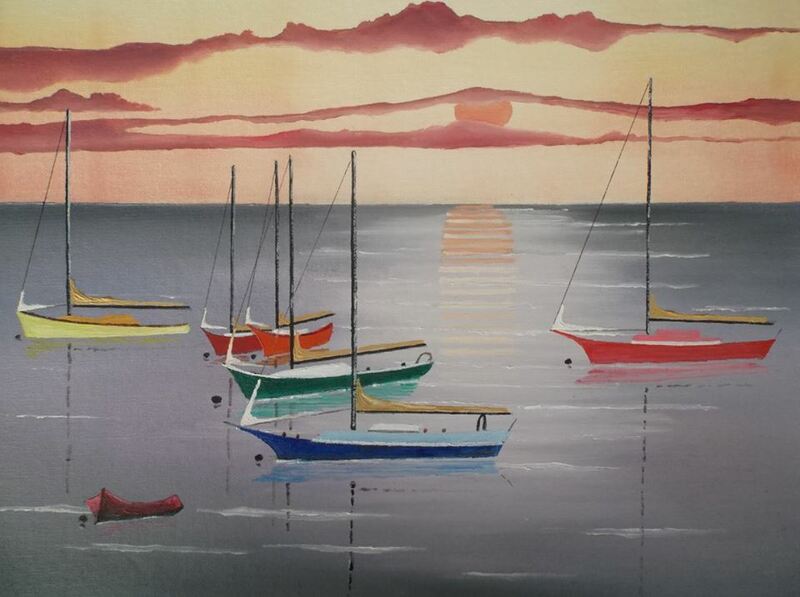 Her art is inspired by local seascapes, landscapes, beaches and skies. 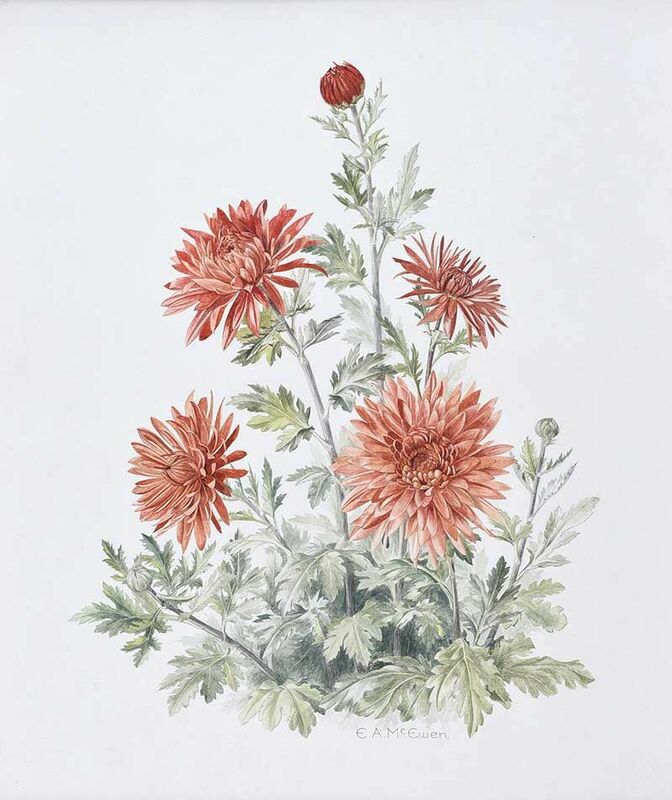 Her love of flowers has also inspired many of her paintings. “A view from Killarney Golf Club” oil on canvas board (12″ x 16″), sold at Morgan O’Driscoll’s – 14/8/2017 for €100.00. 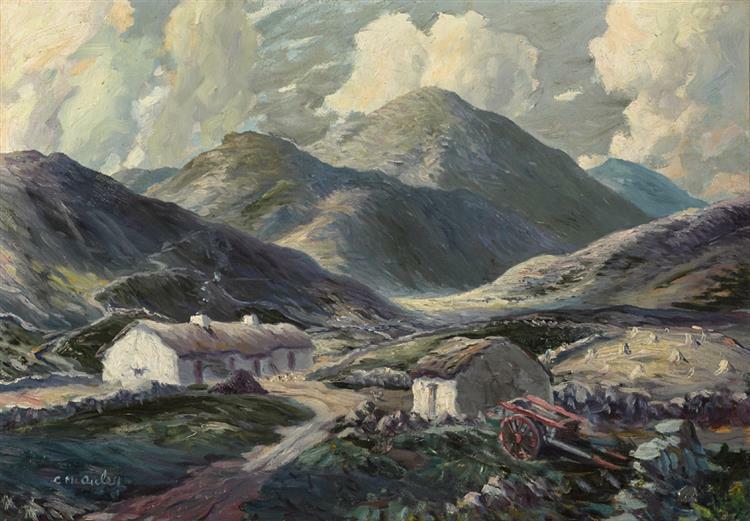 “Near the Gap of Dunloe” oil on canvas (20″ x 28″), sold at Ross’s – 21/2/2018 for £100.00. 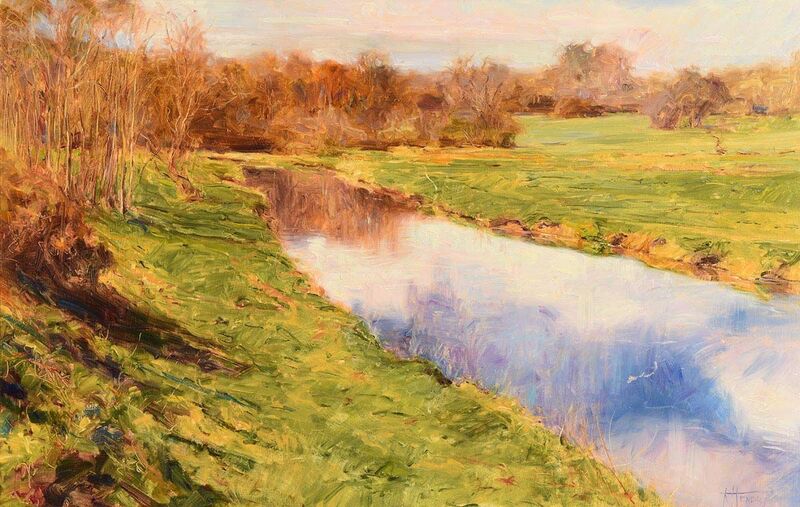 “River Roe” oil on canvas (16.5″ x 20.5″) – © V.M. McCurry. Causeway Coast and Glens Borough Council. 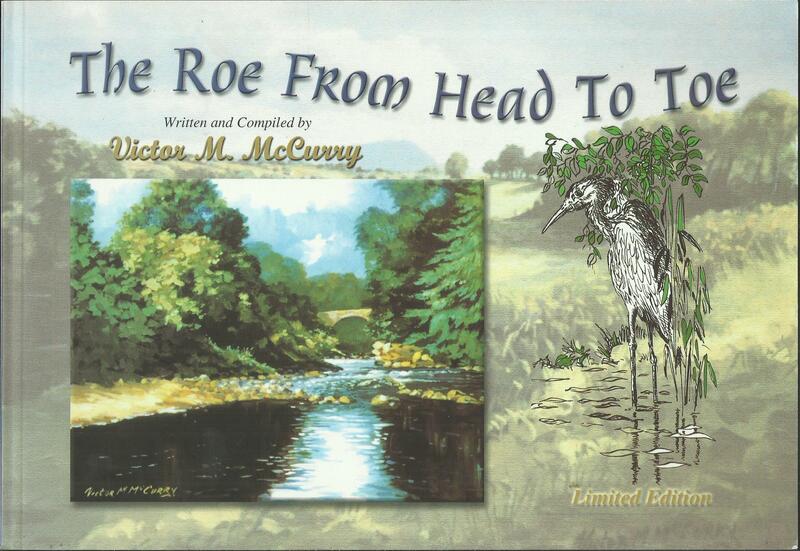 “The Roe from Head to Toe” (2000) self-published by the artist. 113 pages including 60 illustrations by the author, 30 of which are in colour. 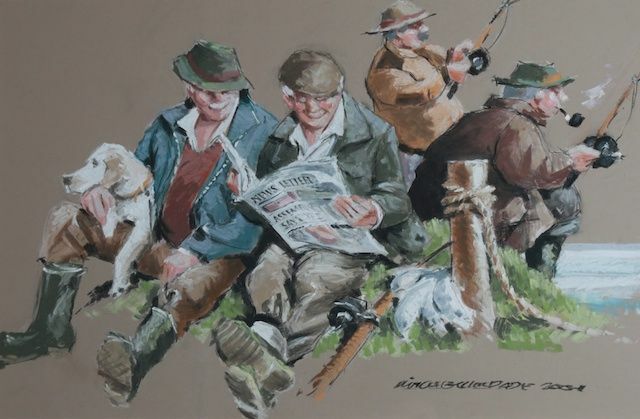 “Fishing” pastel on paper (16″ x 25″) sold at Ross’s – 7/11/2013 for £100.00. 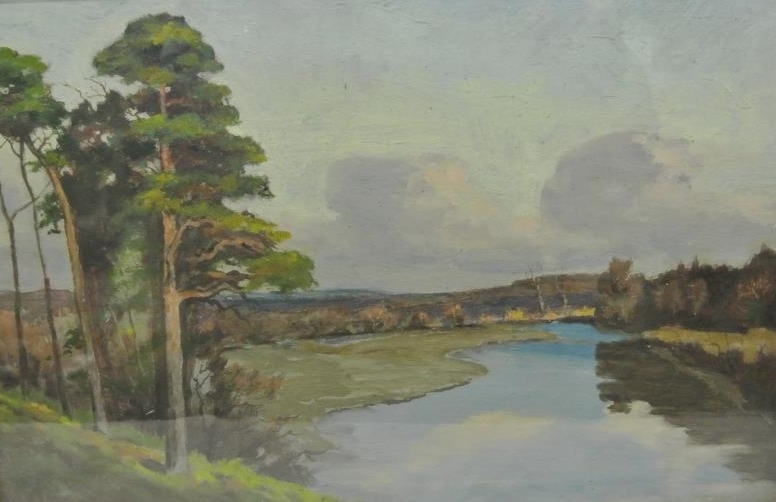 “Lough Erne” oil on board (10″ x 12″), sold at Ross’s – 5/10/2016 for £30.00. 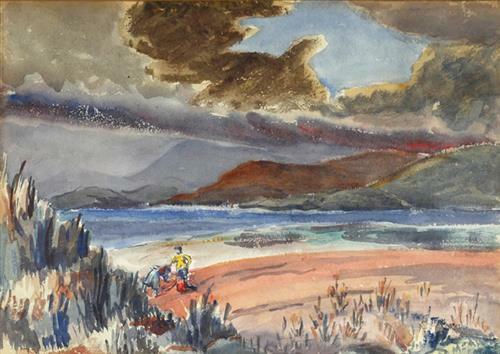 Born in Sligo, Bernard McDonagh was a landscape painter who worked predominantly in watercolour and oils. 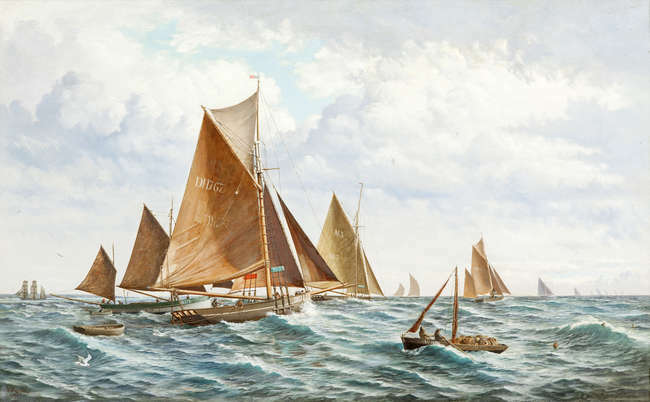 Left to right: “Setting Sail” oil on board (16″ x 20″), sold at Morgan O’Driscoll’s – 13/3/2017 for €50.00; and “Seascape” oil on board (16″ x 20″), sold at Morgan O’Driscoll’s – 22/5/2017 for €40.00. Left to right: “Cattle Amongst Pink Roofs” oil on canvas (31.5″ x 35.5″) and “Home Alone” oil on canvas (16.5″ x 22″). 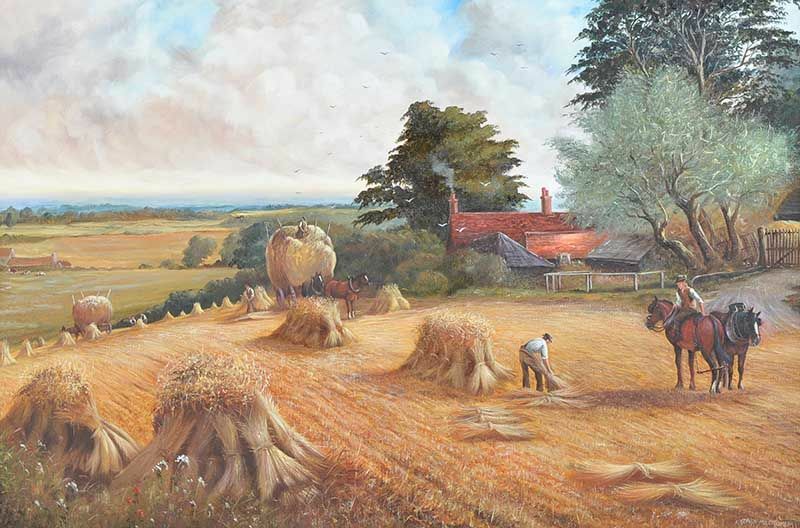 “Haymaking” oil on canvas (23.5″ x 47″). Left to right: “Row On, Roundstone Harbour, County Galway” oil on canvas (19.5″ x 23.5″), sold at Whyte’s – 17/7/2017 for €900.00; and “Early Morning, Roundstone, County Galway” oil on canvas (32″ x 34″), sold at Whyte’s – 4/3/2019 for €1,700. 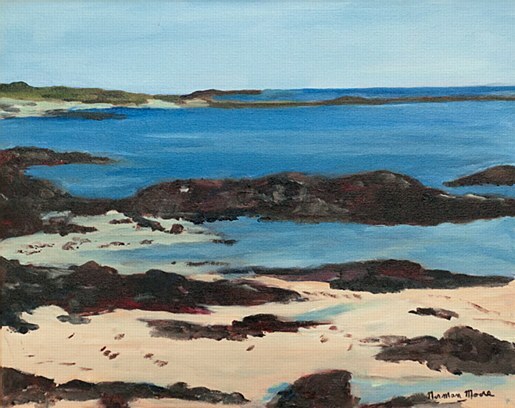 “Portrush, East Strand” oil on canvas (20″ x 40″), unsold at Ross’s – 6/12/2017. 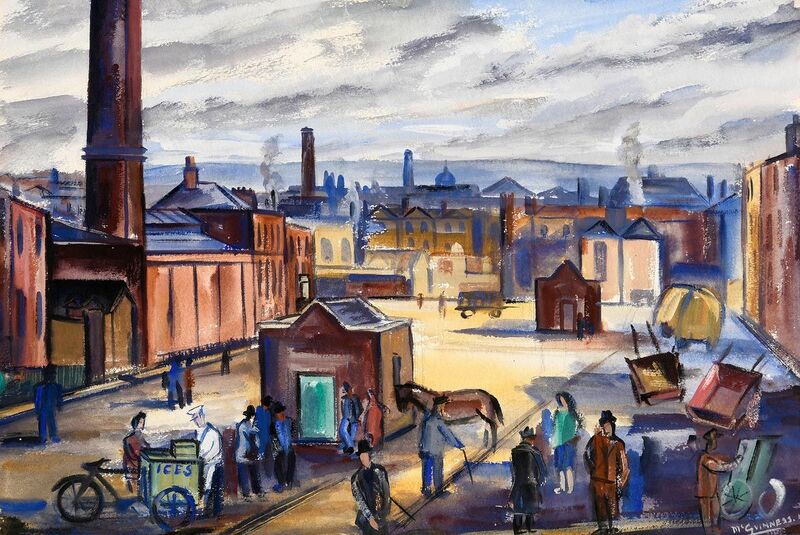 “Belfast Docks” pastel on paper (19″ x 25″). Unsold at Ross’s – 10/8/2016. 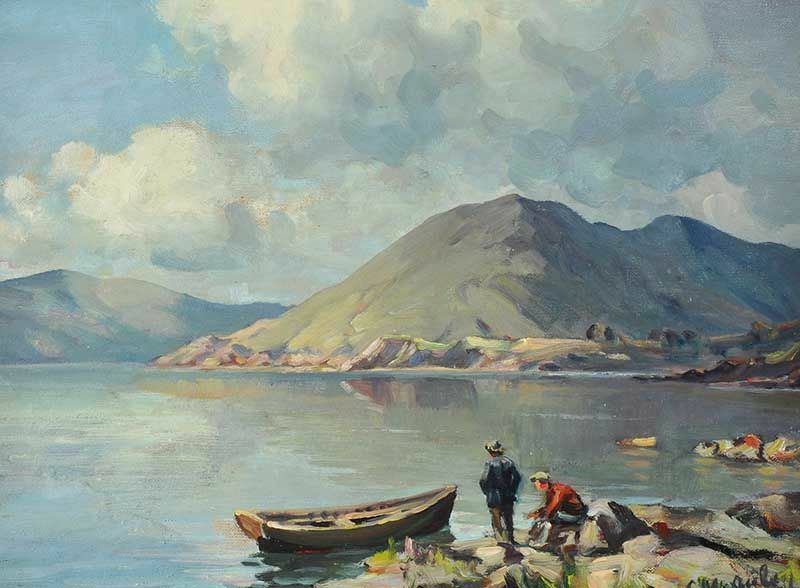 “Bantry Bay” oil on board (18″ x 24″), sold at Morgan O’Driscoll’s – 6/11/2017 for €90.00. 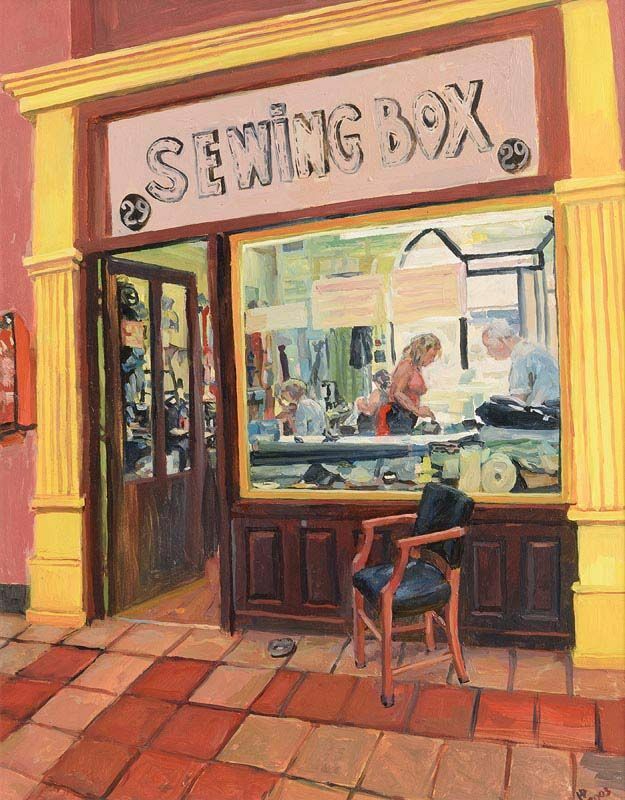 “The Sewing Box” dated 2003, oil on board (14″ x 11″), sold at Morgan O’Driscoll’s (RDS) – 10/4/2017 for €1,800. 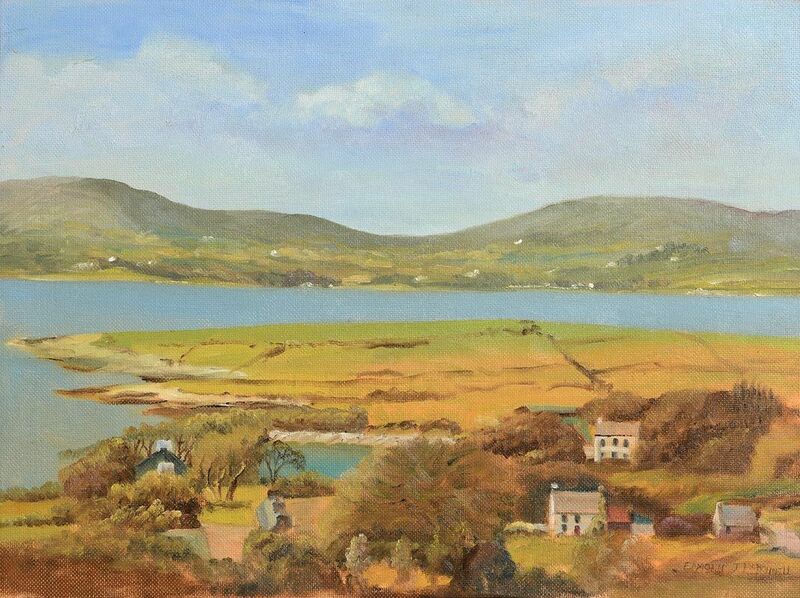 “West Cork” oil on board (12″ x 17.5″) sold at Woodward’s – 24/2/2018 for €110.00. 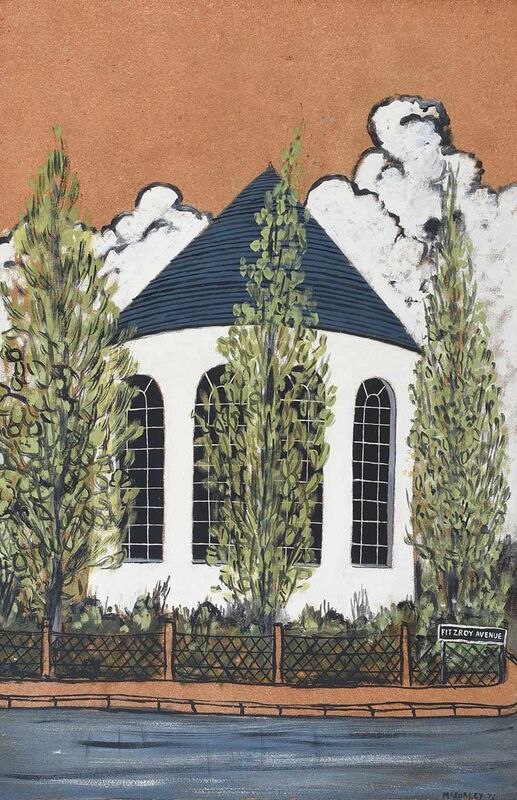 David McDowell graduated from the University of Ulster with a degree in Fine & Applied Art and is known for his figurative work. He now lives and works in Liverpool. 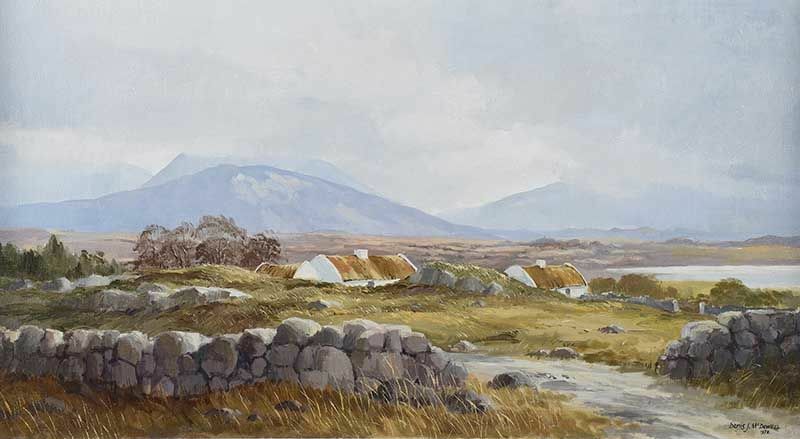 “Near Tullycross, Connemara” oil on canvas (20″ x 36″), sold at Ross’s – 21/3/2018 for £420.00. 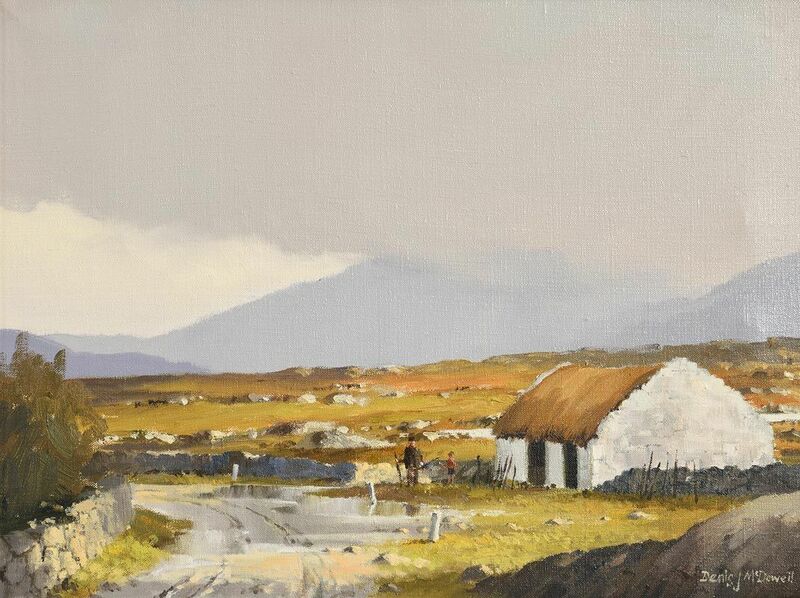 “Flooded Road, Ballynakill, Connemara” oil on canvas (12″ x 16″), unsold at Morgan O’Driscoll’s – 28/1/2019. Master Designer at Arklow Pottery. 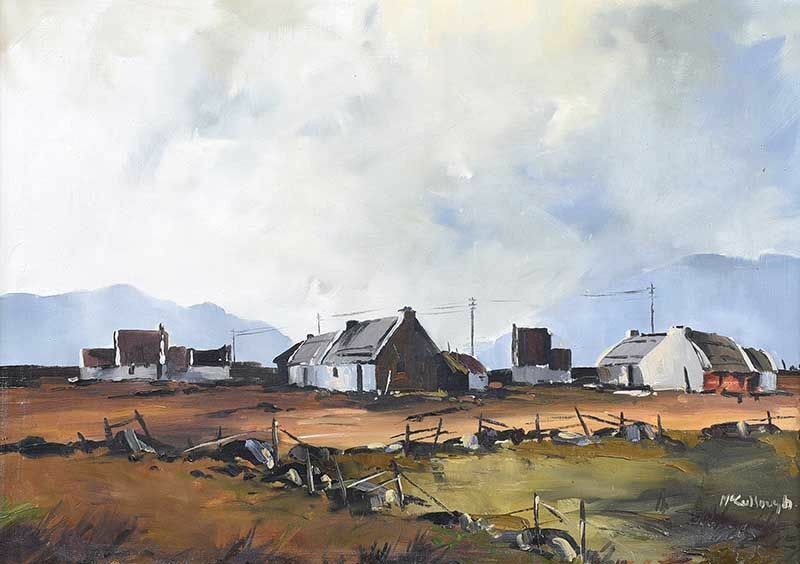 Contemporary Scene in Kinnegad, oil on canvas (20″ x 24″). 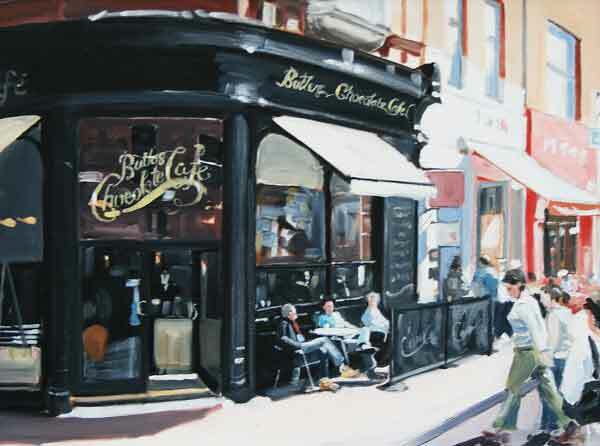 “Butlers Cafe Chocolate Dublin” oil on canvas (18″ x 24″), sold at Morgan O’Driscoll’s – 21/1/2019 for €360.00. 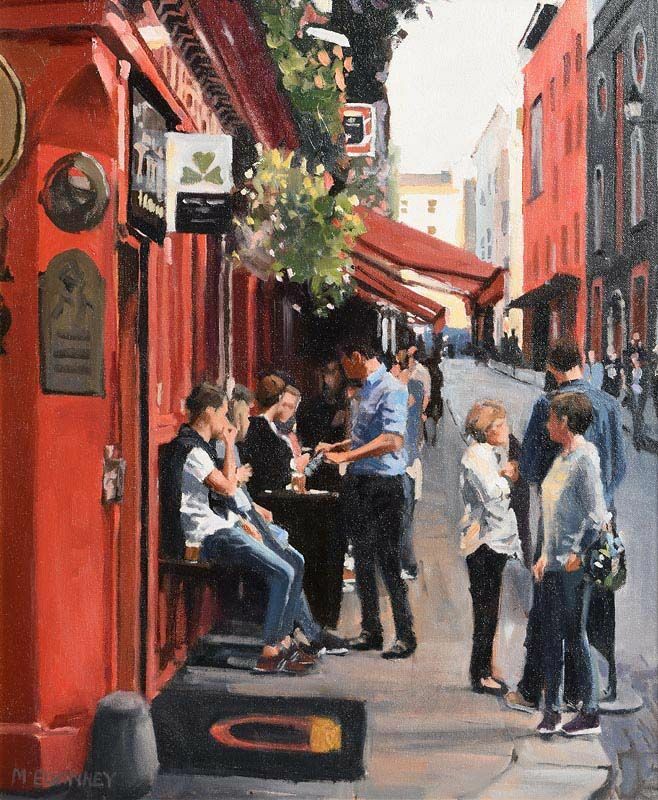 “Temple Bar Corner” oil on canvas (24″ x 20″), sold at Morgan O’Driscoll’s – 23/1/2017 for €440.00. 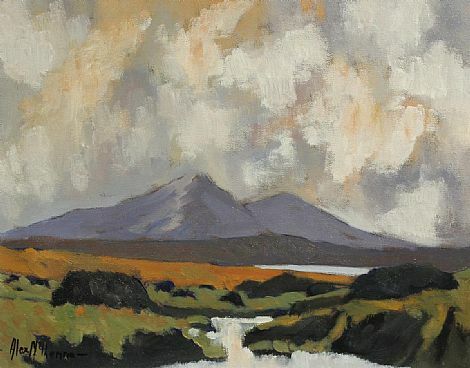 “Connemara Lough” oil on canvas (20″ x 28″), unsold at Ross’s – 8/8/2018. “September Evening, Seapoint, Co.Dublin” dated 2006, oil on board (12″ x 15″), unsold at Whyte’s Online sale – 24/10/2016. 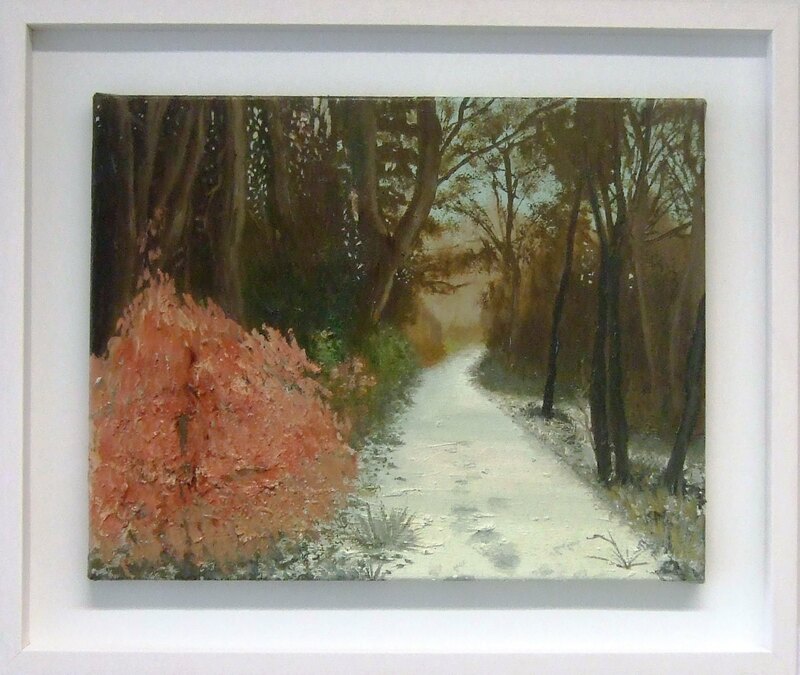 Left to right: “Flower Garden” oil on board (5″ x 10″), sold at de Vere’s – 18/7/2018 for €195.00; and “The Canal looking towards Rathmines, Dublin” oil on board (16″ x 24″), sold at Whyte’s Online Sale – 24/10/2016 for €800.00. 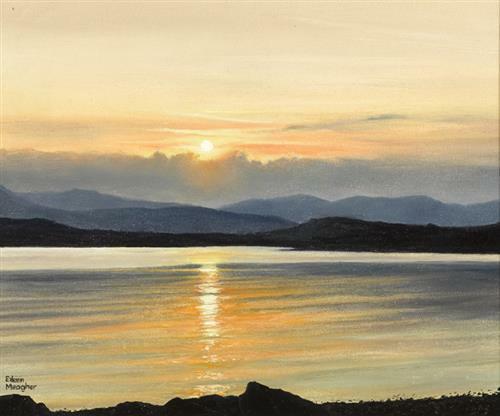 “Evening Light, Scotsman’s Bay” oil on board (19.5″ x 23.5″), sold at James Adam’s – 30/5/2018 for €1,800. 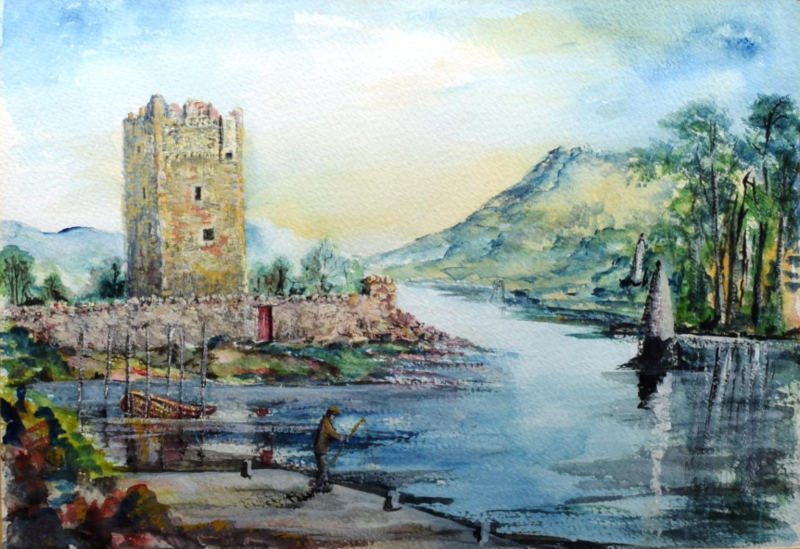 Member of the Rostrevor Art Group. “Cattle in a Wooded River Landscape” oil on canvas (7″ x 15″), unsold at Adam’s – 28/9/2016. 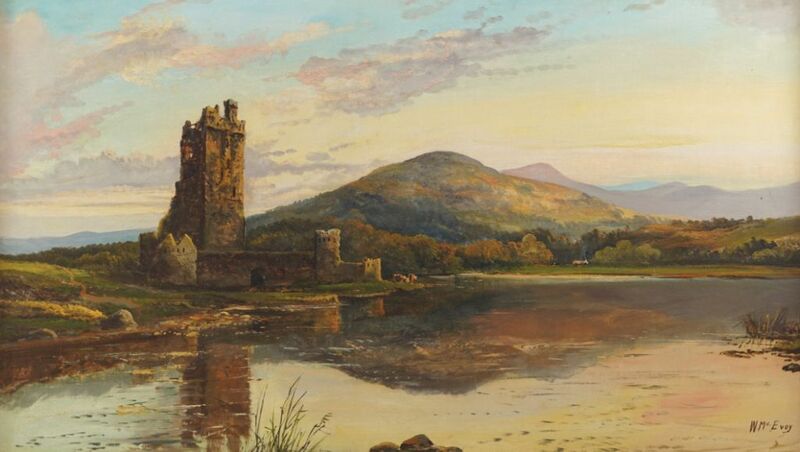 “Ross Castle, Killarney” oil on canvas (24″ x 42″), sold at Sheppards – 1/12/2016 for €2,100.00. 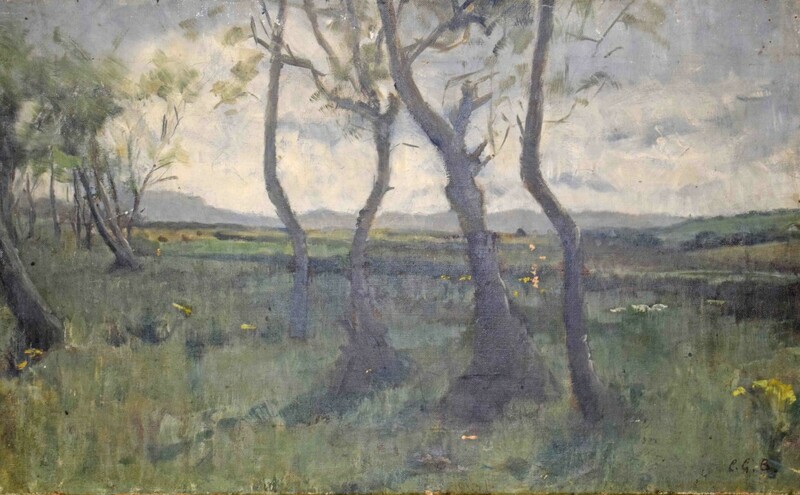 “…scene near Wicklow” – part description missing from the label – oil on canvas (8″ x 16″), sold at Morgan O’Driscoll’s – 2/7/2018 for €320.00. 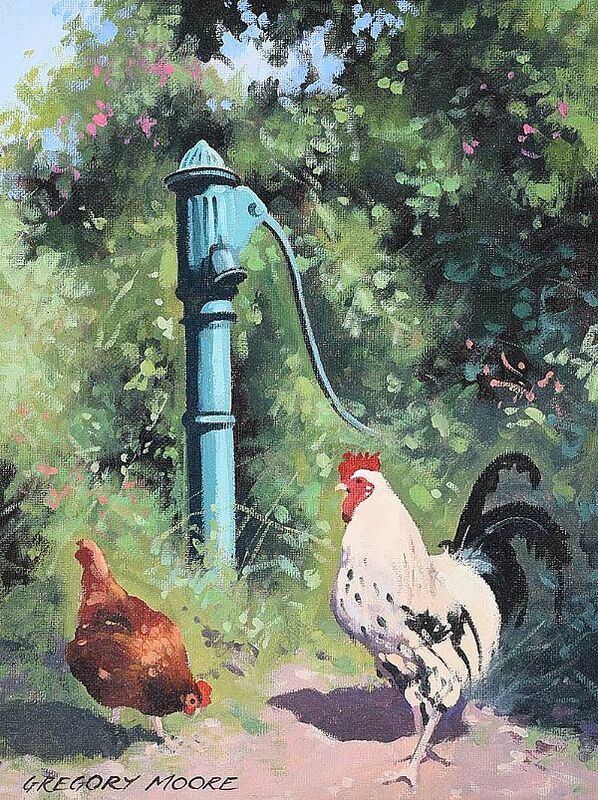 “The Old Hen House” watercolour drawing (15″ x 12″), unsold at Ross’s -7/5/2014. Left to right: “Still Life, Flowers” watercolour drawing (14″ x 11.5″), sold at Ross’s for £20 – 11/10/2017 and “Still Life, Flowers” watercolour drawing (14.5″ x 11.5″), sold at Ross’s for £10 – 11/10/2017; and “Convolvulus” watercolour drawing (11″ x 7″), sold at Ross’s – 8/8/2018 for £40. 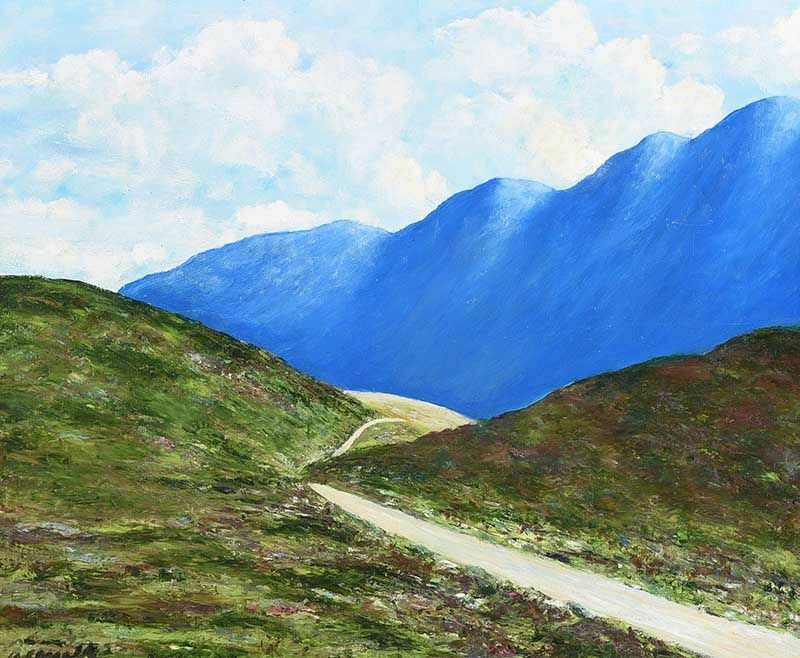 “Mountain Landscape near Sneem, Co. Kerry” oil on canvas (35″ x 39″), sold at Adam’s – 16/12/2014 for €1,300. 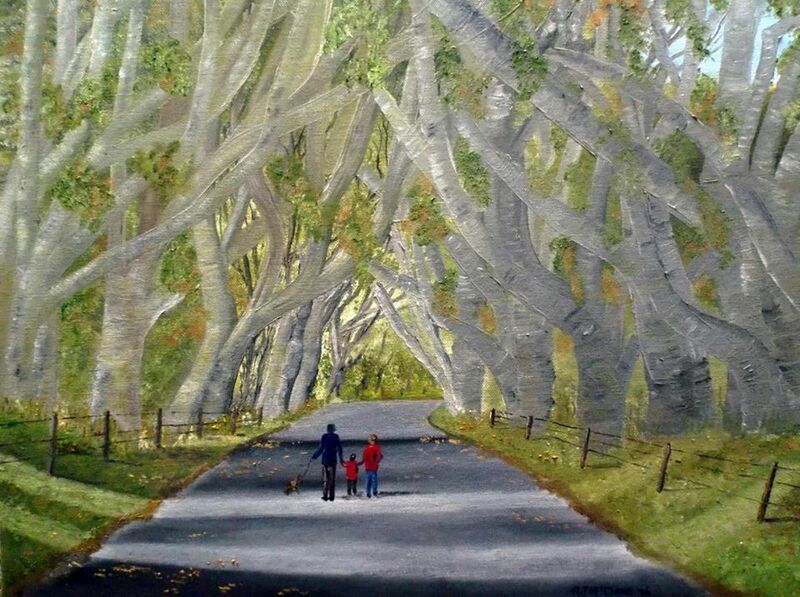 Galway born artist now living and working in the US. “Irish Landscape” oil on board (8″ x 10″), unsold at Gormley’s – 11/9/2018. “Trees by the Lough” oil on canvas (16″ x 20″), sold at Ross’s – 1/3/2017 for £40. “On the Lake” oil on canvas (16″ x 20″). 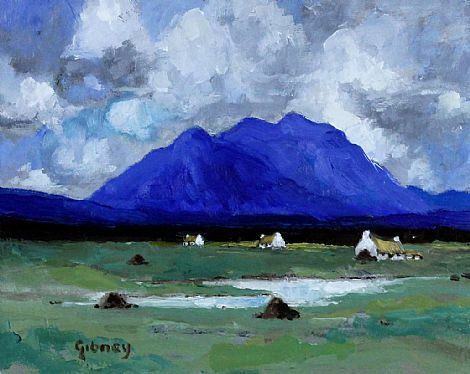 “In Connemara” oil on panel (12″ x 16″) sold at Christies, London – 19/5/2000 for £4,465. 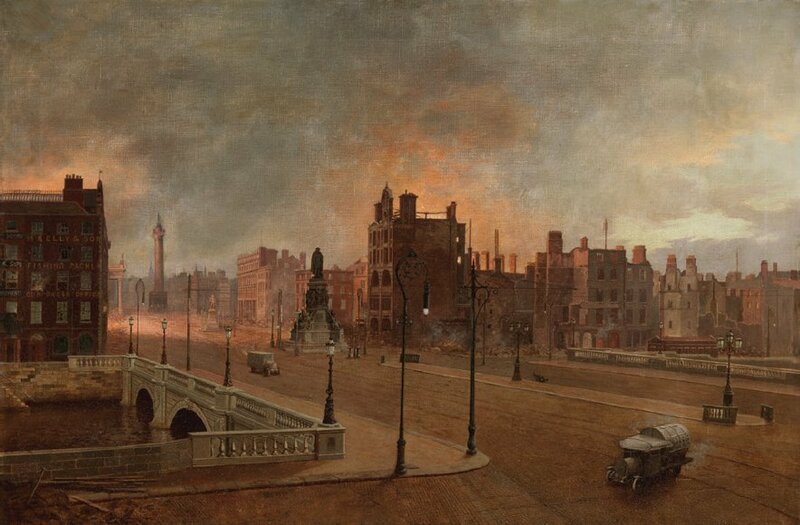 “After the Bombardment, 1916” oil on canvas (19.5″ x 27.5″) – National Gallery of Ireland. Kelly’s gunpowder shop on the corner of Sackville Street and Bachelor’s Walk was one of the several premises on Dublin’s main thoroughfare commandeered by the Volunteers on Easter Monday 1916. Holed up there were members of the so-called ‘Kimmage Garrison’ and the Fingal Battalion. The initial assault on the building, known among the Volunteers as ‘Fort Kelly’, began early on Wednesday 26 April. By the end of the week, Kelly’s had been reduced to a shell, and only the facades of many other buildings remained. In McGoogan’s painting, snipers on the second floor of Kelly’s exchange fire with soldiers in improvised armoured cars (the first vehicles of their kind ever used in combat). 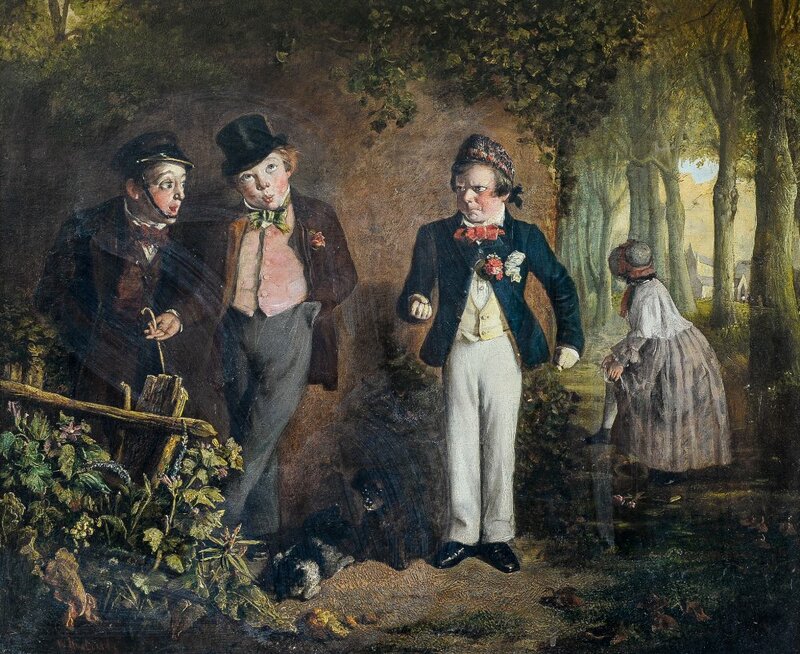 The painting seems at first glance otherwise uninhabited. A closer investigation, however, reveals a body lying on O’Connell Bridge, a grim acknowledgement of the human cost of the conflict. 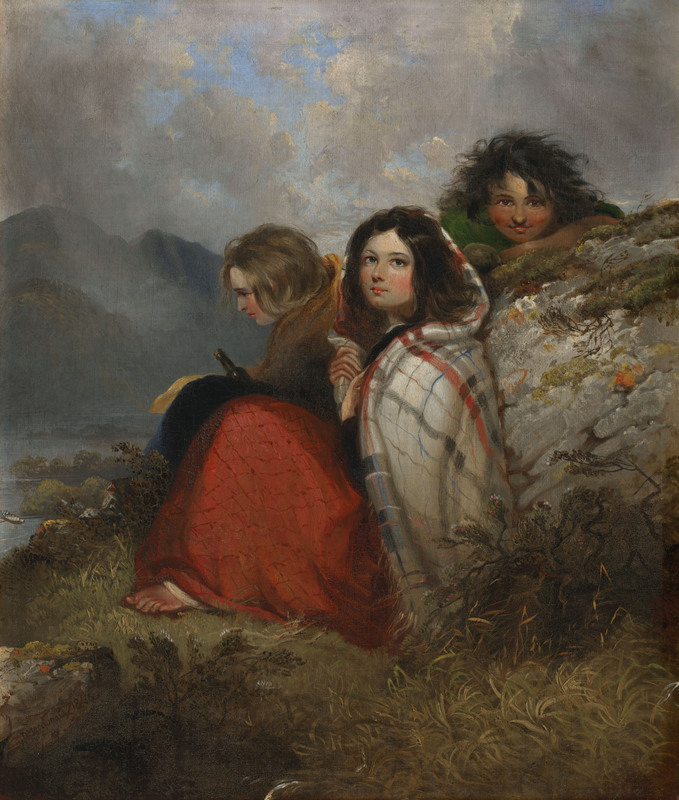 – National Gallery of Ireland. 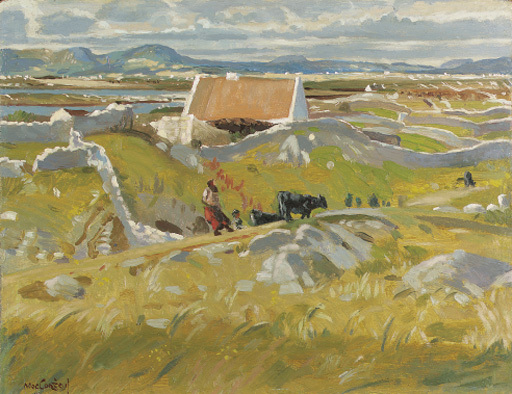 “The Peat Gatherers, Co.Galway” oil on board (22″ x 36″), sold at Morgan O’Driscoll’s – 24/10/2016 for €380.00. 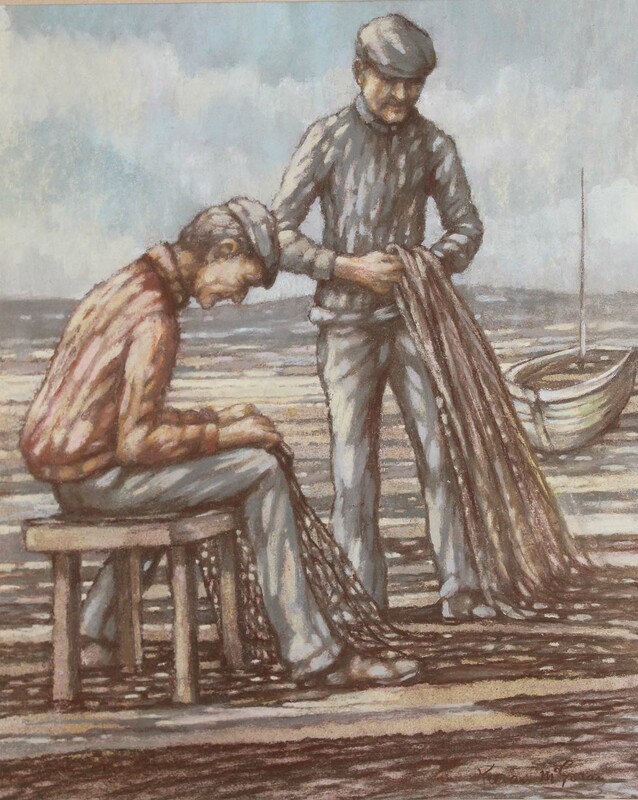 “Mending the Nets” crayon (18″ x 15″), unsold at de Vere’s – 12/6/2018. “Lagan Canal, Belfast” watercolour drawing (10″ x 14″), unsold at Ross’s – 5/10/2016. Left to right: “The Coppersmith, Moynalty” oil on board (24″ x 12″) sold at Adams – 16/12/2014 for €280.00; and “Winter Farmstead” oil on board (18″ x 24″) unsold at Morgan O’Driscoll’s 2/8/2016. “Lazy afternoon, Tullynally, Co.Westmeath” dated 2007, oil on board (10″ x 12″), unsold at Whyte’s – 23/10/2017. 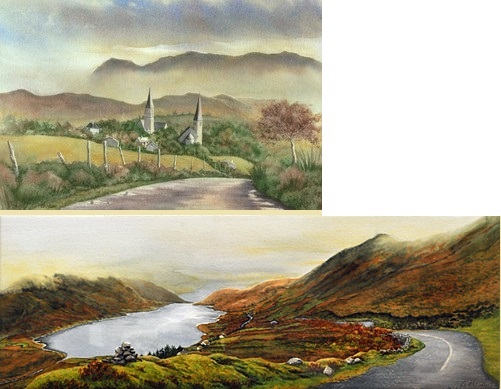 Left to right: “Doorly Park, Sligo“; and “Streedagh, Co.Sligo” both oil on canvas. “The Road to the West” oil on board (19″ x 23″), sold at Ross’s – 20/6/2018 for £20.00. 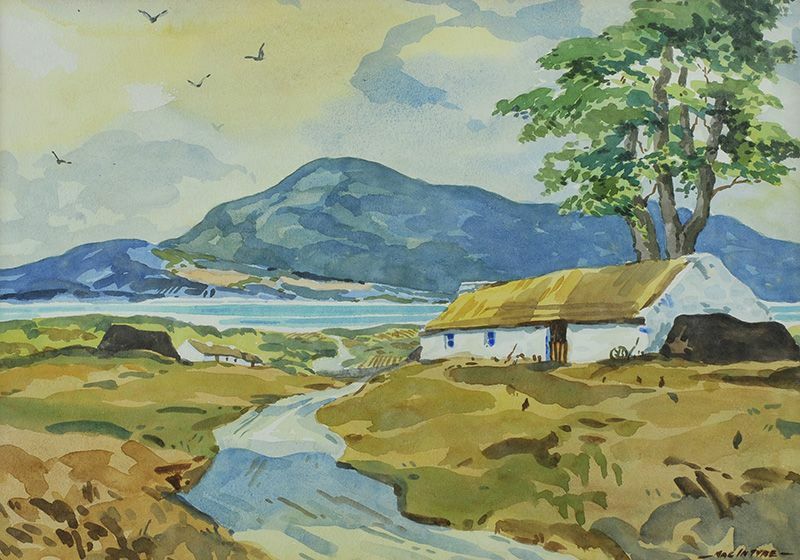 “Bunnafreeva, Lough Croaghaun, Achill” 1955, watercolour (10.5″ x 20.5″), sold at Adam’s – 27/9/2017 for €400.00. 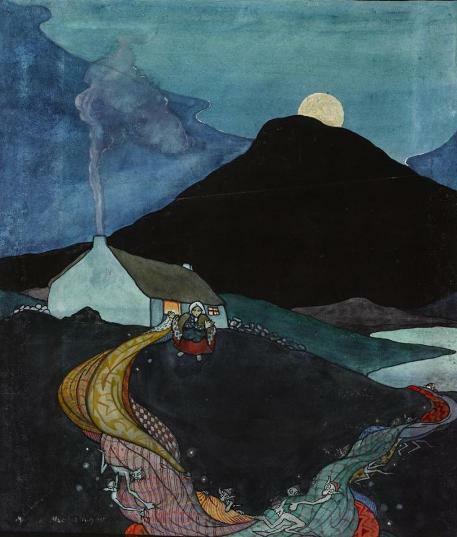 Norah McGuinness was born in Londonderry and trained at the Dublin Metropolitan School of Art and at Chelsea Polytechnic in London before spending the 1920s working in Dublin as a book illustrator and stage designer. 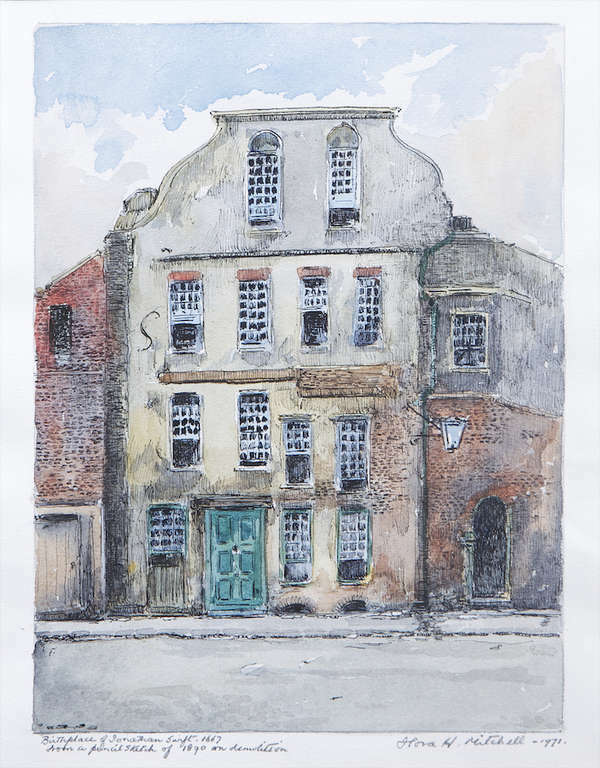 “Customs House from across the Liffey” watercolour (15″ x 21″) sold at Dreweatts & Bloomsbury (Donnington Priory, Berkshire) 6/4/2016 for £1,500.00. “Coastal Town by Moonlight” oil on canvas (20″ x 28″), sold at Whyte’s – 26/9/2016 for €7,500.00. 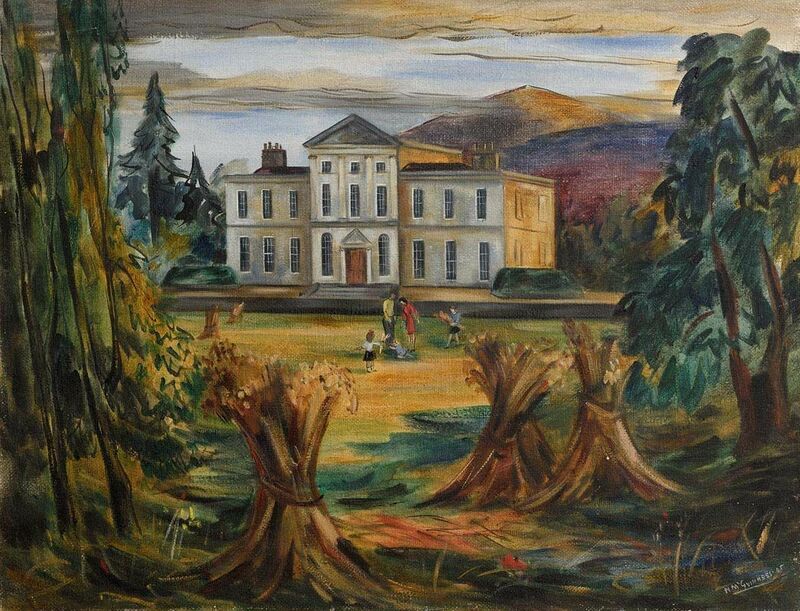 “Charleville House, Enniskerry, County Wicklow” dated 1945, oil on canvas (28″ x 36″), unsold at Morgan O’Driscoll’s (RDS) – 10/4/2017. 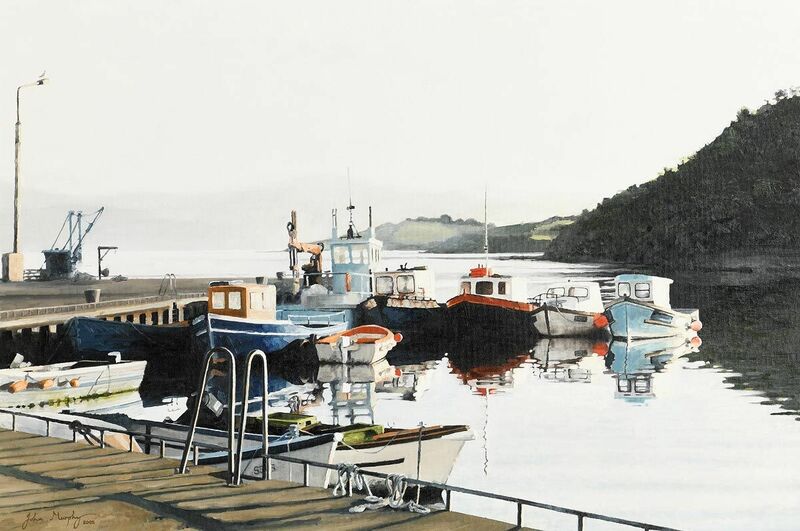 “Harbour with Fishermen and Boats” mixed media (14.5″ x 21.5″), sold at Dolan’s (Connemara Sale) – August 2017 for €10,000. 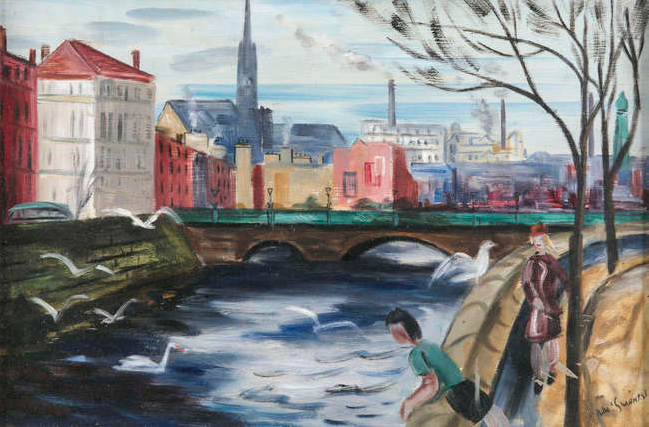 “The Liffey” oil on board (16″ x 23″), sold at James Adam’s – 30/5/2018 for €1,400. 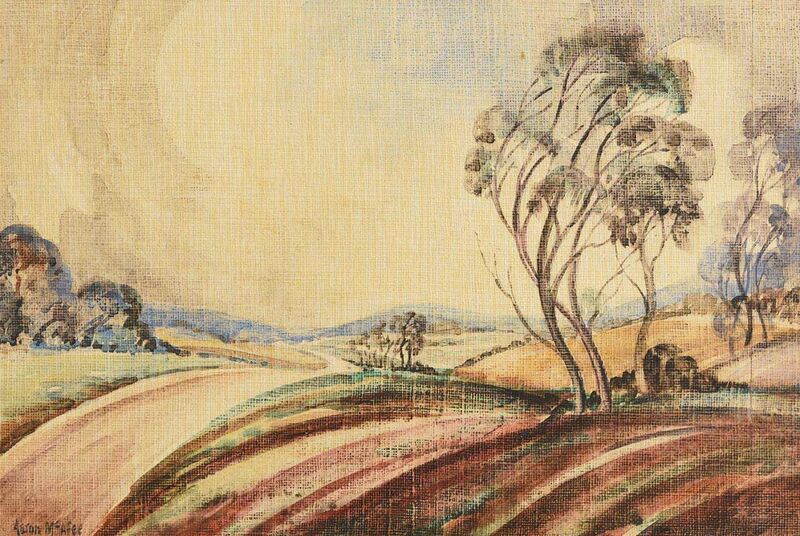 Landscape painter, originally trained as an architect. 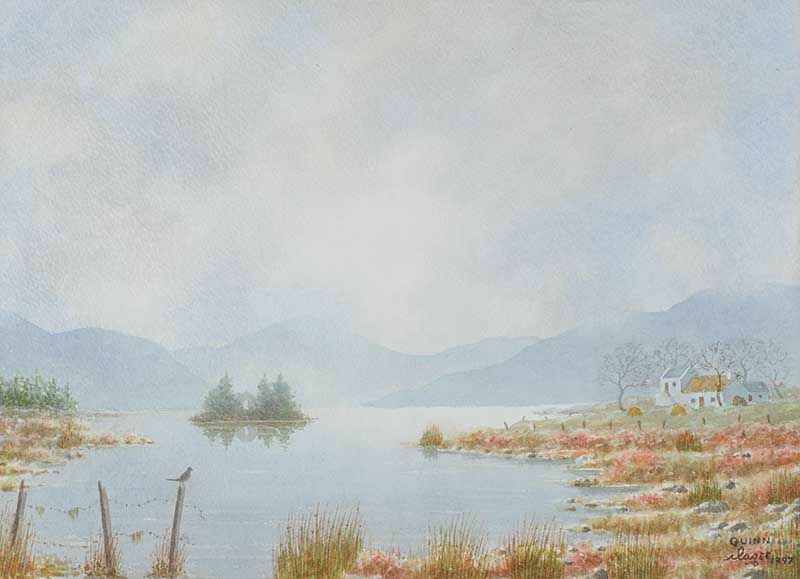 “Lough Eske, Co.Donegal” watercolour (12″ x 20″), sold at Morgan O’Driscoll’s – 24/10/2016 for €500.00. 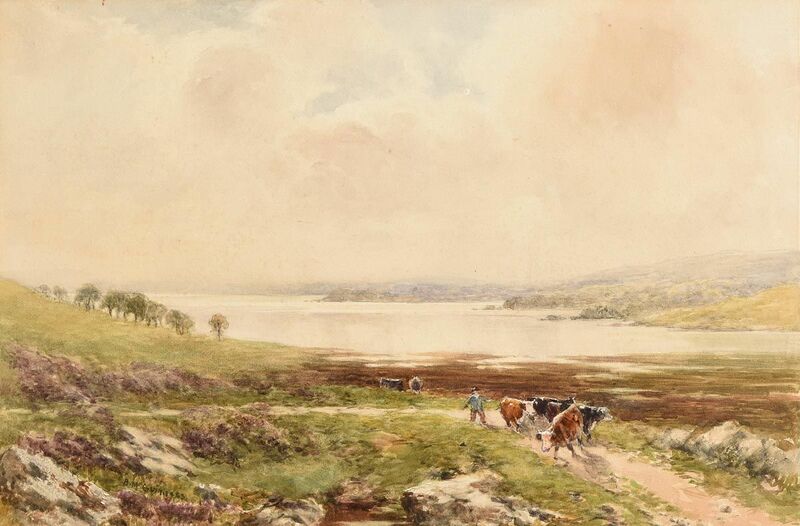 “Near Killarney, from the Headford side” c.1909, watercolour (7″ x 11″), sold at Morgan O’Driscoll’s – 13/3/2017 for €180.00. 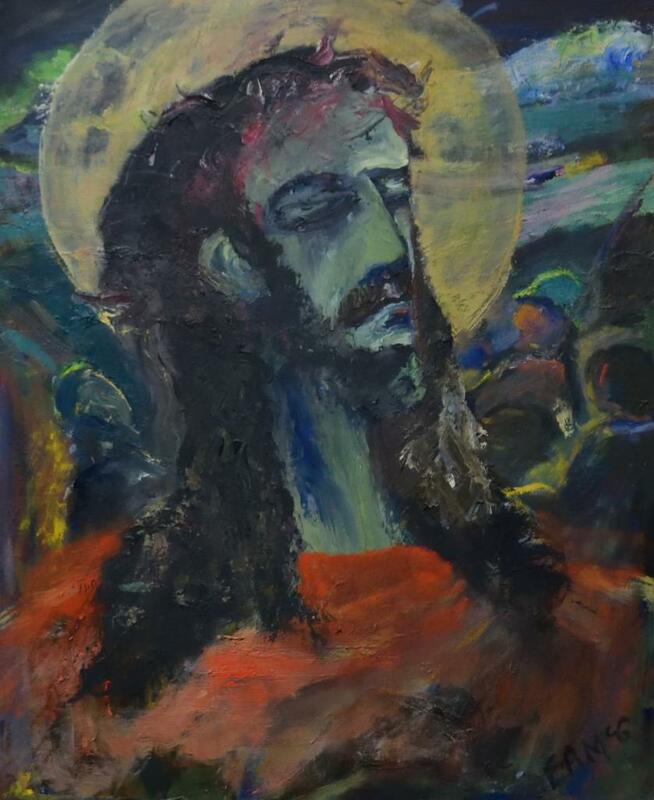 “Ecce Homo” oil on canvas (23.5″ x 19.5″) with Exhibition of Living Art 1950 label, sold at Herman & Wilkinson – 2/5/2018 for €950.00. 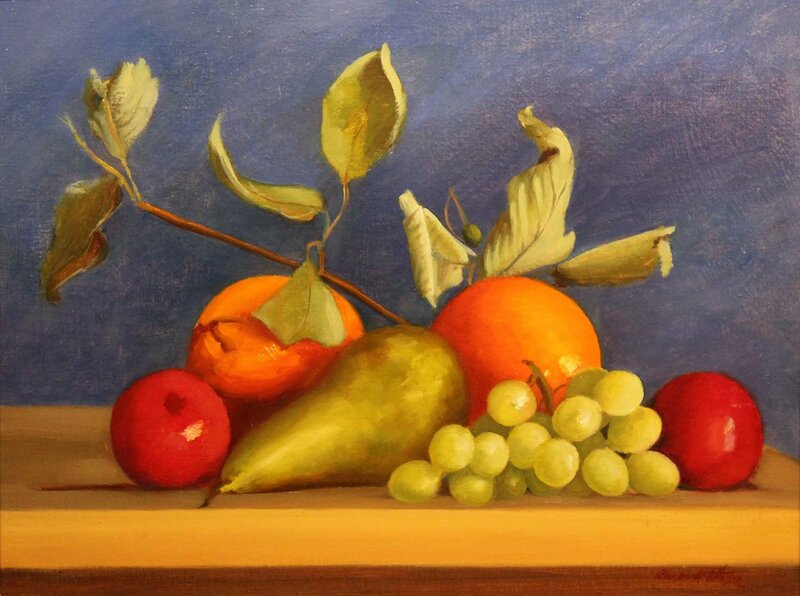 A Dublin born artist known for his portrait work, still-life and bird paintings. 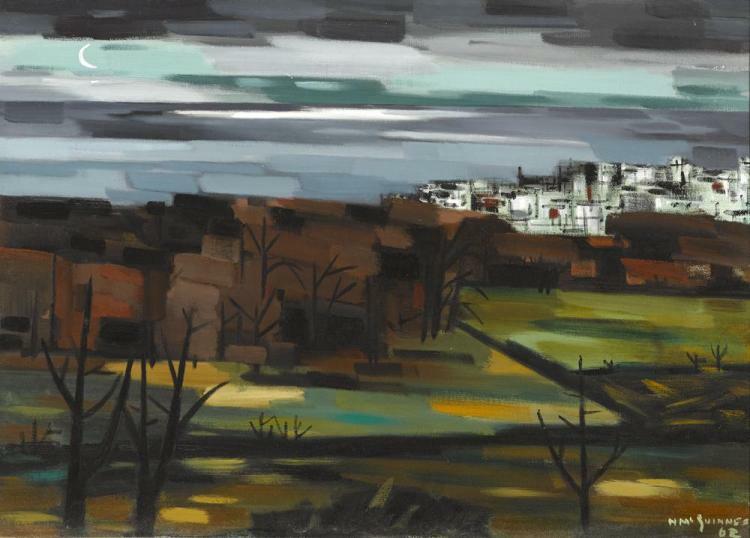 He studied painting, drawing and the history of art at the Accademia di Belle Arti di Roma in 1953 and at the Slade School of Fine Art in 1954. “Portrait of Anthony Cronin” 1977, oil on canvas (25″ x 30″), in the collection of the Crawford Art Gallery, Cork. 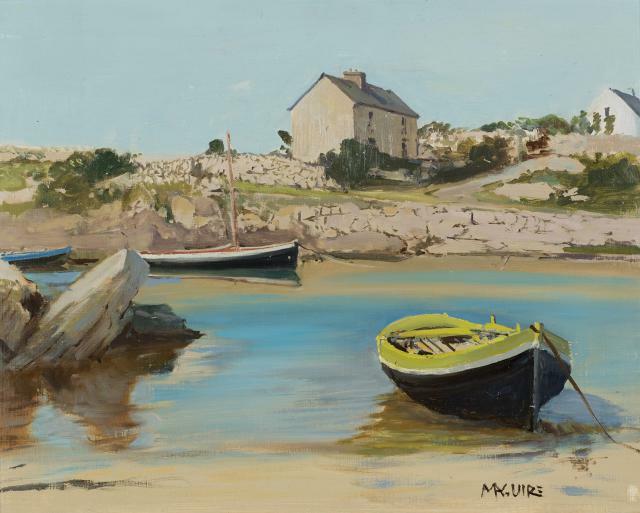 Michael McGuire, originally from Co Kerry, now lives in Wexford and has painted there full-time since 2007. 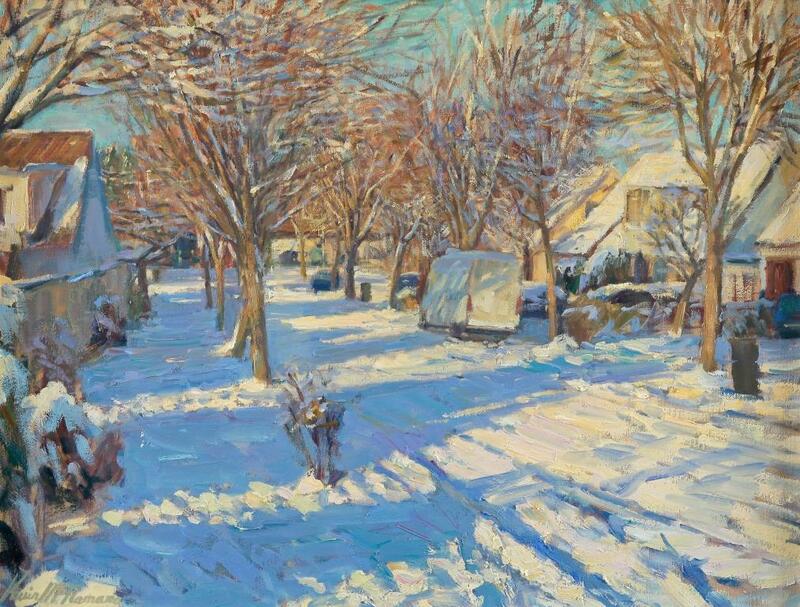 His work is strongly grounded in the plein air (outdoor from life) tradition, so the paintings have an immediate impact with a strong sense of authentic light. He has always had a love of nature and is drawn to wild, remote places. But, as a painter mainly concerned with capturing light effects, he also enjoys the challenge of finding beauty in mundane subject matter. 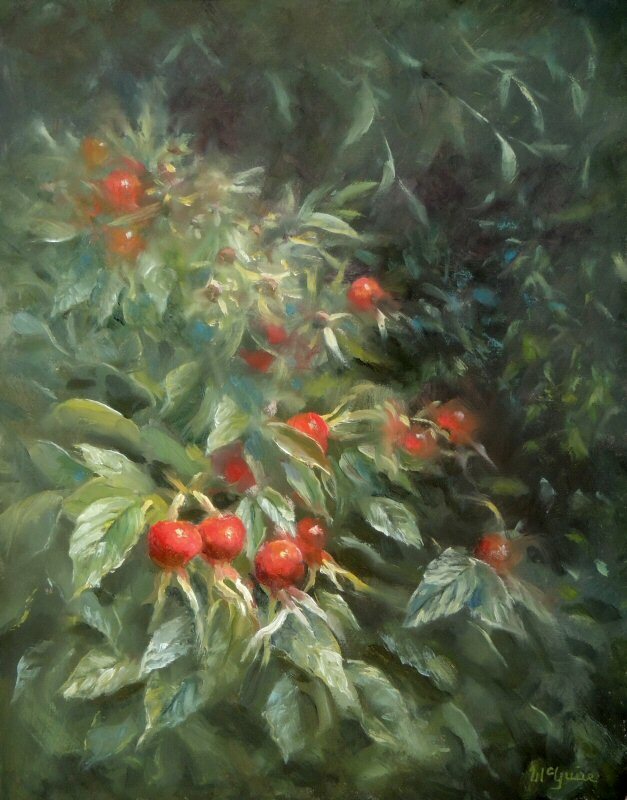 Left to right: “Shallow Water, Clonegal” oil on panel (11″ x 14″); and “Rose Hips” (14″ x 11″). “Slate Pile, Woodville House” (11″ x 14″). Left to right: “Bathing, Donegal” acrylic on board (14″ x 18″), sold at Ross’s – 10/8/2016 for £200.00; and “Seascape” oil on canvas (24″ x 30″), sold at Morgan O’Driscoll’s – 29/1/2018 for €380.00. 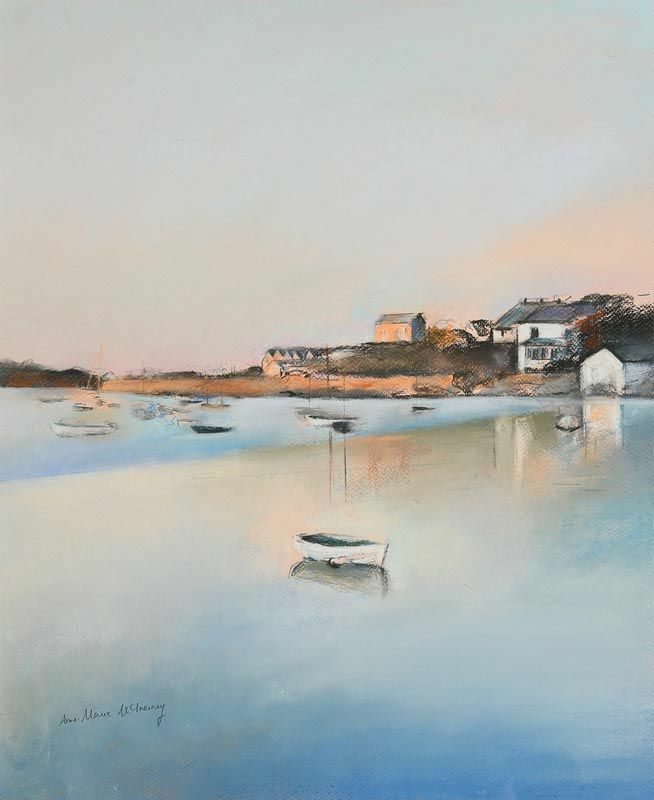 “Sunrise, The Cove, Baltimore” pastel on paper (21″ x 17″), sold at Morgan O’Driscoll’s – 25/6/2018 for €300.00. 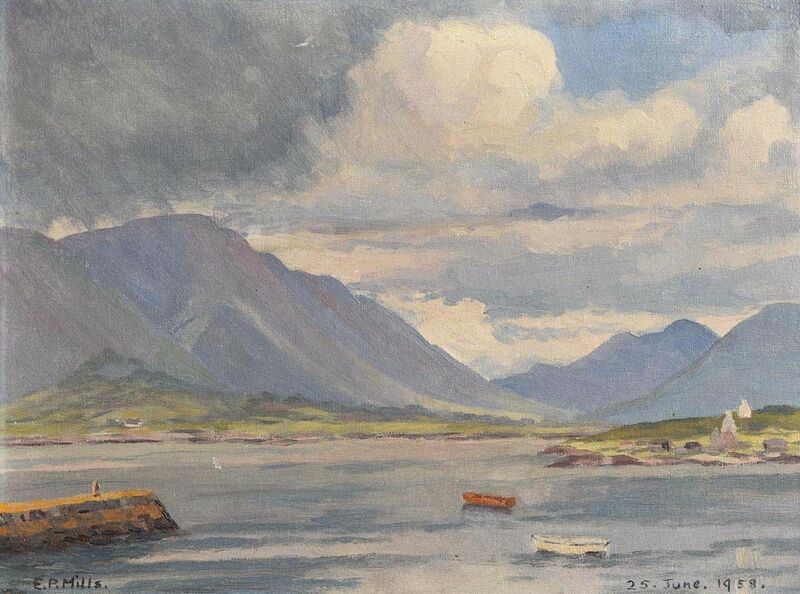 “Mournes from Dundrum” oil on canvas (16″ x 30″). 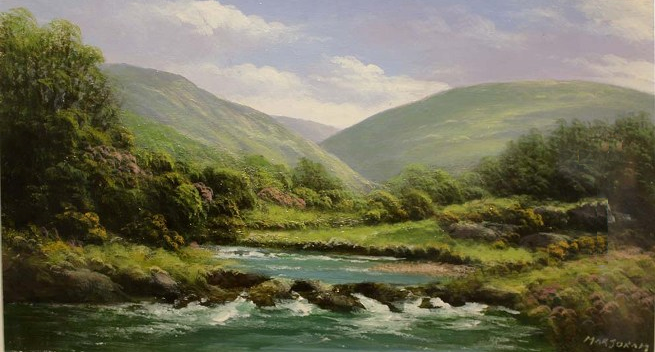 “Shankey’s River, Mourne Mountains” oil on canvas (12″ x 16″), unsold at Ross’s – 21/3/2018. 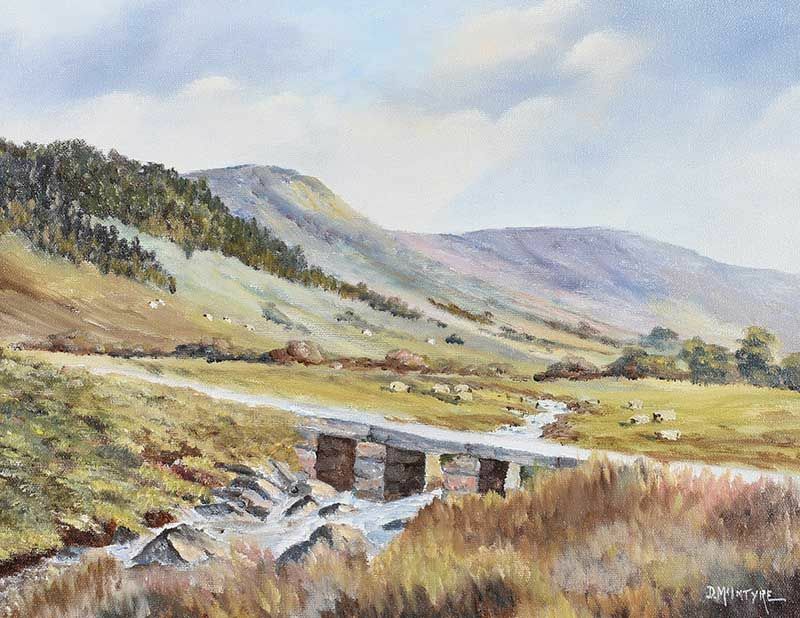 “Mourne Mountains, Newcastle” watercolour (10.5″ x 14″). 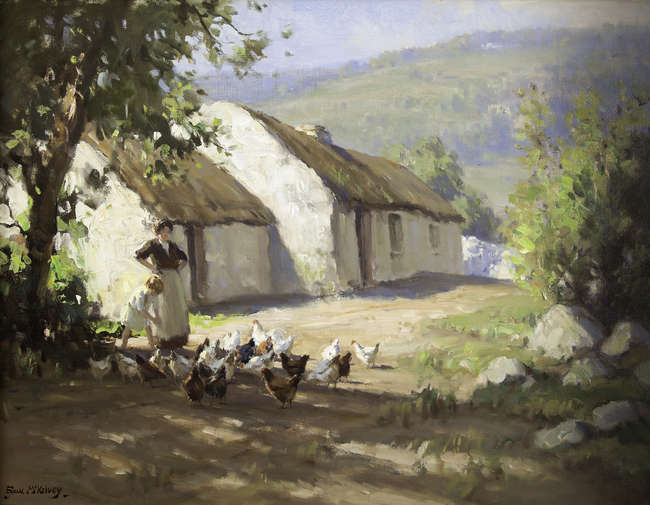 “Feeding the Hens – A Woman and Child by a Thatched Cottage” oil on canvas (20″ x 26″), sold at Adam’s – 7/12/2016 for €20,000. 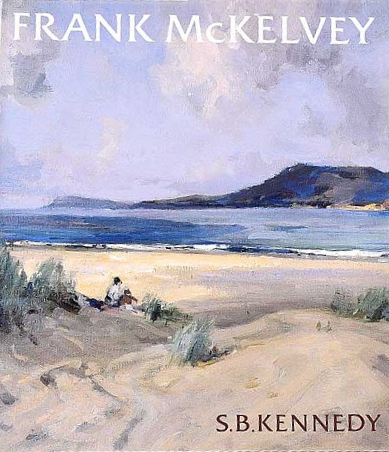 “Frank McKelvey: A Painter in His Time” by S.B.Kennedy, published by the Irish Academic Press in 1993. 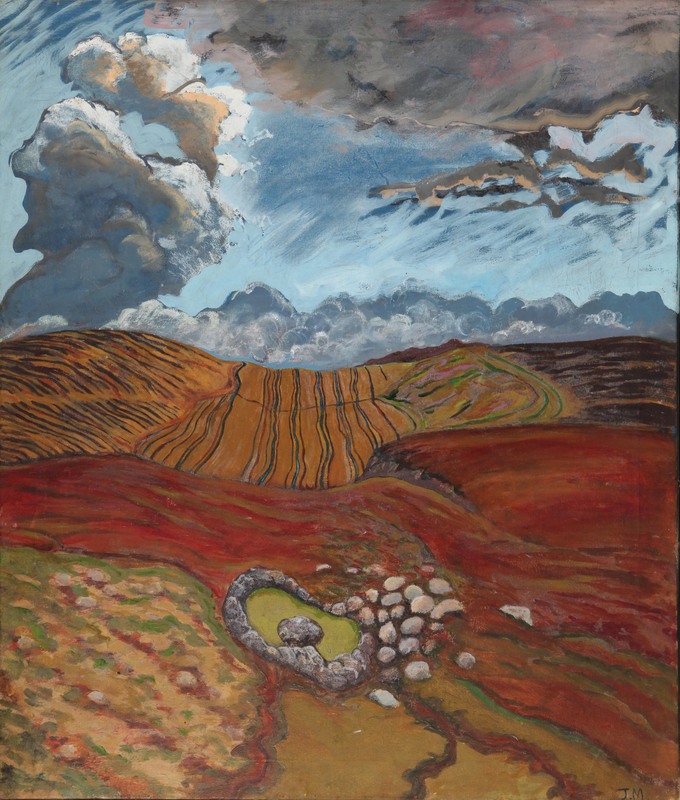 96pp, illustrated, detailing McKelvey’s life and career both as a landscape and a portrait painter, and examines his work in the wider context of Irish art in his time. 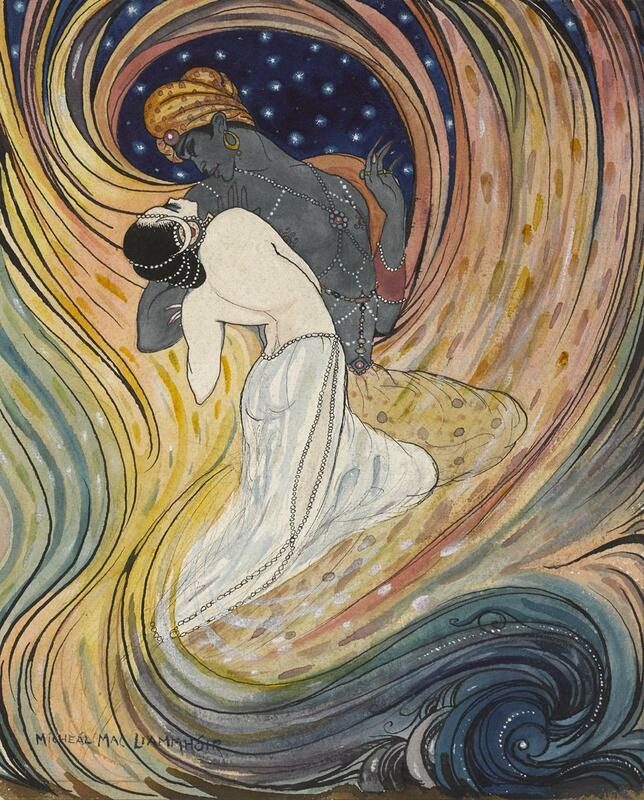 It also includes numerous illustrations of his work as well as lists of his major exhibitions and works in public collections. 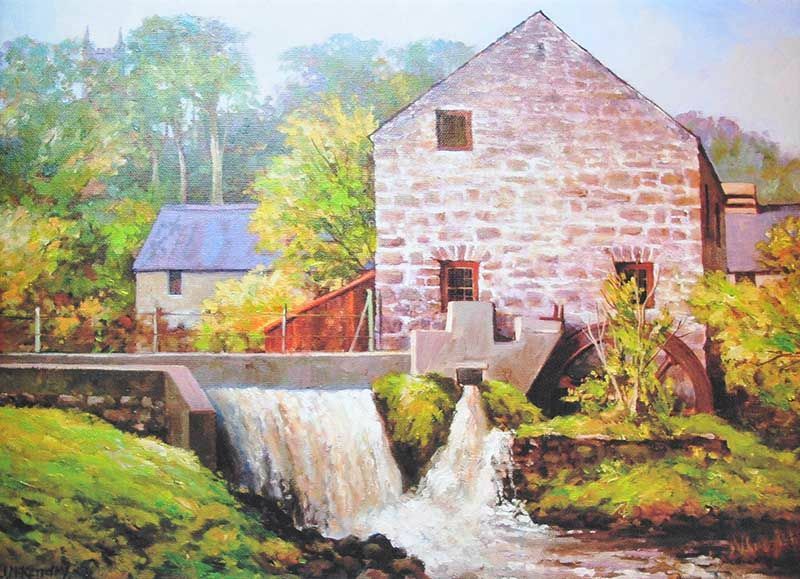 “Curry’s Mill, Bushmills” oil on board (12″ x 16″). Sold at Ross’s – 10/8/2016 for £100.00. Left to right: “Potato Spraying” oil on board (12″ x 16″), unsold at Ross’s – 10/8/2016; “Winter, Old Bushmills” watercolour drawing (14″ x 21″), sold at Ross’s – 9/11/2016 for £200.00. 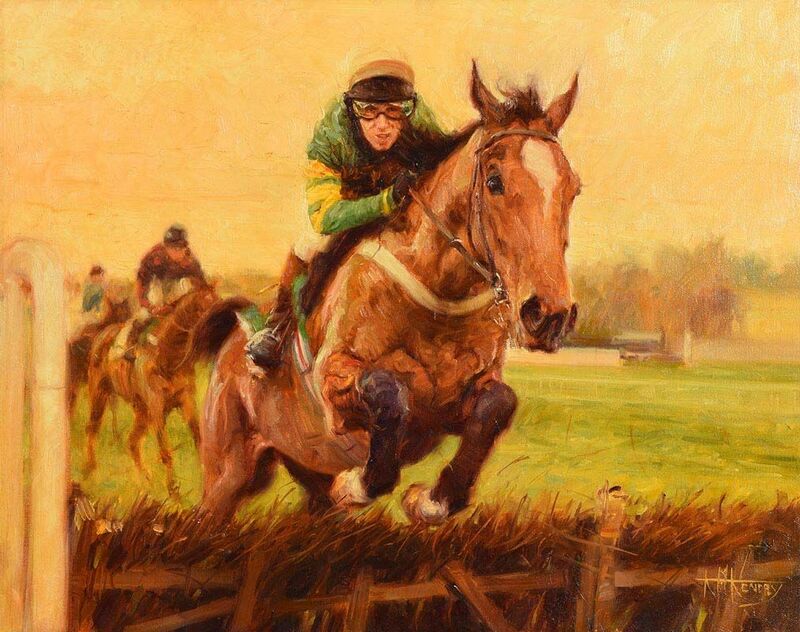 “Istabraq – over the jump” oil on canvas (16″ x 20″), sold at Morgan O’Driscoll’s – 26/6/2017 for €550.00. 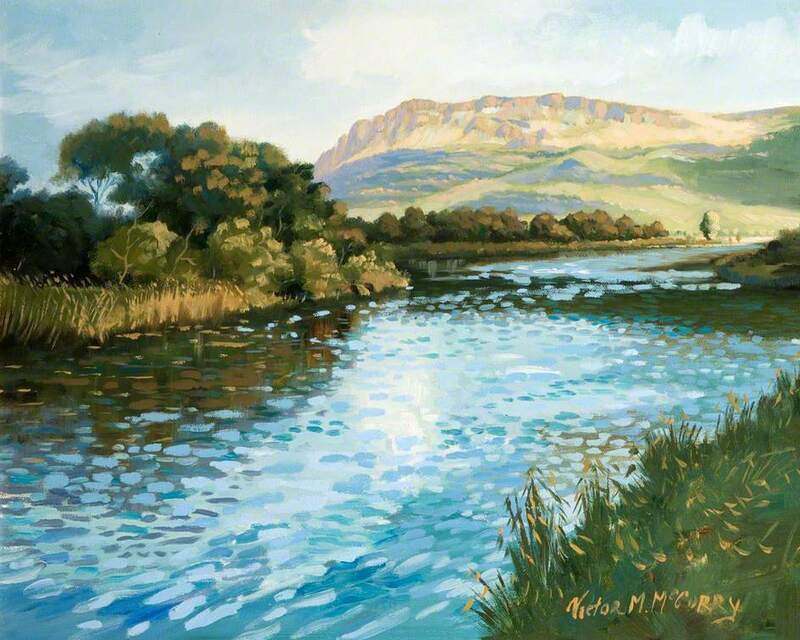 “Six Mile Water, Antrim” 2004, oil on board (15″ x 24″), sold at Morgan O’Driscoll’s – 22/5/2017 for €60.00. Left to right: “Bogland, Achill” oil on canvas (14″ x 18″), sold at Gormley’s – 13/9/2016 for £240.00; and “Little Bridge, Dooagh, Achill” oil on canvas (23″ x 31″), sold at Morgan O’Driscoll’s – 26/6/2017 for €480.00. 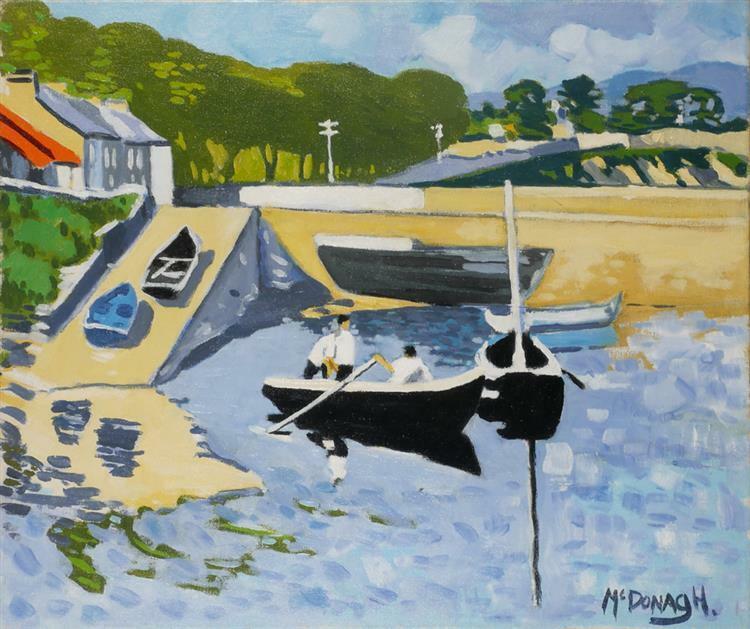 “Old Roundstone Pier” oil on canvas board (11.5″ x 15.5″), sold at Morgan O’Driscoll’s – 2/10/2018 for €240.00. 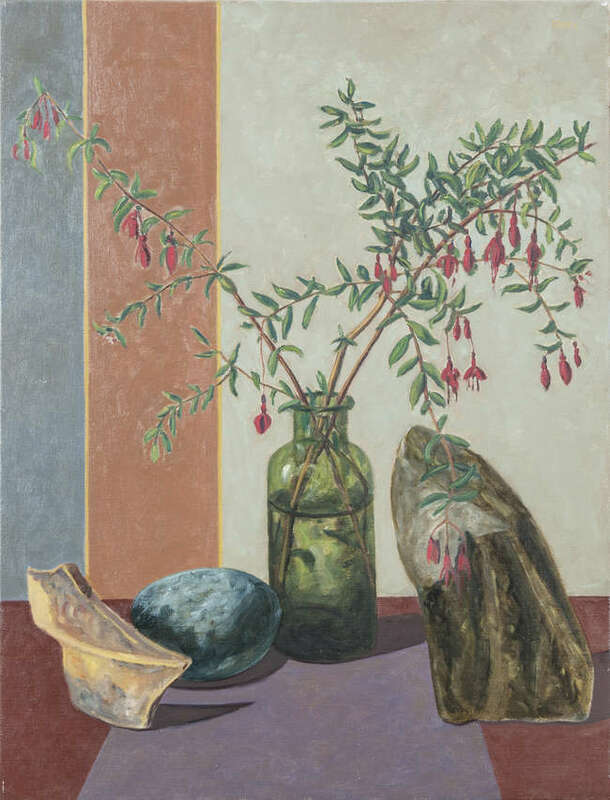 “Still life with Fuscia” 1988, oil on canvas (31″ x 23″), sold at Adam’s – 13/12/2016 for €2,000. 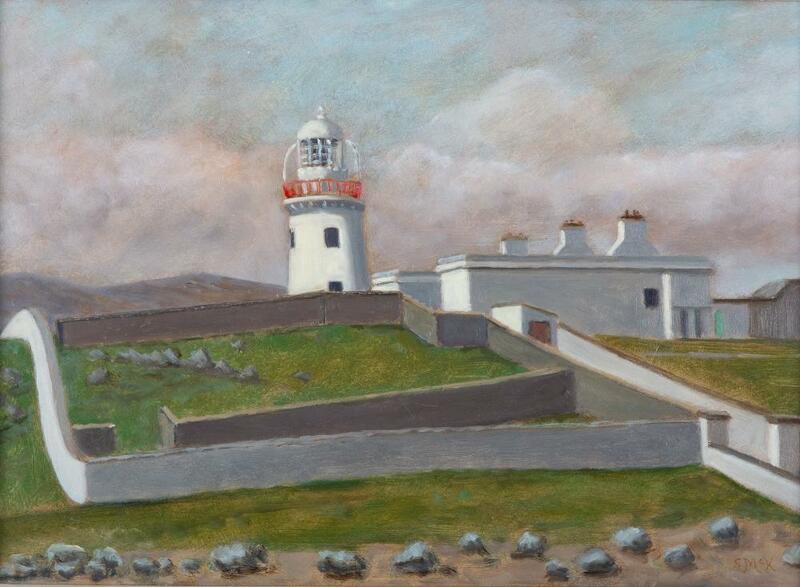 “Lighthouse, St.John’s Point” dated 1993, oil on board (12″ x 17″), sold at Adam’s – 26/9/2018 for €3,500. 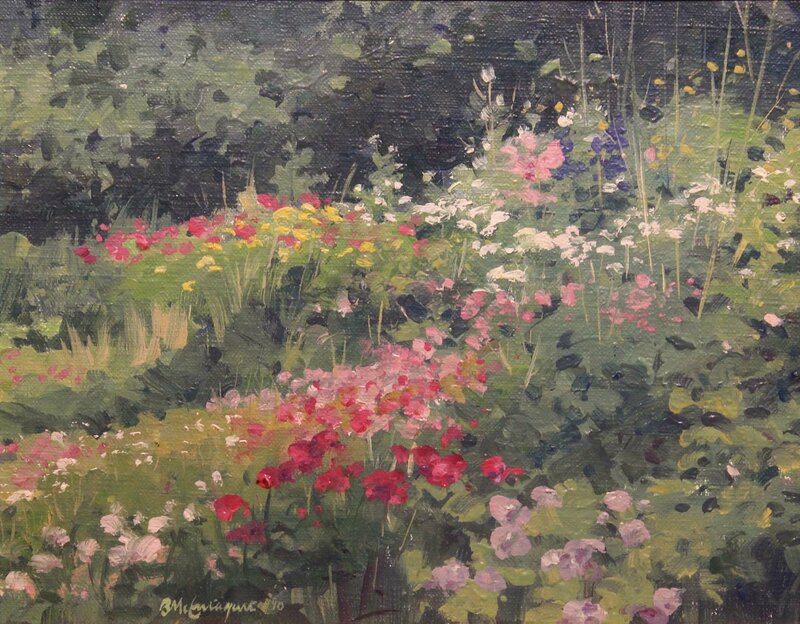 Gordon McKnight was a retired architect who became a full-time painter in 1991. 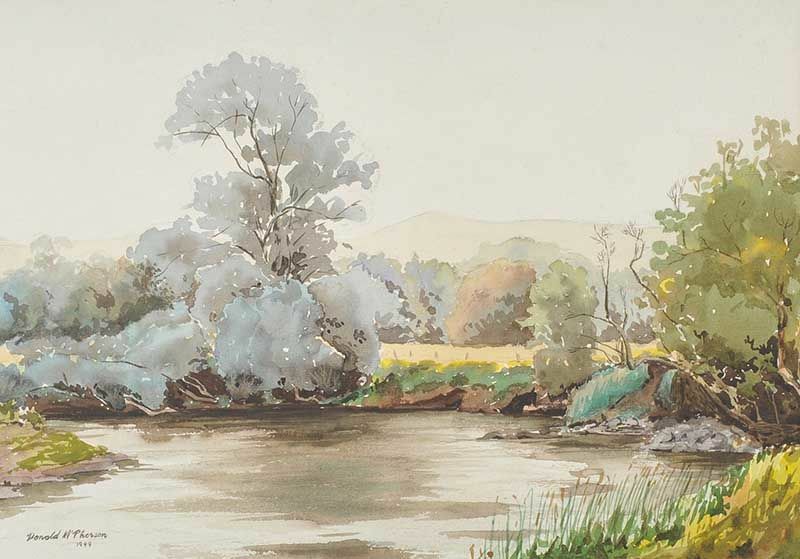 He was a very successful watercolour artist, winning many awards including the Percy French Watercolour Competition on no less than three occasions. 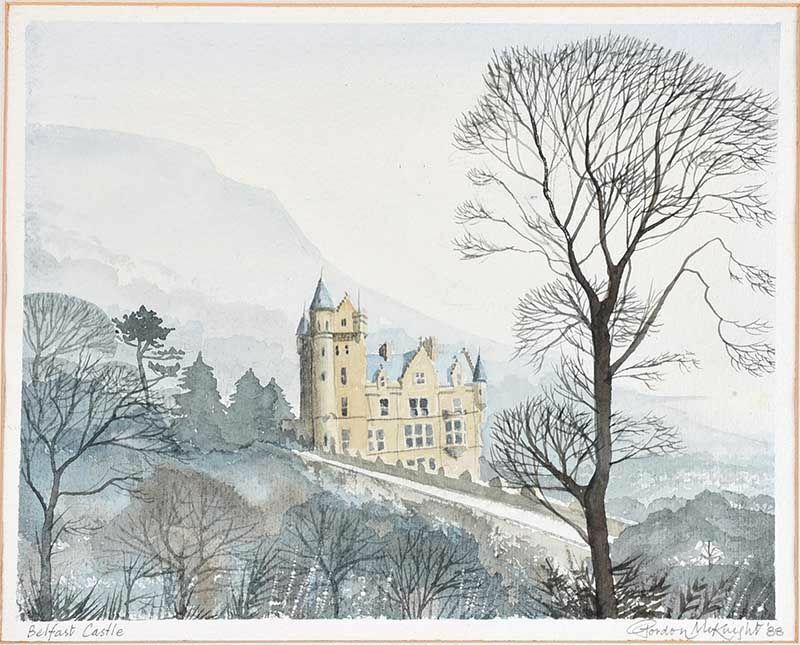 “Belfast Castle” watercolour drawing (9.5″ x 12.5″), sold at Ross’s – 16/1/2019 for £50.00. 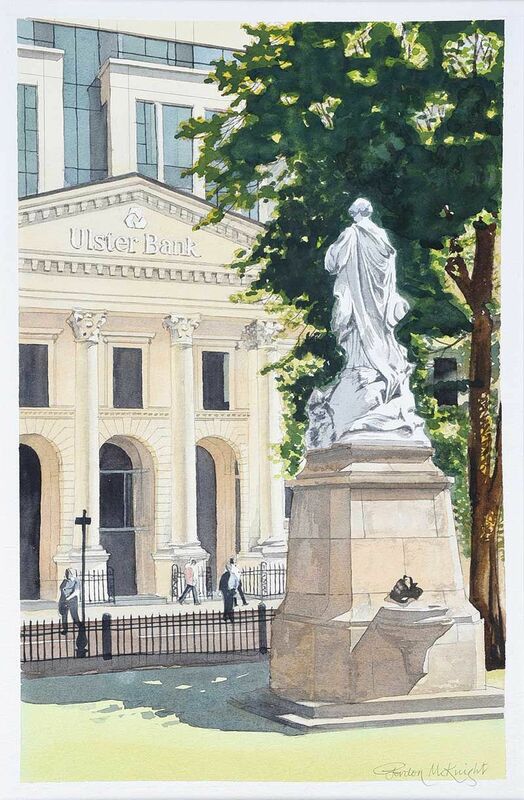 Left to right: “The Albert” watercolour drawing (14″ x 9.5″), sold at Ross’s – 10/4/2019 for £80.00; and “Ulster Bank beside the City Hall” watercolour drawing (15″ x 9.5″) unsold at Ross’s – 10/4/2019. 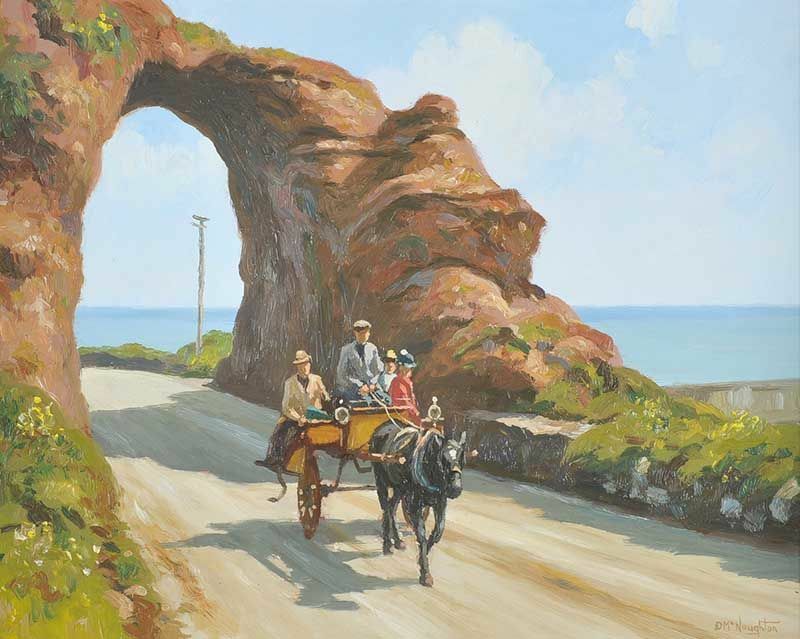 “The Antrim Coast Road” oil on canvas (18″ x 36″), Sold at Ross’s 10/8/2016 for £400.00. 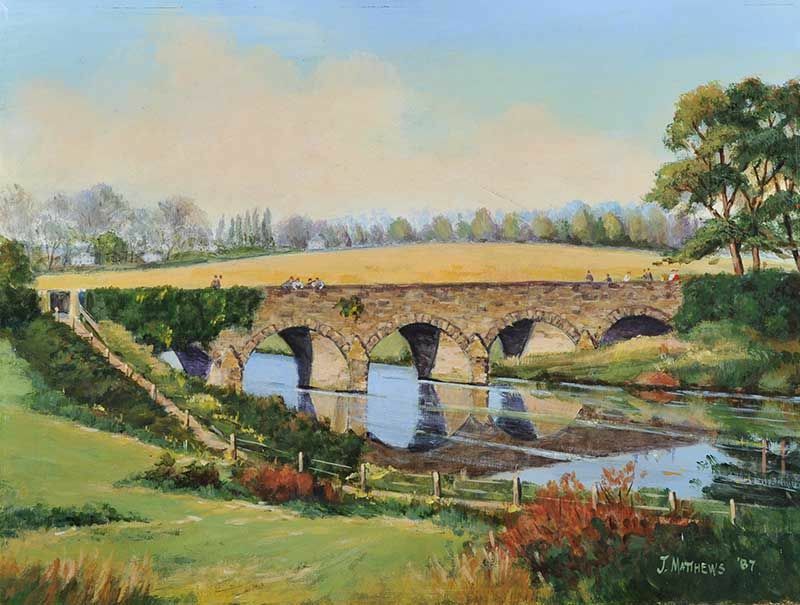 Left to right: “Cushendun bridge, Co. Antrim” watercolour; “Ballycastle Strand” watercolour (7″ x 13″), sold at Ross’s – 7/9/2016 for £100.00; and “North Antrim Farmstead” watercolour drawing (9″ x 13″), unsold at Ross’s – 23/5/2018. 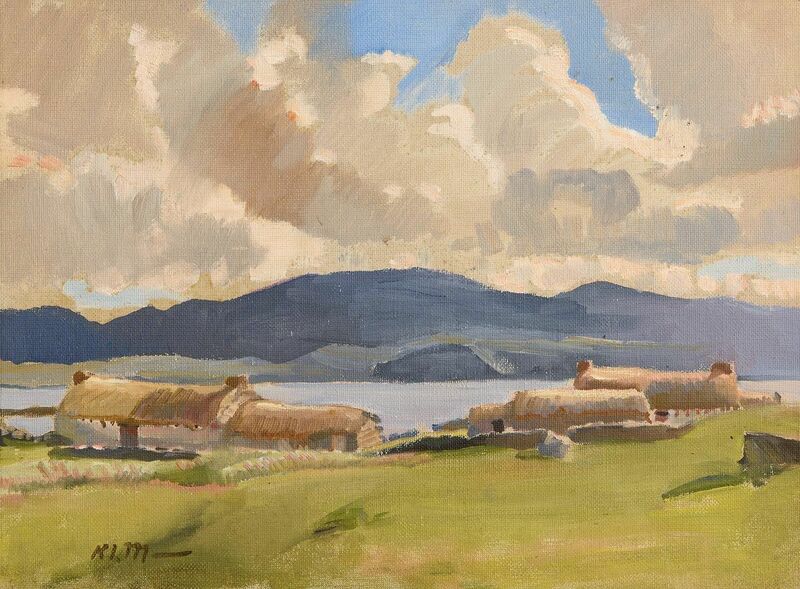 “Donegal Landscape with Thatched Cottages and Turf Stacks” oil on canvas (11″ x 14.5″). Limerick born artist and author. Attended Limerick School of Art & Design, and received a BA in Fine Art in 1998. Works in mixed media. 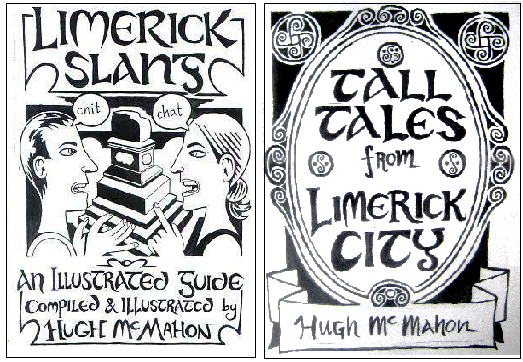 Hugh Mc Mahon lives and works in Limerick City as an artist, illustrator and art therapist. He is a founding member of Phoenix Creative Arts Psychotherapy Centre (PCPC) which provides creative arts therapies for young people in Limerick. 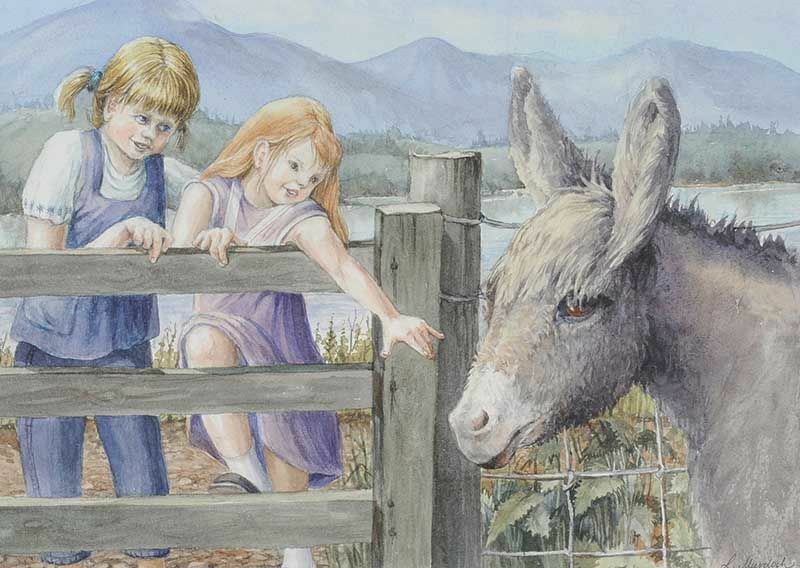 He has had four solo exhibitions of his paintings and has produced several illustrated books. 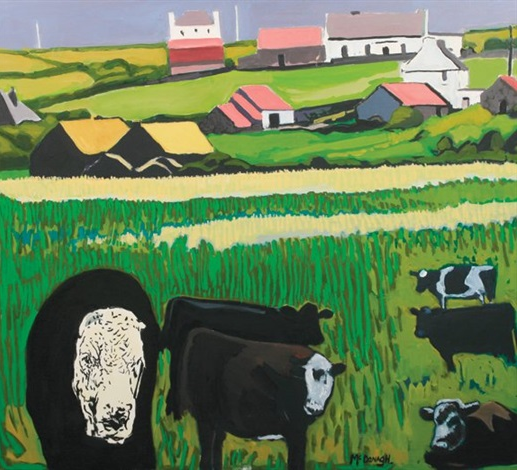 “Overherd” 2006, triptych © Hugh McMahon. Two recent publications written and illustrated by the artist. 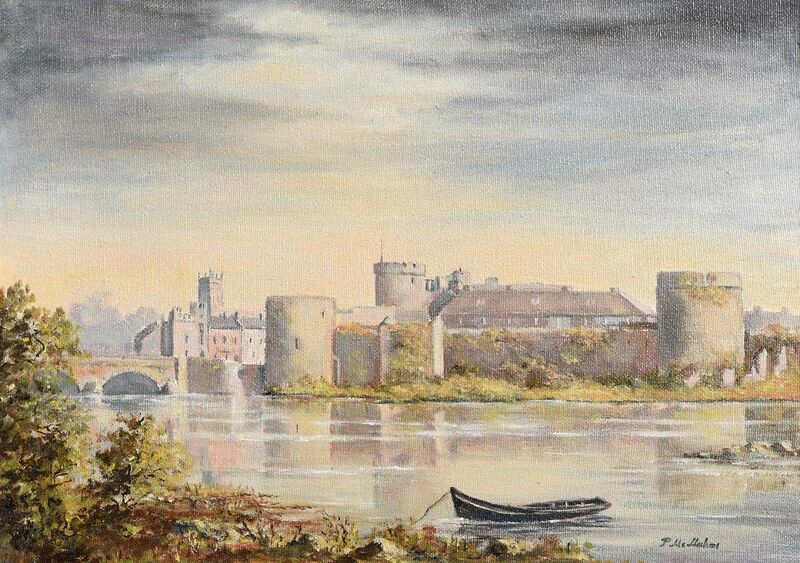 “King John’s Castle, Limerick” oil on canvas (10″ x 14″), sold at Morgan O’Driscoll’s – 22/5/2017 for €380.00. 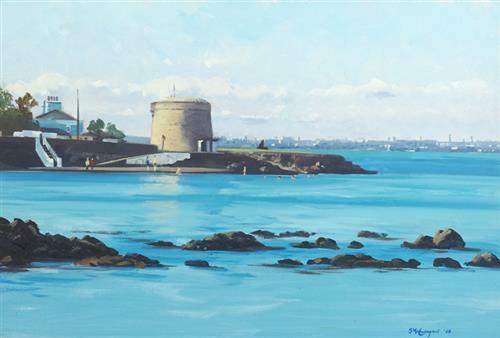 “Seapoint Martello Tower, Sandymount” oil on board (7.5″ x 9″), sold at Sheppard’s – 29/8/2017 for €260.00. 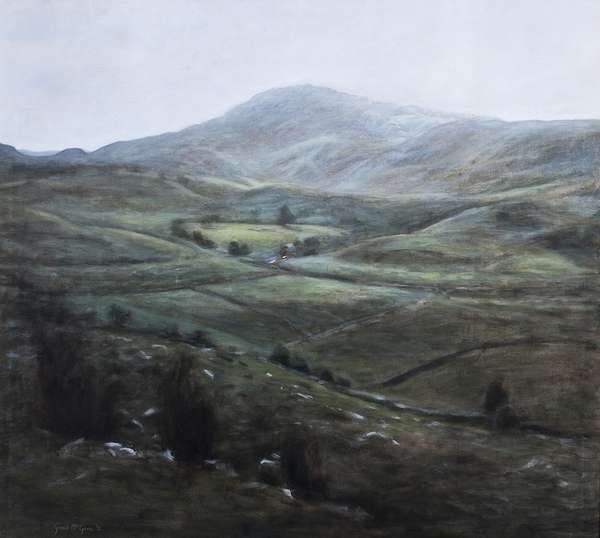 Northern Irish landscape and portrait artist. 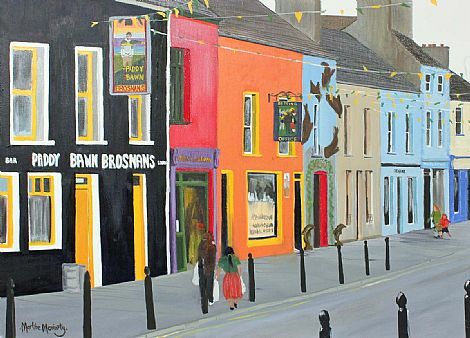 Chris Mc Morrow is a self-taught Irish artist. 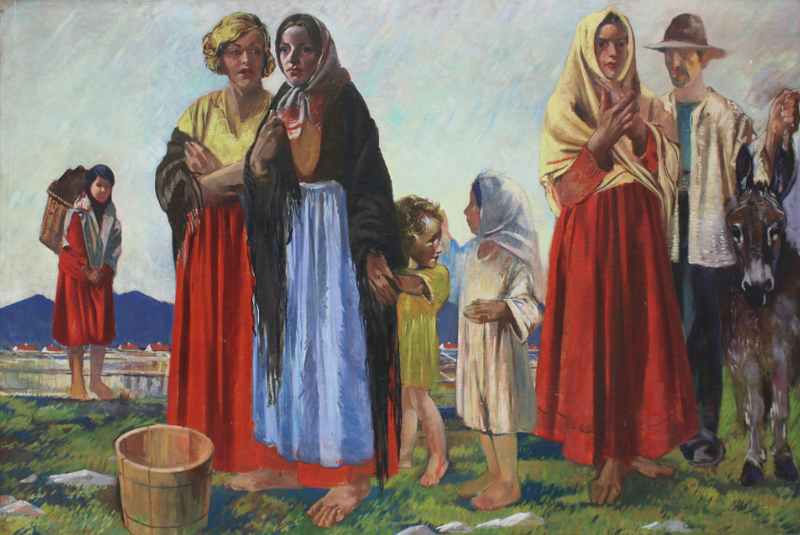 His subject material is varied ranging from landscape and cityscape to figurative and still-life. 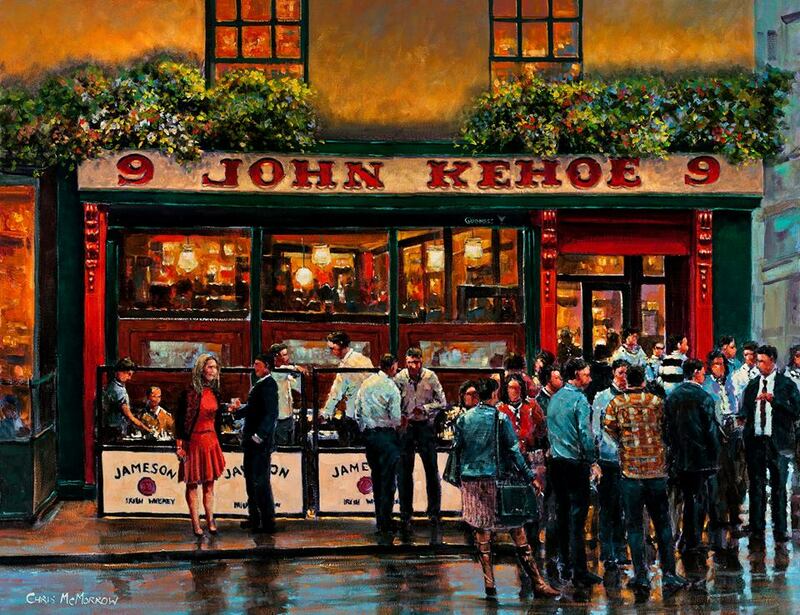 A Dublin institution ” Kehoe’s of South Anne Street” – a commission by the artist. 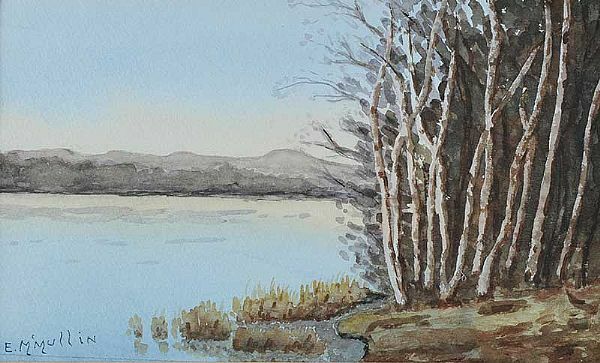 “Birches on the Bann” watercolour drawing (6″ x 9″), sold at Ross’s – 1/3/2017 for £10. “Merlin, Connemara” oil on canvas board (16″ x 20″). 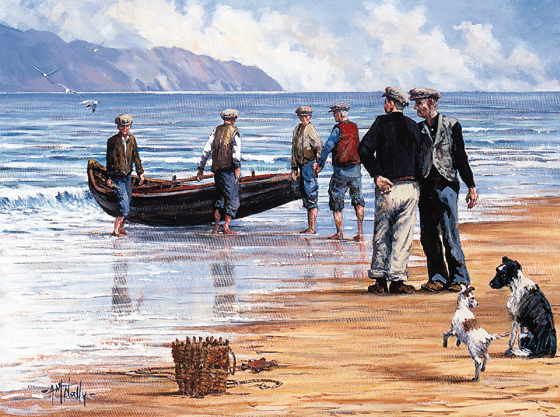 Left to right: “Launching the Currach” oil on board (18″ x 24″) sold at Whyte’s – 10/10/2000 for €2,032 incl.buyer’s premium; and “Unloading the Catch” oil on canvas (23.5″ x 30″), sold at Morgan O’Driscoll’s – 25/6/2018 for €420.00. Kevin was born in England (Manchester), raised in Dublin and now lives and works near Lahinch, Co.Clare. He studied at the National College of Art & Design in Dublin graduating with a degree in Fine Art Painting and History of Art. Since then he has worked as a full time artist and has shown regularly in one-man shows and group exhibitions in Ireland, England, and the United States. Kevin is a painterly realist with leanings towards impressionism and modernism. 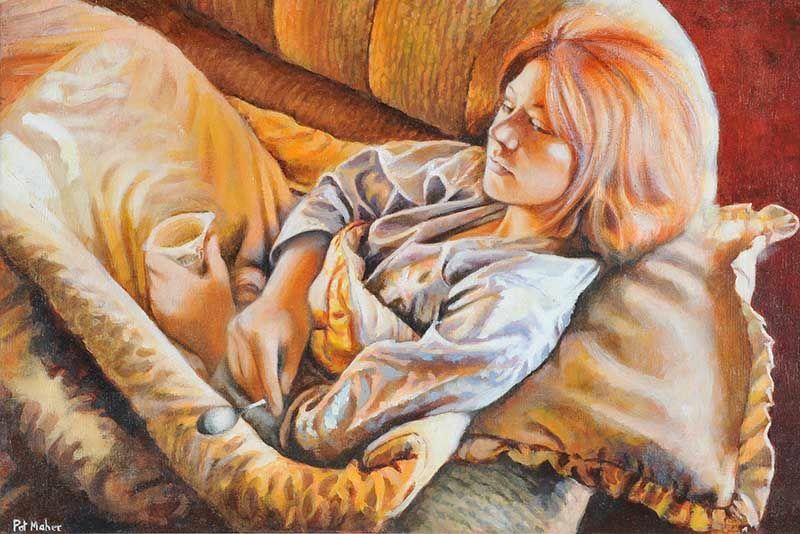 Painting from life, his work includes a wide range of subjects – landscapes, figurative, portraiture, still life and background painting for animation movie productions. 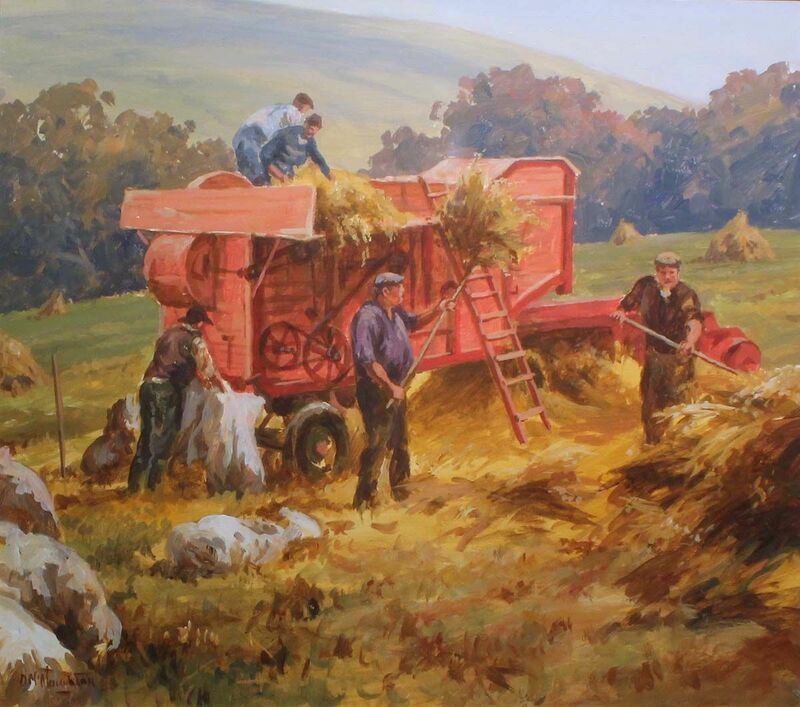 “Threshing Corn in the Glens” oil on board (16″ x 18″). Left to right: “The Hunt” oil on board (16″ x 20″); “Unloading the Catch” oil on board (16″ x 24″); and “On the Coast Road, Co.Antrim” oil on board (16″ x 20″), unsold at Ross’s – 28/6/2017. 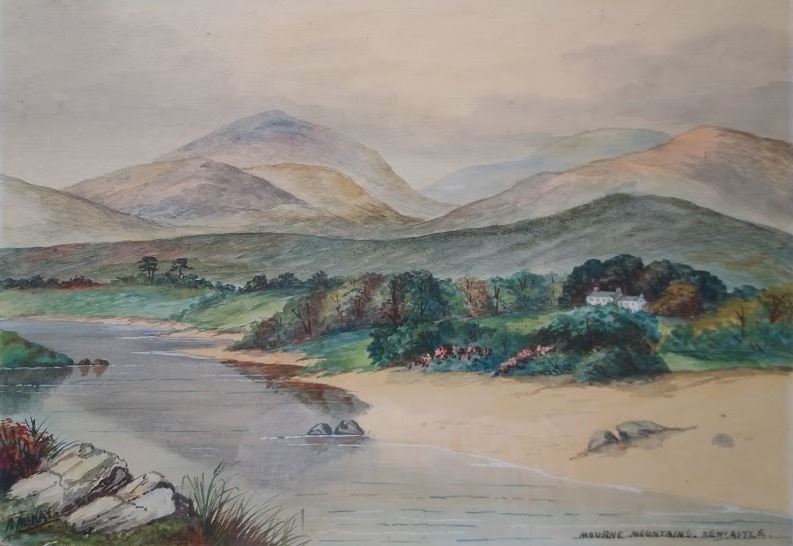 “Mountains, West of Ireland” watercolour drawing (14″ x 21″), unsold at Ross’s – 8/8/2018. 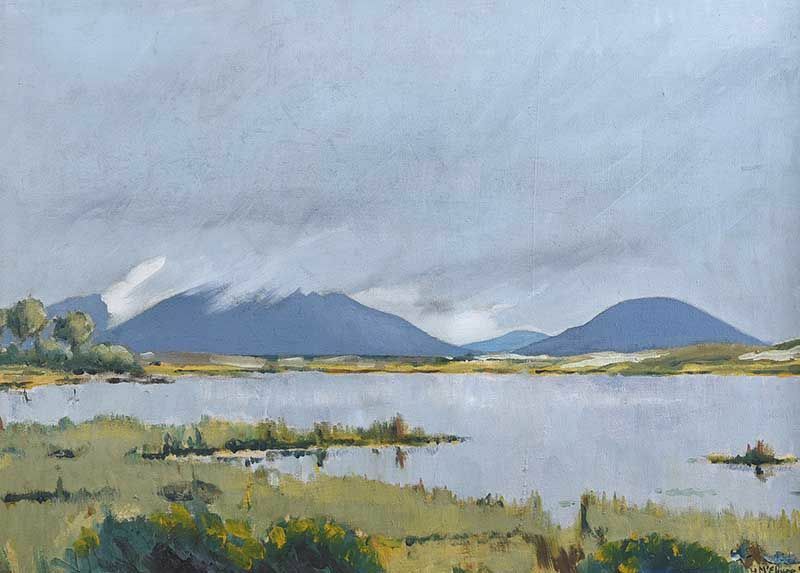 “Derryclare Lake, County Galway” oil on canvas (20″ x 30″), unsold at Whyte’s – 9/7/2018. Born in Dublin, John McNulty studied at the National College of Art and Design and at the Etching Centre in Geneva. 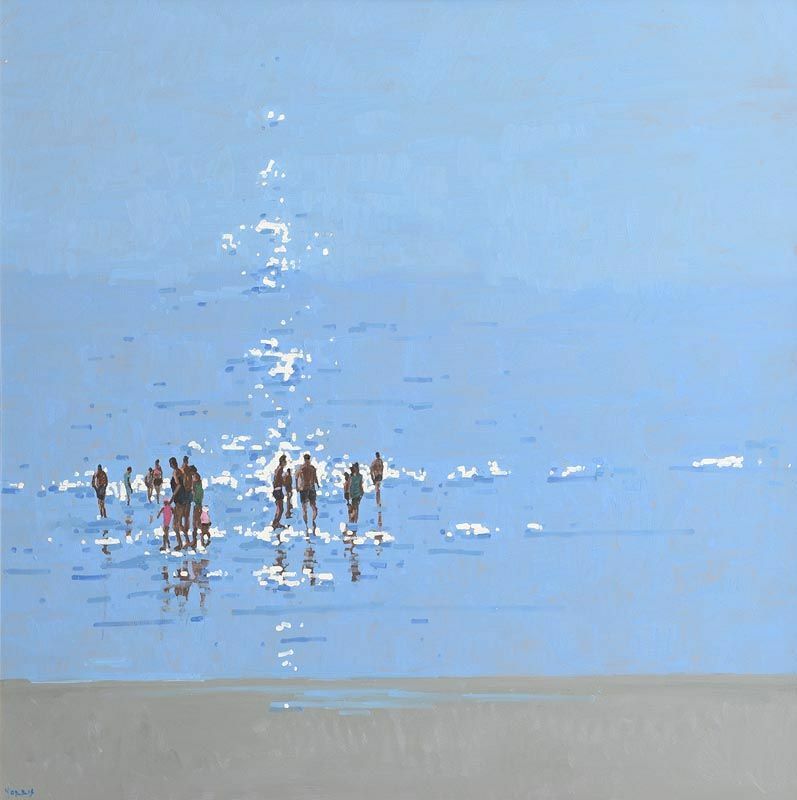 From 1979 he has worked with three main themes; landscapes, seascapes and sporting images. 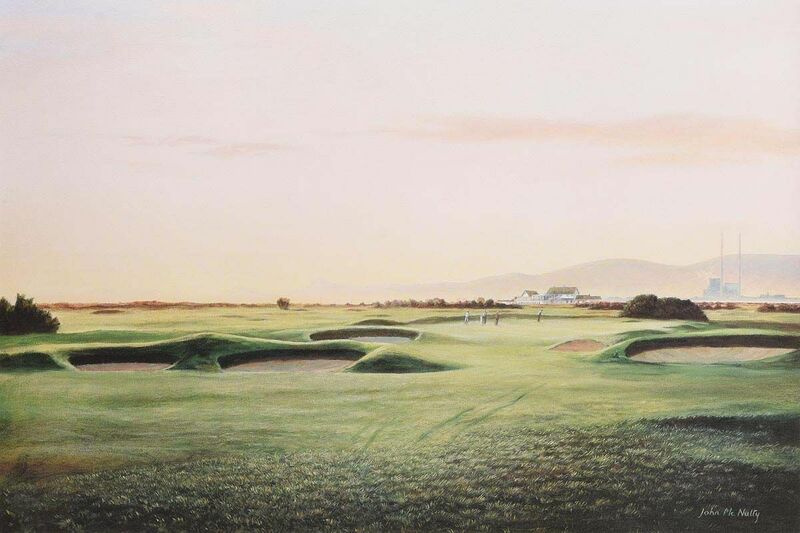 “Royal Dublin, Dewy Morning” signed artist’s proof (15″ x 23″), sold at Morgan O’Driscoll’s – 26/6/2017 for €120.00. “Cottages by the Sea” watercolour (9.5″ x 14″), unsold at Whyte’s – 11/12/2017. “The Silver Willow” watercolour drawing (10″ x 15″), unsold at Ross’s – 31/5/2017. “Kilclief, Co.Down” watercolour (15.5″ x 22″), unsold at Adam’s – 8/10/2018. 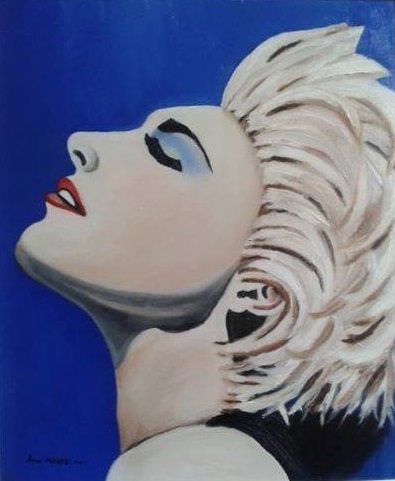 Northern Ireland artist from Lisburn, County Antrim. “Fitzroy Avenue” acrylic on board (36″ x 24″), sold at Ross’s – 25/4/2018 for £90.00. 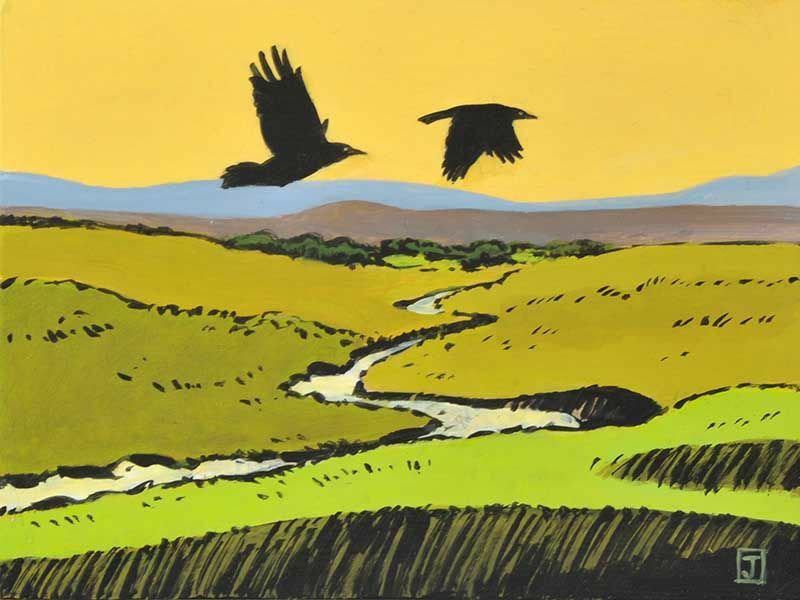 A largely self-taught artist who attended the National College of Art in Dublin (1959/60), and later studied etching and silk screen printing in London. 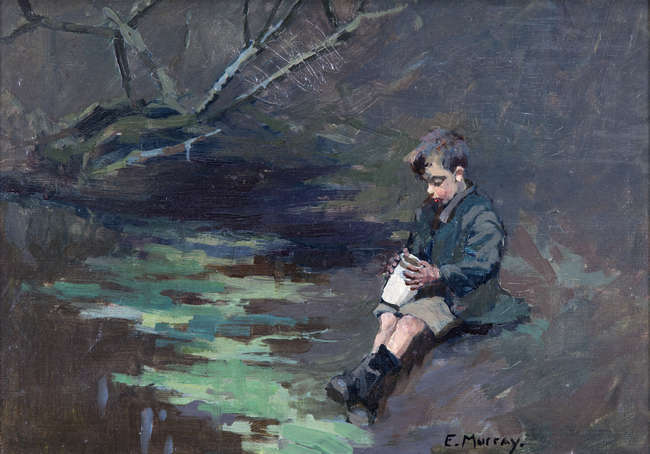 Eugene McSwiney studied at the Cork School of Art and later joined the staff of that School (now known as the Crawford School of Art). 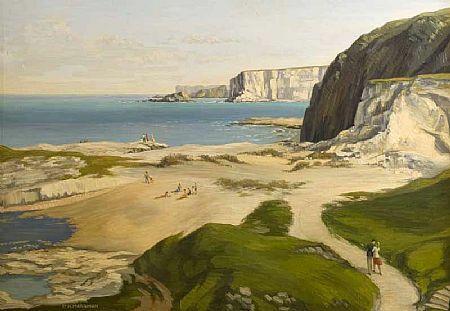 Some of his paintings were exhibited in London at the Royal Academy between the years 1897-1912. 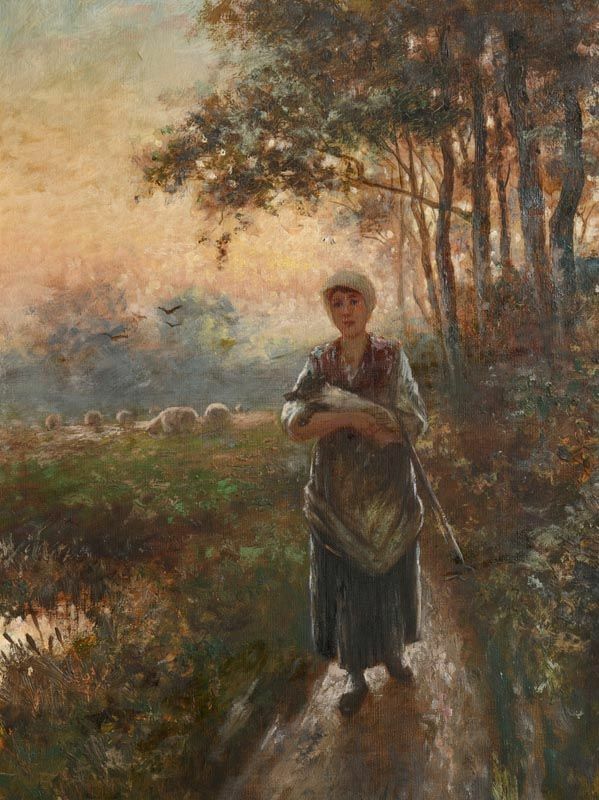 “The Shepherdess” oil on canvas (16″ x 12″), sold at Morgan O’Driscoll’s – 2/7/2018 for €340.00. 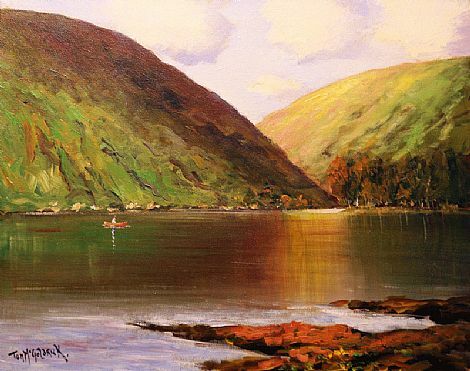 Landscape and portrait artist from Newry, County Down. “Abandoned” oil on board (15″ x 19″), sold at Ross’s – 6/12/2017 for £180.00. 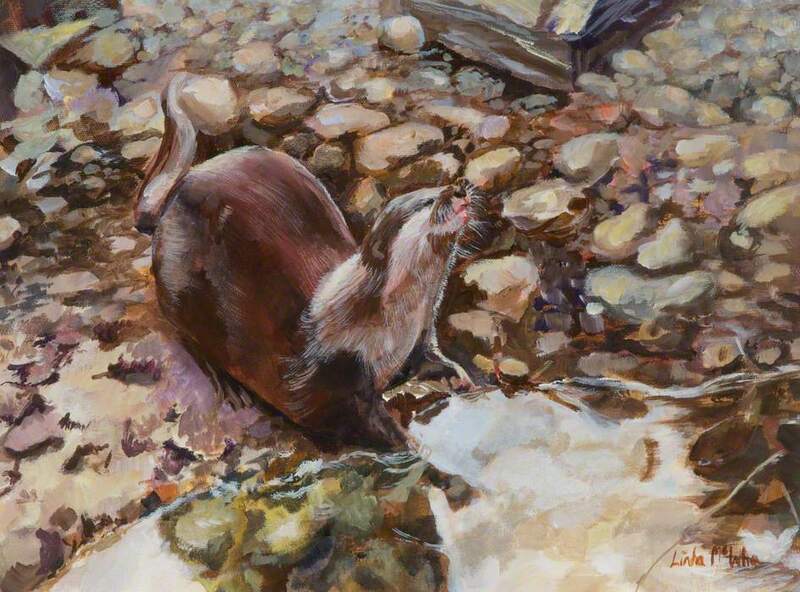 “The Otter” part of the Northern Ireland Civil Service Art Collection. 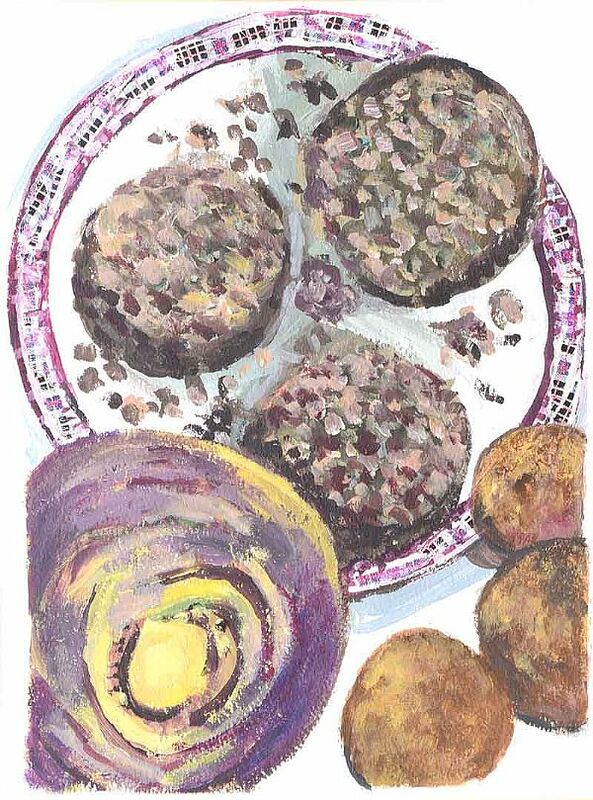 “Address to a Haggis” mixed media (11″ x 8″), unsold at Ross’s – 13/9/2017. 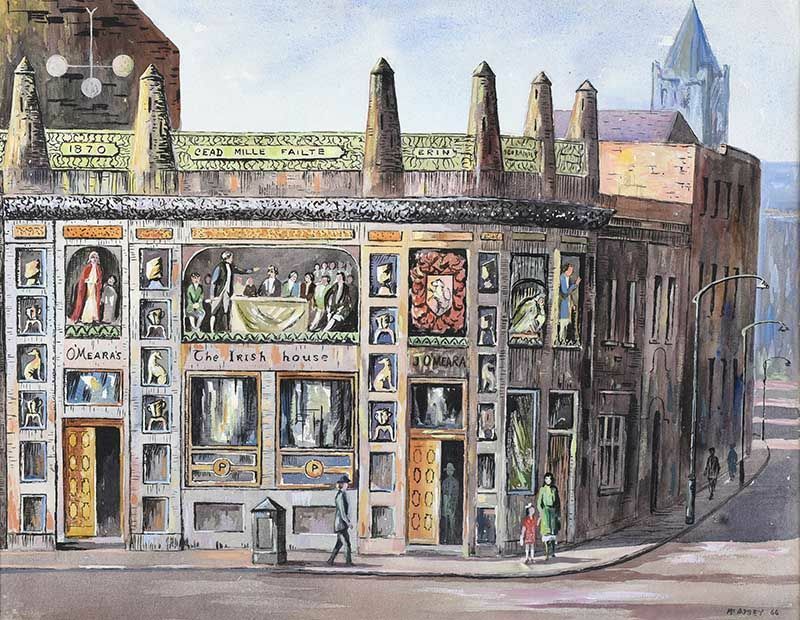 Joseph McWilliams was a Belfast born artist known for his satirical depictions of Orangemen and images of the Troubles. 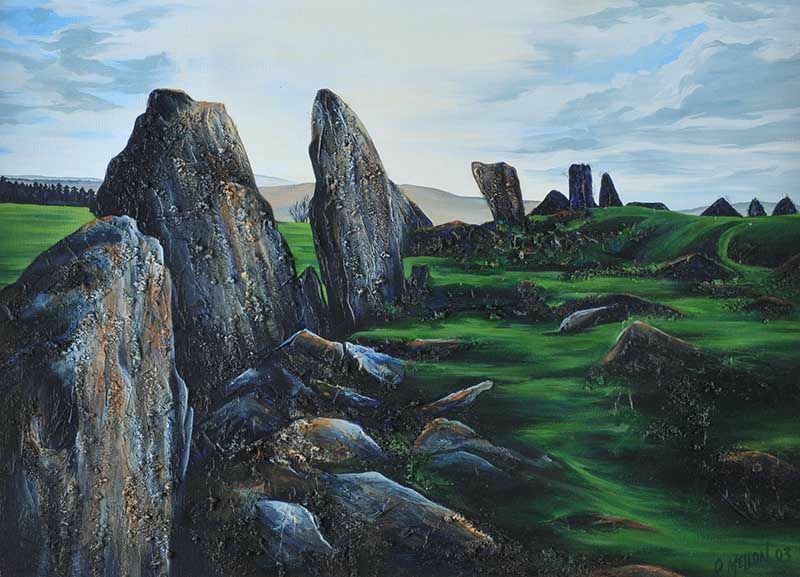 “Drumcree Sunset” dated 2003, oil on canvas (48″ x 60″) . 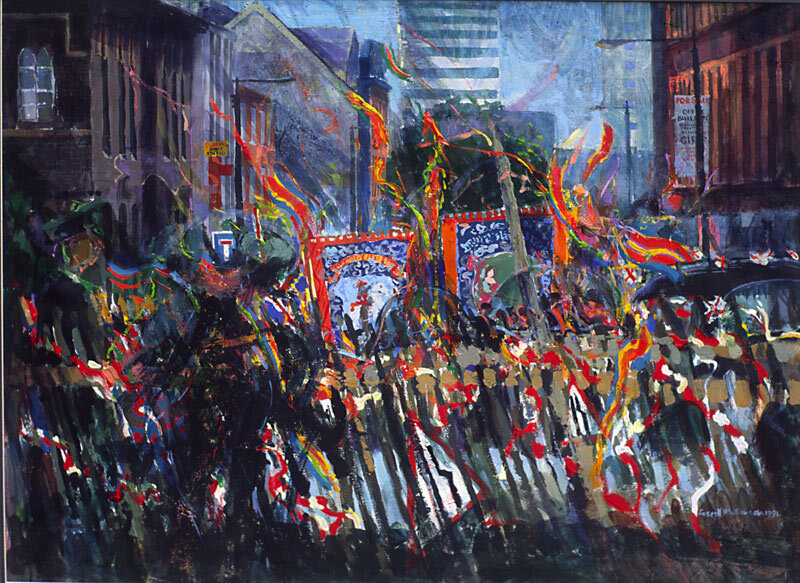 “Orangemen in Donegall Street, Belfast” dated 1991 (18″ x 24″) acrylic on board. 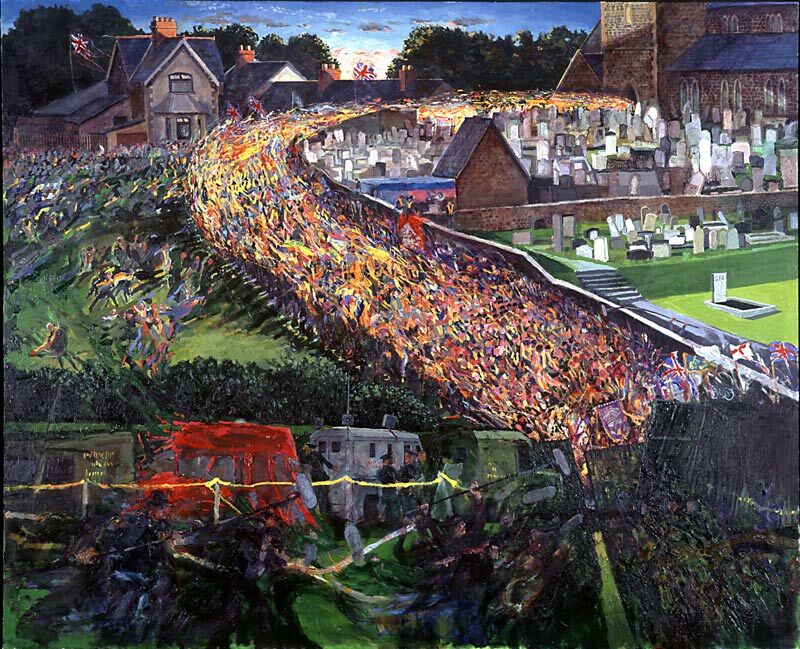 Whatever your politics his paintings of Orange parades are visually stunning. Be sure to check-out the late artist’s website which is packed with more iconic images. 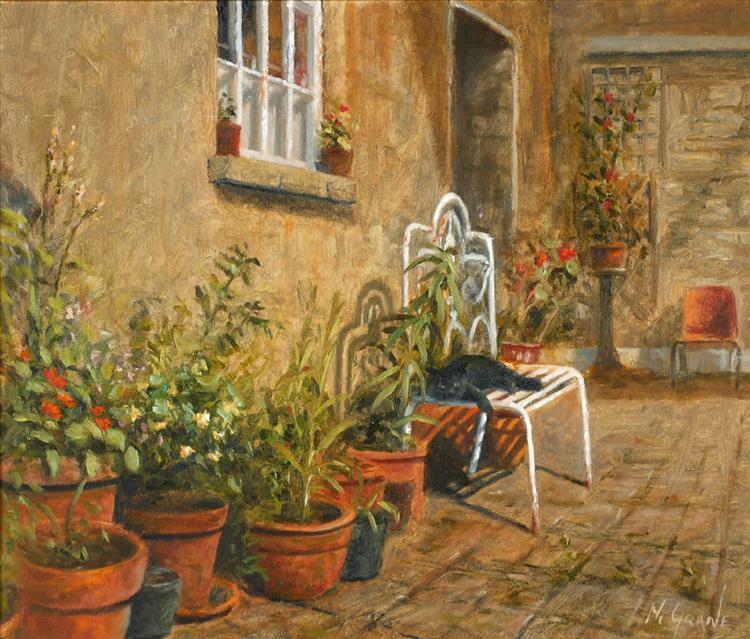 Dublin born Michael McWilliams has been working as a professional artist for over thirty years. 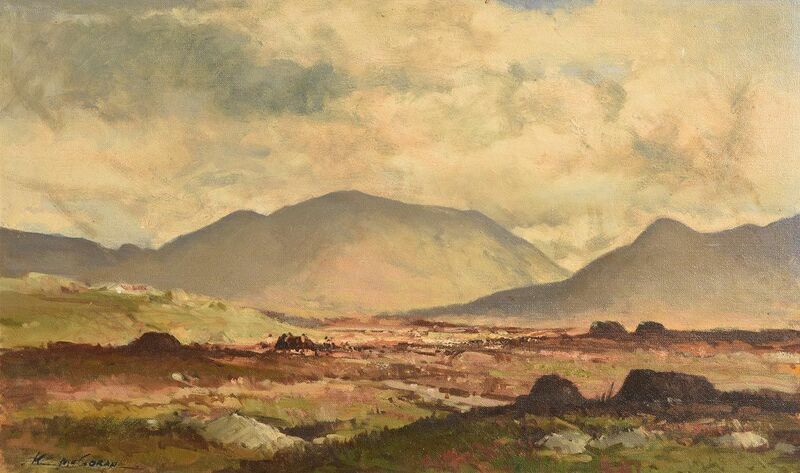 “Roundstone Bog, Connemara” oil on canvas (17.5″ x 23.5″), sold at Dolan’s (Connemara Sale) – August 2017 for €2,200. 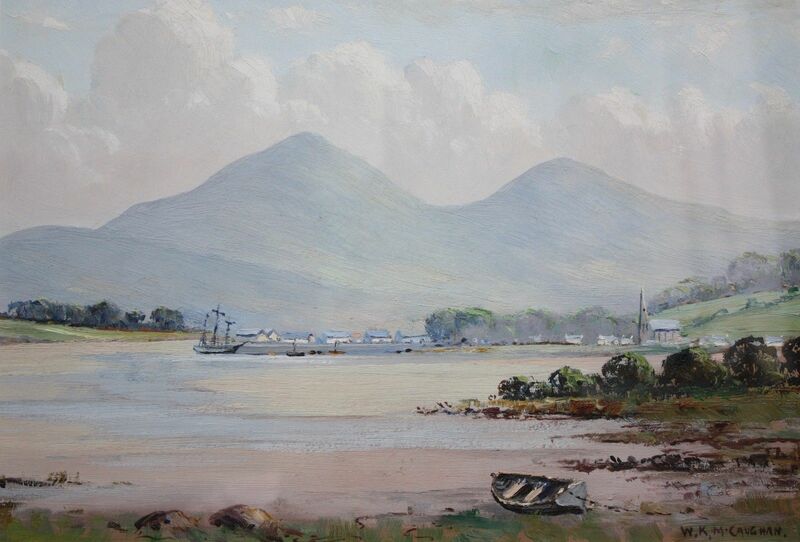 “Bantry Bay” (1989) oil on canvas. Sold at Whyte’s – 25/7/2016 for €400.00. 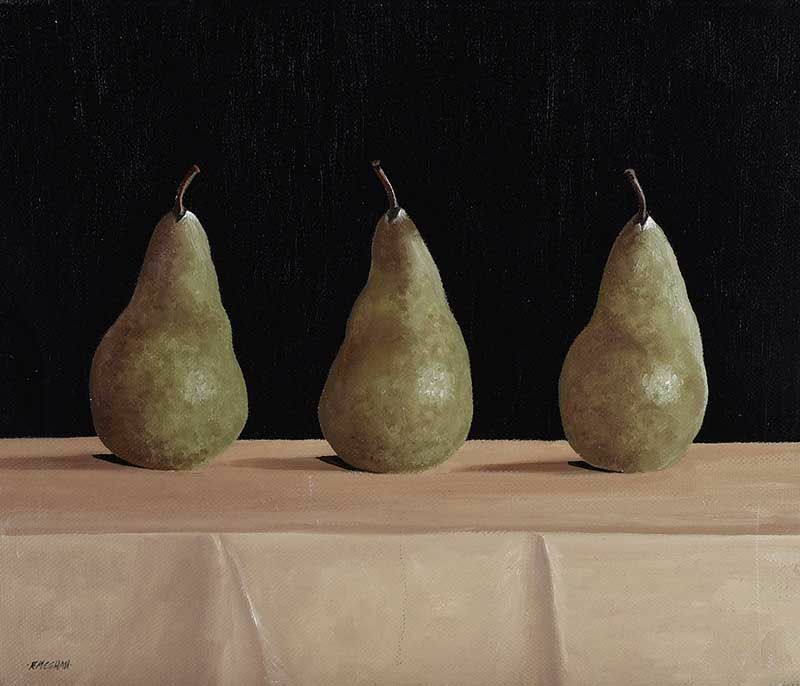 “Three Pears” oil on canvas (10″ x 22″), sold at Ross’s – 10/4/2019 for £140.00. 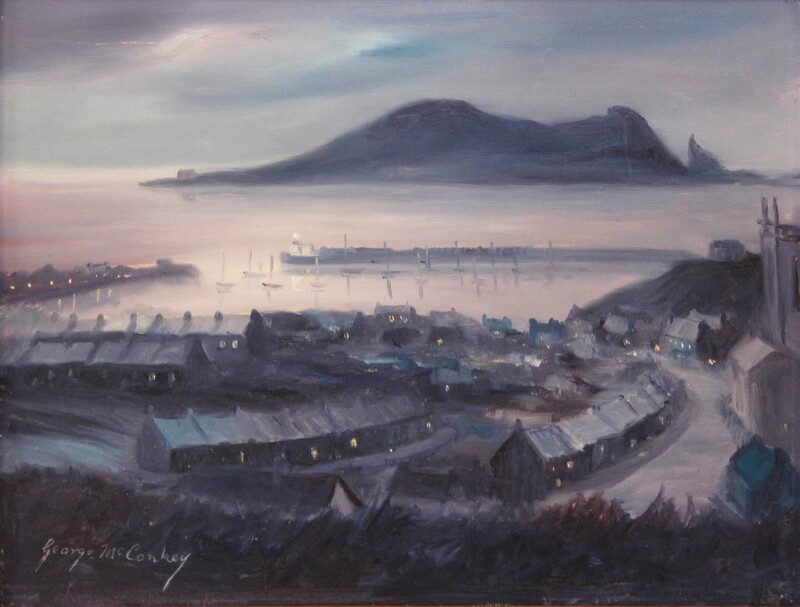 Tipperary born artist now living and working in Dun Laoghaire, County Dublin. “Beltine from the East” oil on canvas (16″ x 22″), sold at Ross’s – 28/6/2017 for £50.00. 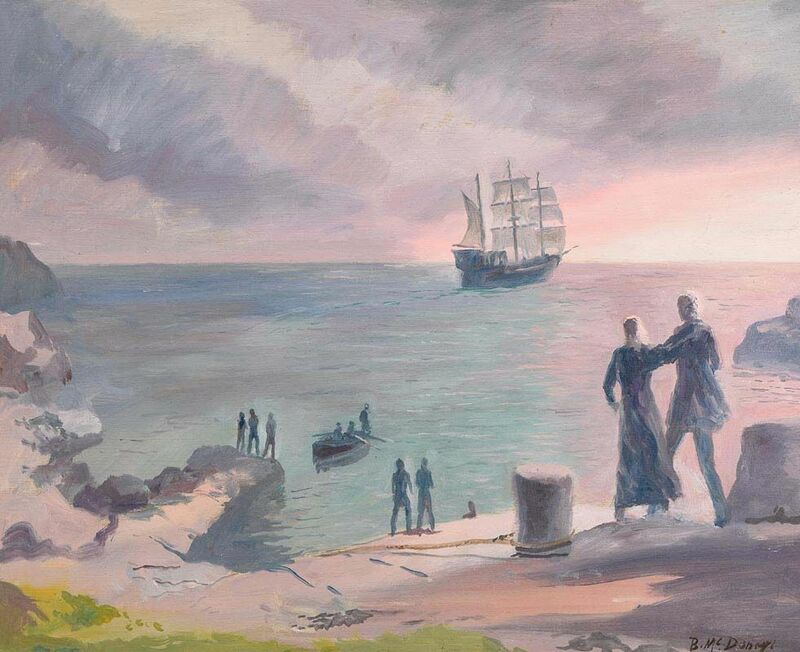 “Leaving Time” dated 1996, oil on canvas (20″ x 30″), sold at Ross’s – 6/2/2013 for £50.00. “Path by the Lough” oil on canvas (14″ x 28″), unsold at Ross’s 3/5/2017. “Annalong Harbour” oil on canvas (14″ x 28″), sold at Ross’s 10/8/2016 for £50. Anne Merrins was born in Dublin in 1961. She emigrated to Canada with her family at the age of 15, where she lived for 15 years, studying art at McGill University, in Montreal. 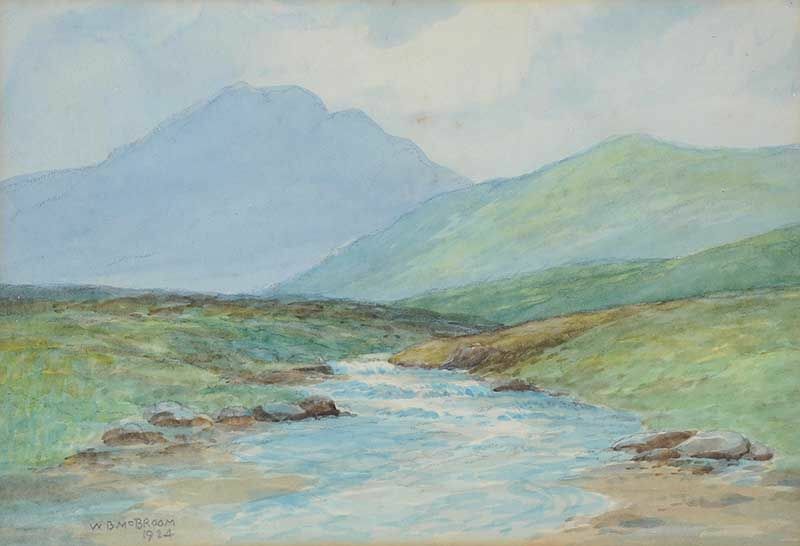 While the Canadian wilderness proved a great inspiration, it is the stark ‘Irishness’ of Connemara and its people that has always been at the heart of her work. In a career spanning 25 years, she has participated in many group and solo exhibitions both in Canada and Ireland. 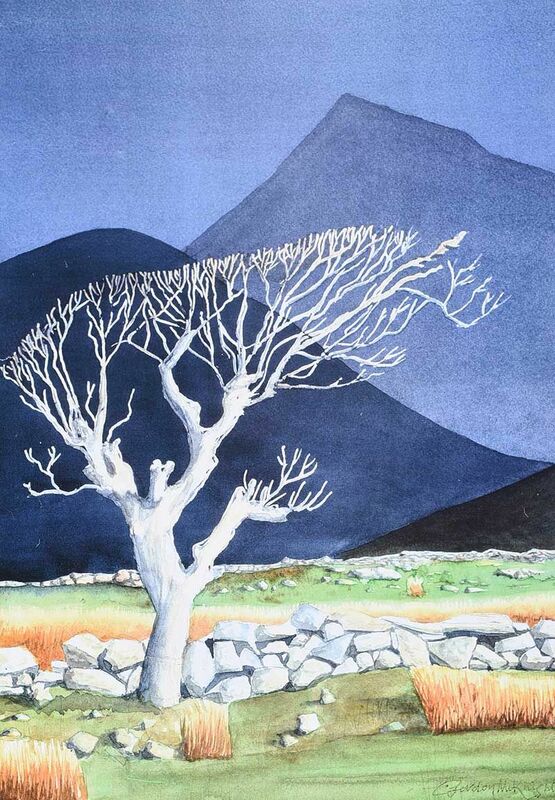 She has exhibited in the Sales Gallery of the Montreal Museum of Fine Arts, and in both The Royal Hibernian Academy’s Banquet and Annual Exhibitions where, in 1992, she won ‘The Award for Work of Exceptional Merit in Watercolour’. 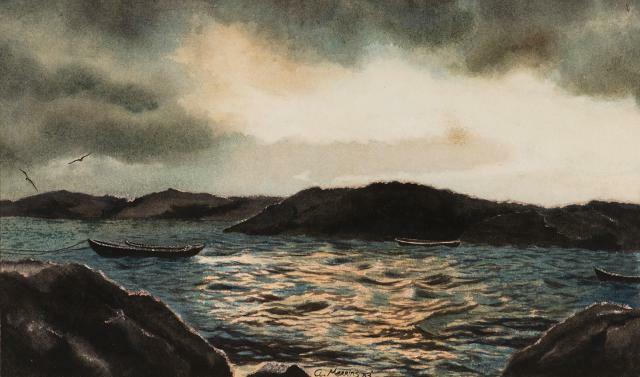 “Currachs by Moonlight” watercolour (11″ x 18.5″), sold at Dolan’s – 8/2018 for €100. 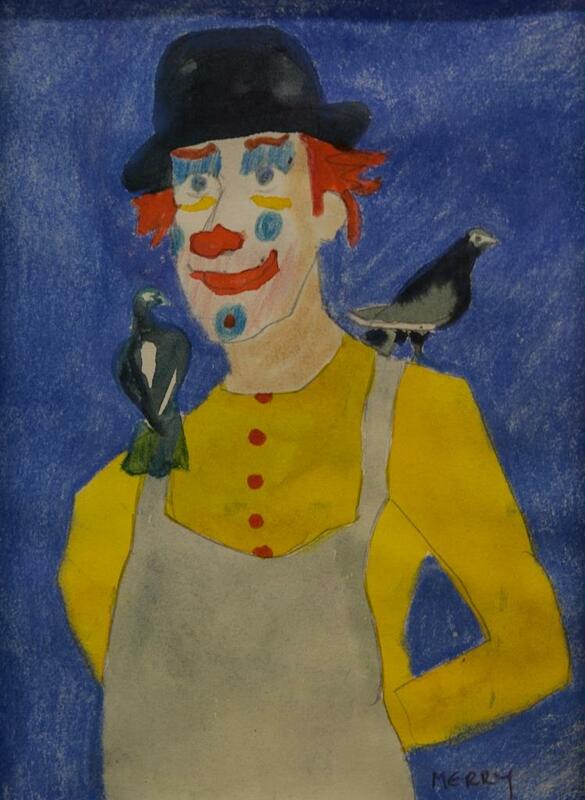 “Circus Clown” mixed media (9″ x 6.5″). 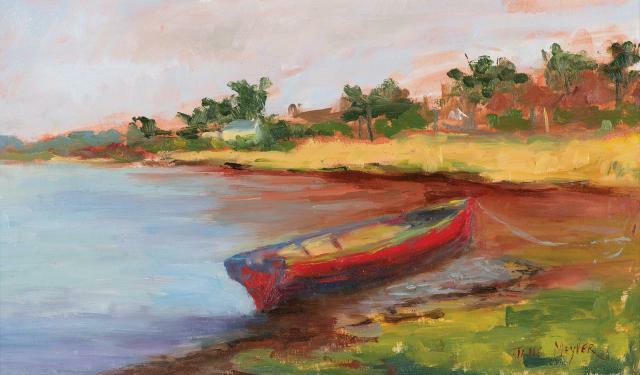 “Red Boat at Burrow Beach, Rosslare” oil on board (6.5″ x 11.5″), sold at Dolan’s ‘Rosslare Sale‘ – 30/4/17 for €150.00. 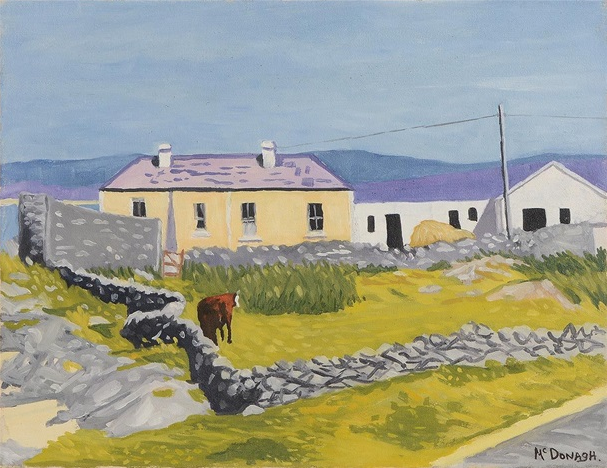 “A Stones throw away” oil on board (15″ x 21″), sold at Morgan O’Driscoll’s – 28/5/2018 for €300.00. “Before the Storm, Galway Bay” oil on canvas (29″ x 49″), sold at Adam’s – 27/9/2017 for €3,600. 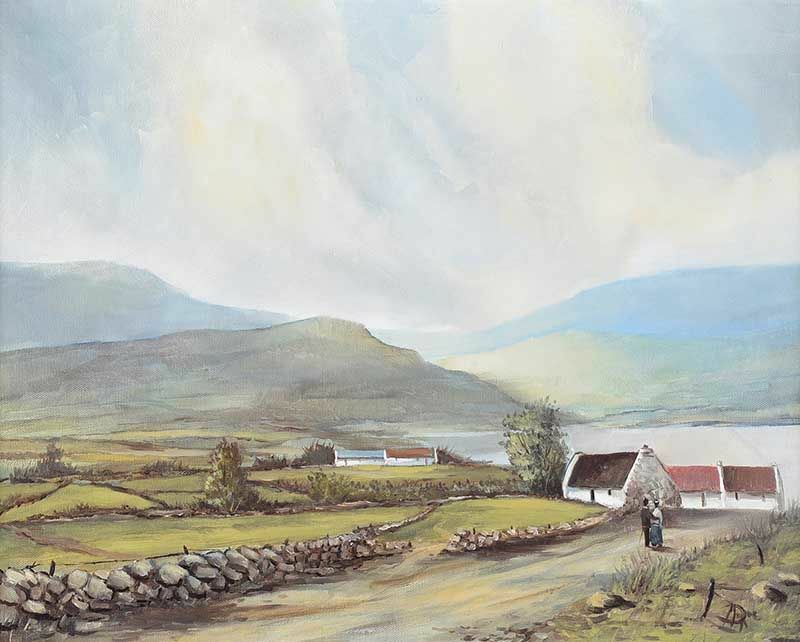 “Knock-na-Carra, Galway Bay” oil on canvas (13″ x 21.5″), sold at Sheppard’s (Durrow) – 26/9/2017 for €1,500. 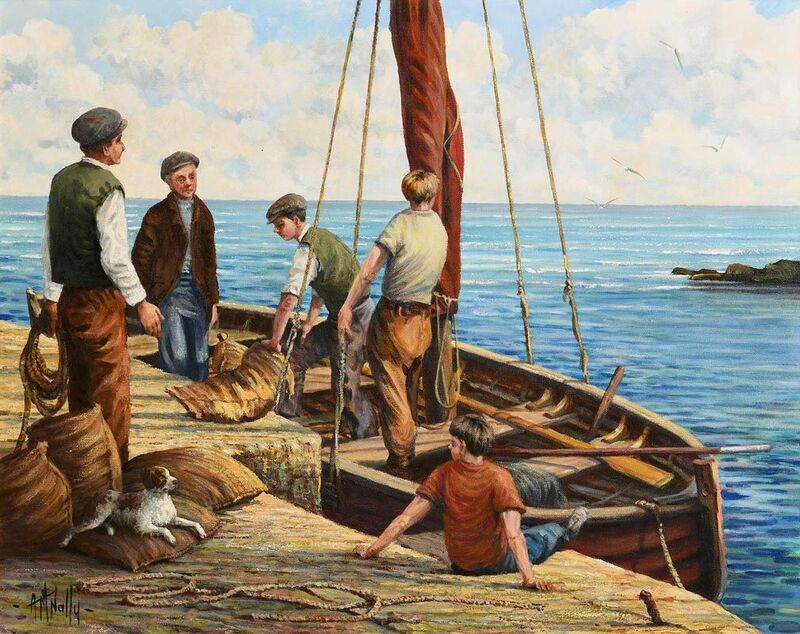 “Landing the Catch” oil on canvas (18″ x 32″), sold at Morgan O’Driscoll’s – 3/12/2018 for €2,300. 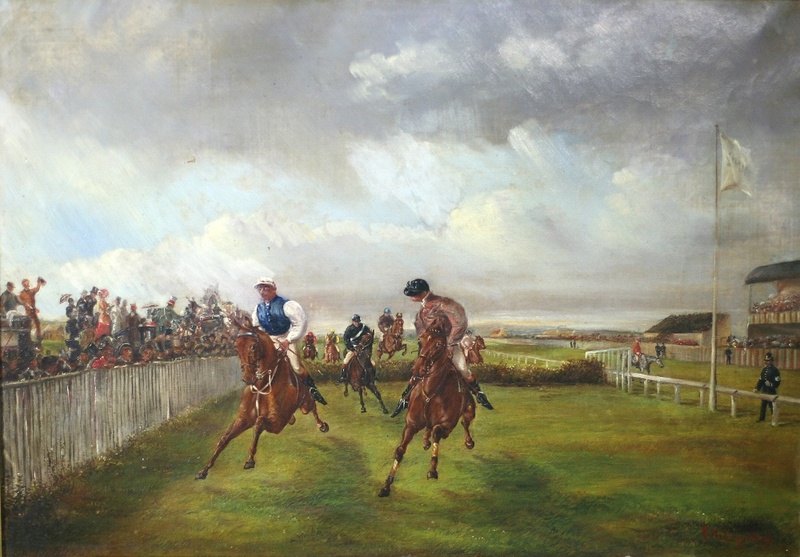 “Crossing the Brook the Second Time – Metropolitan Cup, Baldoyle, May 1879” oil on canvas (14″ x 20″), sold at Fonsie Mealy’s – 26/7/2017 for €480.00. 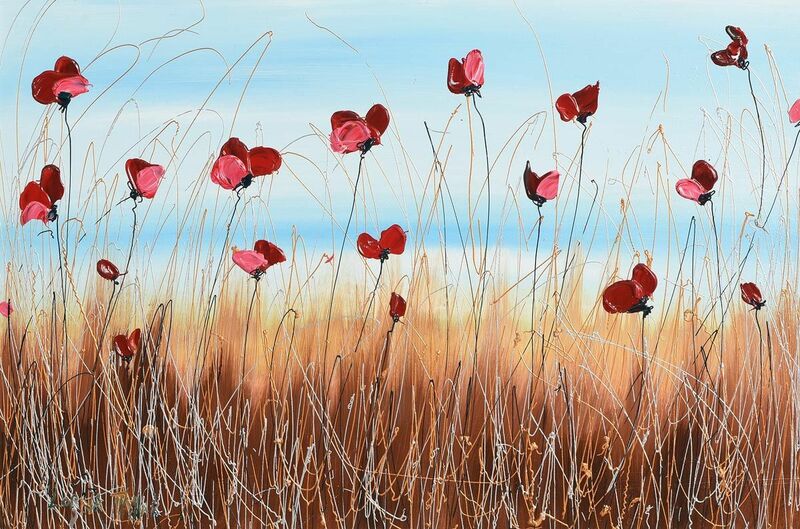 “Bank of Poppies” acrylic on board (20″ x 30″). 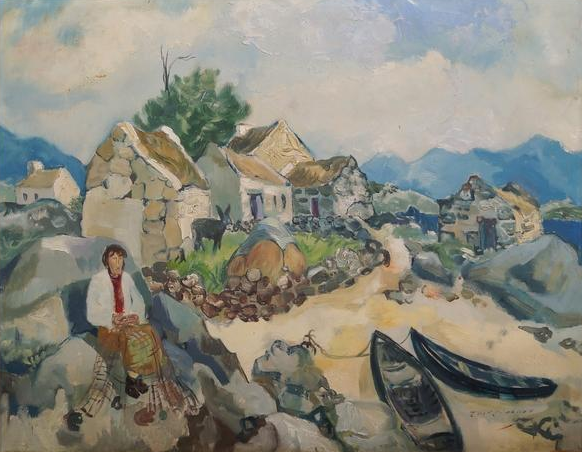 Sold at Morgan O’Driscoll’s – 2/8/2016 for €650.00. 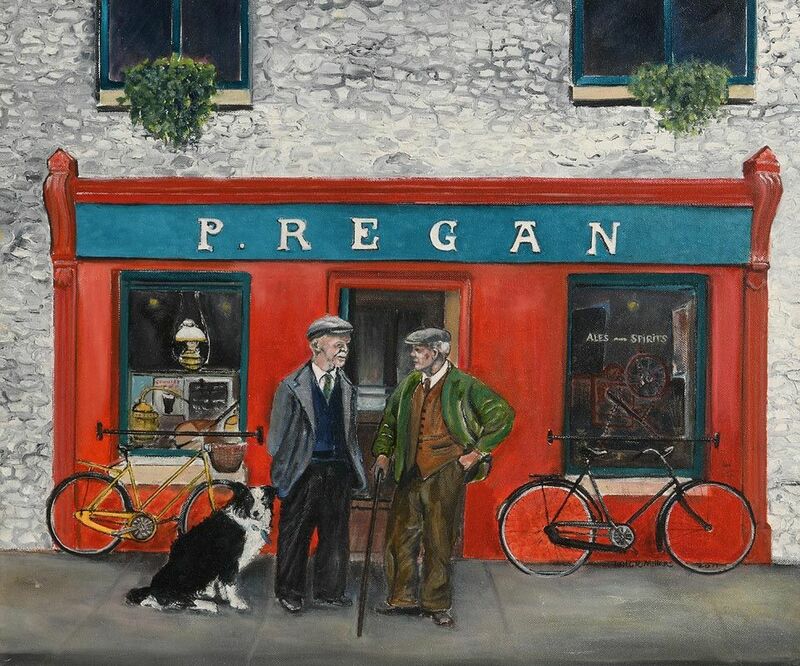 “Paddy Regan’s Pub” oil on canvas (20″ x 24″), sold at Morgan O’Driscoll’s – 2/10/2018 for €200.00. 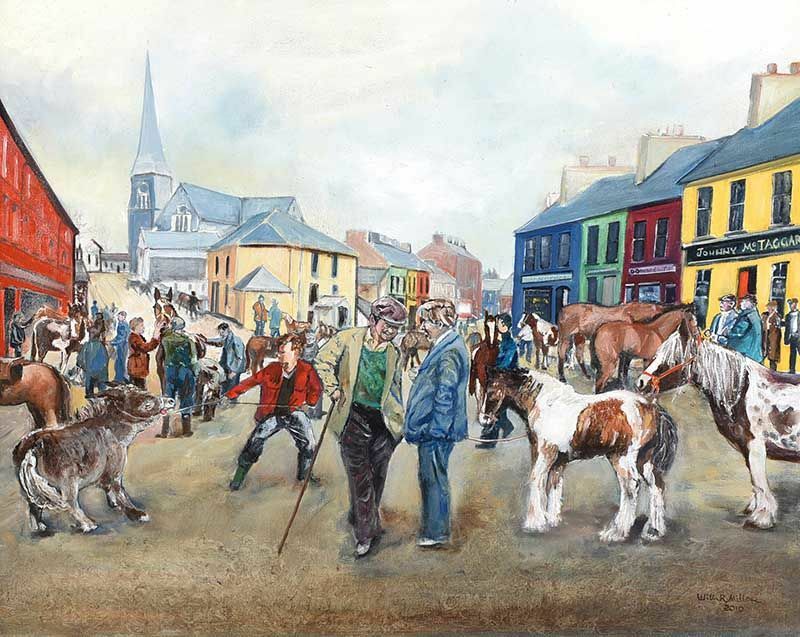 “Omagh Horse Fair” oil on canvas (24″ x 30″), unsold at Ross’s – 10/10/2018. 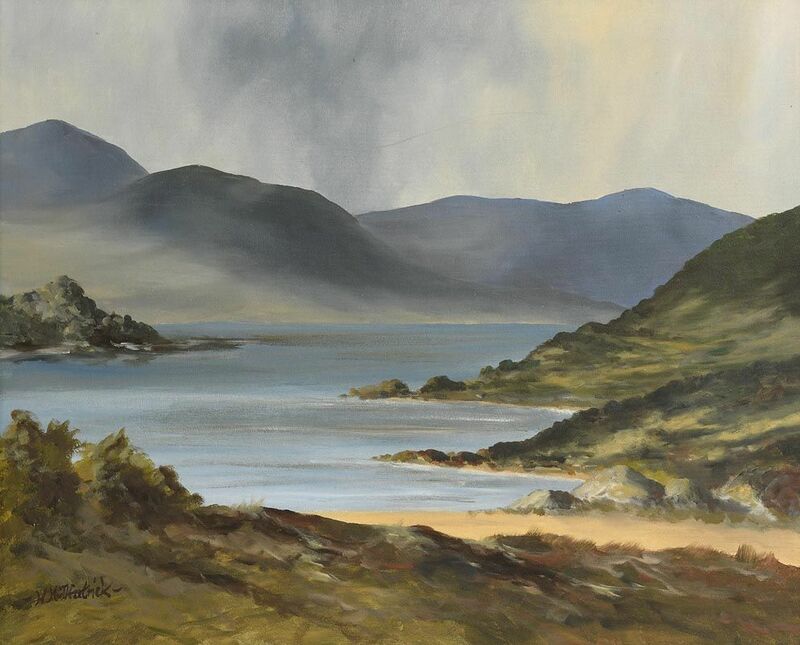 “Mulroy Bay, Donegal” oil on canvas (12″ x 16″), sold at Ross’s – 8/8/2018 for £40.00. Edgar Parker Mills was born in Bandon, Co.Cork where his father was a Professor of Music. Ordained a deacon for the Church of Ireland Diocese of Kilmore in 1919 and served his ministry as Canon of St. Fin Barre’s Cathedral, becoming Precentor in 1969. 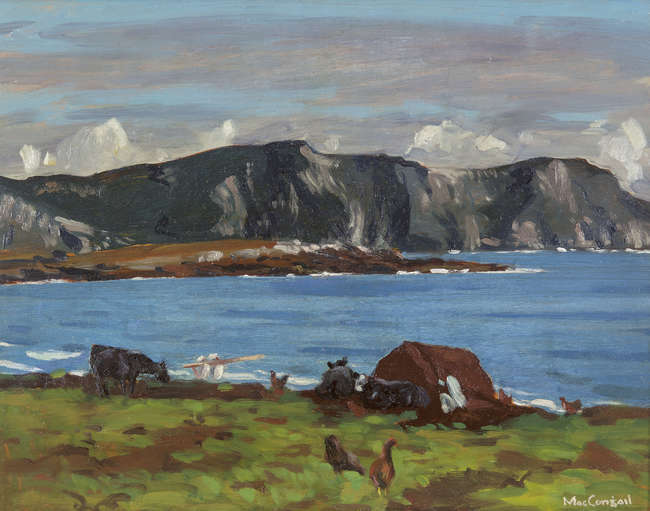 “Killybegs” 1958, oil on board (12″ x 16″), sold at Morgan O’Driscoll’s – 26/6/2017 for €140.00. Artist, art critic, prolific writer and broadcaster. 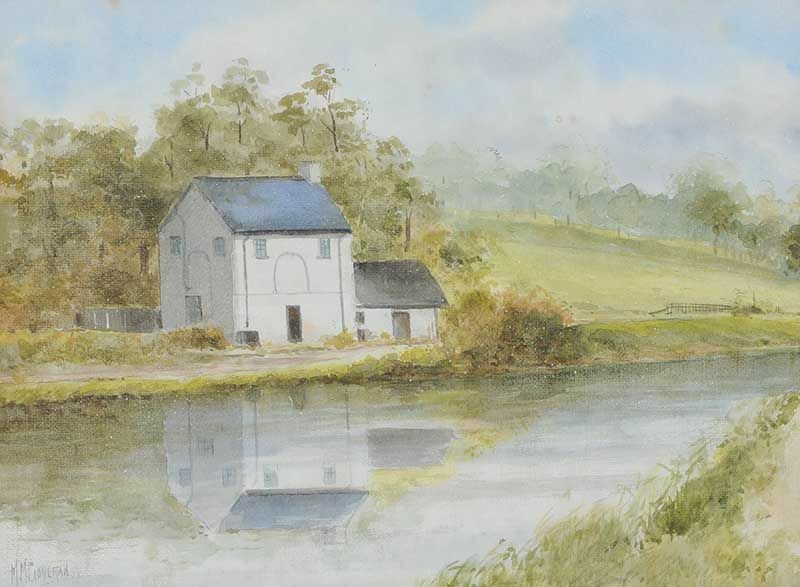 “Castle Leslie, Co.Monaghan” watercolour (1986) sold at Whyte’s 8/3/2000 for €406.00. 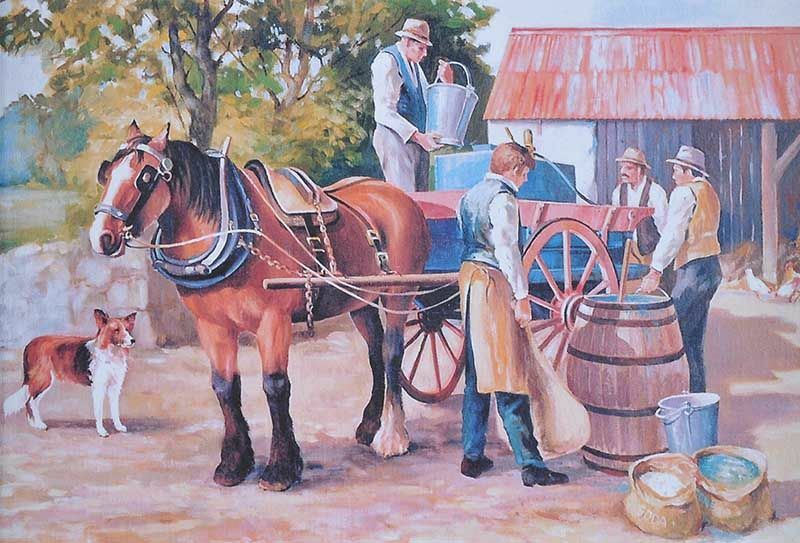 This was one of a series of paintings created by the artist for his book “The Noble Dwellings of Ireland“(1987). 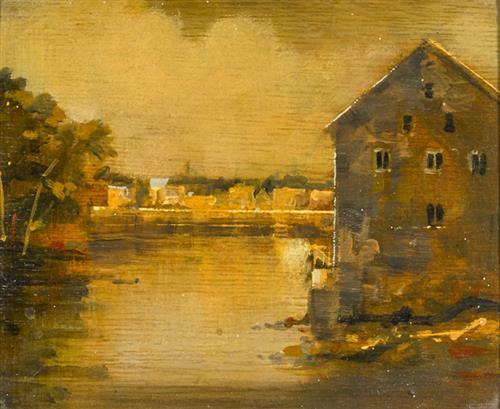 Left to right: “Birthplace of Jonathan Swift, 1667” watercolour drawing – sold at James Adams 23/9/13 for €750.00; “On the Quays, Dublin” watercolour (10″ x 14″) sold at Adam’s 28/9/2016 for €3,200.00 and right – the much sought after “Vanishing Dublin” (1966) which contains 50 or so of the artist’s paintings. Although signs are that the book is not as popular in recent years, you can still expect to pay €300/400 for a good copy. “A County Mayo Lake” oil on canvas board (12″ x 16″), sold at Whyte’s – 26/9/2016 for €1,900. 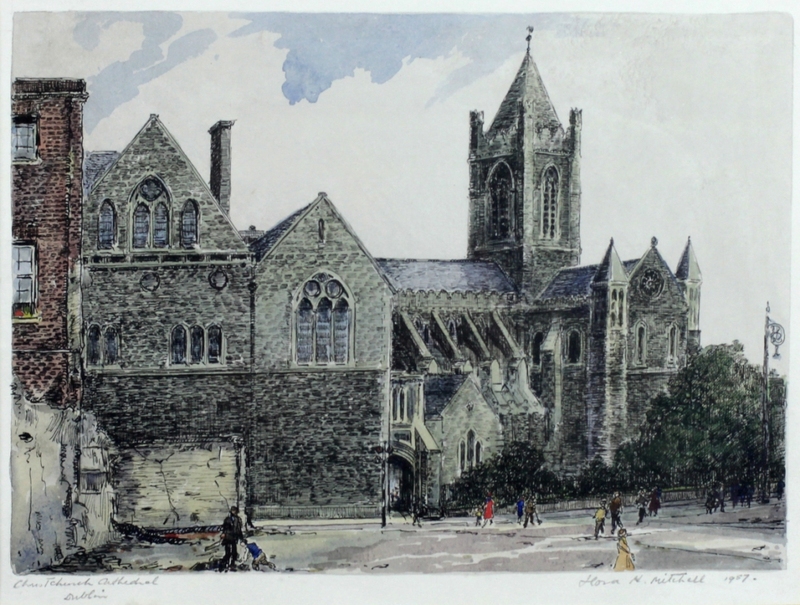 “Christ Church Cathedral, Dublin” dated 1957, pen and ink (9″ x 12″), sold at Fonsie Mealy’s – 8/3/2017 for €1,550.00. 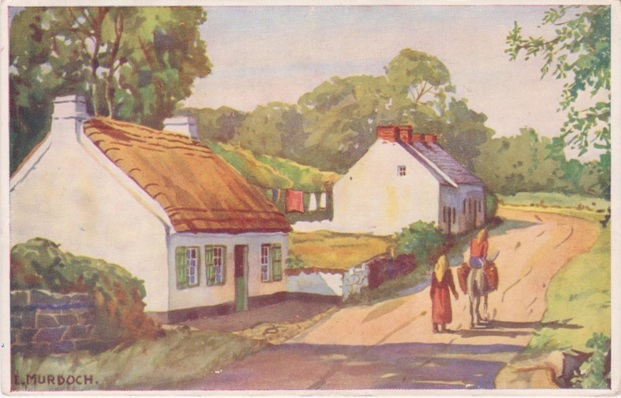 “Old Portobello, Rathmines” dated 1940, gouache (10″ x 14″). “Reeds by a River” watercolour drawing (12″ x 19″), sold at Ross’s – 28/6/2017 for £20.00. “At the Feis” oil on board (19″ x 15″), sold at Ross’s – 16/1/2019 for £100.00. 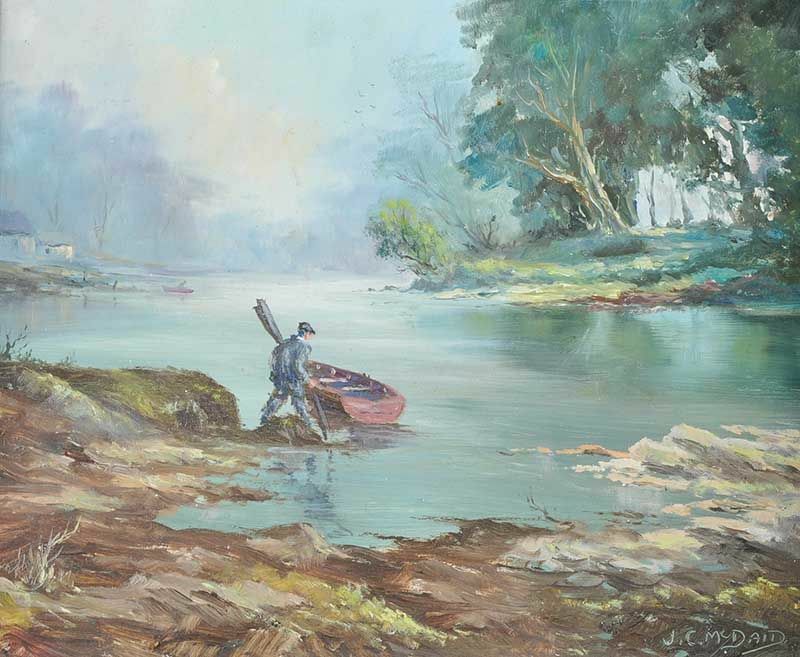 “Peaceful Morning, The River Braid” oil on canvas (18″ x 24″), sold at Ross’s – 7/9/2016 for £120.00. “Donegal” oil on canvas (16″ x 20″), sold at Ross’s – 8/11/2017 for £120.00. 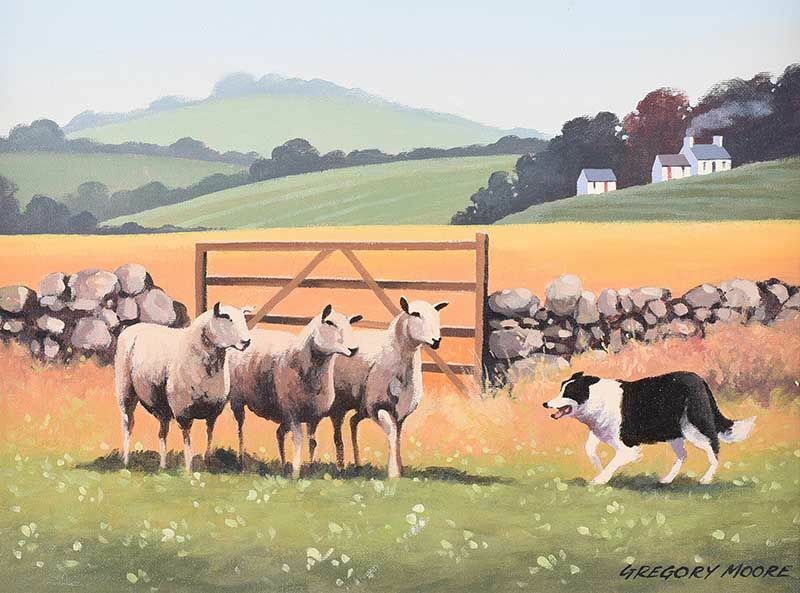 “Harvest Time” oil on canvas (20″ x 30″), sold at Ross’s – 5/10/2016 for £140.00. 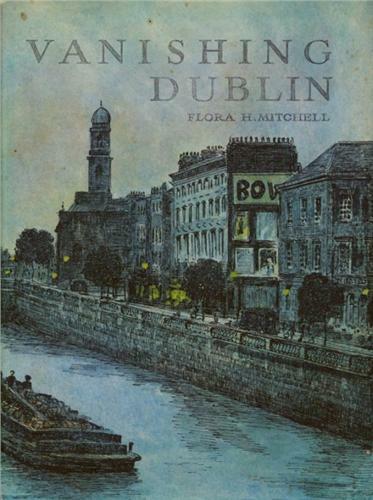 Dublin born architect, poet, artist and literary critic. 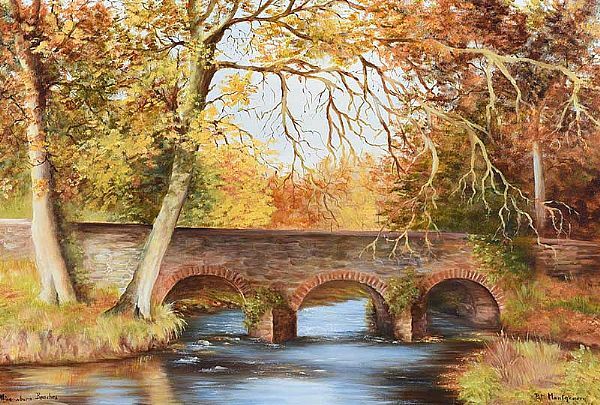 “Minnowburn Beeches” oil on canvas (20″ x 30″), sold at Ross’s – 23/5/2018 for just £30.00. Born in Belfast. Studied at University of Ulster, Brighton Polytechnic College of Art and Design, and The Slade School of Fine Art. 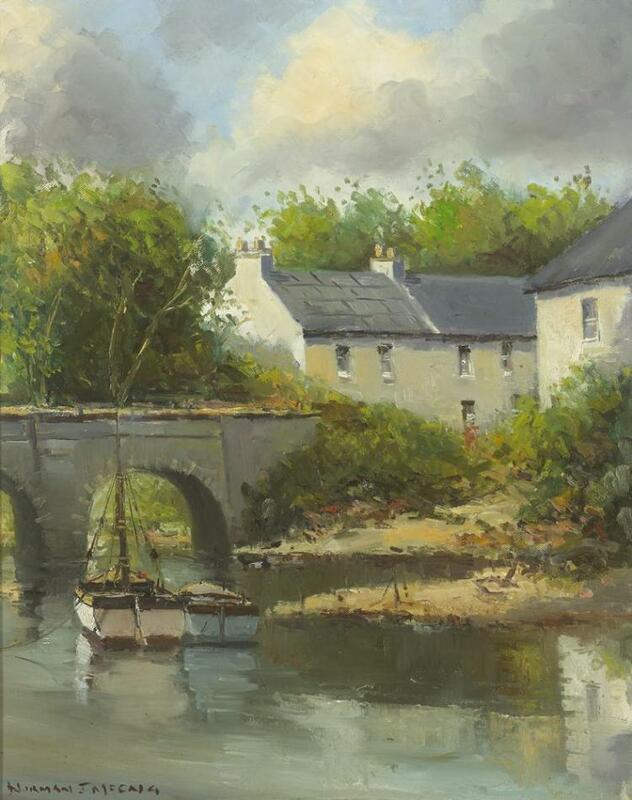 “Ramelton, Fish House” (1995) oil on panel, sold at Whyte’s – 25/7/2016 for €340.00. 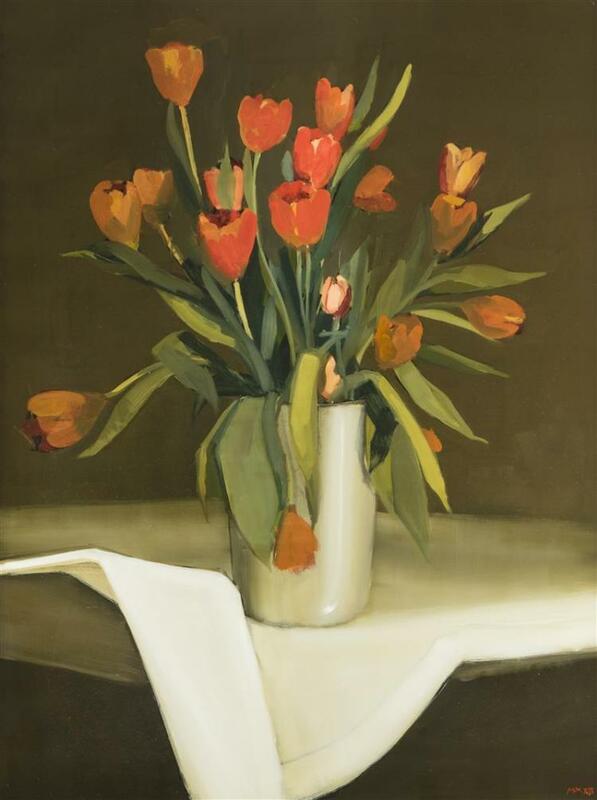 Left to right: “Red and Tangerine Tulips“ (2012), oil on board (48″ x 36″), sold at John Moran Auctioneers, Monrovia (California) – 24/4/2018 for $2,750; and “Looking towards the Four Courts, Dublin” oil on linen (36″ x 48″), sold at de Vere’s – 12/6/2018 for €8,000. 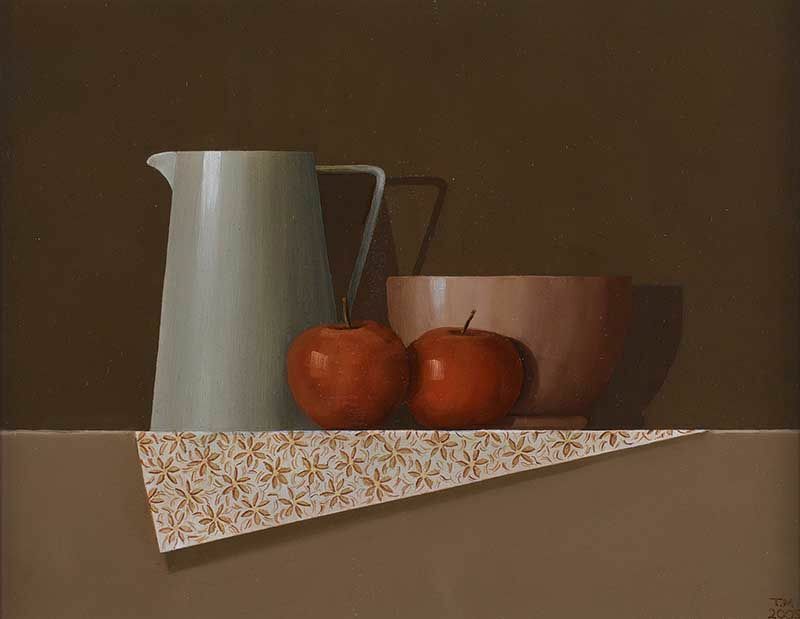 “Still life, jug, bowl & apples” oil on board (11″ x 14″), sold at Ross’s – 8/11/2017 for £280.00. 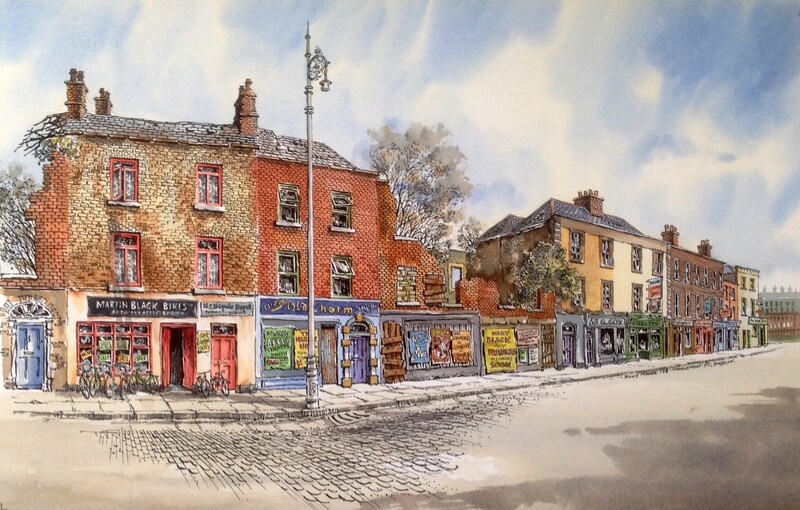 “Vanished Charlemont Street, Dublin” pen and watercolour (19″ x 25″) – exhibited at The Dublin Painting and Sketching Club 2018 Exhibition. 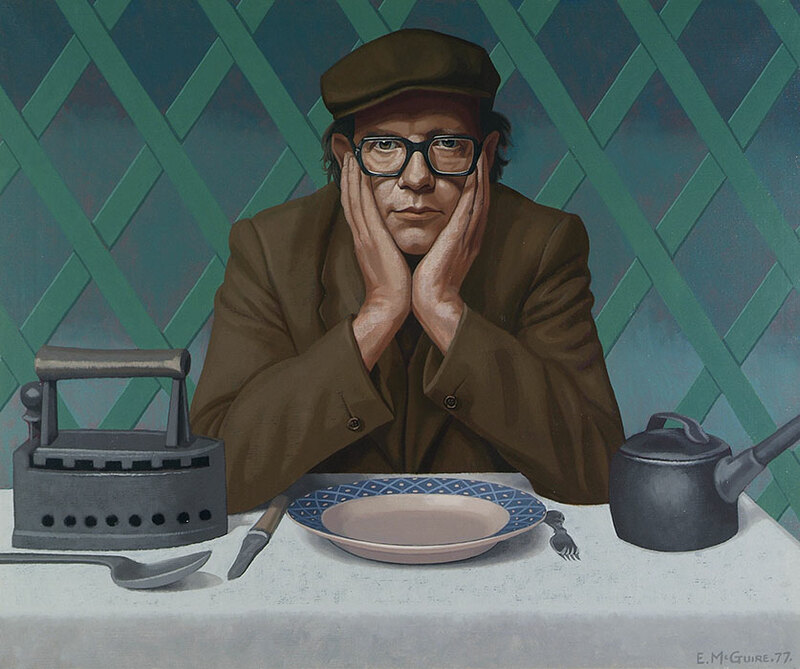 Gregory Moore comes from Larne in County Antrim but now lives in Glasgow where he works as a full-time artist. 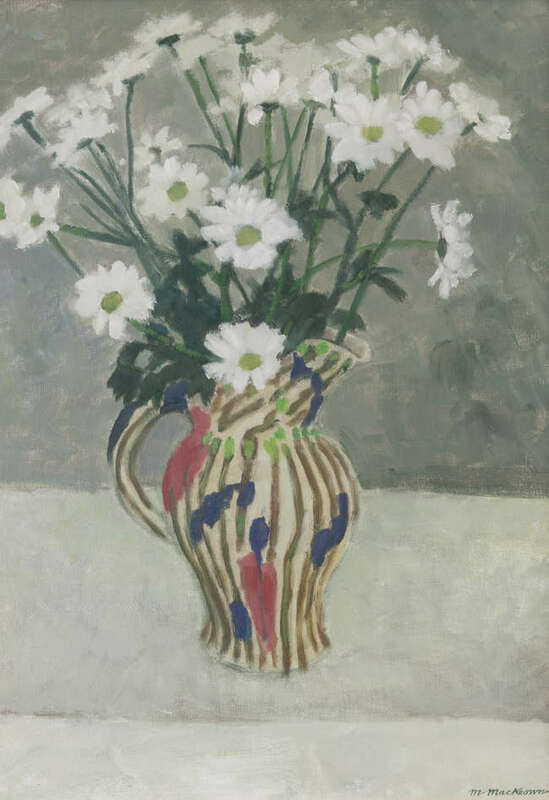 From a very young age, he was interested in drawing and painting and went on to study at the Belfast College of Art where he graduated with a B.A. Hons Degree in Fine Art Printmaking. He worked as a Graphic Designer for over 20 years and then went on to teach in further education. 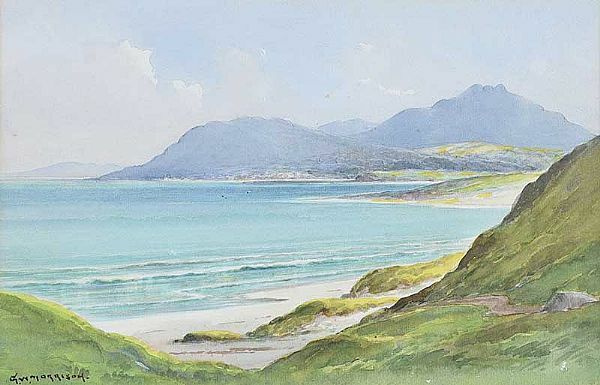 He is a member of the Pastel Society of Ireland, has exhibited in various galleries and has had exhibitions throughout Ireland. 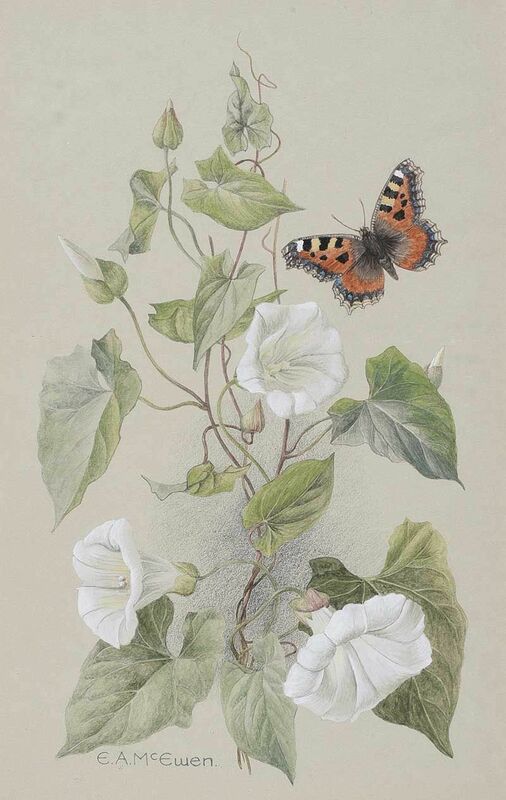 He has illustrated a number of books including A Guide to Irish Wild Flowers and his paintings were used for a series of bird posters for the RSPB. 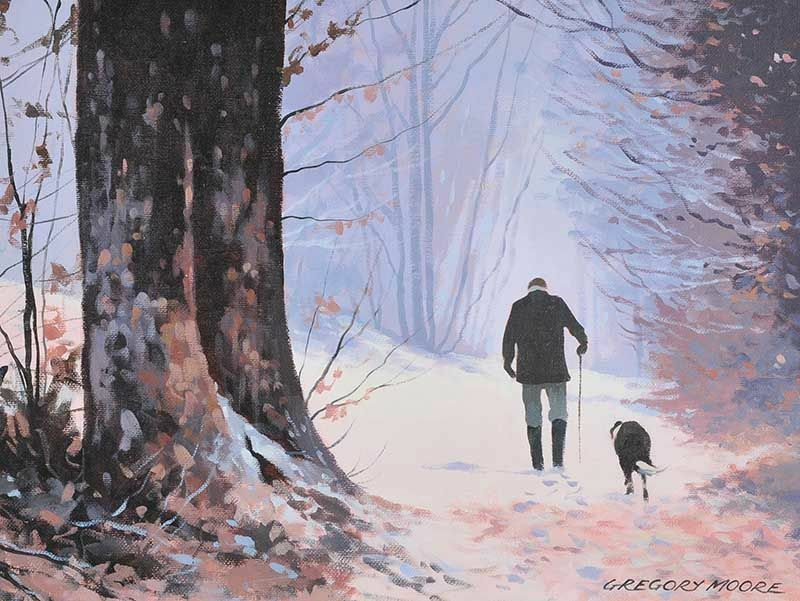 Greg has worked as an Art Tutor for many years teaching watercolour, acrylic and pastel painting classes. These classes have proven to be highly popular. 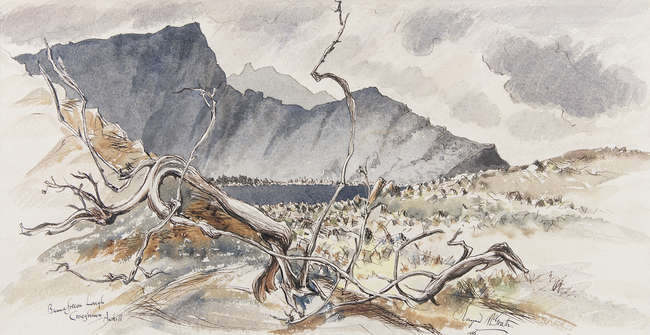 He is also in demand to demonstrate his work at art clubs and societies. 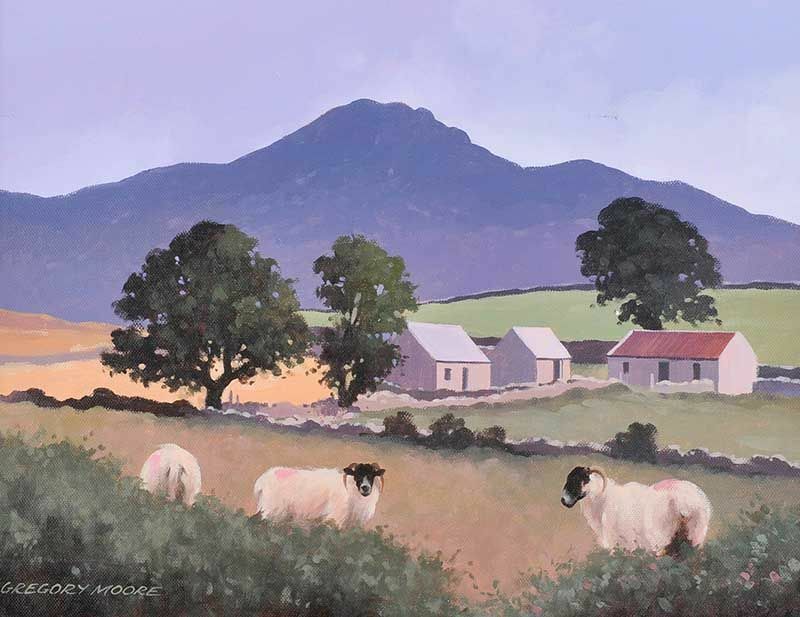 Working mainly in acrylics and pastels, his creative inspiration comes from rural Irish life, the landscape, its people and wildlife. 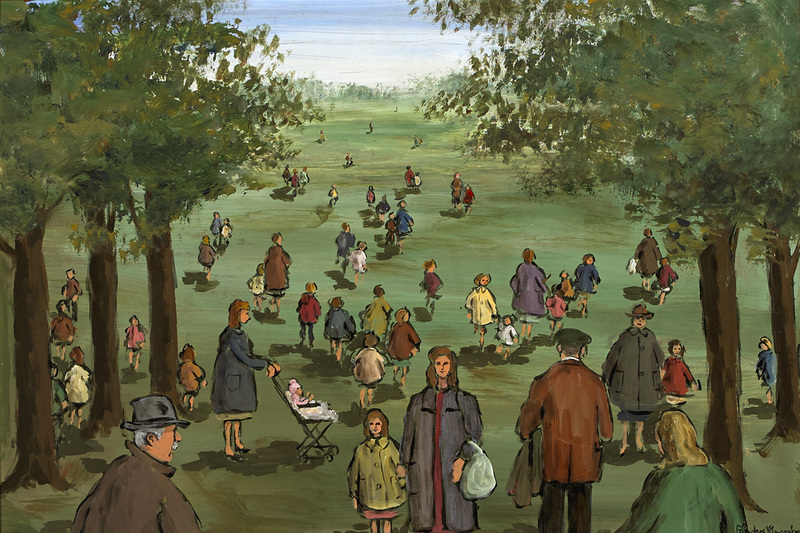 His paintings conjure up a nostalgia for times past. Left to right: “Hen & Rooster by the Cow Tail Water Pump” oil on board (12″ x 9″), unsold at Ross’s – 13/9/2017; and “Winter in the Forest” oil on board (12″ x 16″). “Tending the Sheep” oil on board (12″ x 16″), unsold at Ross’s – 11/10/2017. 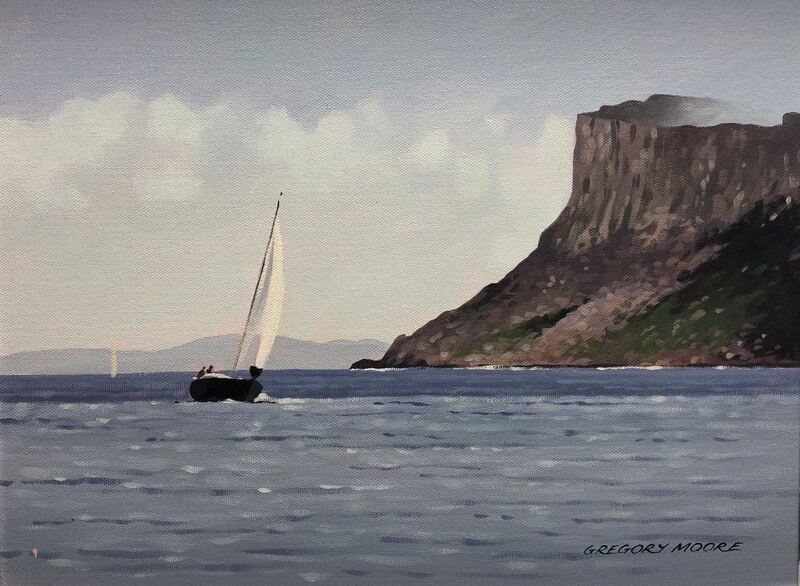 “Sailing near Fair Head” oil painting (12″ x 16″), sold on eBay – 29/7/2018 for £186.00. 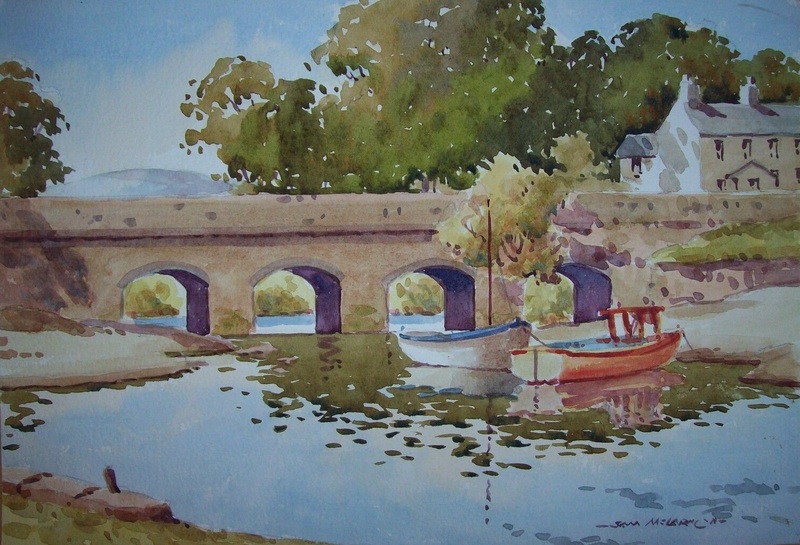 A largely self-taught artist from County Wicklow. 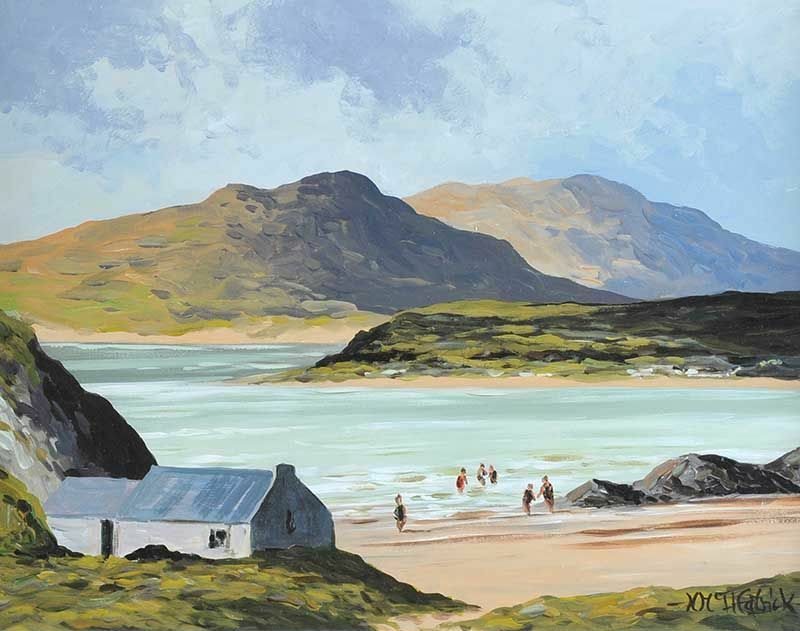 “Mannin Bay, Connemara” oil on board (16″ x 20″) – available from the Duke Street Gallery. “A Woodland Stream” oil on canvas (23.5″ x 29.5″), sold at Dolan’s ‘Rosslare Sale‘ – 30/4/17 for €3,200. 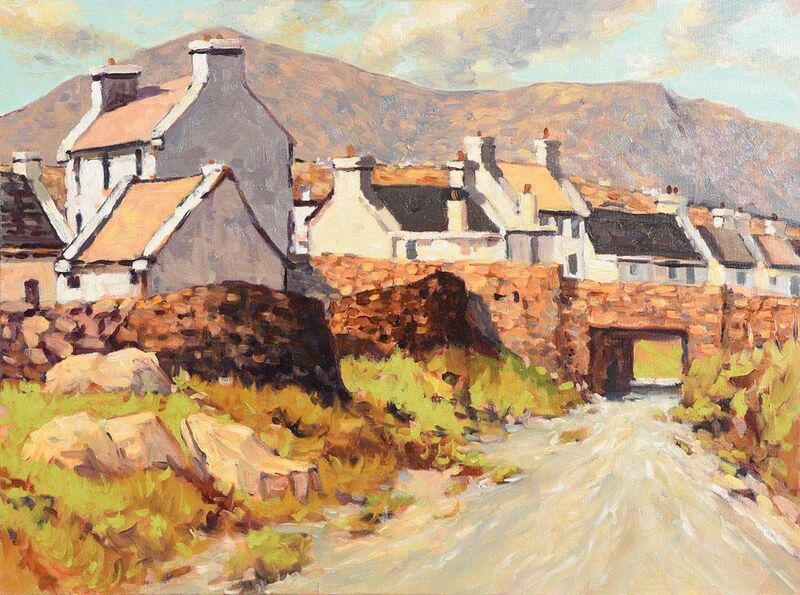 “Paddy Bawn Brosnans” oil on canvas (18″ x 24″), sold at Gormley’s – 22/11/2016 for £110.00. 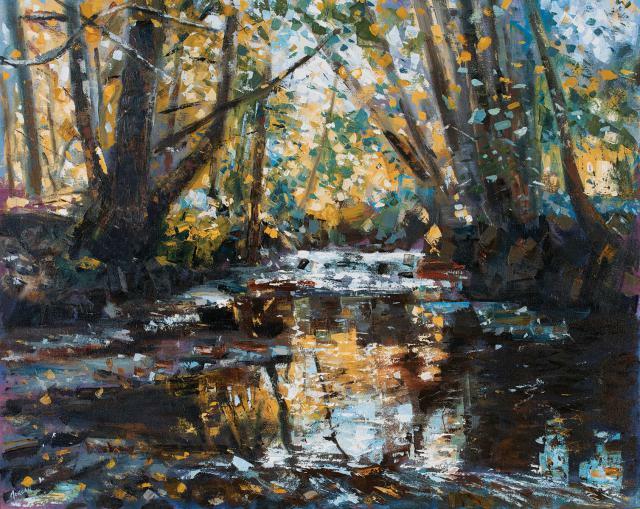 “Paddling” oil on board (18″ x 24″). 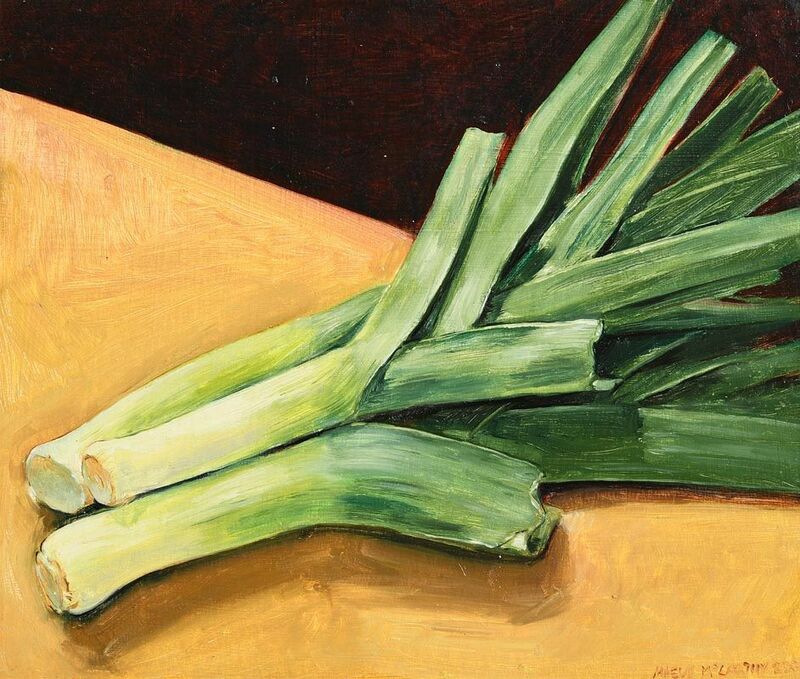 Sold at Whyte’s – 25/5/2015 for €1,000. 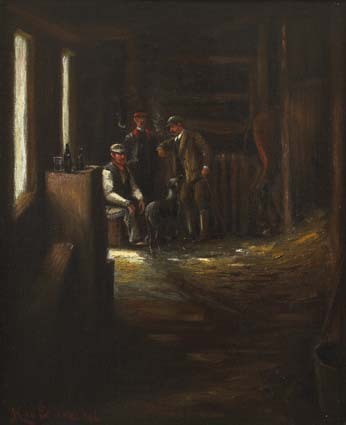 “The Apprentice” oil on canvas (24″ x 30″), sold at Morgan O’Driscoll’s – 5/3/2018 for €1,000. 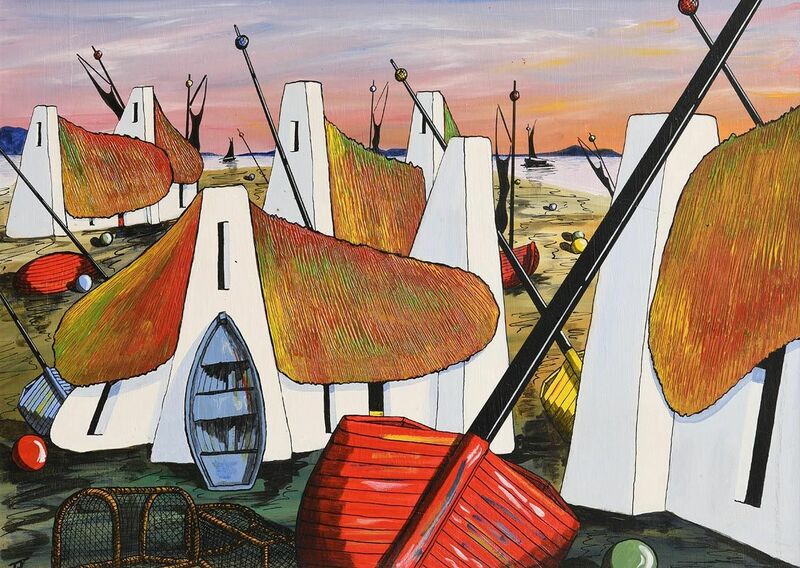 Northern Ireland artist who may also have painted under the pseudonym of Stuart White. 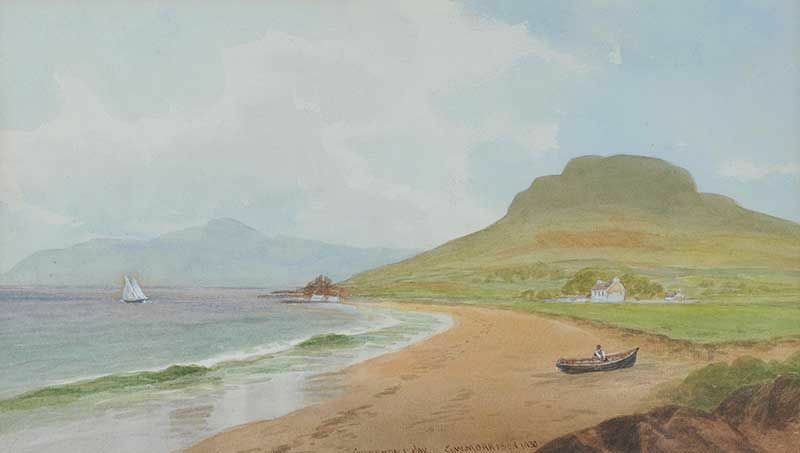 “Cushendall Bay, Co.Antrim” watercolour drawing (8″ x 14″), sold at Ross’s 1/2/2017 for £100.00. 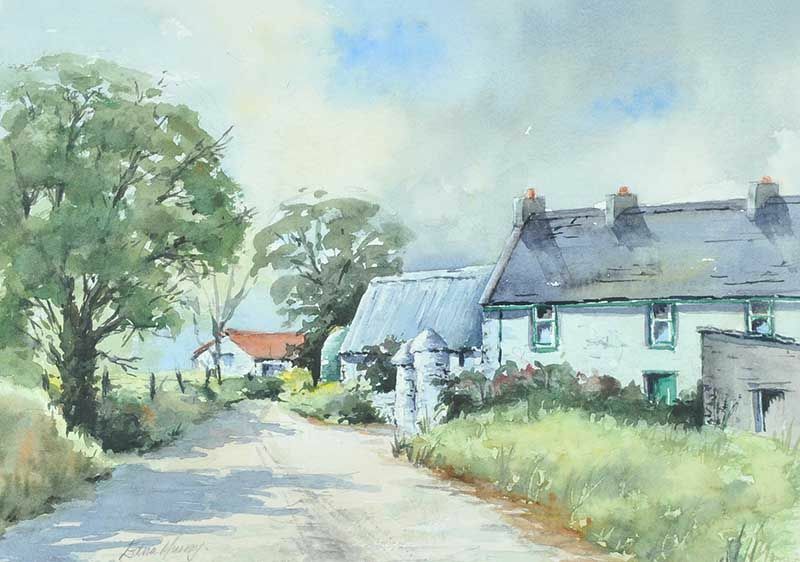 Left to right: “Tyrella, Co.Down” watercolour (10″ x 14″), sold at Ross’s 1/2/2017 for £90.00 ; and “Portnablagh” watercolour (6″ x 12″) sold at Gormley’s – 2/8/2016 for £100.00. 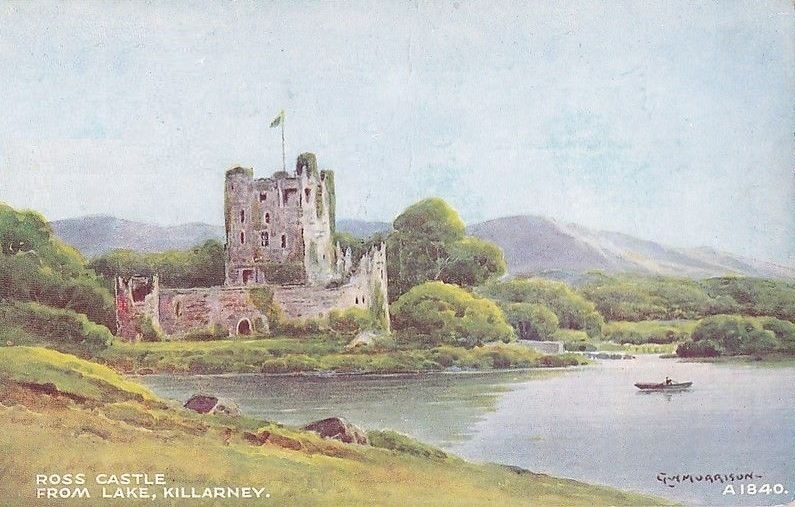 “Ross Castle from lake, Killarney” a Valentines postcard. “Bray Head, Killiney” watercolour drawing (9″ x 14″), sold at Ross’s – 13/2/2019 for £80.00. 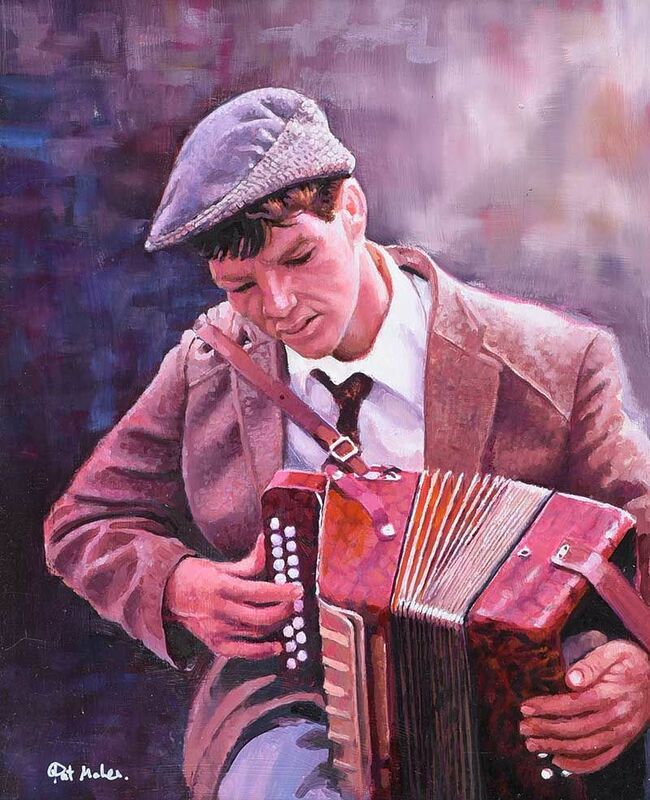 Kevin Morrissey is a self taught artist originally from Ballylanders in County Limerick. Belfast born cartoonist and book illustrator. 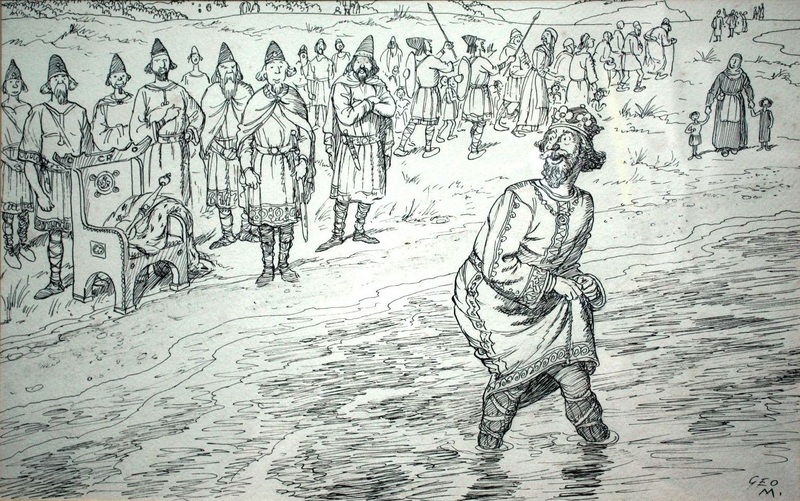 “King Canute” pen and ink drawing (10″ x 16″) – available on eBay here – 7/7/2017. 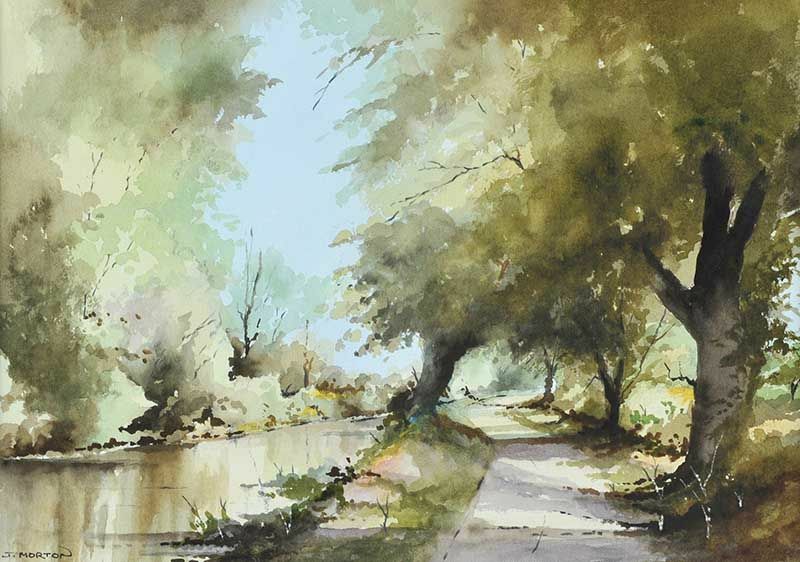 “The Tow Path” watercolour (10″ x 14″) sold at Ross’s – 28/1/2016 for £50. “Yacht – Jedi” oil on canvas (16″ x 20″), sold at Morgan O’Driscoll’s – 3/10/2016 for €300.00. 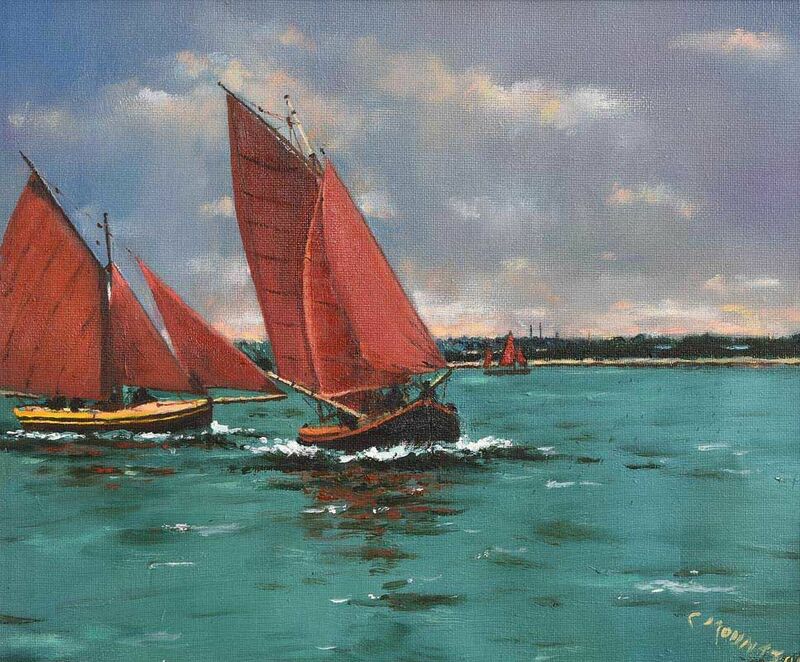 “Red Sails” oil on canvas (10″ x 12″), sold at Morgan O’Driscoll’s – 3/10/2016 for €220.00. Moynan was born in Dublin and studied at the Metropolitan School of Art. “Tug of War” oil on canvas. 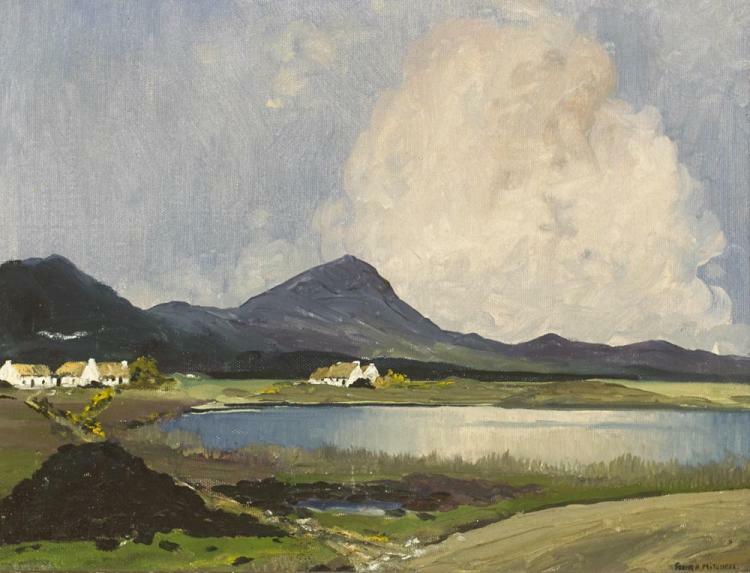 Sold at James Adams 31/5/2006 – €270,000. 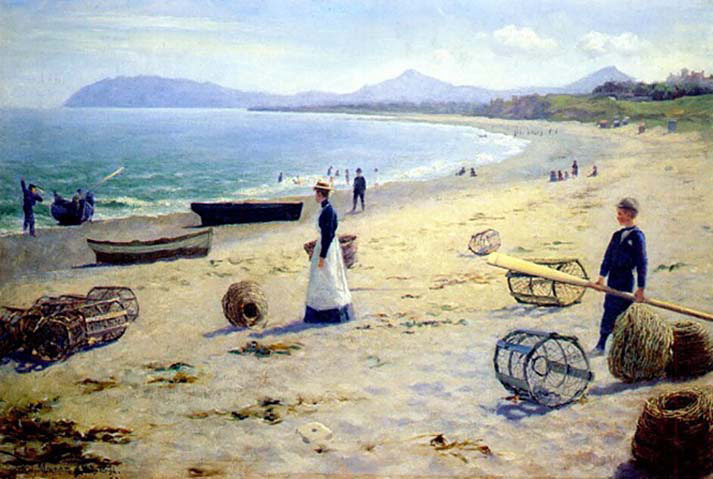 The superb “Killiney Sands” (1894) which is part of the AIB Bank Art Collection. 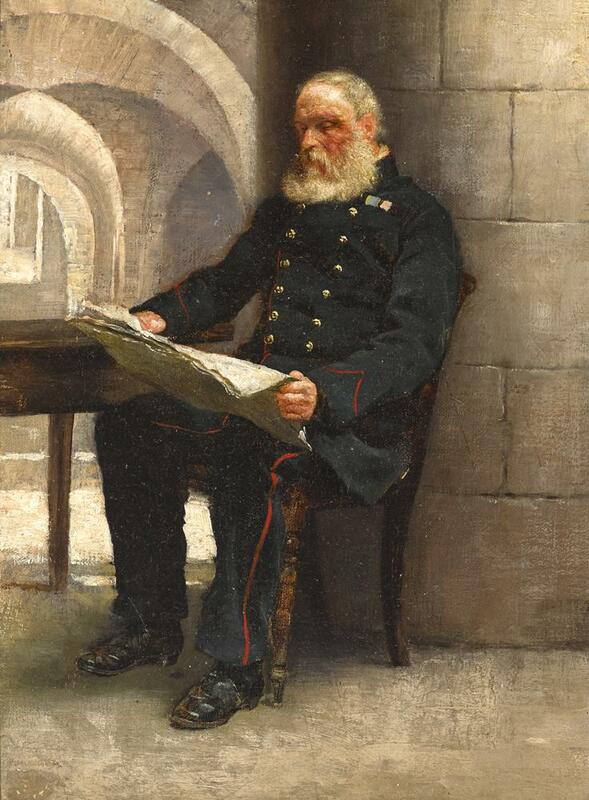 Portrait of an army pensioner at the Royal Hospital, Kilmainham, oil on board (14″ x 10″), sold at Whyte’s – 27/11/2017 for €2,600. 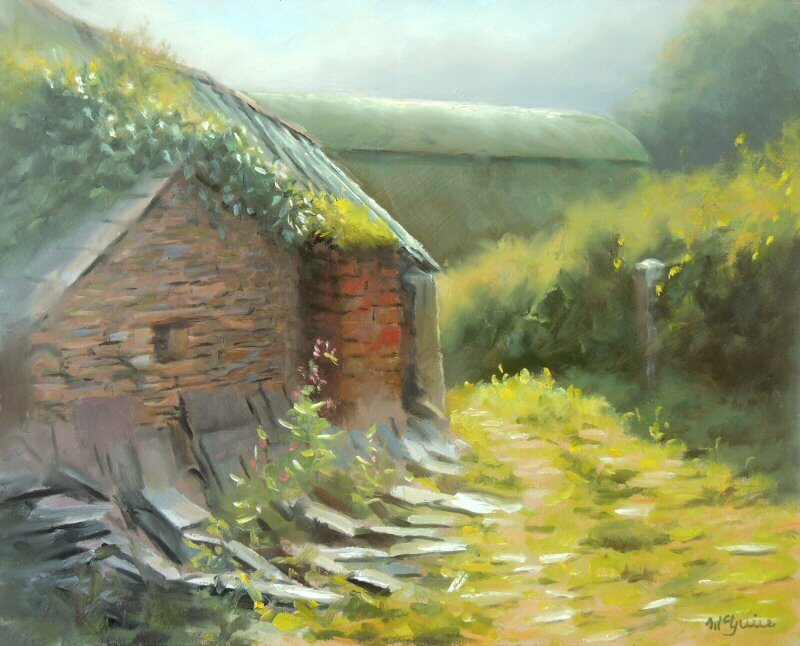 “Farm Buildings” oil on canvas (12″ x 28″), unsold at Ross’s – 13/9/2017. Grandson of Markey Robinson and nephew of artist Annie Robinson. 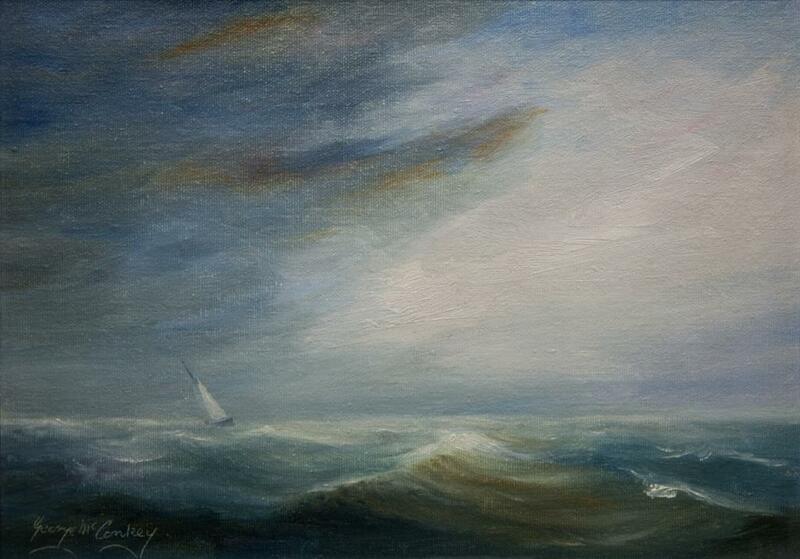 “Sailing Off the West Coast” oil on board (11″ x 15″), sold at Morgan O’Driscoll’s – 14/8/2017 for €100.00. 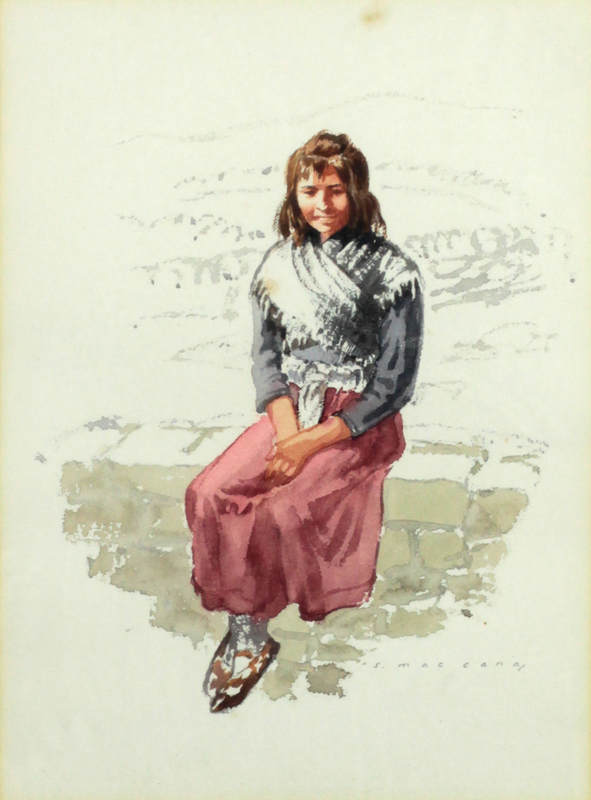 Portrait artist from Ardglass, County Down. Noted for his paintings of music legends such as Bob Dylan, Van Morrison and David Bowie. 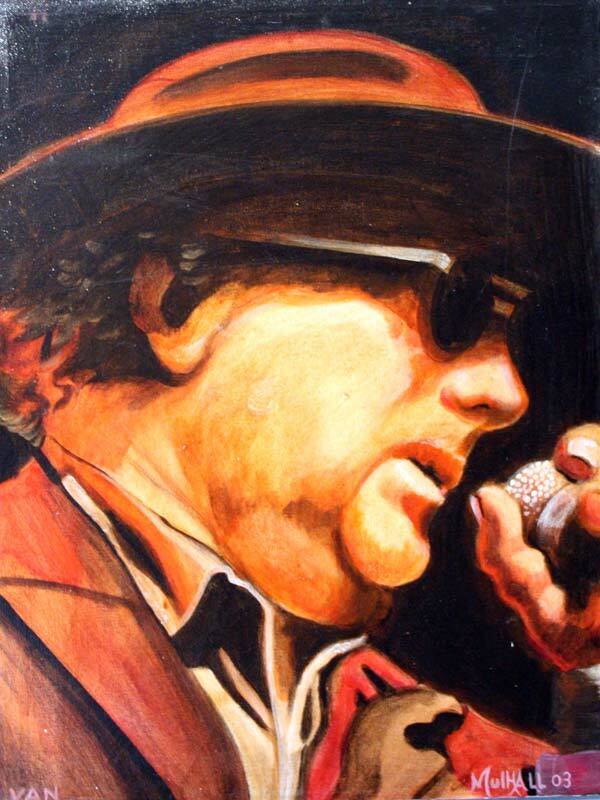 “Van Morrison” oil on canvas (24″ x 18″). “Dublin Mountains, 2015” oil on canvas (10″ x 14″), sold at Morgan O’Driscoll’s – 25/9/2017 for €60.00. 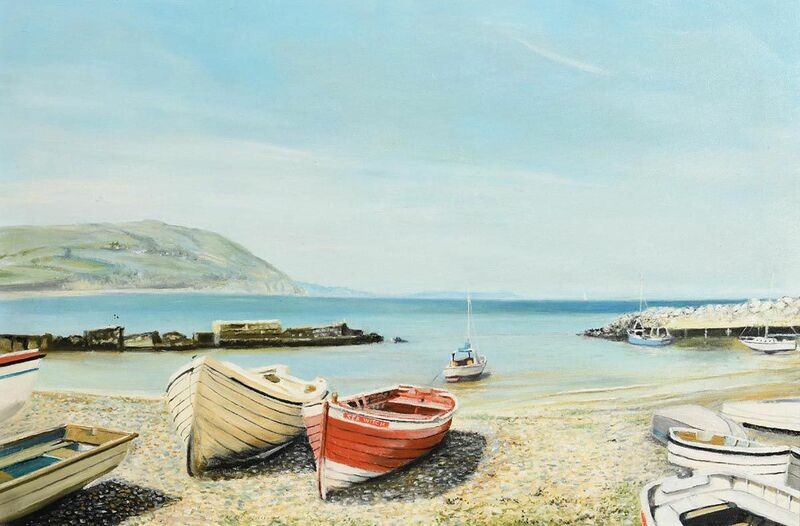 “Boats, Greystones” oil on canvas (20″ x 30″), sold at Morgan O’Driscoll’s – 19/3/2019 for €300.00. 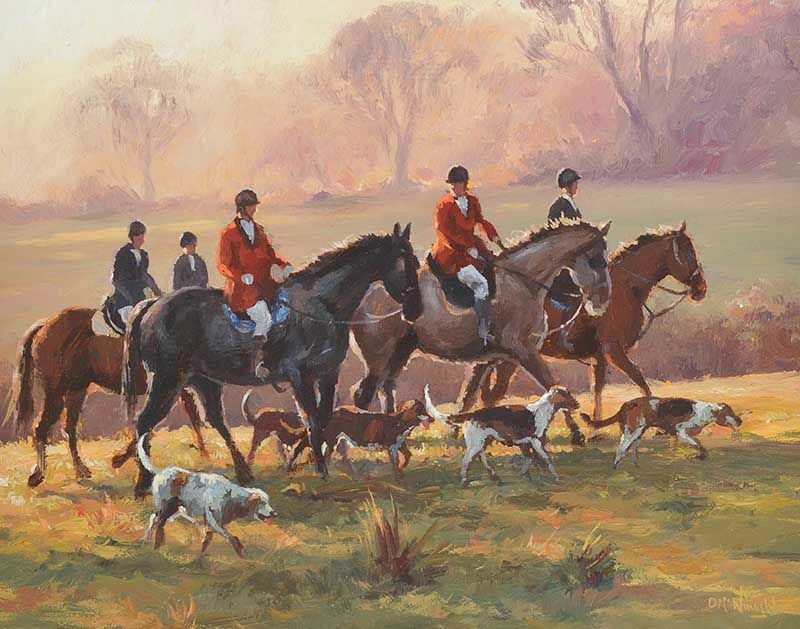 “The Rivals” oil on canvas (20″ x 23.5″), unsold at Hansons, Derbyshire – 1/7/2017. 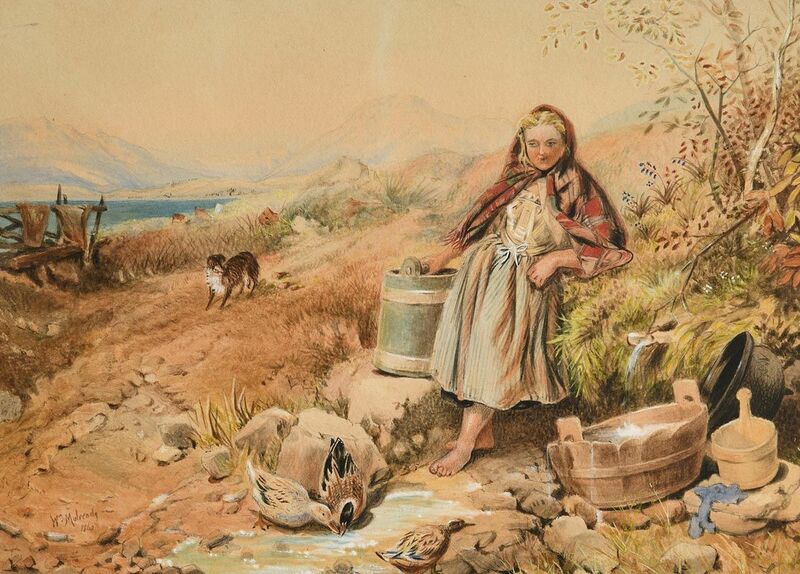 “Doing the Chores” 1860, watercolour (10.5″ x 14.5″), sold at Morgan O’Driscoll’s – 7/8/2018 for €700.00. 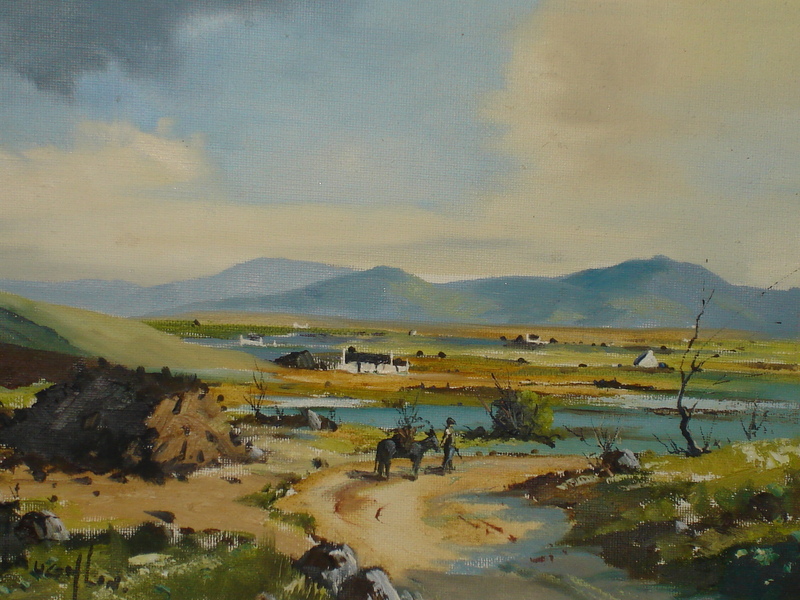 Landscape, oil on canvas (9″ x 13.5″), sold at Whyte’s – 10/10/2000 for €1,905. 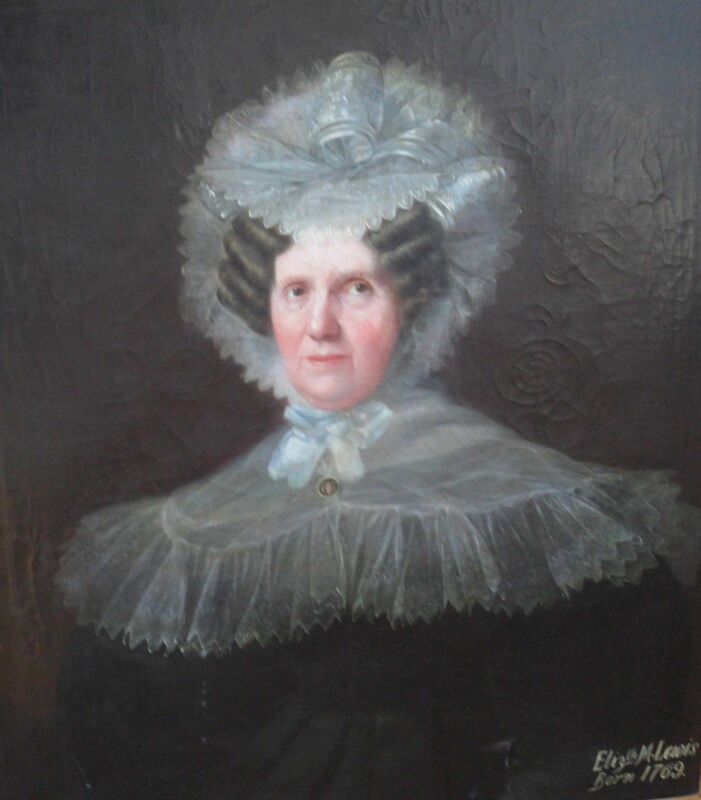 Portrait of Elizabeth M. Lewis (b.1769) oil on canvas, unsigned – offered on eBay 7/2016 for $1,545. A river landscape with thatched cottage, a family and livestock in the foreground – oil on canvas (25″ x 30″), unsold at Sheppard’s 27/4/2017. 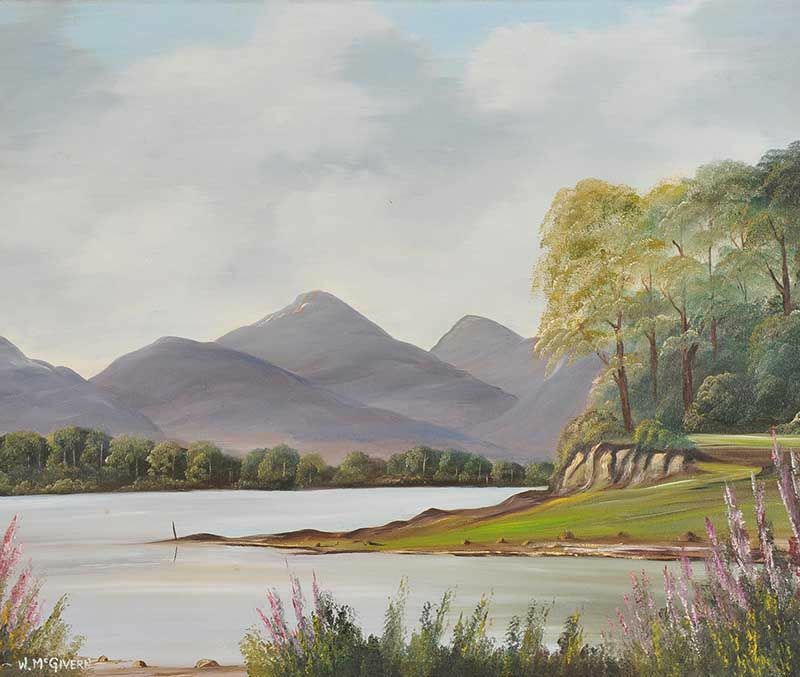 Virtually nothing is known about the artist except that she was an art teacher at Strathearn school in Belfast and was active c.1940/50. Can you help? “Making Friends” watercolour drawing (10″ x 14″) sold at Ross’s 10/11/2016 for £30.00. Lilian Murdoch was born in Islandmagee, County Antrim but spent most of her life in Portstewart, County Londonderry. 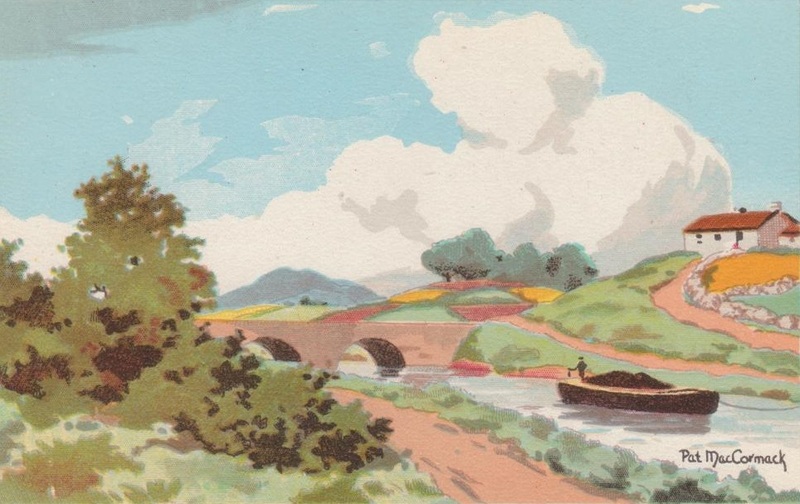 She was a talented watercolourist and supplied Scholastic Productions Ltd., Belfast, with art for their postcards in the 1950s. More to follow……. 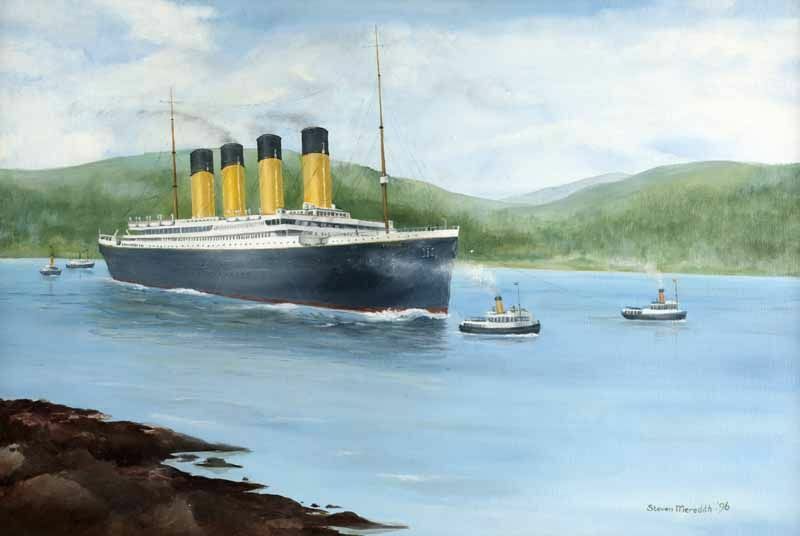 “Bringing Home the Turf” – Scholastic postcard. 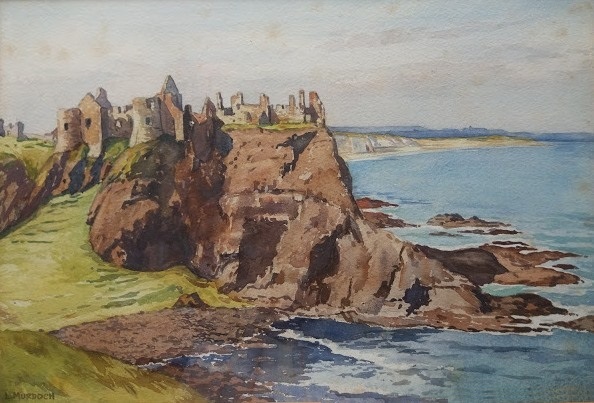 “Dunluce Castle, Co.Antrim” watercolour (9.5″ x 14″) sold at Matthews ‘Monaghan Sale’ – 10/6/2018 for €51 with two others. 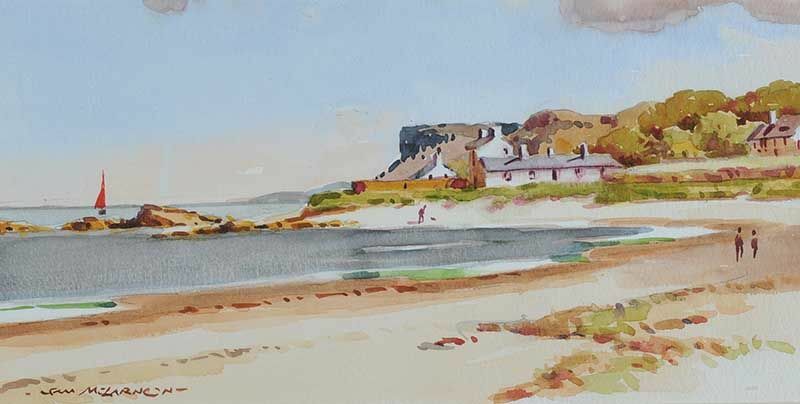 “Giant’s Head, Portrush, Co.Antrim” watercolour, sold at Ewbanks (Surrey) – 21/3/2019 with two others for £65.00. 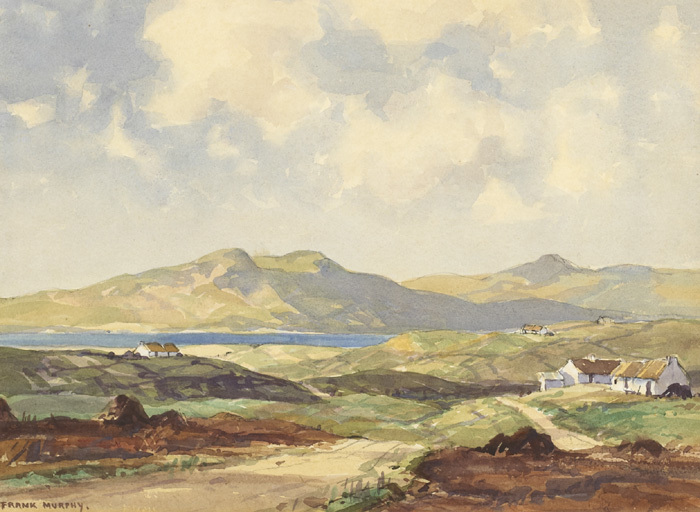 “Near Gortahork, County Donegal” (10″ x 14″) watercolour, sold at Whyte’s – 11/3/2015 for €160.00. 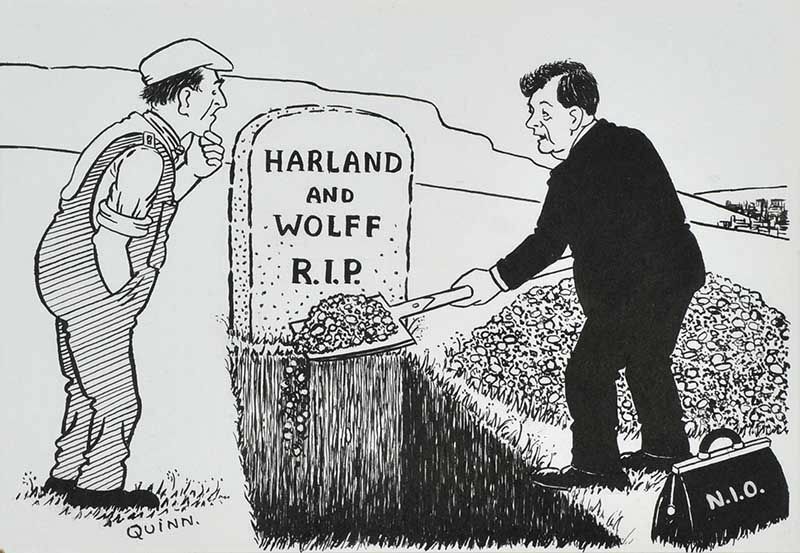 Frank Murphy was the pseudonym of Frank McKelvey Junior, son of the famous Ulster artist. 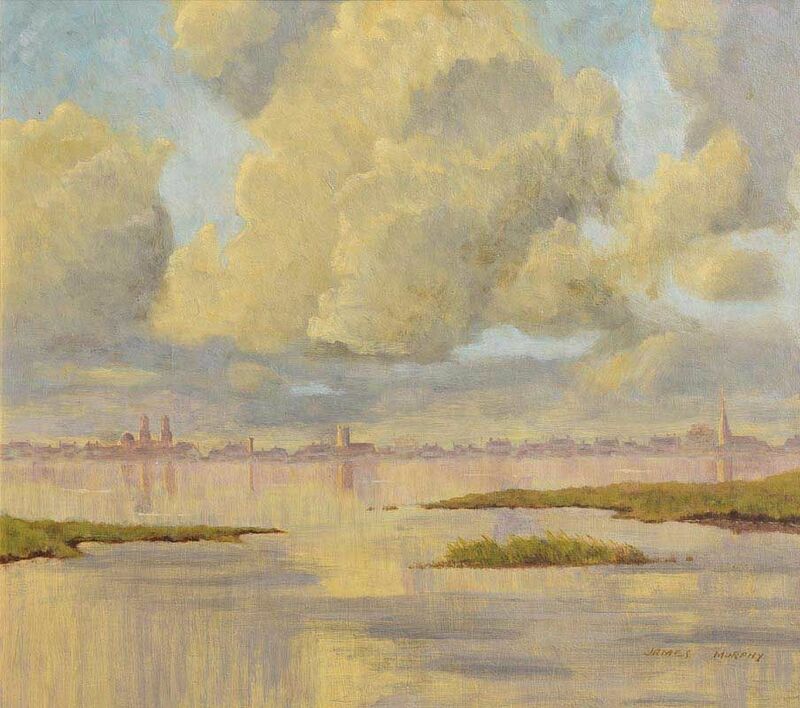 “Shannon Floods, Athlone” oil on board (20″ x 22″), sold at Morgan O’Driscoll’s – 3/10/2016 for €100.00. Born in Dublin. Studied fine art at Dun Laoghaire School of Art and Central School, London. 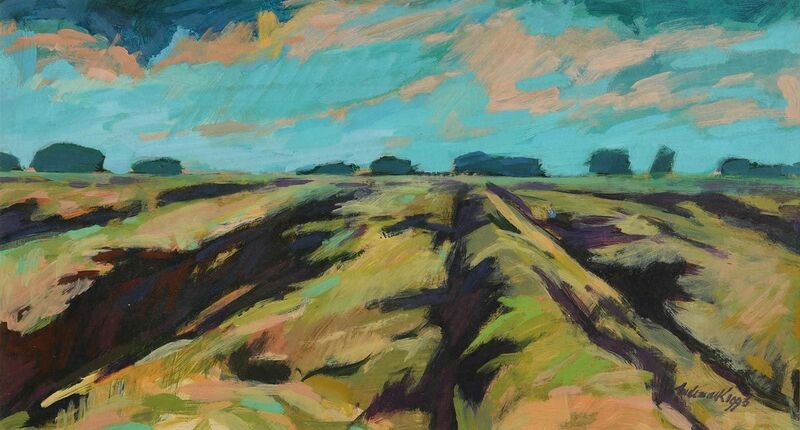 “The Ploughed Field” oil on canvas (40″ x 34″). 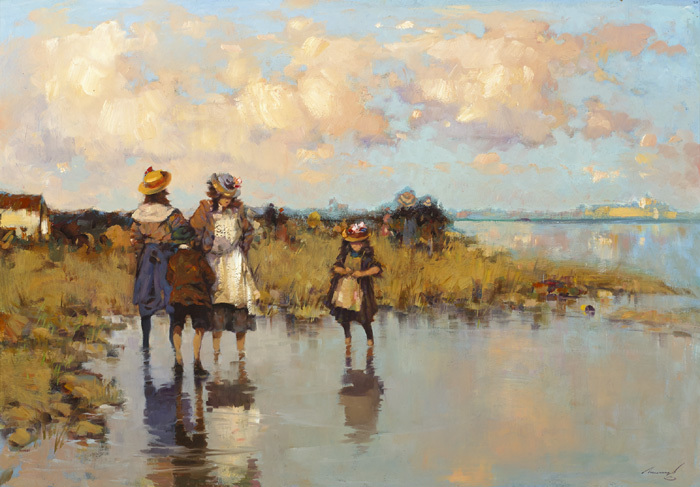 John Murphy is a Limerick born artist, whose artistic training also included studies in classical animation. 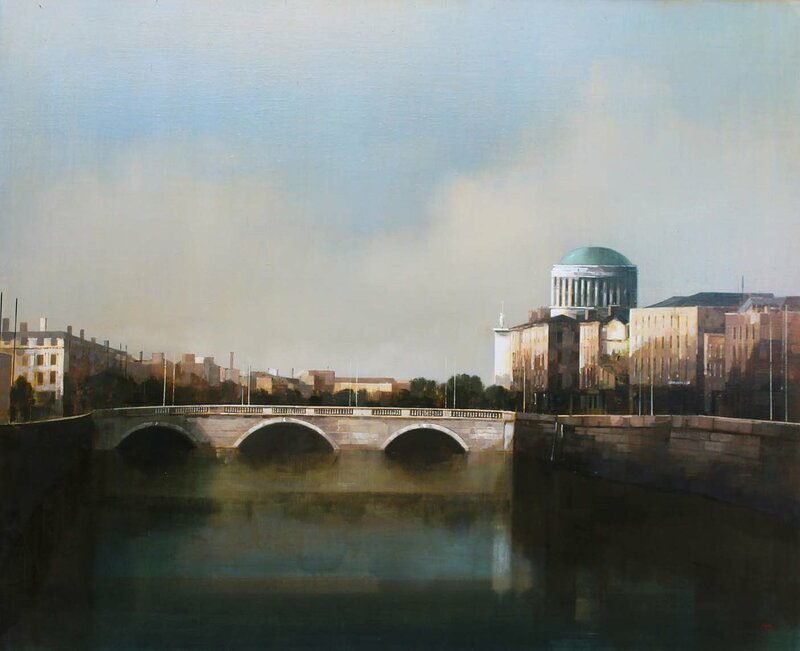 He has had sell out solo exhibitions at James Adam’s in Dublin and he has exhibited in many leading contemporary venues including Limerick City Gallery and the Fredrick Gallery. 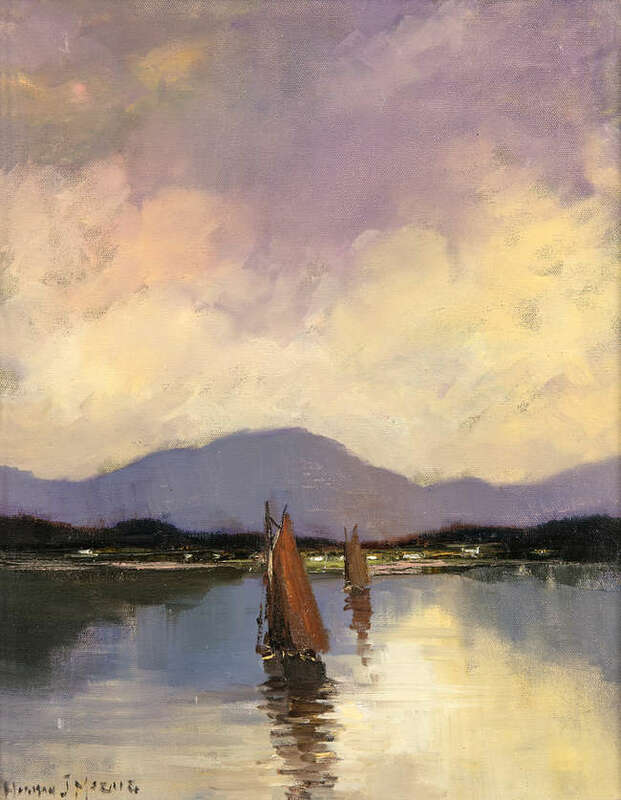 “Fishing Boats at Sunrise” dated 2005, oil on canvas (23″ x 35″), sold at Morgan O’Driscoll’s – 23/10/2017 for €1,000. 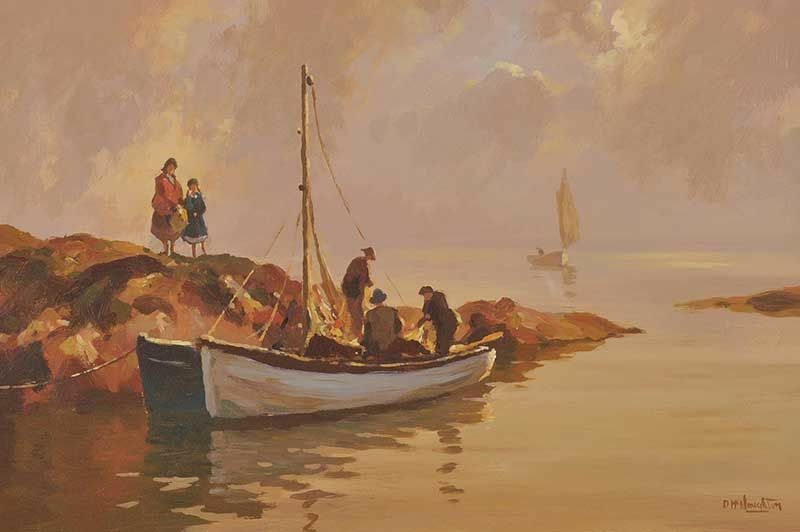 “Fishing Boats off Hook Head, Wexford” oil on canvas (27″ x 44″), sold at Mullen’s, Laurel Park – 25/6/2018 for €2,800. “Off the Irish Coast” oil on canvas (18″ x 32″), sold at Hegarty’s (Bandon) – 9/12/2018 for €1,150. Hon.President and Founder of the Rostrevor Art Group. 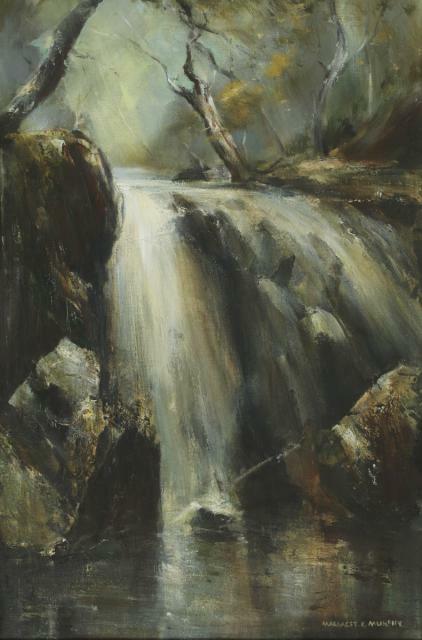 “Waterfall” oil on canvas (29.5″ x 19.5″), sold at Dolan’s (Connemara Auction – Aug.2016) for €200.00. “Cushendall Farm” watercolour drawing (10″ x 14″), unsold at Ross’s – 28/6/2017. “Snow at Midnight” watercolour drawing (6″ x 8″), sold at Ross’s – 9/8/2017 for £40.00. “The Tadpole Catcher” oil on canvas board (9″ x 13″), unsold at Adam’s – 28/9/2016. 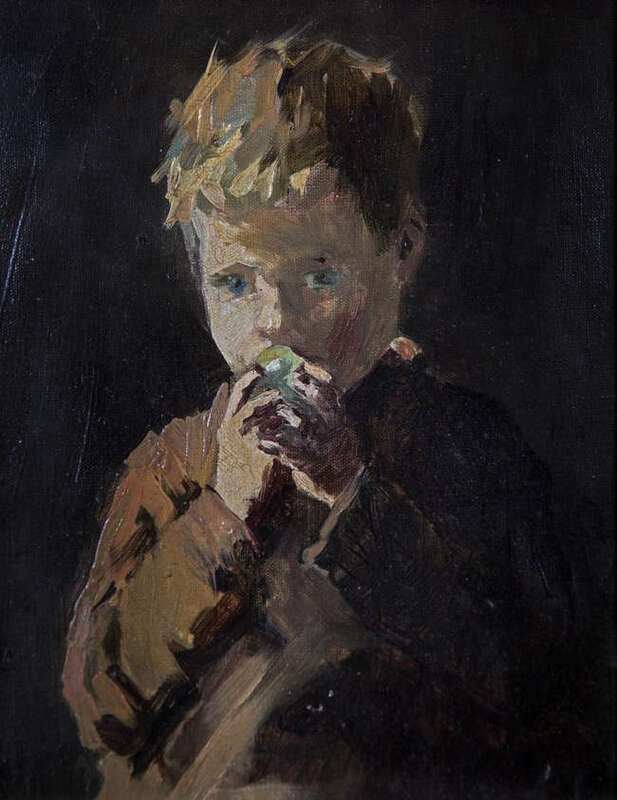 “Eating an Apple” oil on canvas (9″ x 6¾”), sold at Adam’s – 28/9/2016 for €4,000. 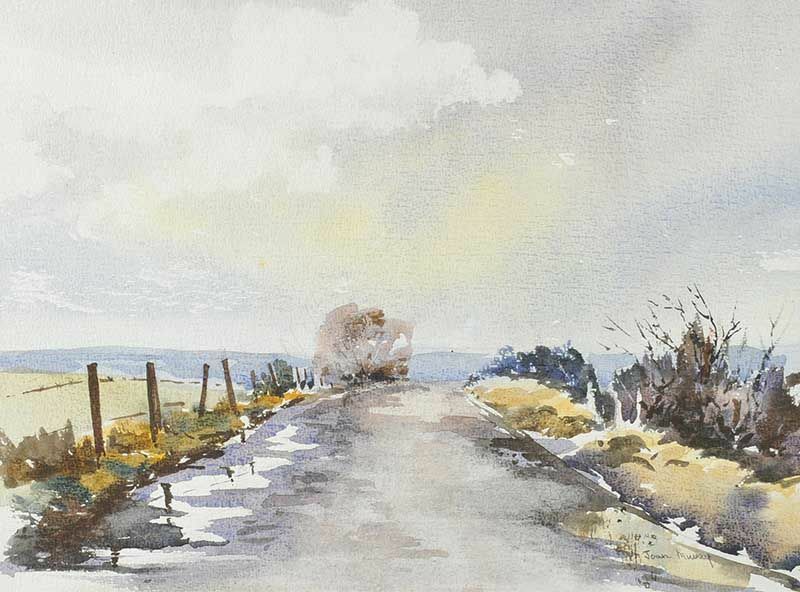 “Country Road” watercolour drawing – Ross’s sale June 2016. 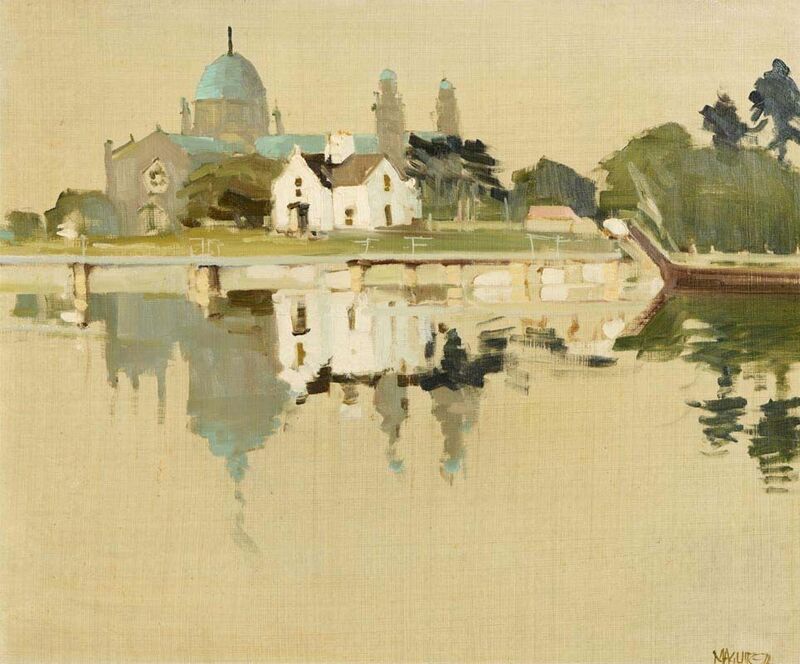 Dublin born artist who attended Clongowes Wood College and the National College of Art and Design. 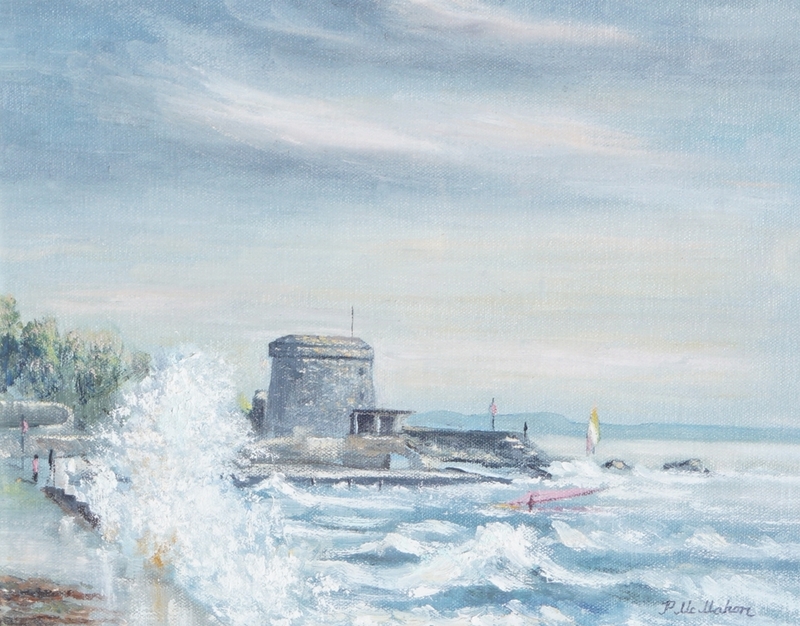 “A blustery day on the South Bull Wall, Dublin” oil on board (13″ x 30″) sold at Adam’s – 26/3/2013 for €1,300. 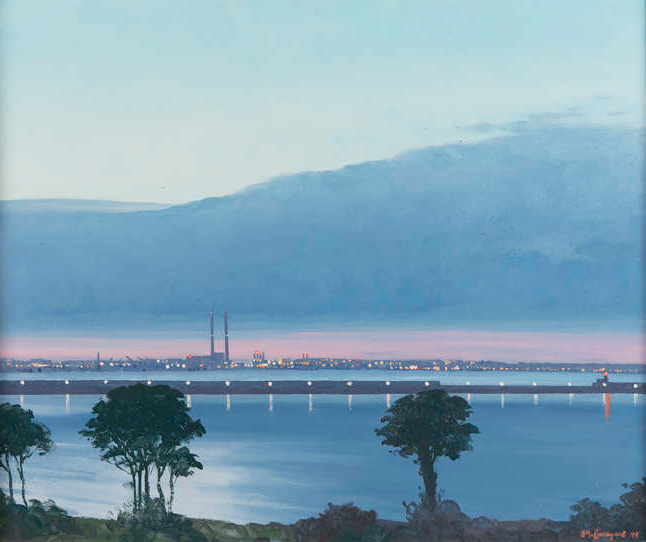 “Dublin Bay from the Wicklow Mountains” oil on board (24″ x 38.5″) sold at Whyte’s – 16/9/2003 for €1,400. 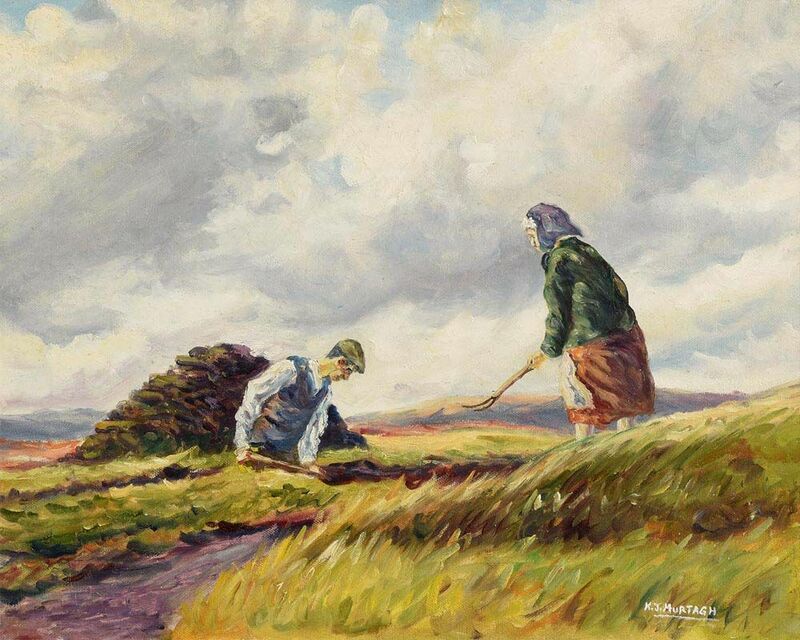 “Cutting the Turf” oil on canvas (16″ x 20″), sold at Morgan O’Driscoll’s – 13/3/2017 for €220.00.